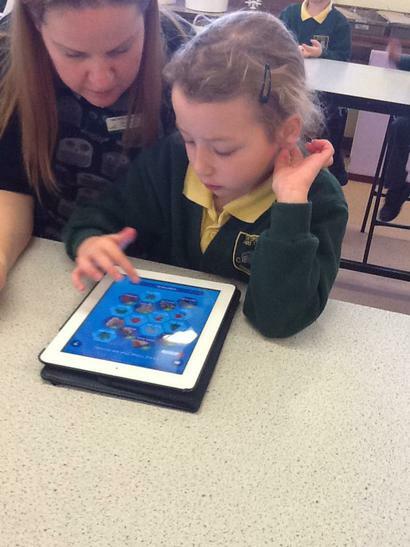 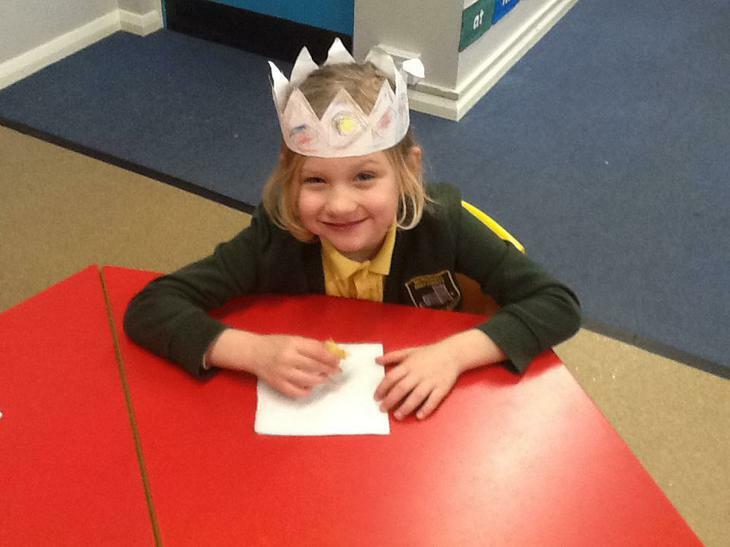 It's been a busy couple of weeks in school with lots of exciting things going on. 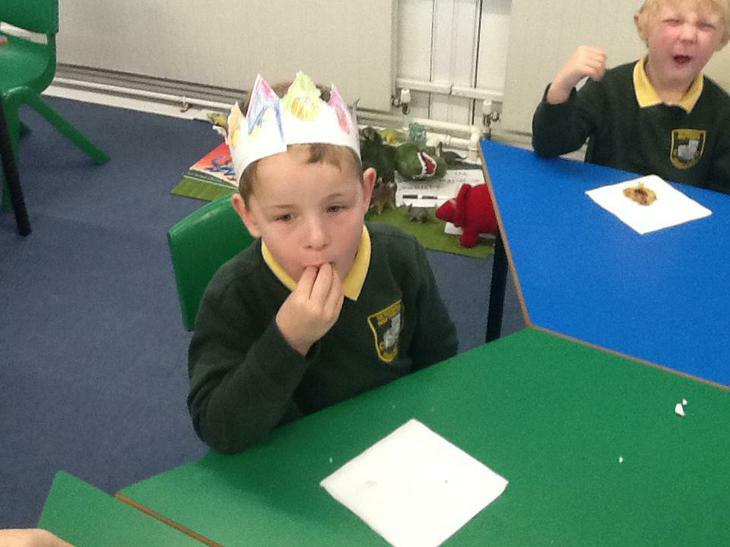 We have had two visits from Father Christmas and an amazing Christmas fair. 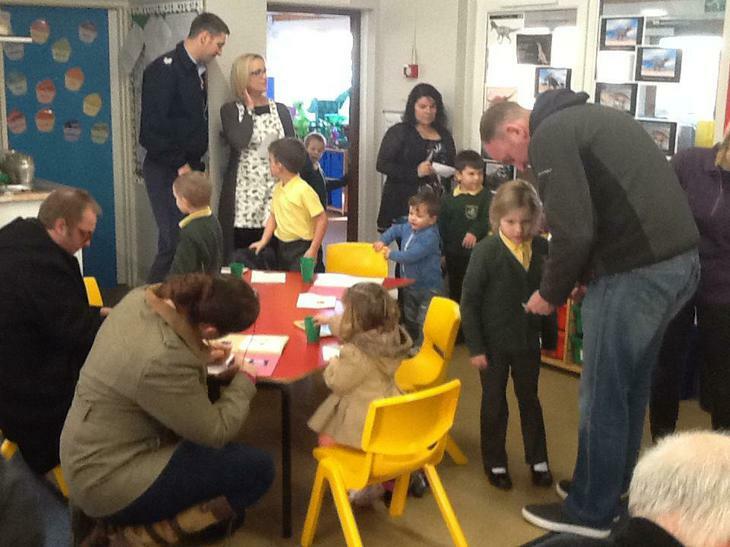 Thank you to everyone who worked so hard to make it happen. 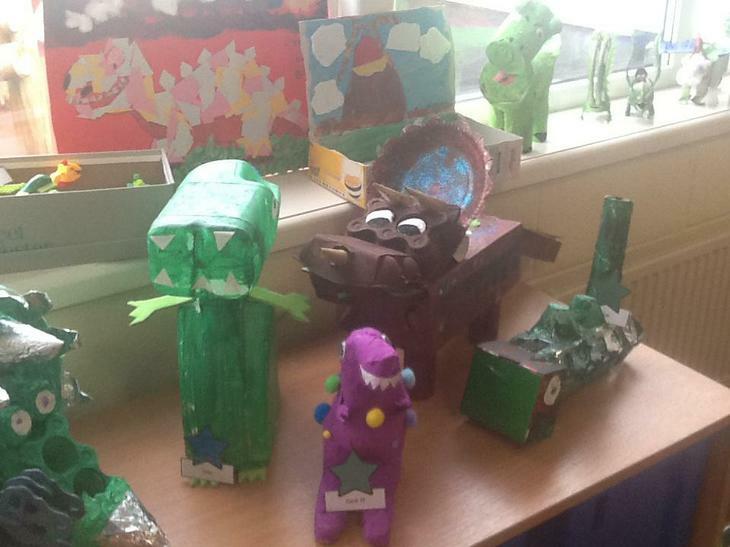 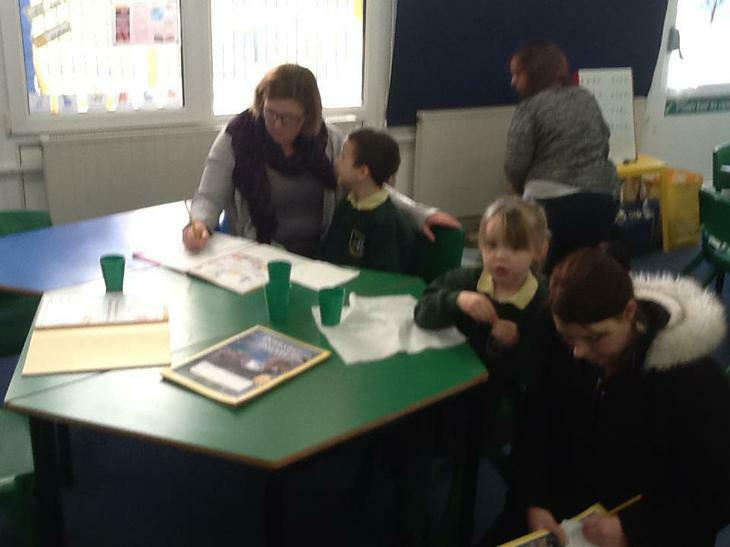 As a celebration of all our fantastic hard work this term we decided to hold a dinosaur party for our parents to come and see all of our great work. 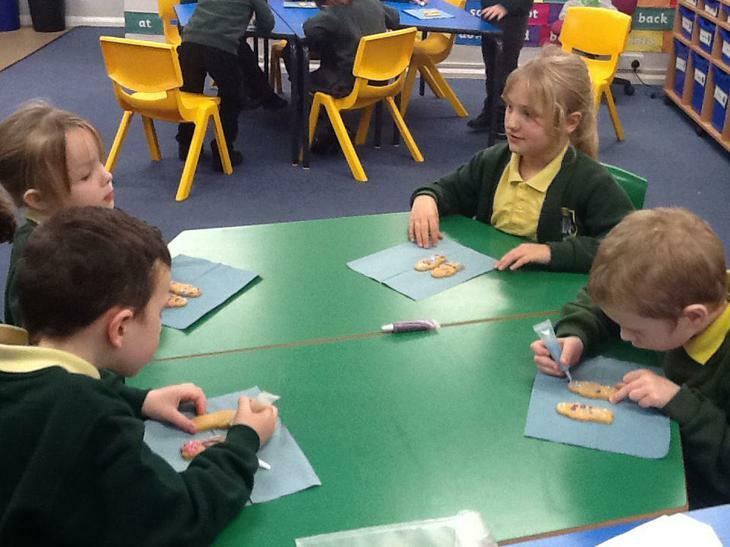 We decided we needed special explorer biscuits which we decorated for our parents to enjoy whilst they looked at our amazing work. 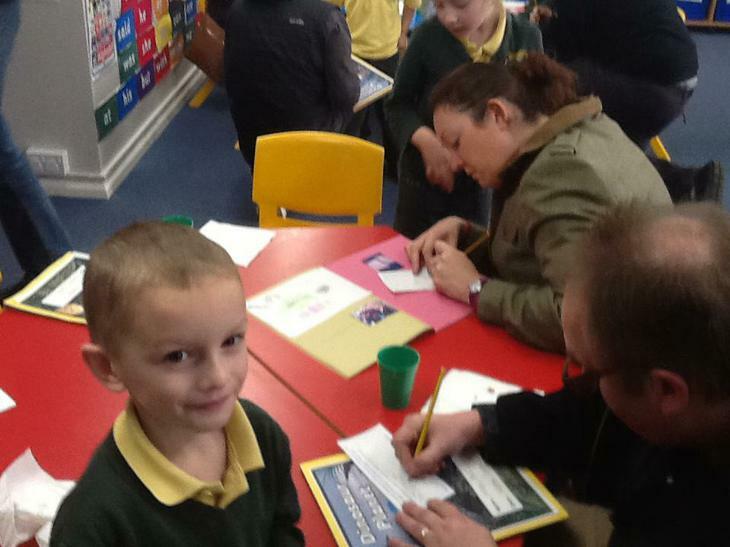 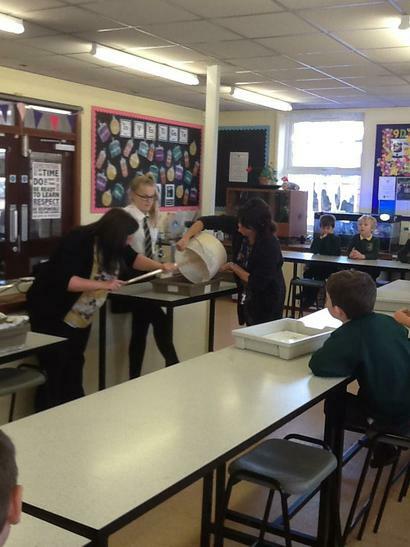 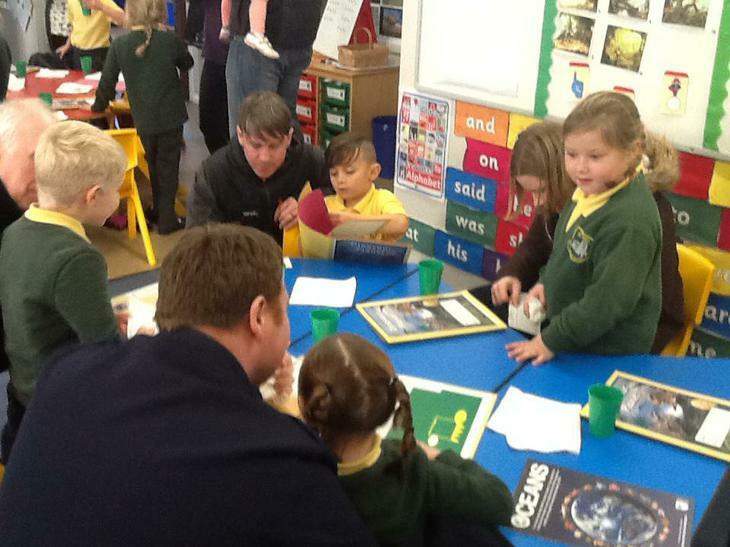 Thank you to everyone who attended it was brilliant to see you all and the children loved showing you their hard work! 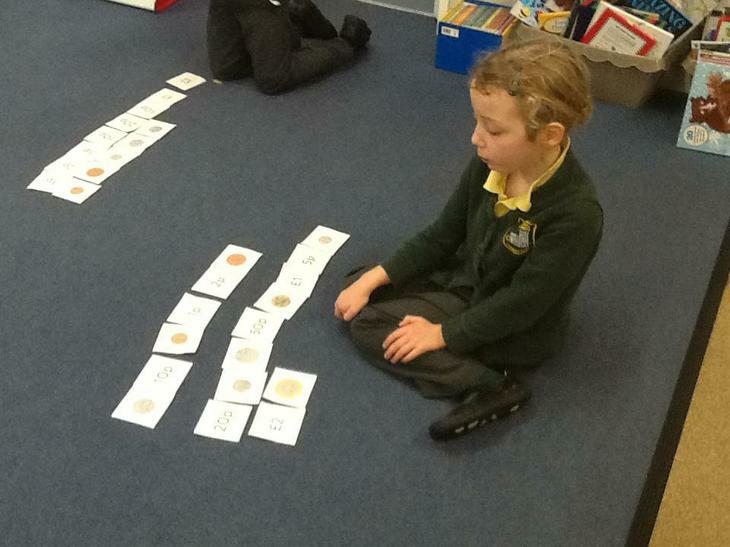 In Maths we have been solving problems using all four number operations. 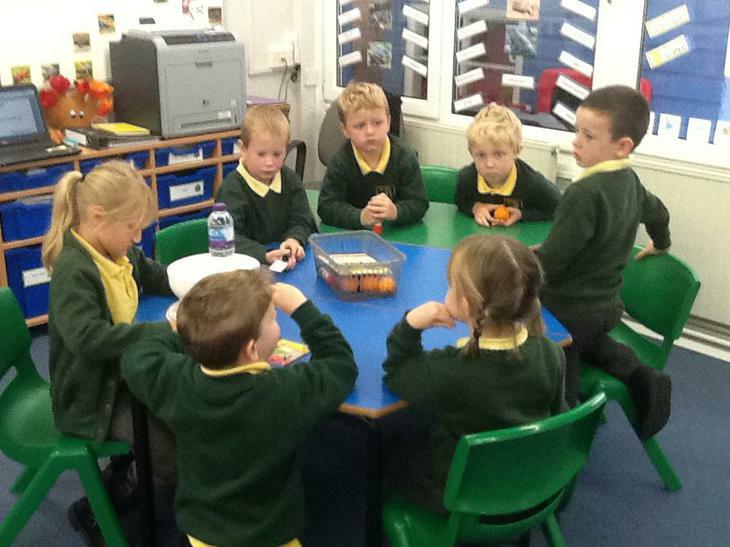 We had a recap on the four operations and strategies we could use to help us solve these problems. 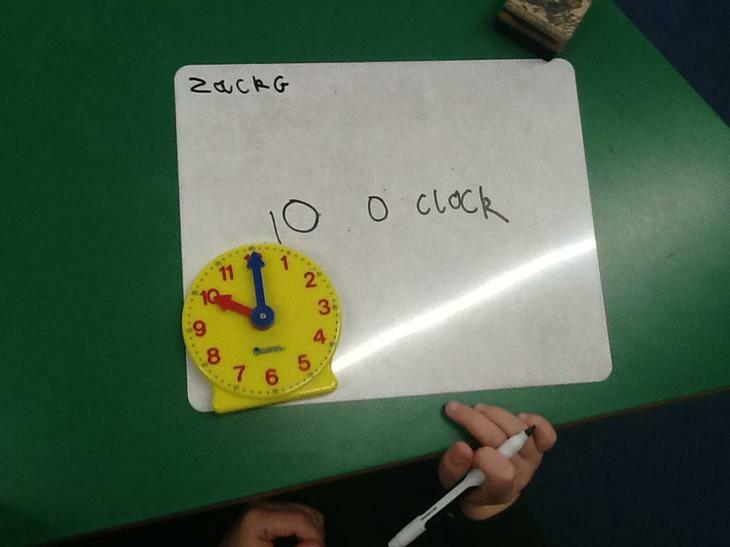 We then looked at word problems and thought what was the information we needed, what was the actual number sentence we were trying to solve and then had a go using equipment to solve them. 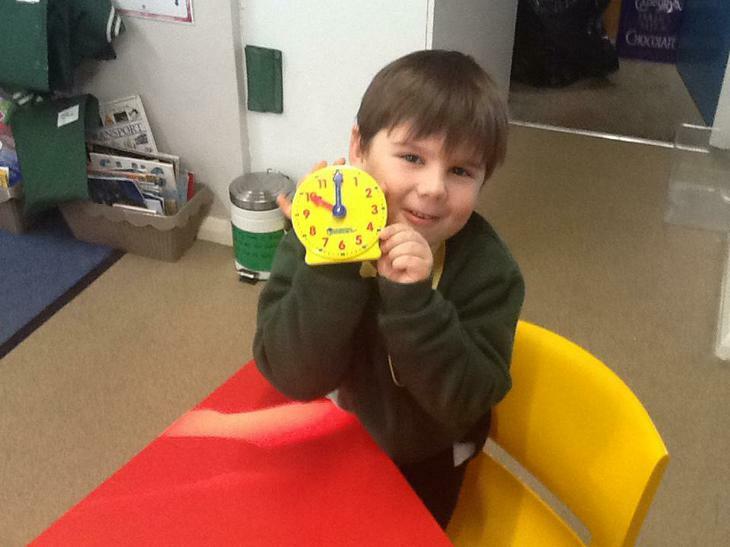 A huge thank you to everyone at Barnes Wallis who helped us have a fantastic time! 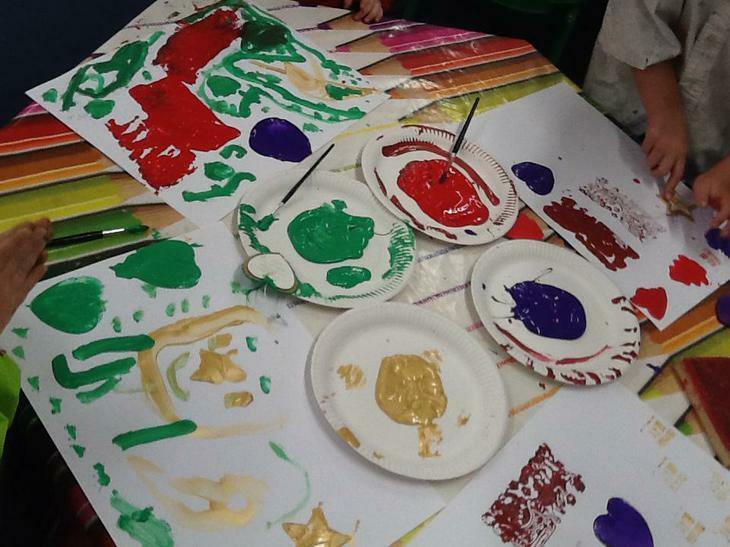 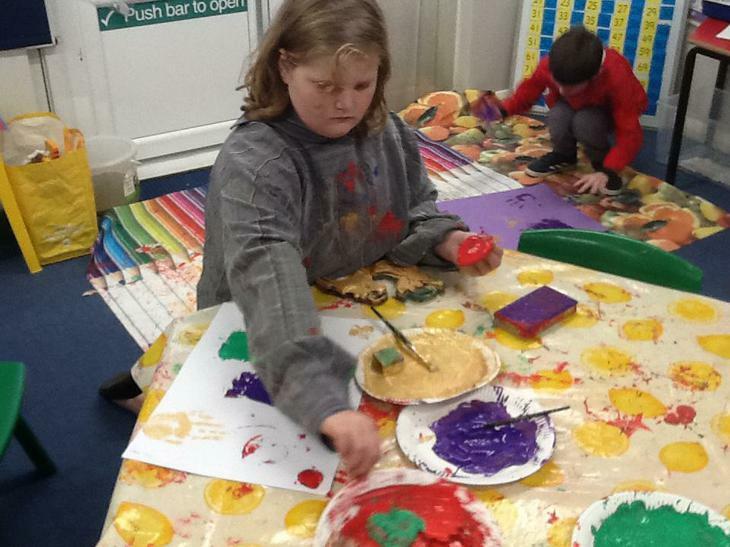 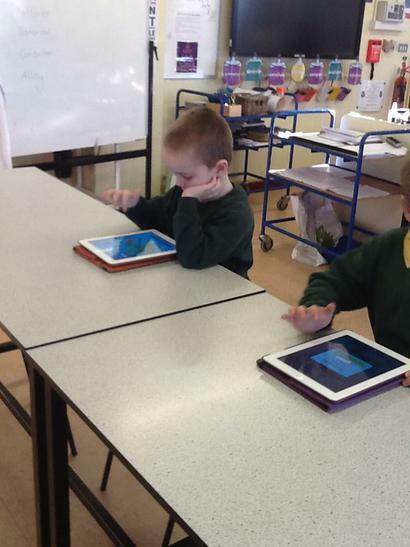 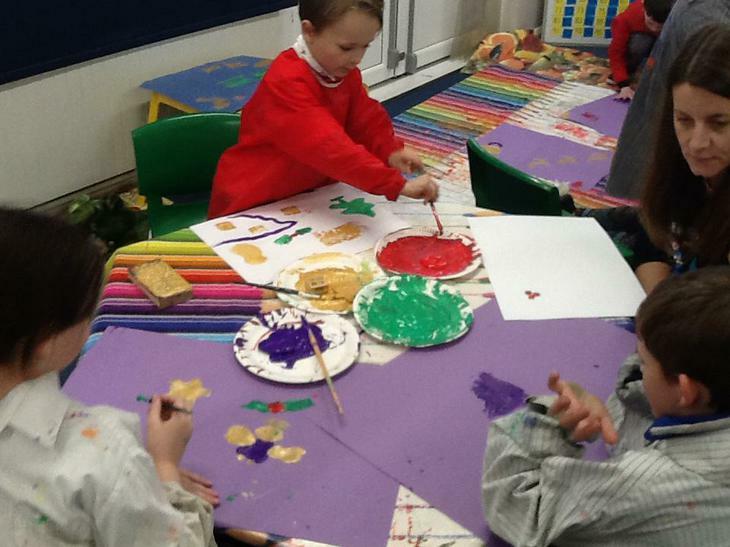 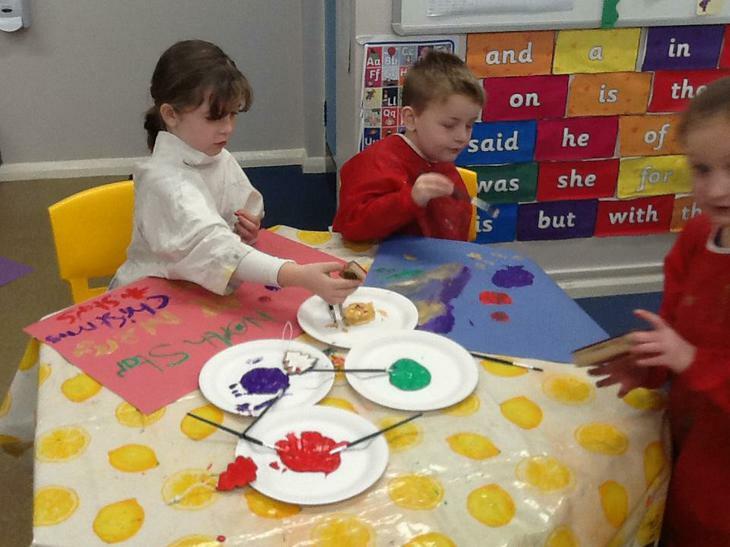 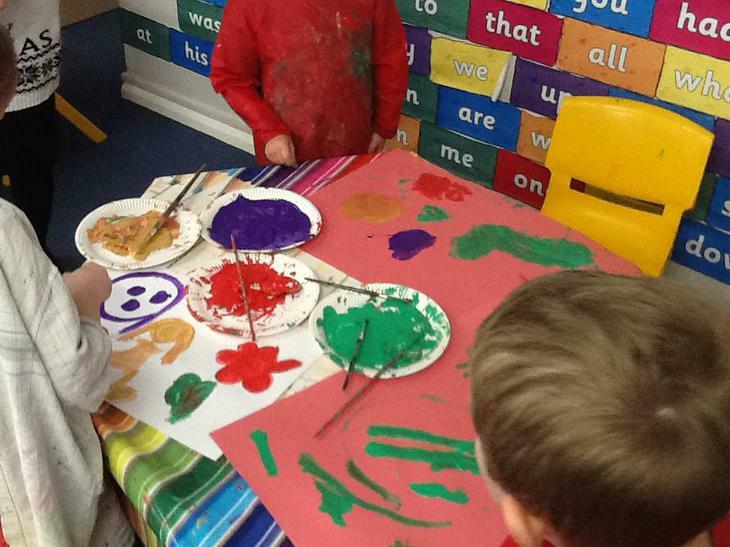 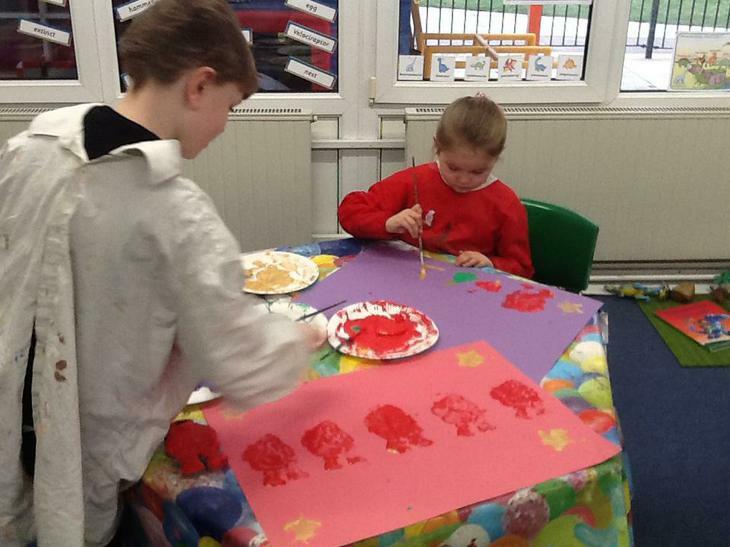 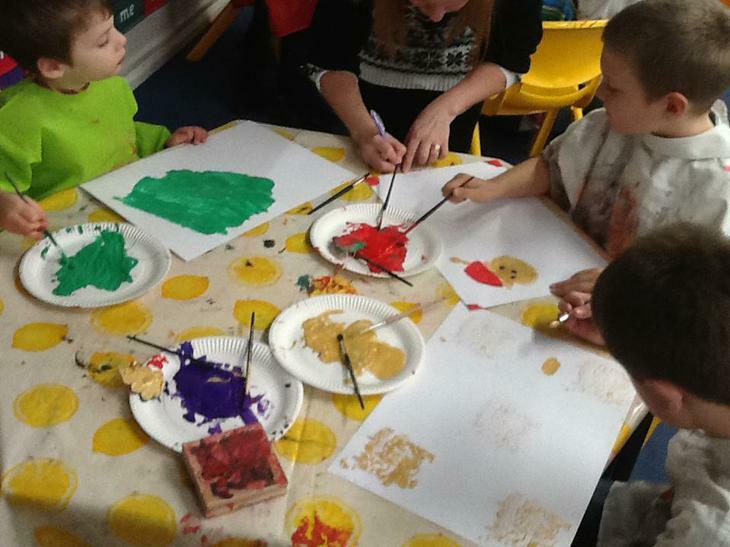 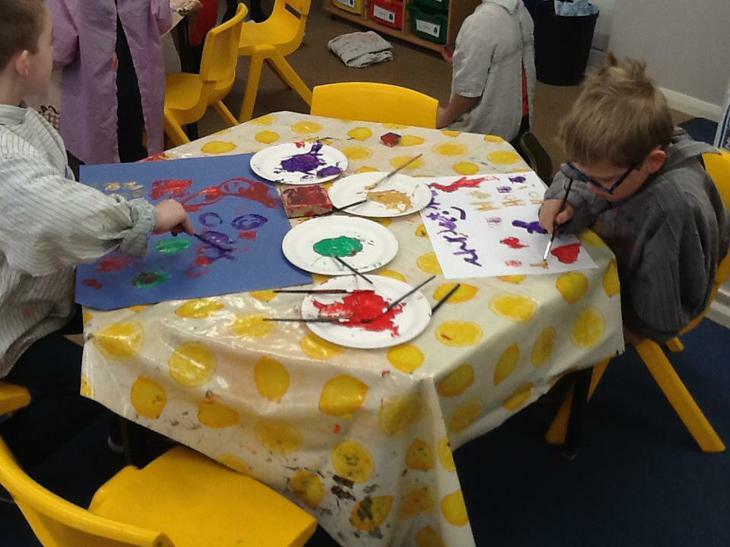 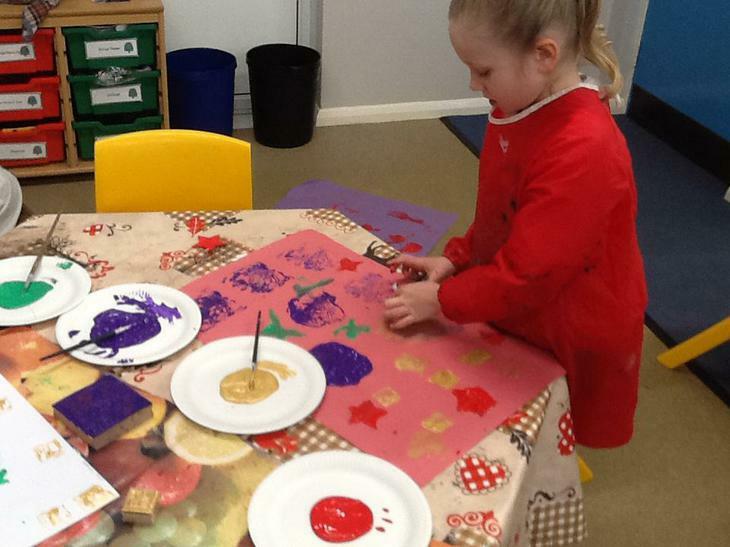 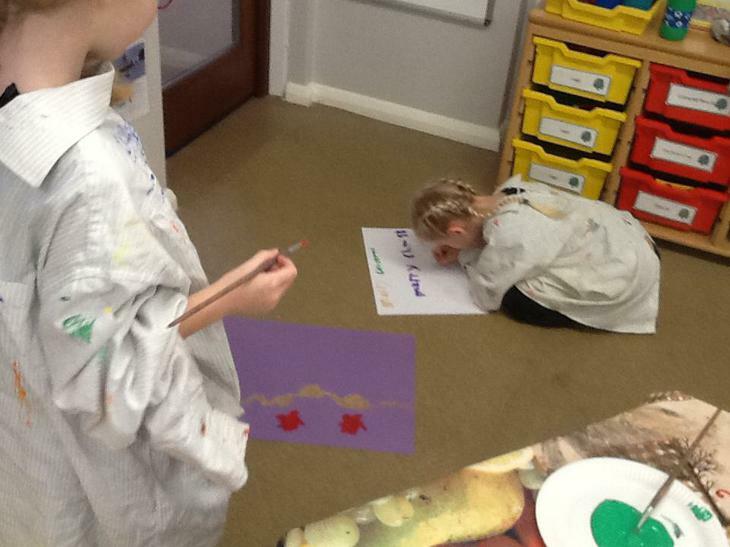 We have been using Paint to create our own dinosaur pictures. 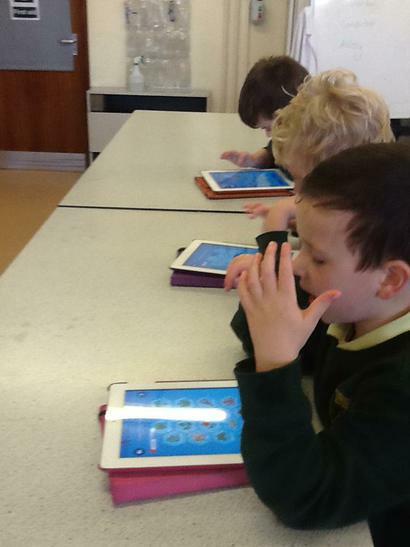 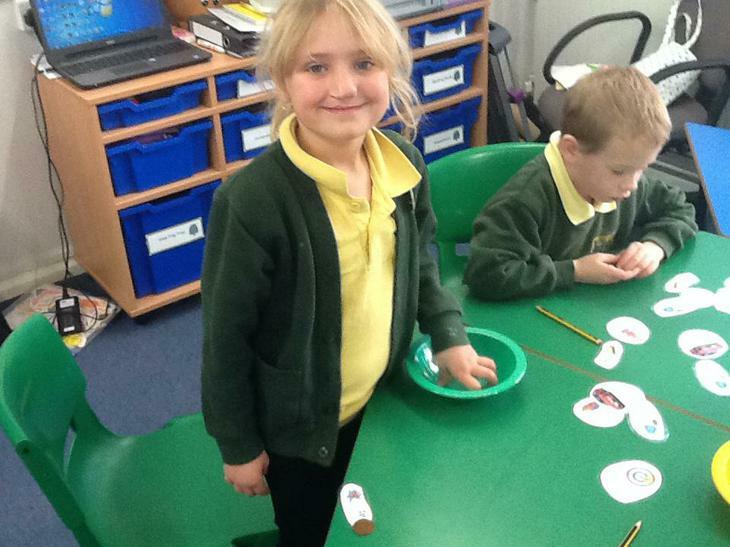 We had to use the mouse very carefully to select and drag shapes to create our dinosaurs. 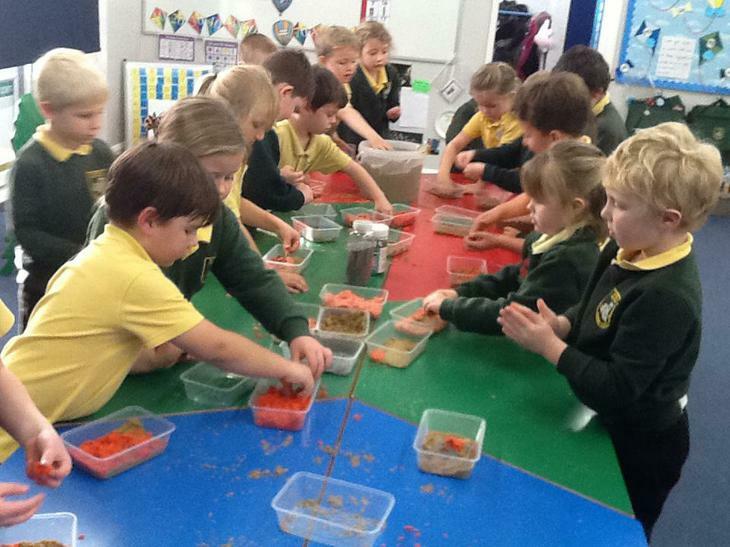 We then used fill to make them different colours. 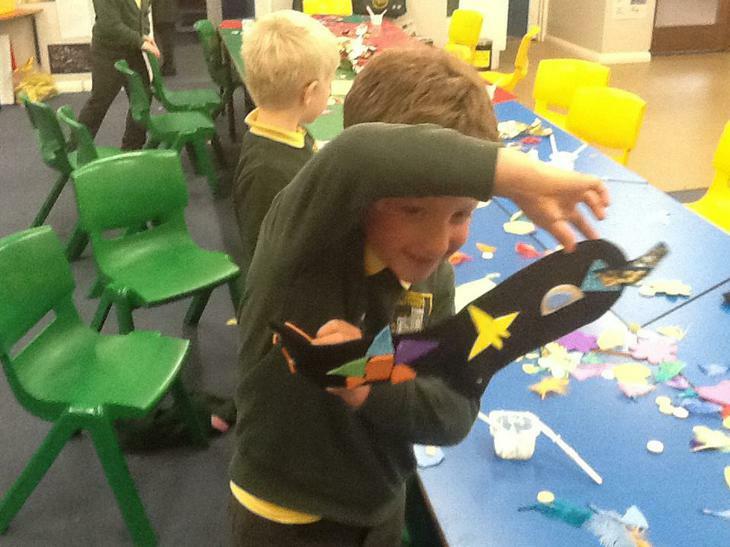 It was great fun designing our own dinosaur! 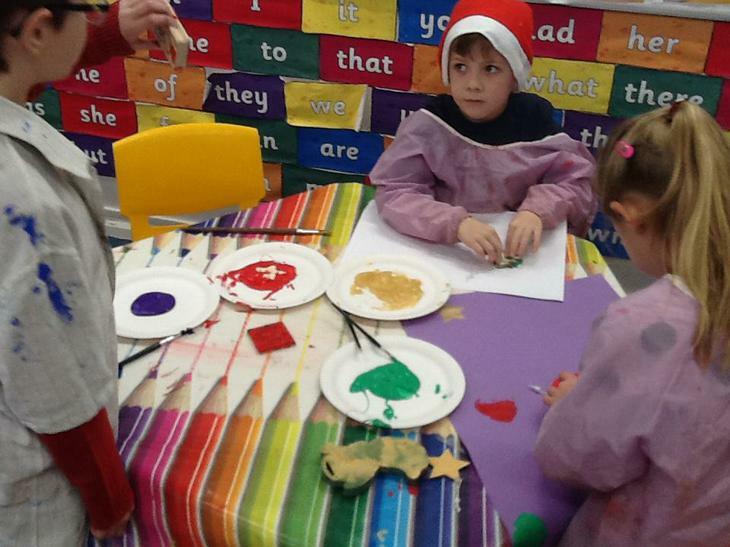 Our whole school Christmas around the World day was brilliant. 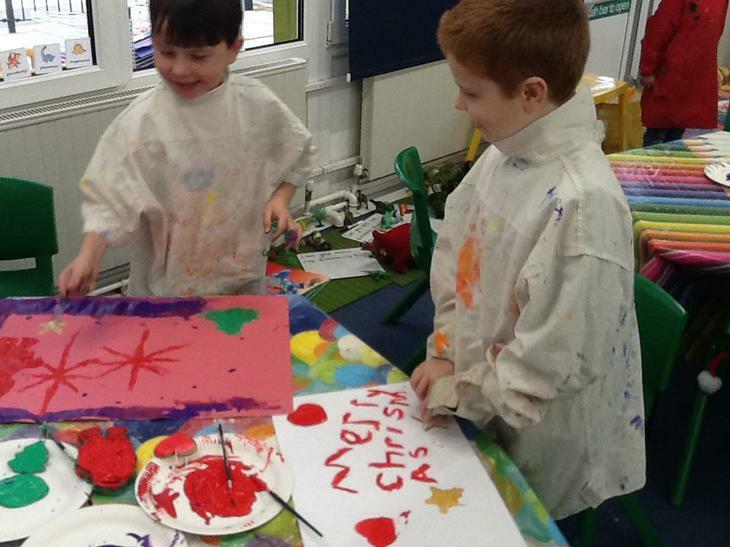 We learnt more about how different countries celebrated Christmas and did lots of fantastic activities to support these countries. 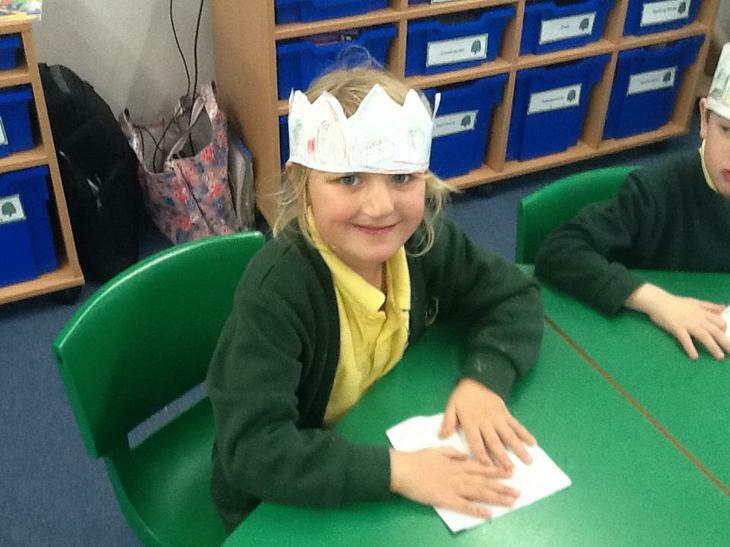 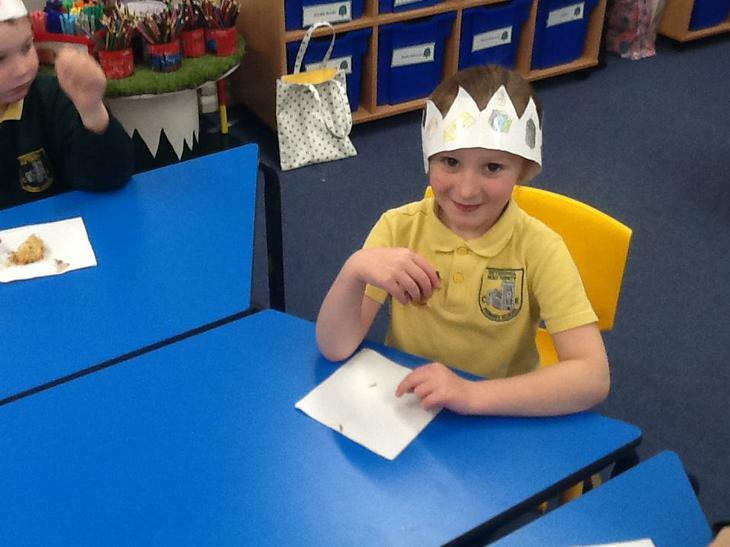 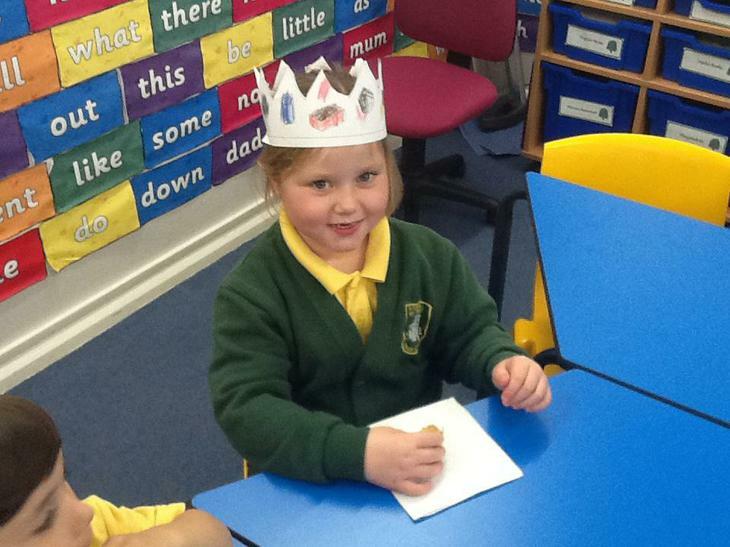 In Willow class we looked at Greenland and made some brilliant personalised wrapping paper for our presents. 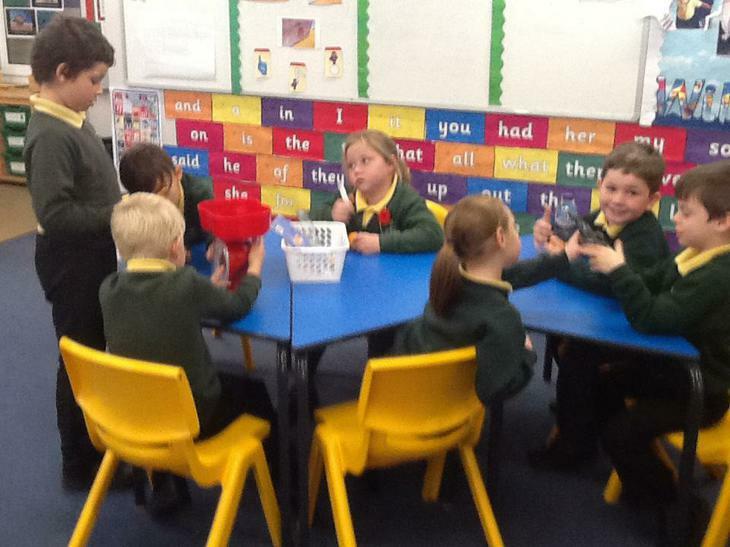 Willow class have had a brilliant week this week. 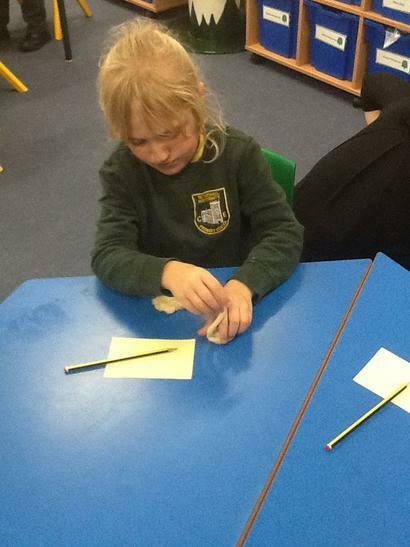 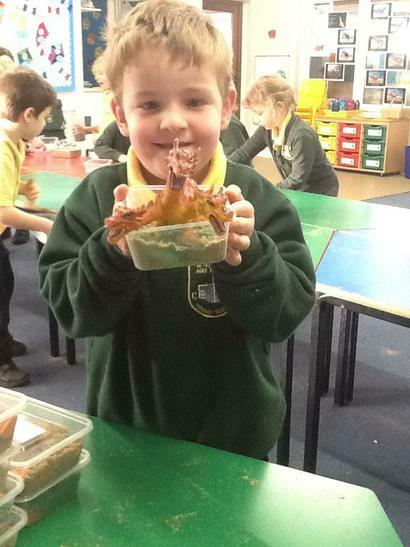 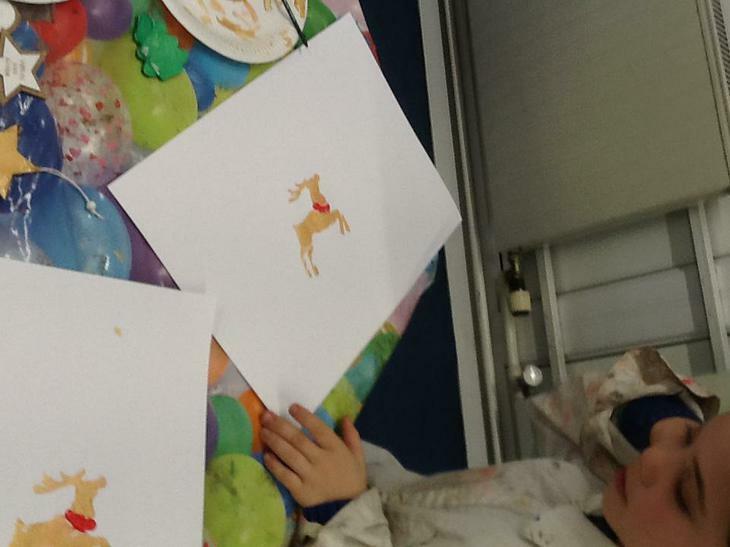 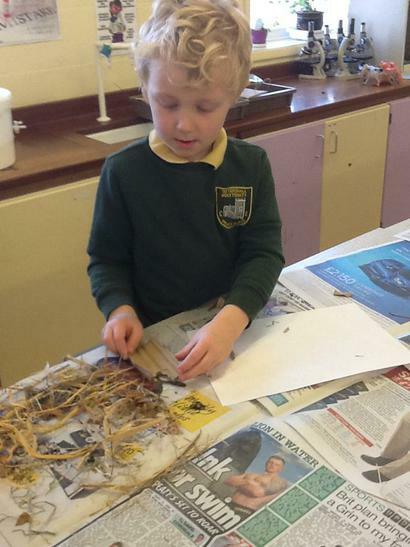 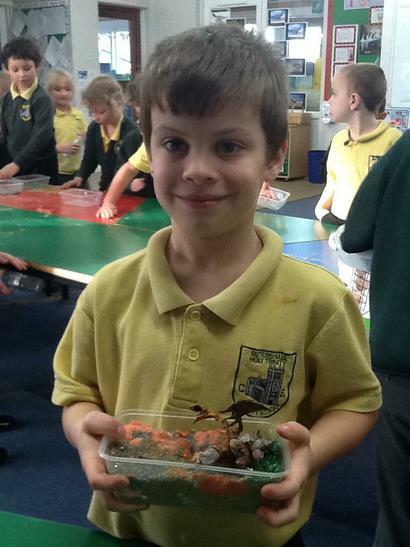 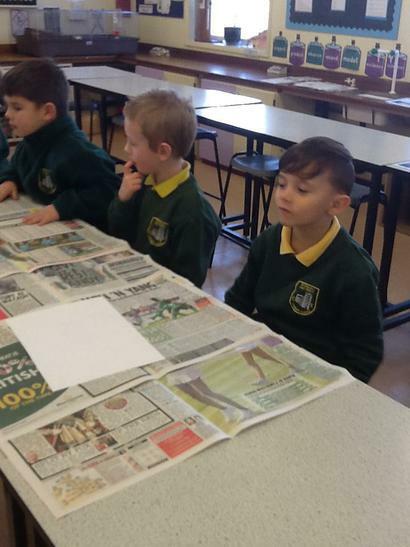 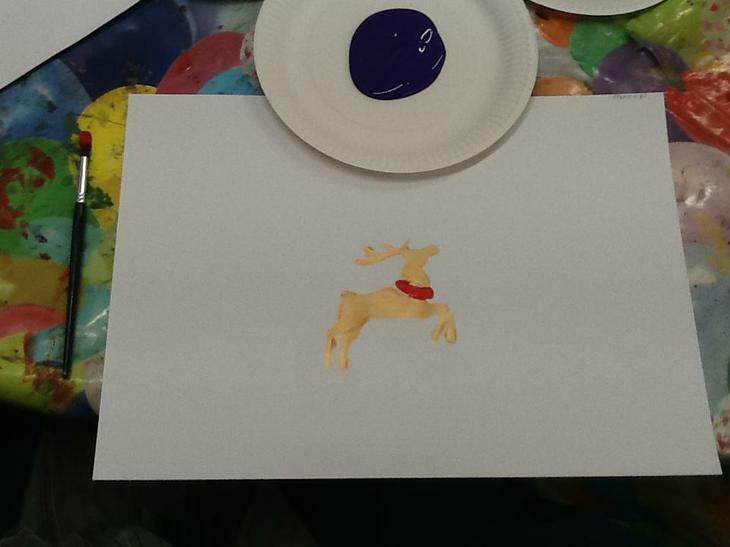 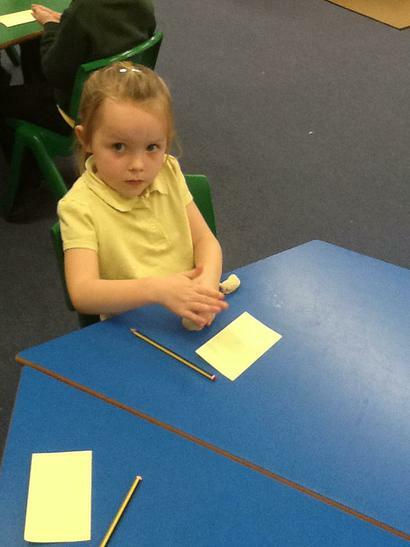 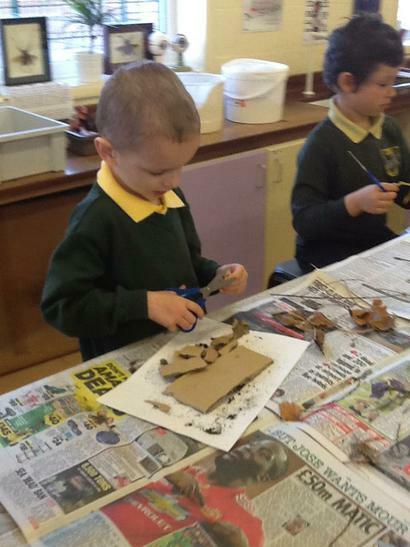 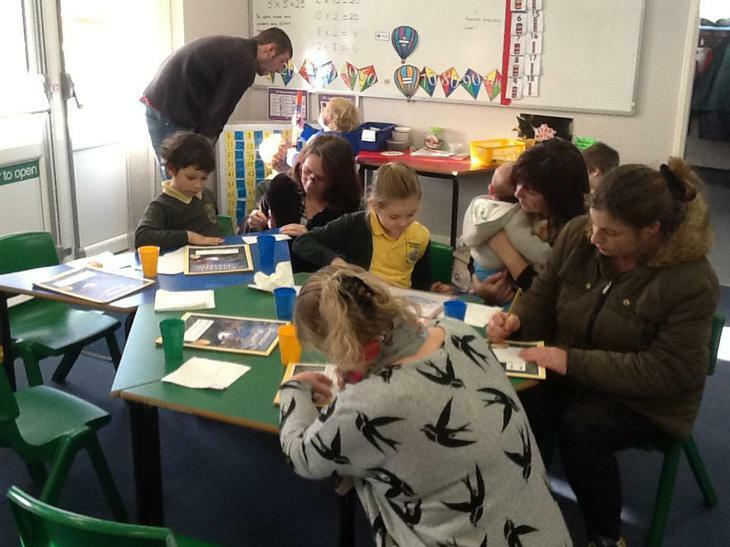 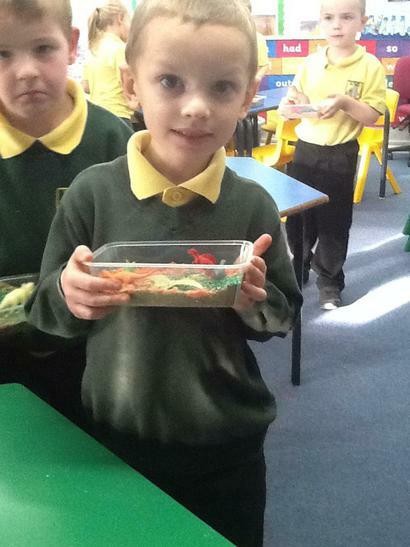 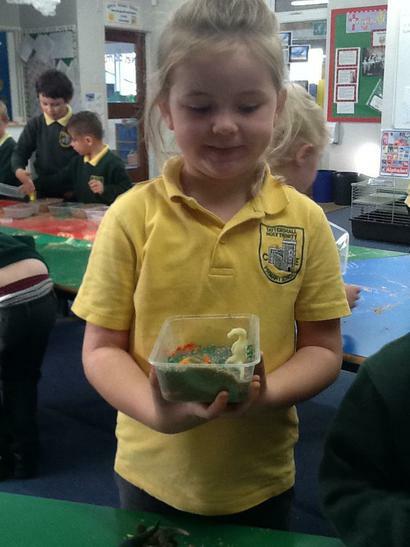 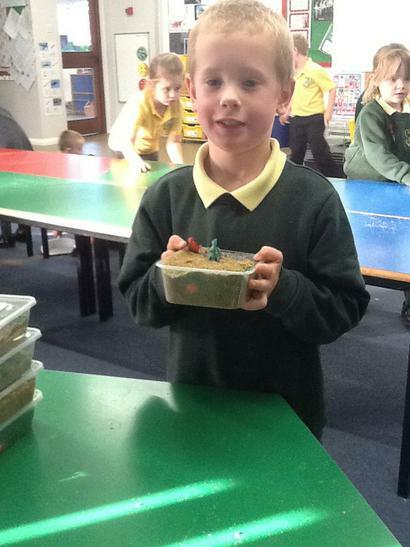 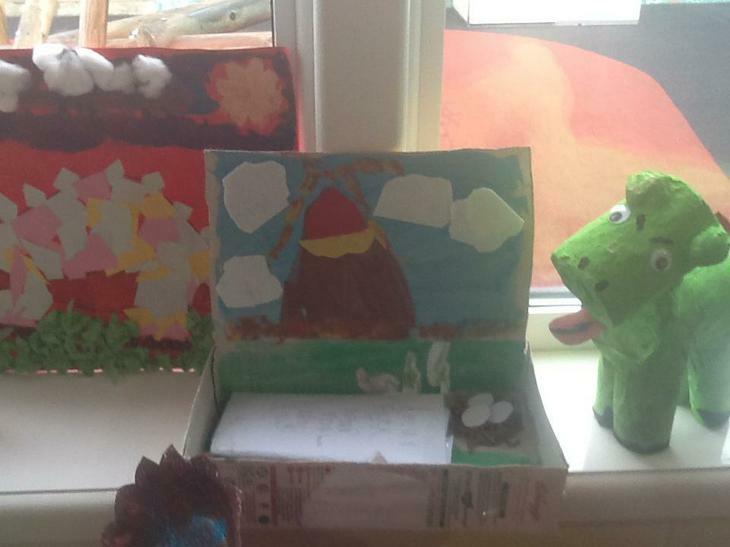 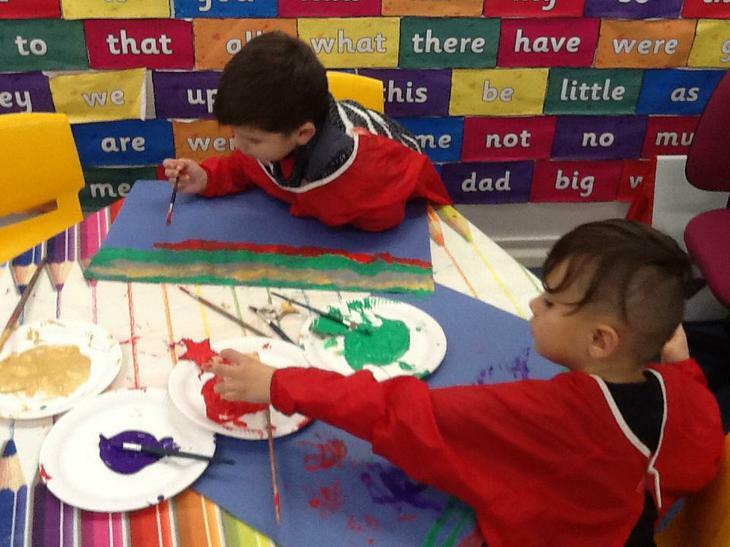 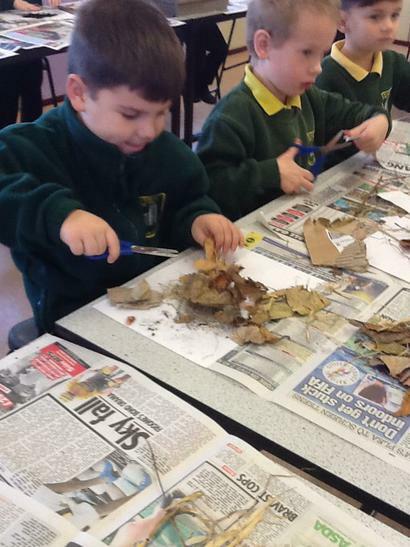 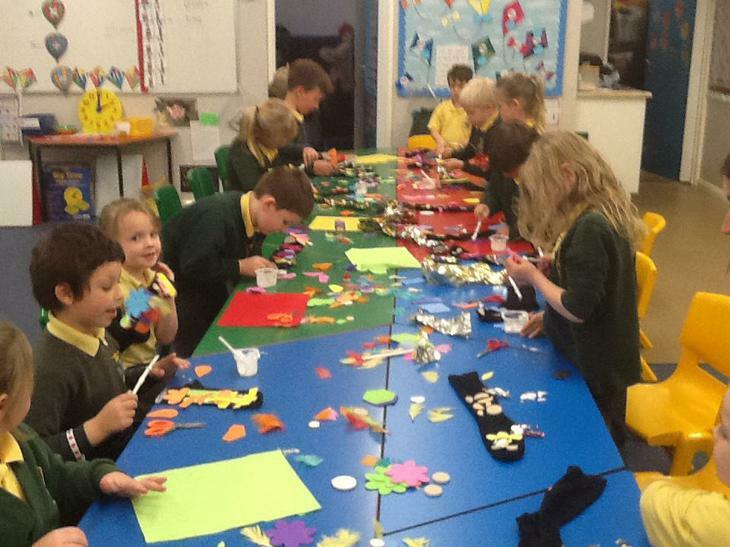 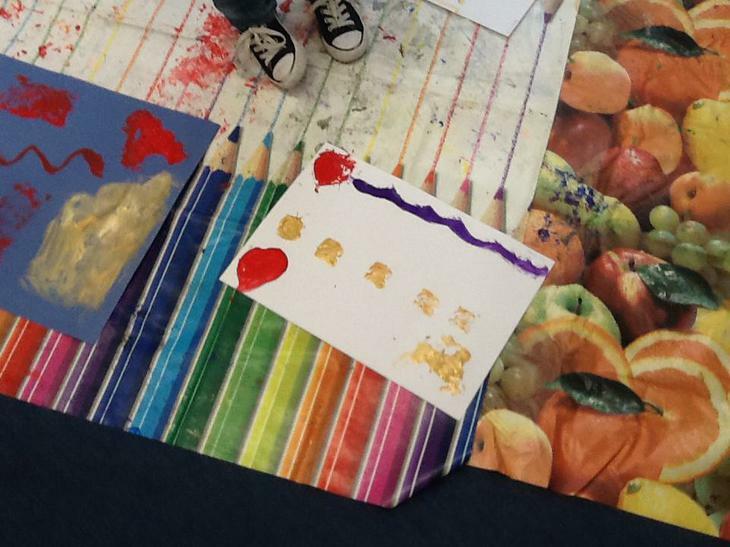 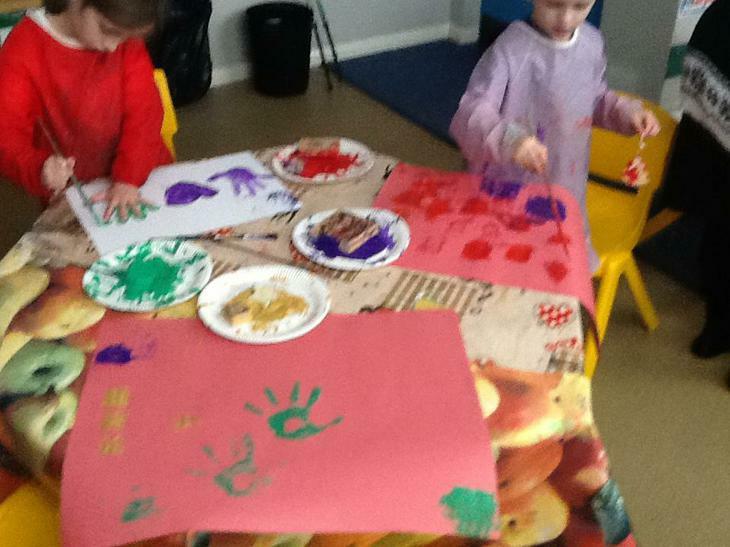 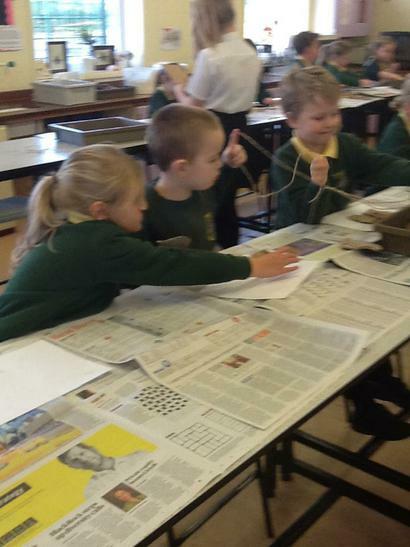 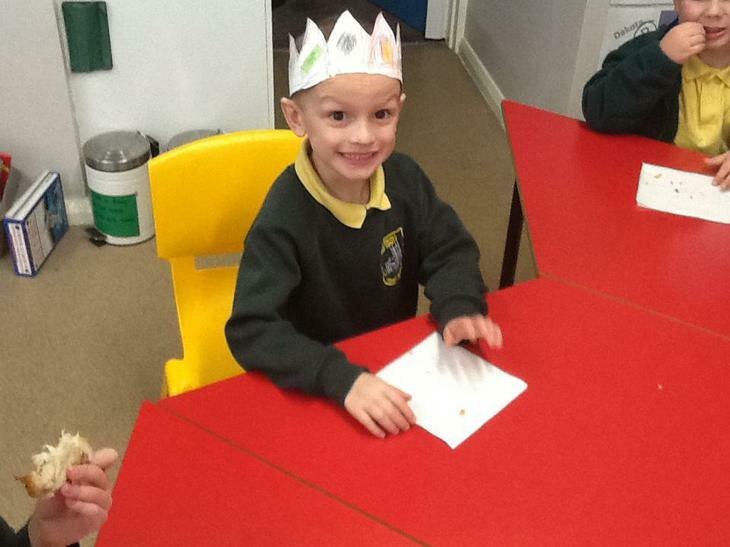 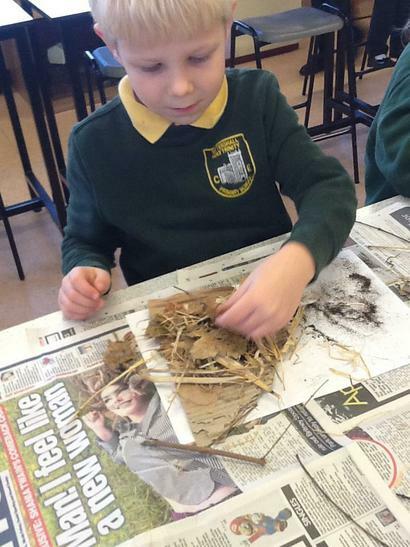 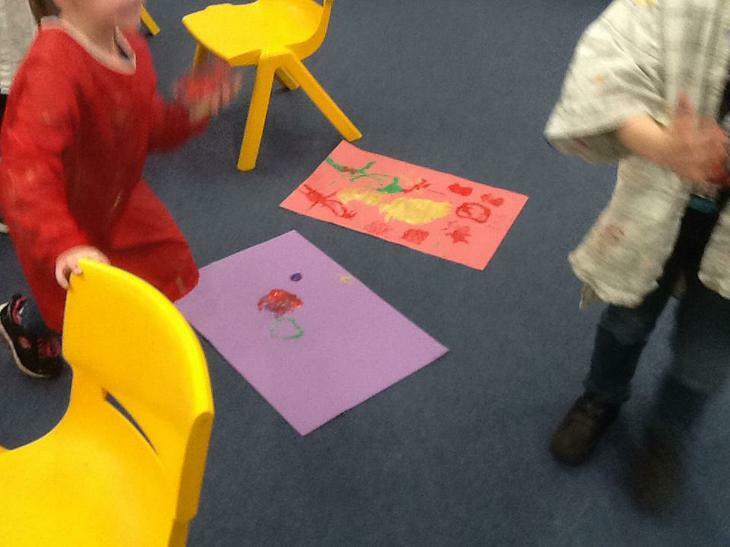 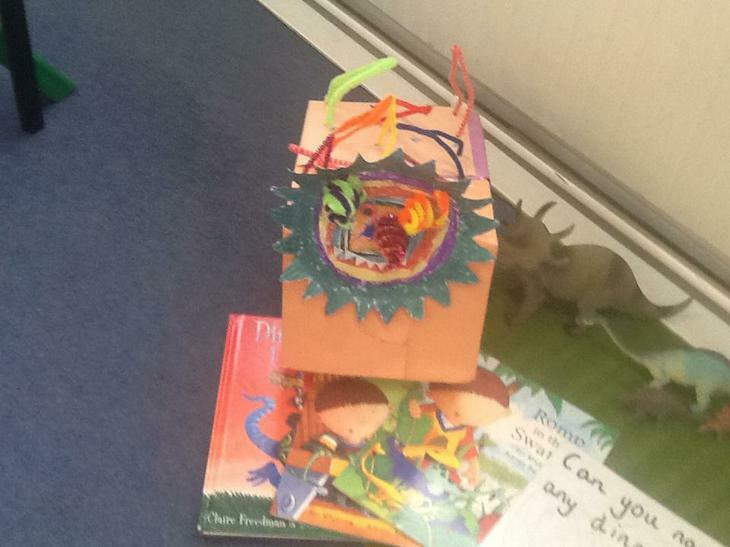 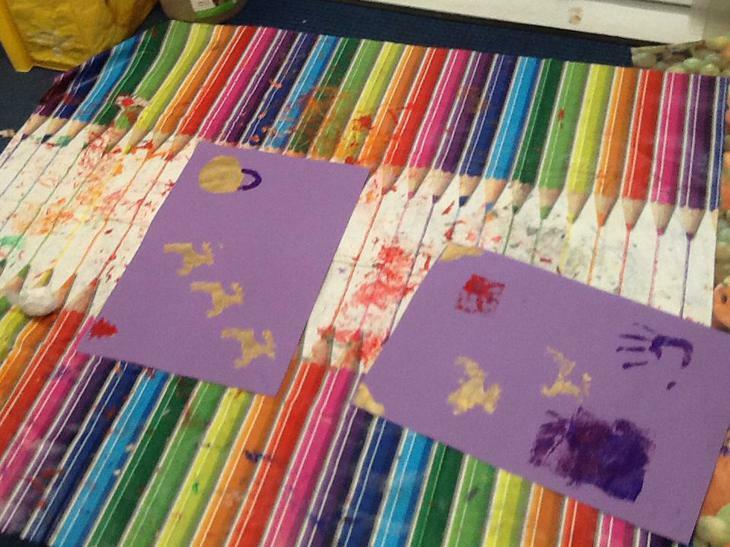 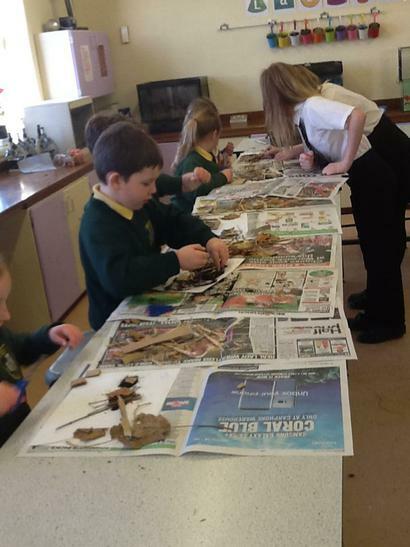 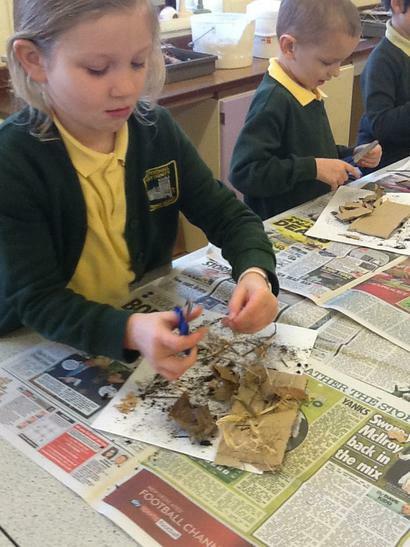 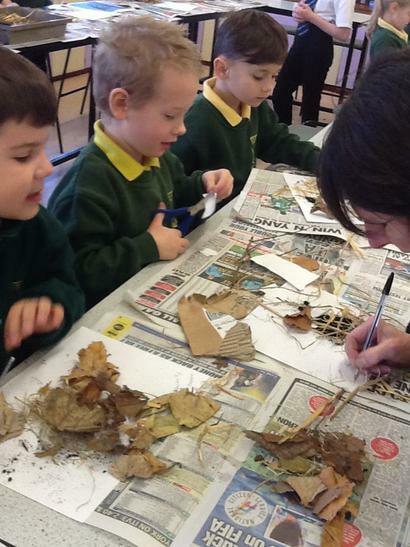 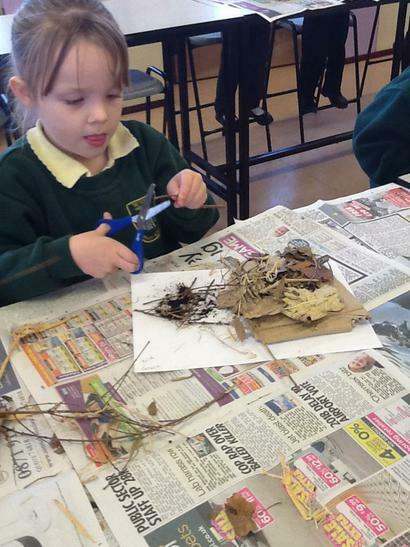 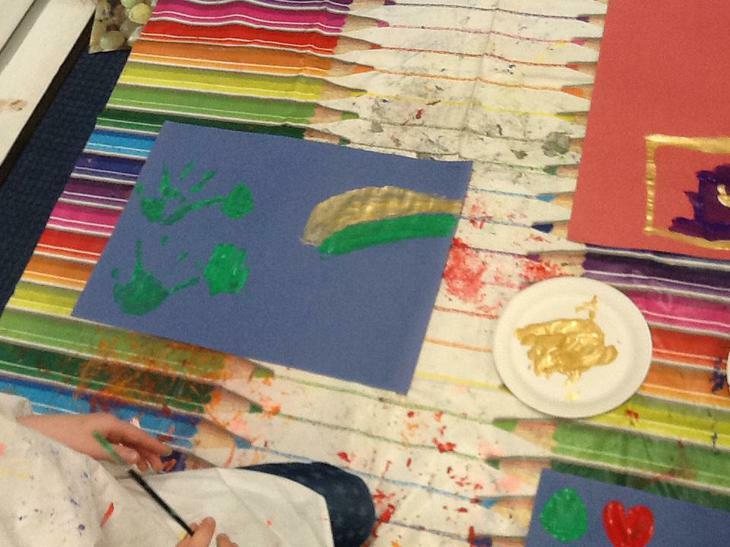 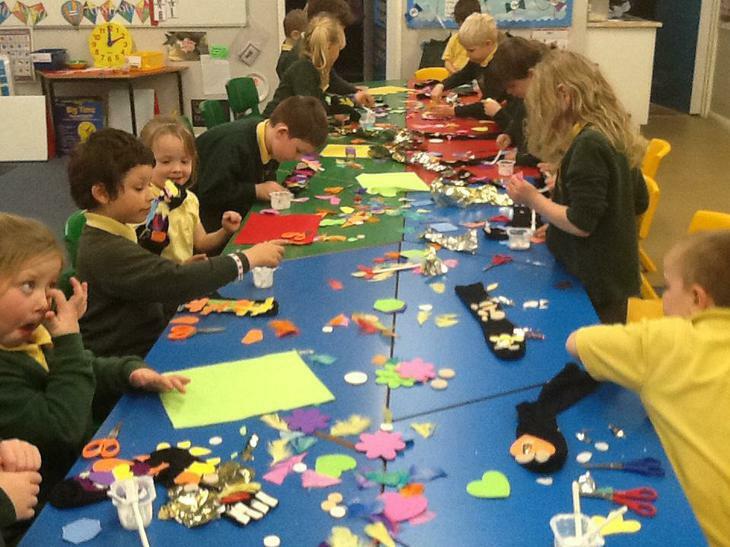 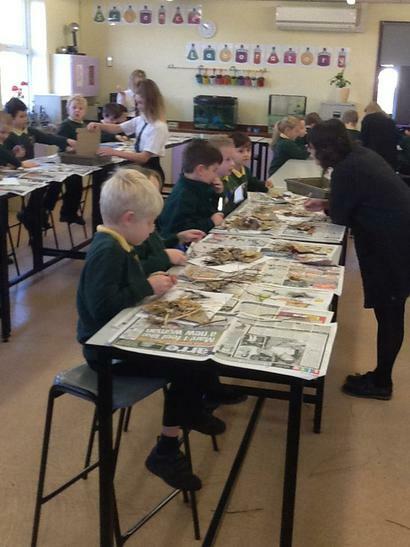 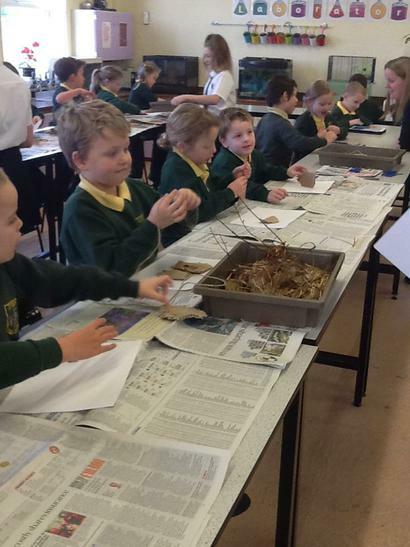 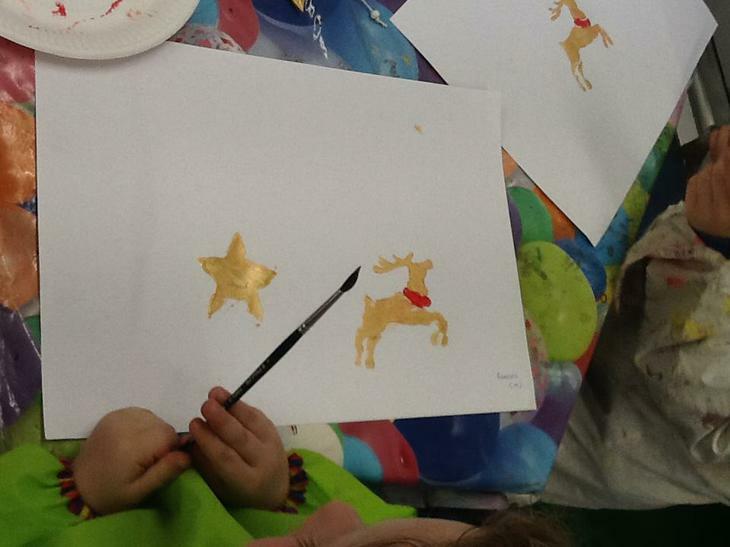 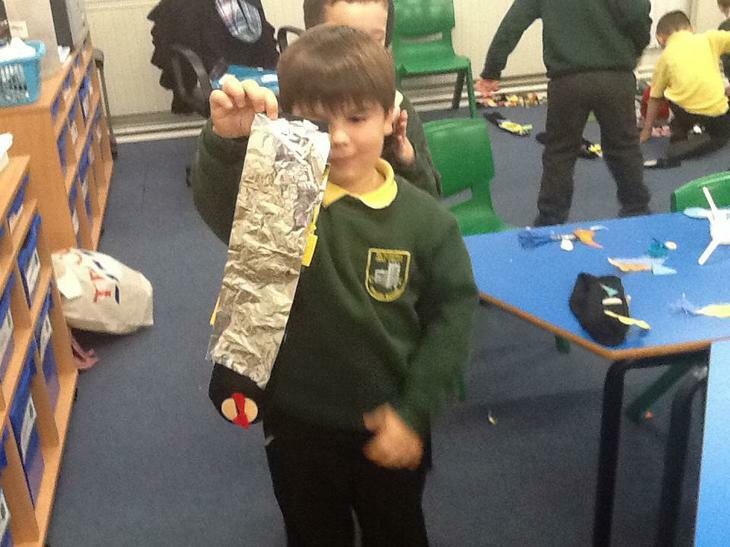 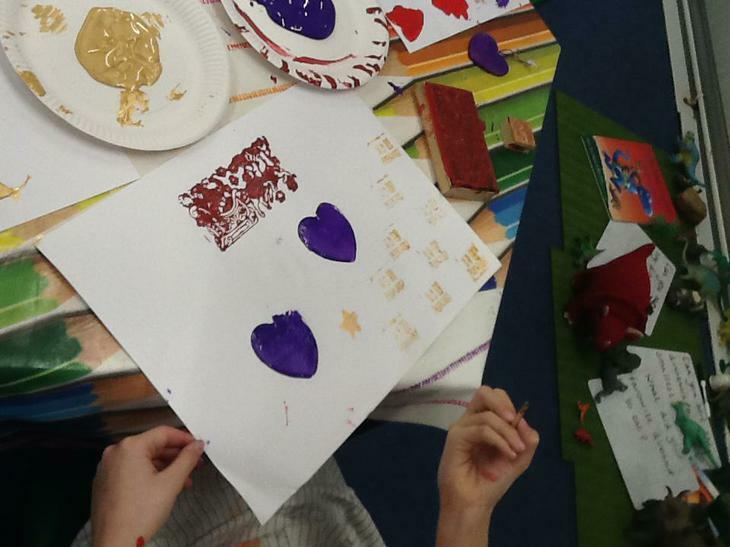 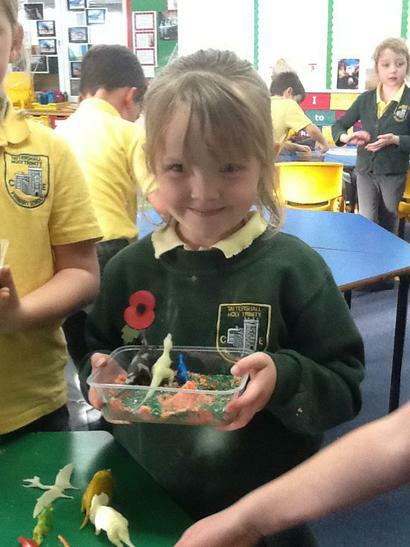 There has been lots of exciting learning about dinosaurs and even a secret craft afternoon for the Christmas Fair! 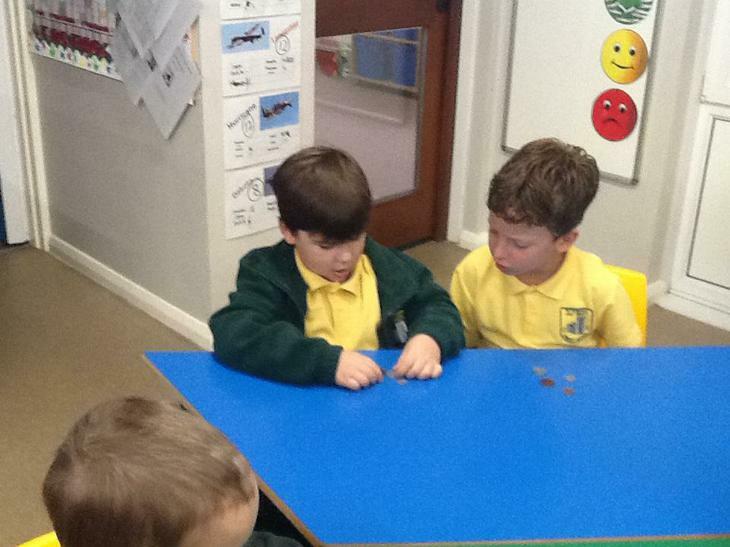 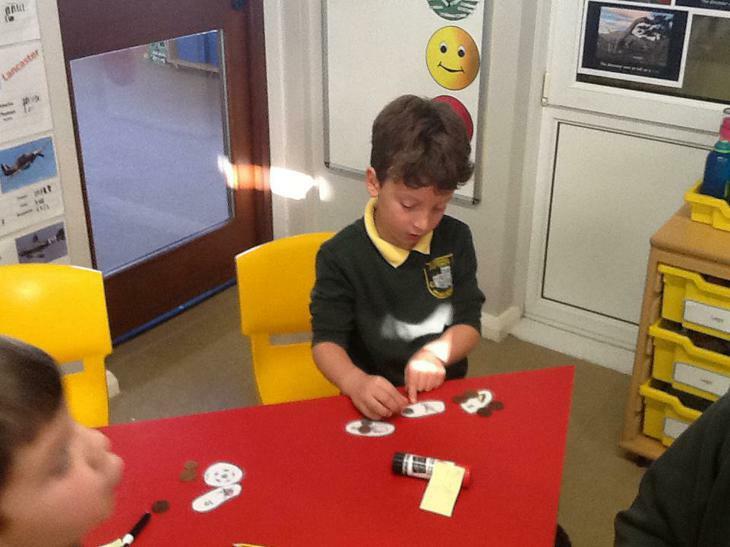 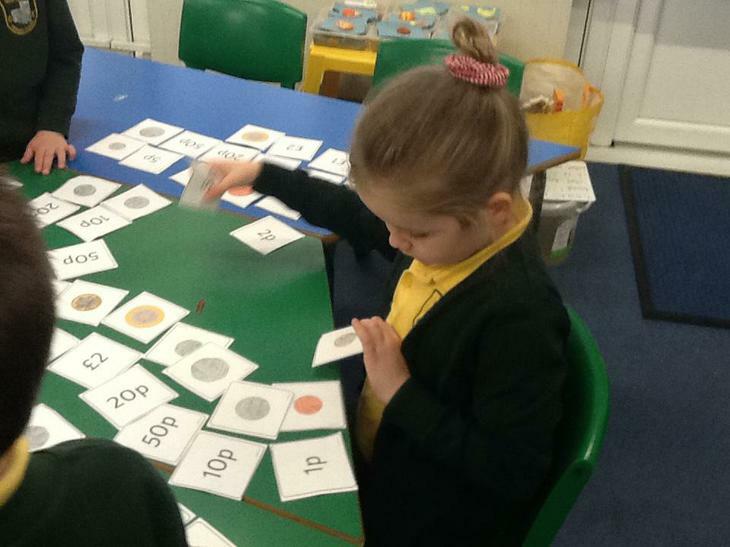 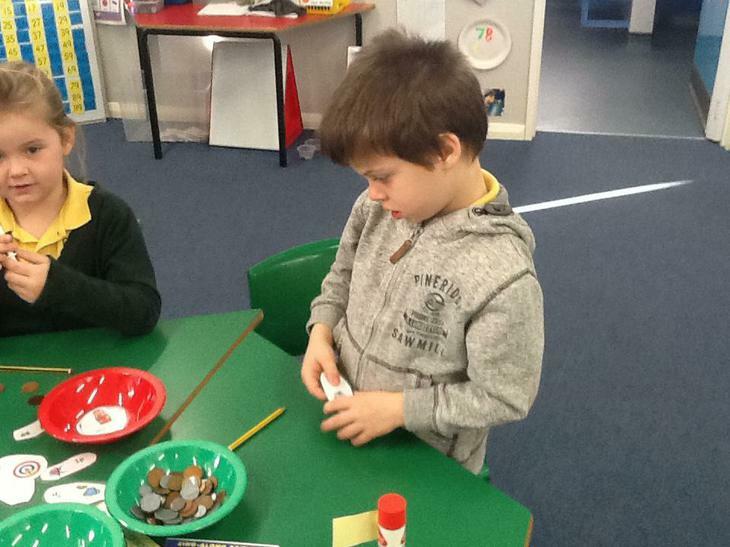 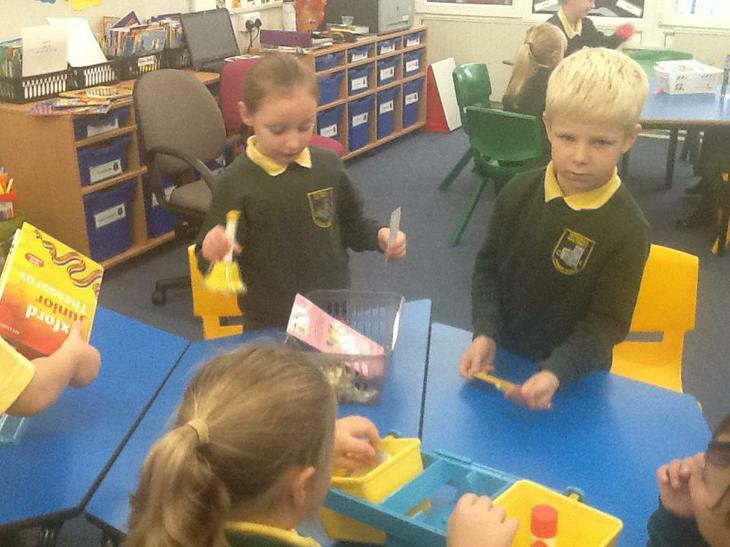 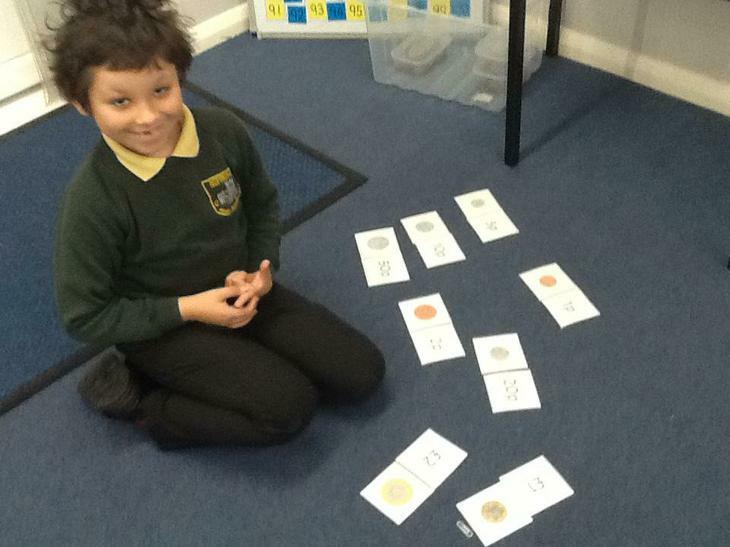 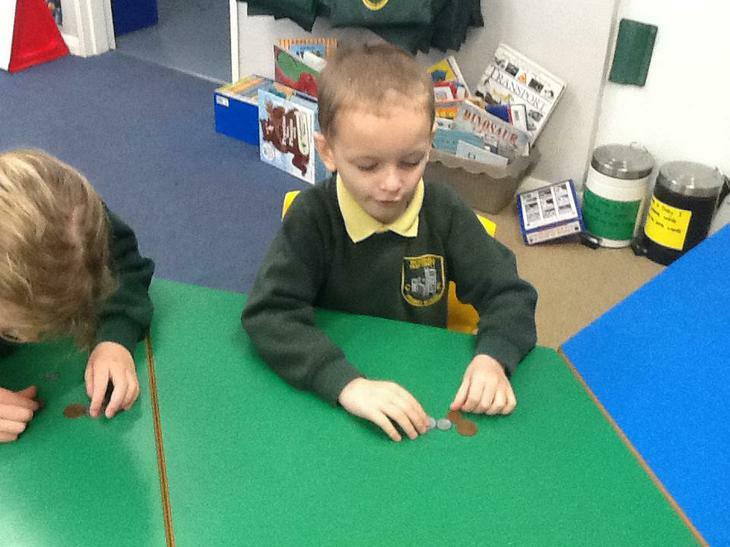 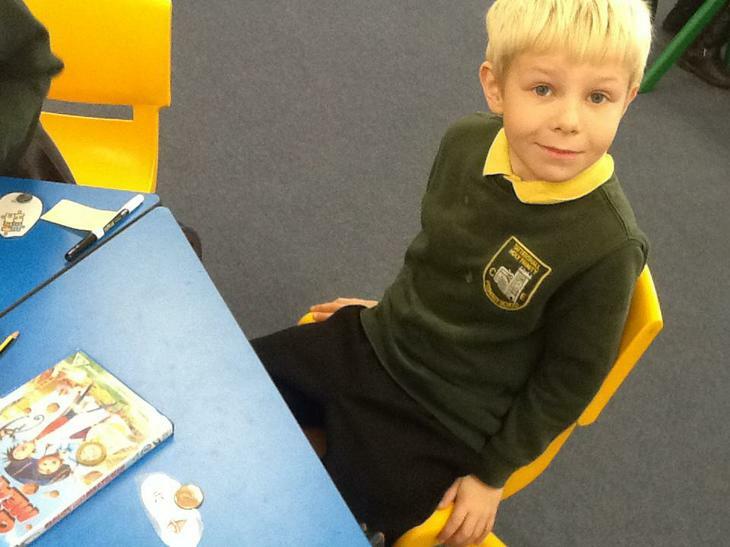 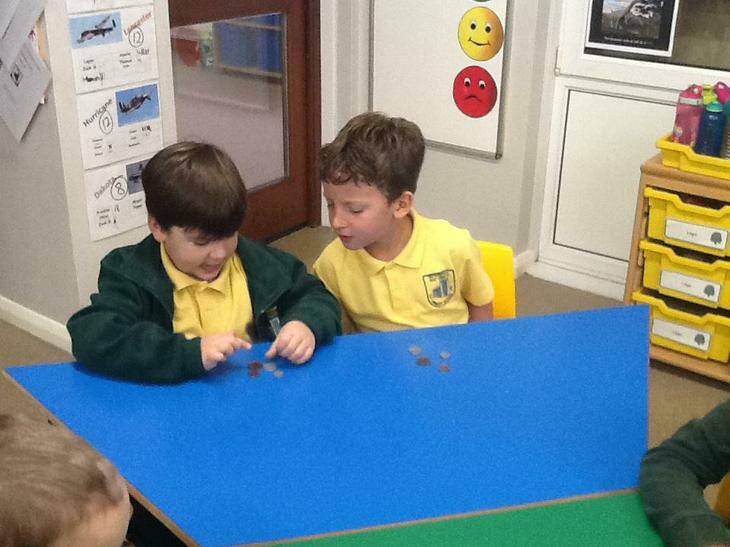 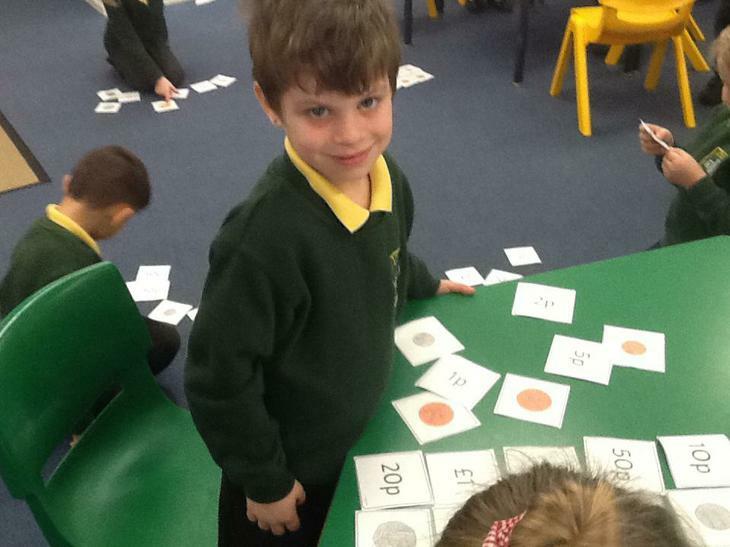 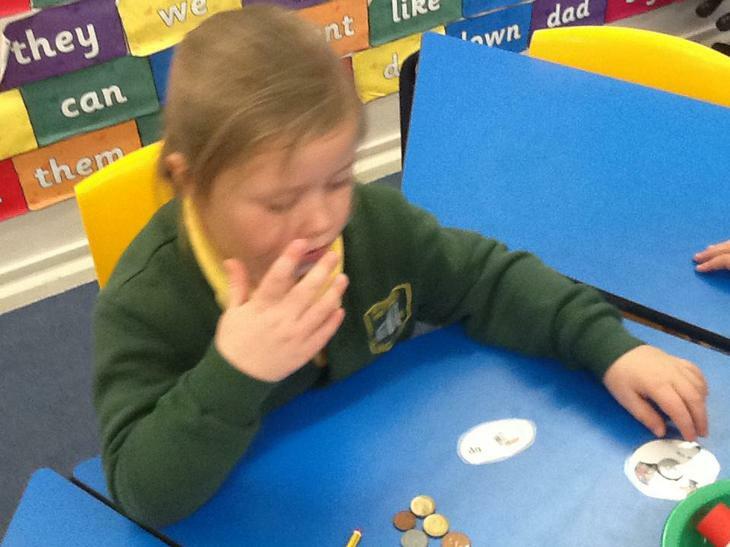 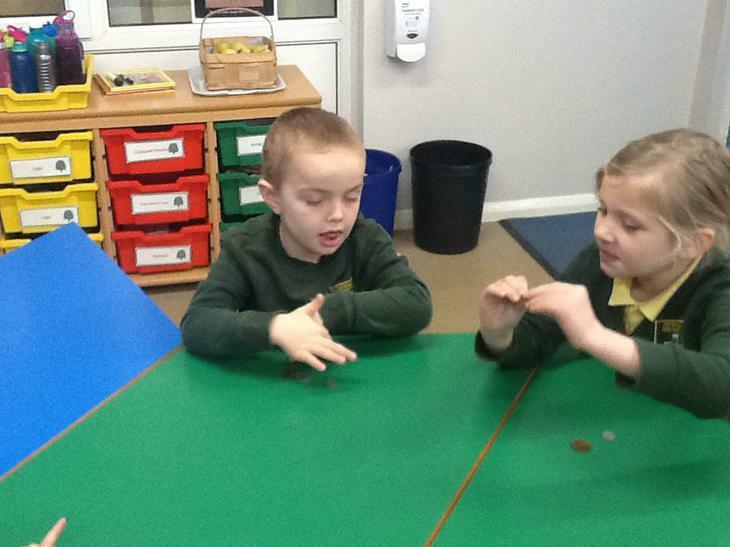 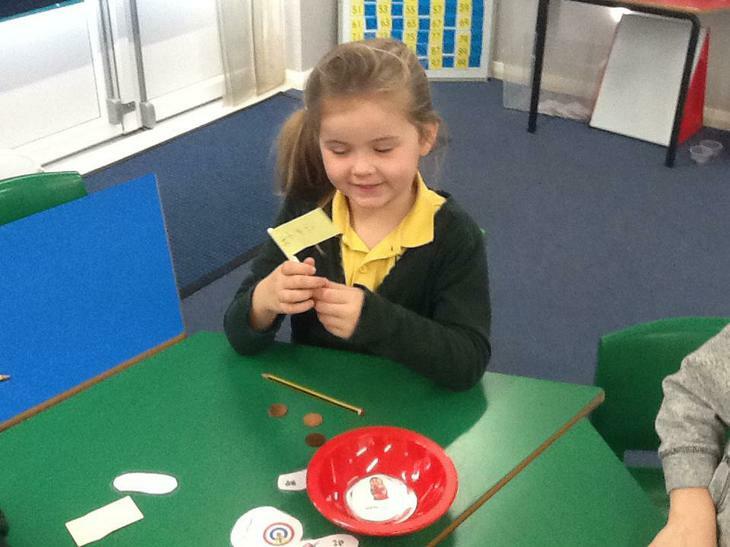 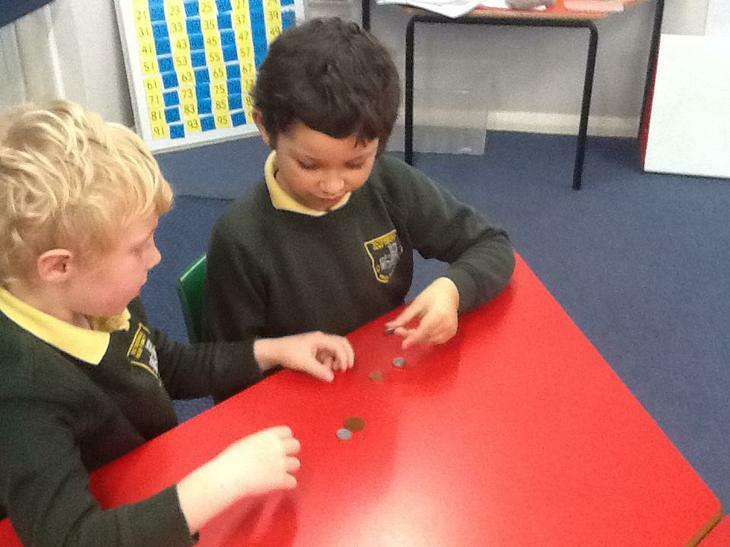 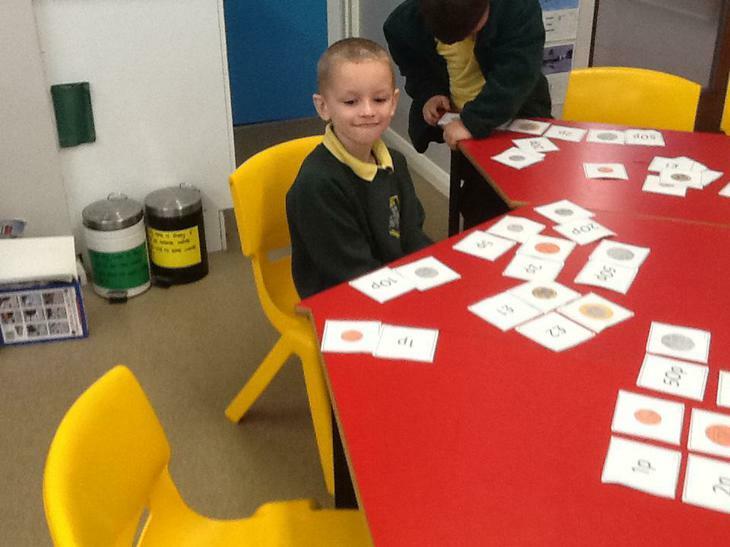 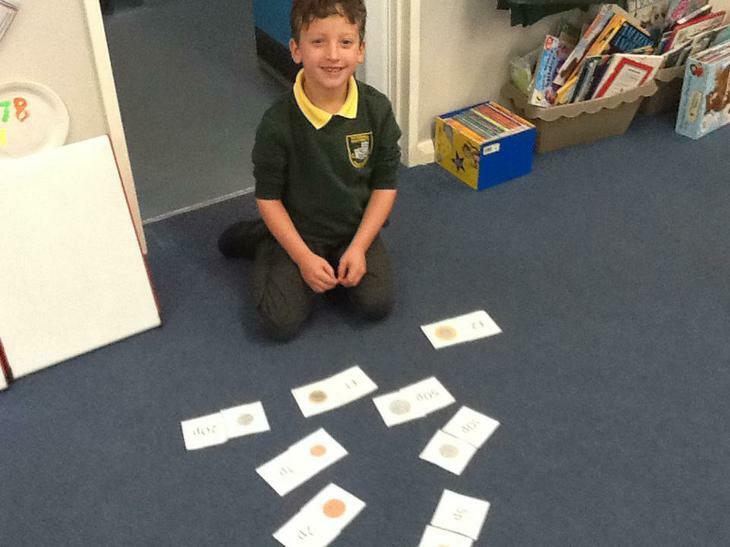 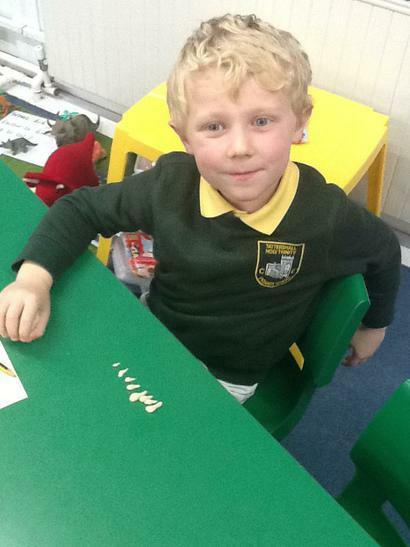 In maths this week we have been learning all about money. 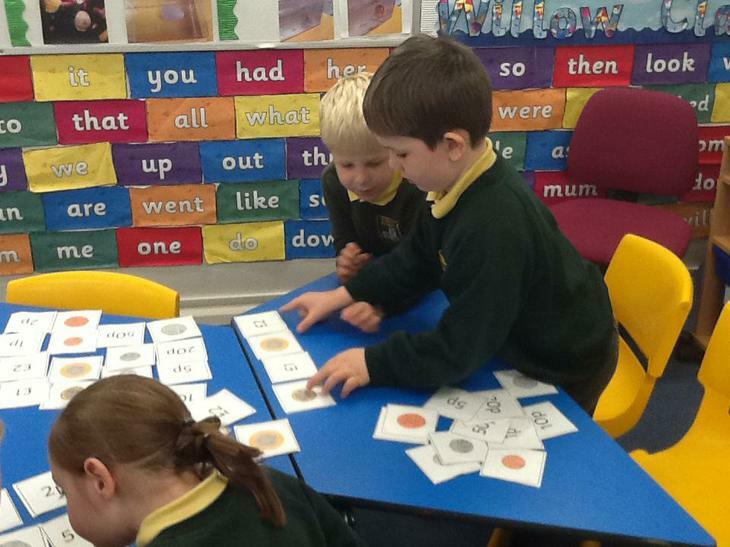 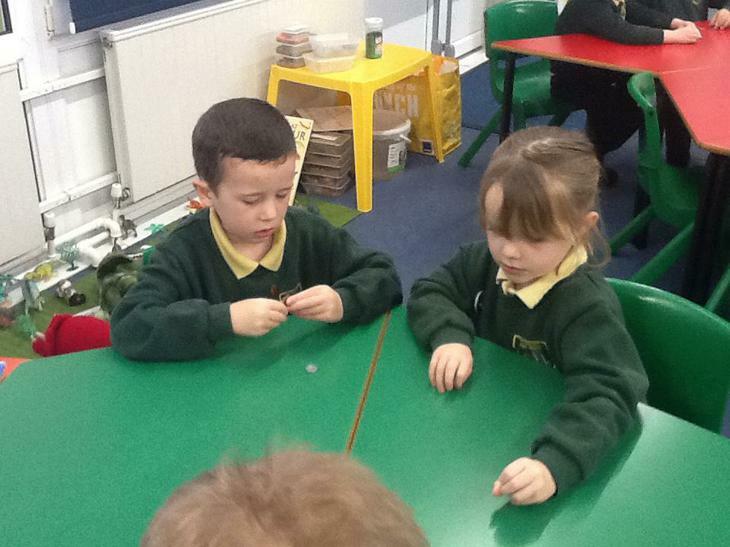 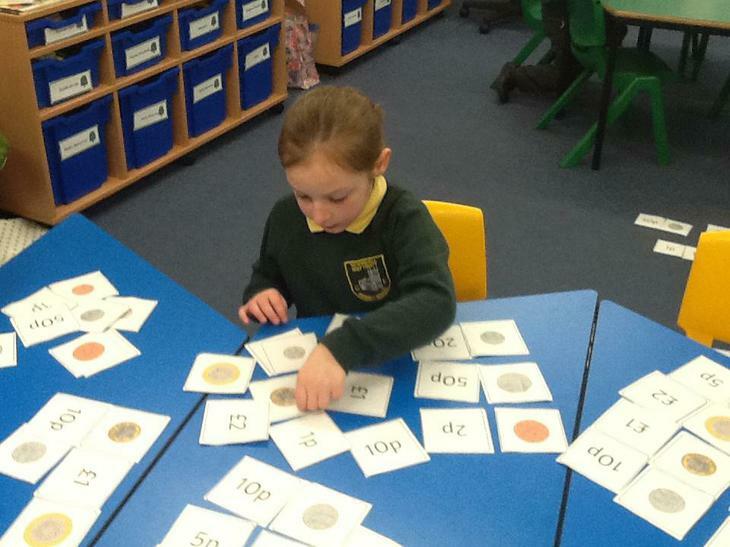 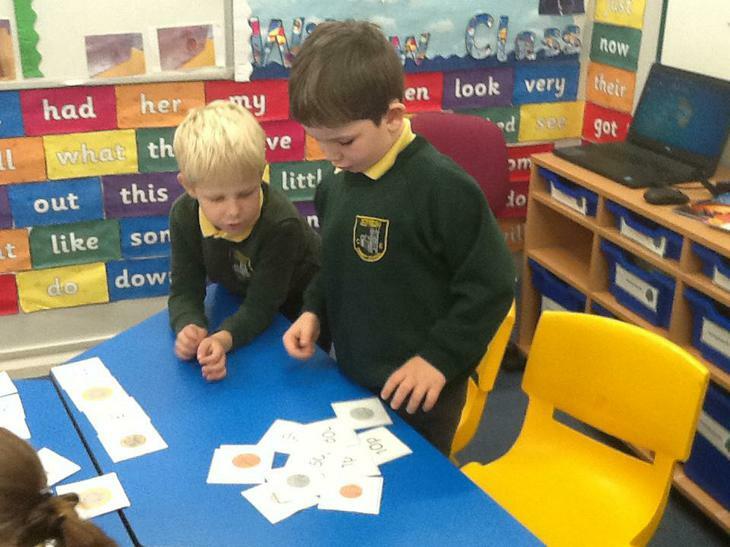 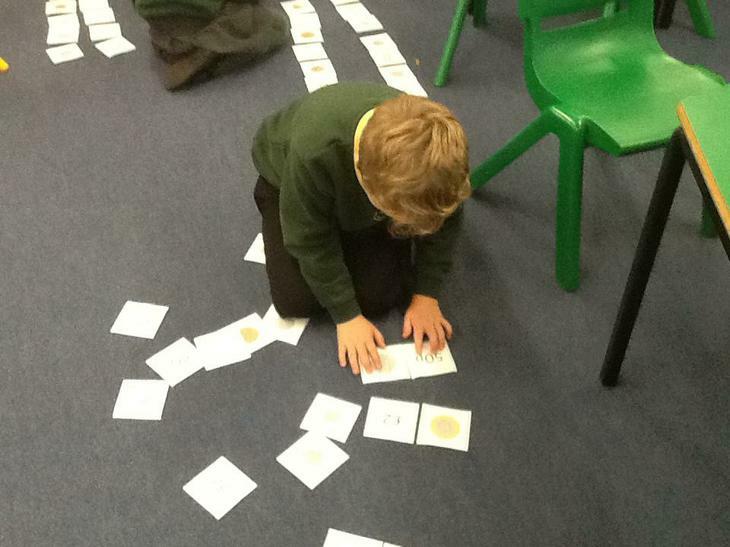 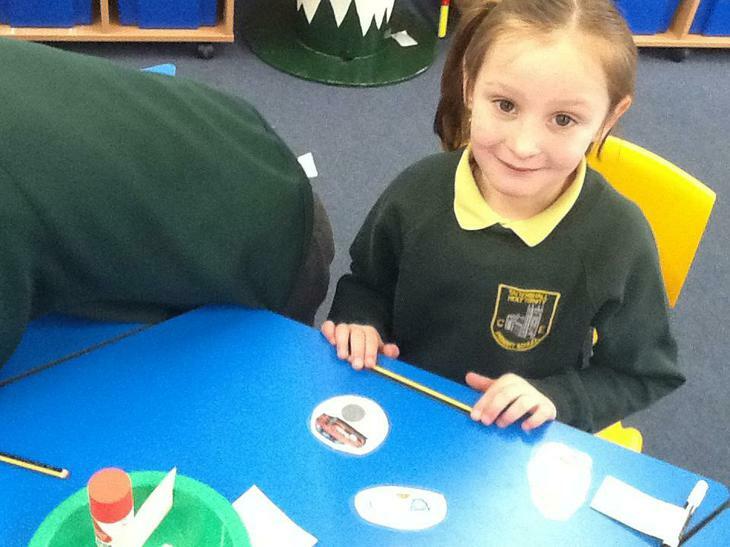 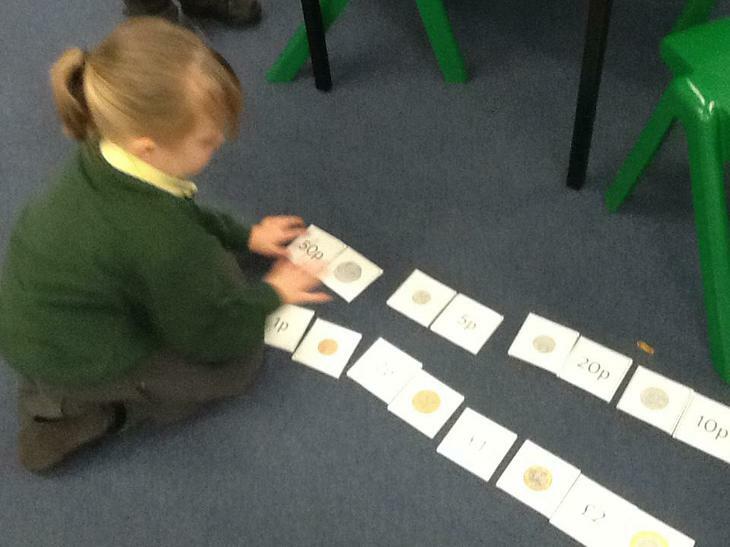 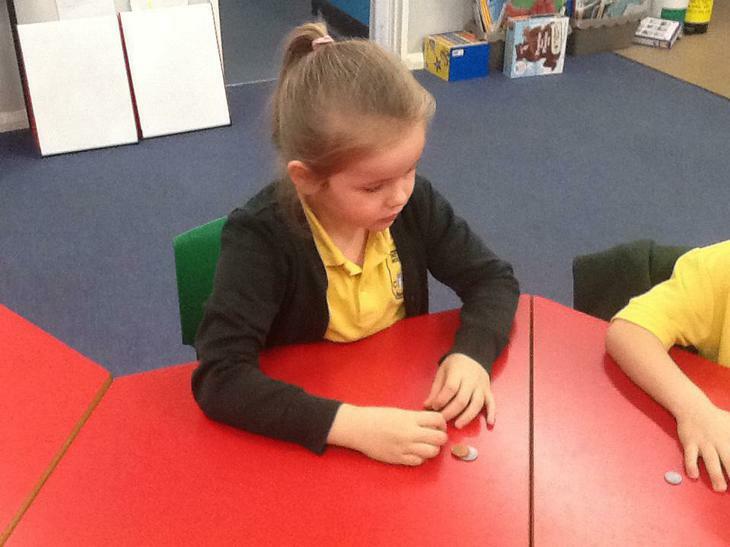 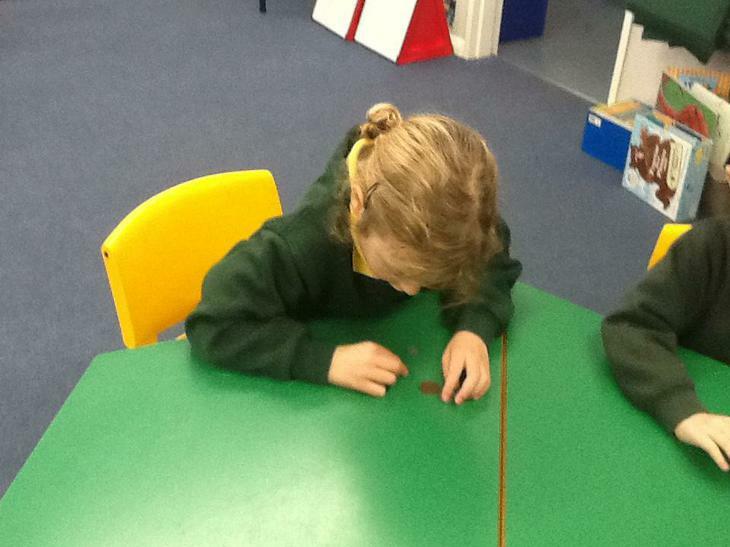 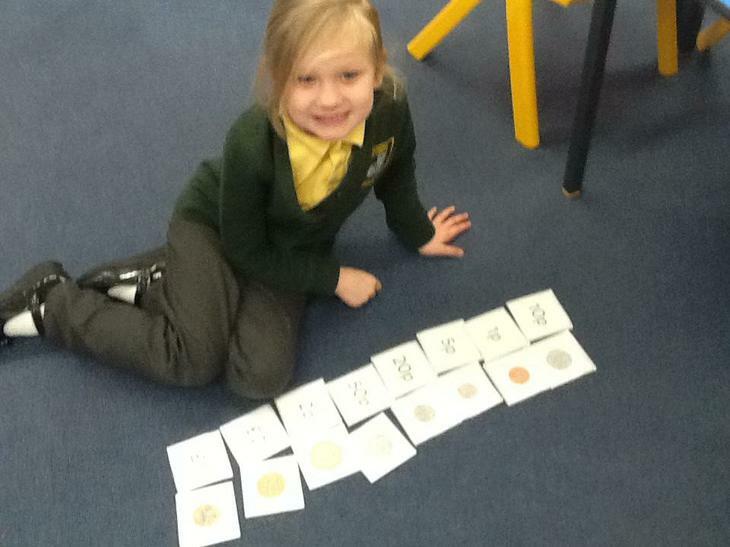 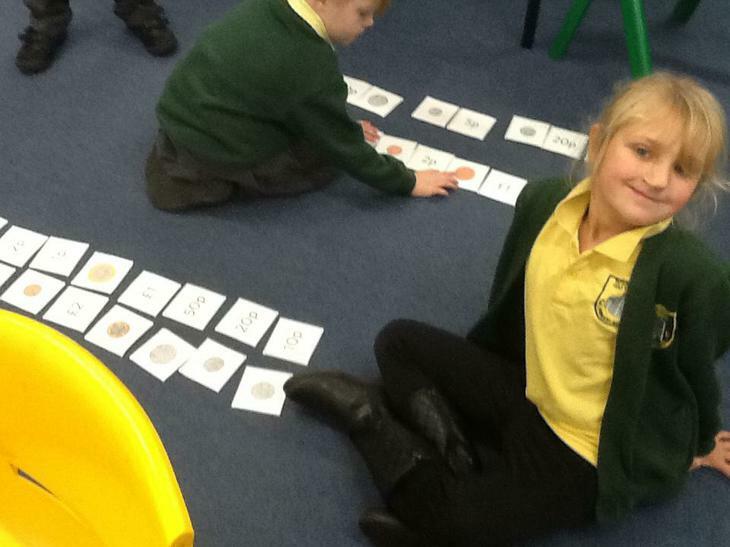 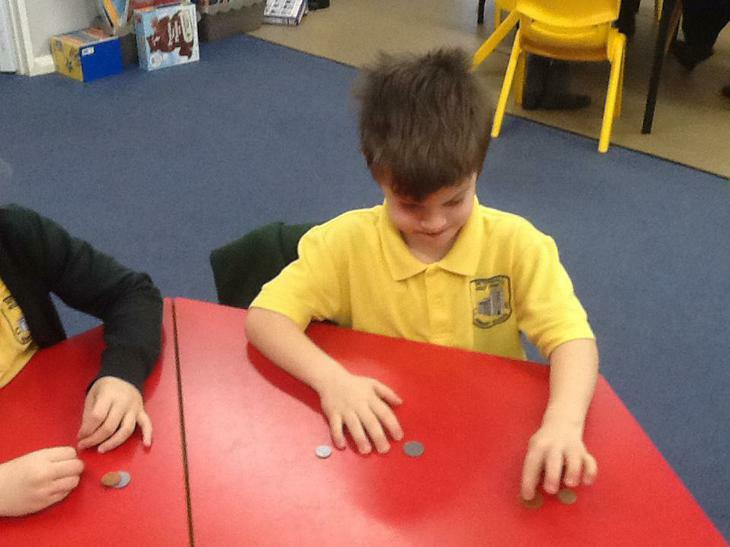 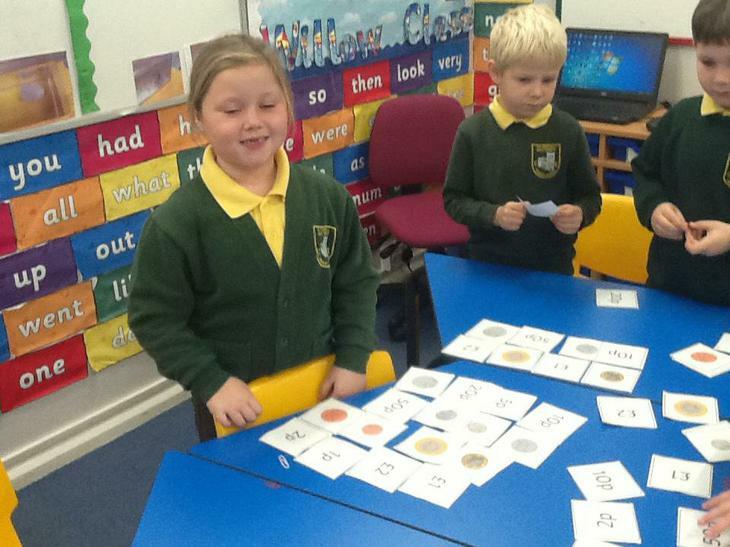 We began the week looking at different coins and talking about how we know they are a particular coin. 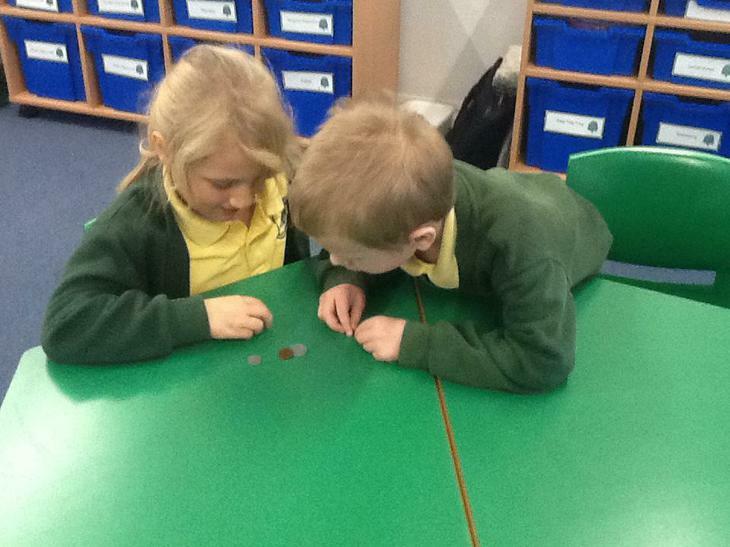 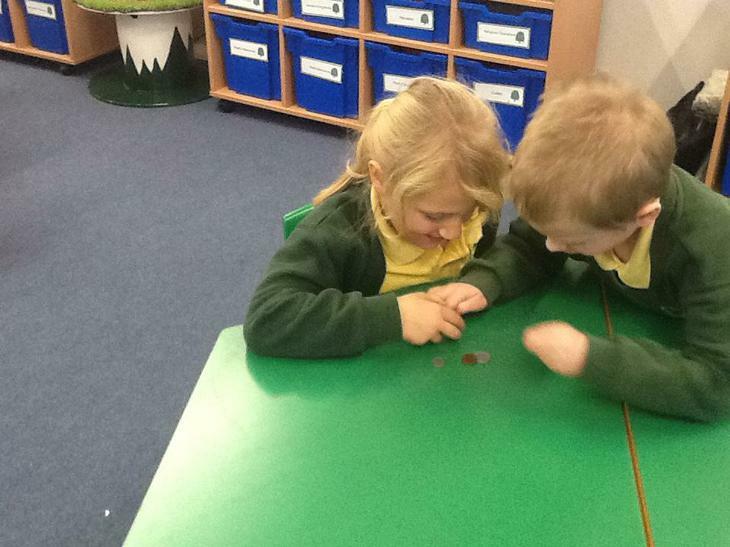 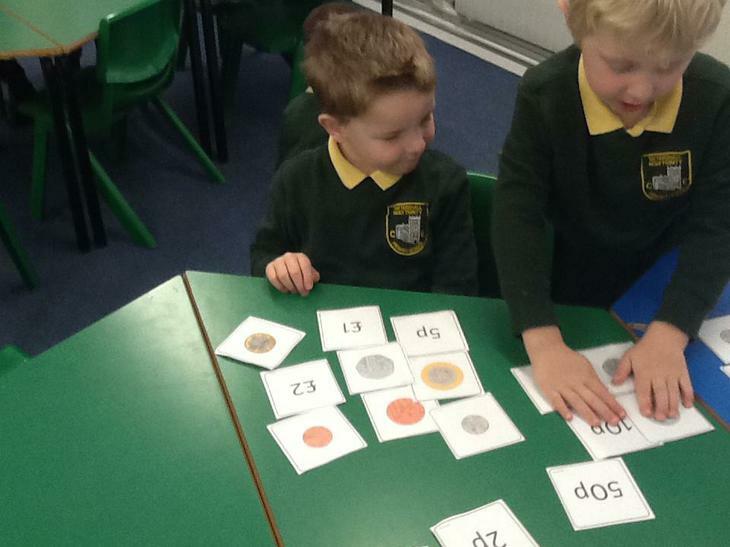 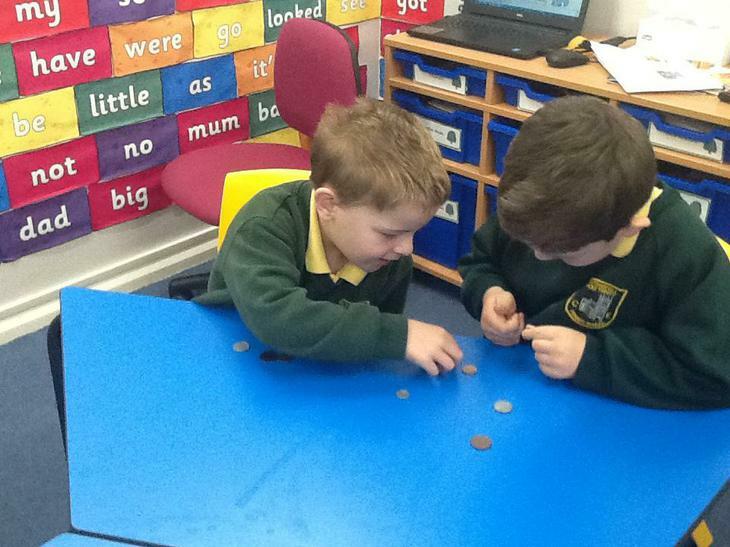 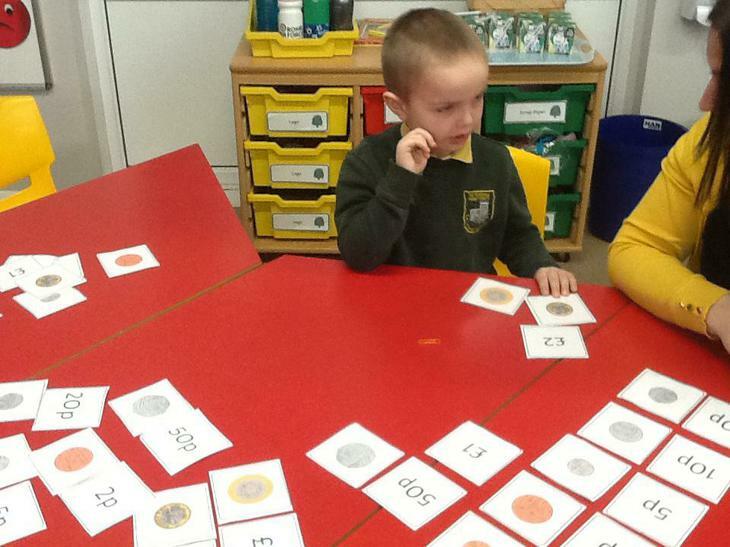 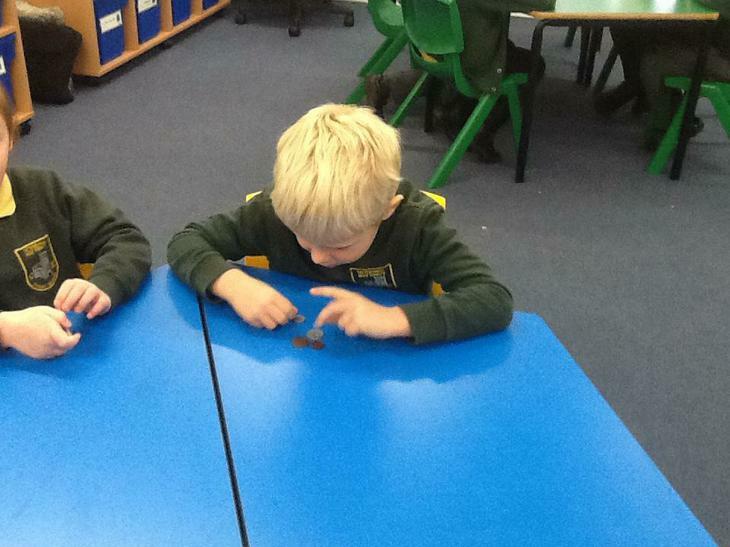 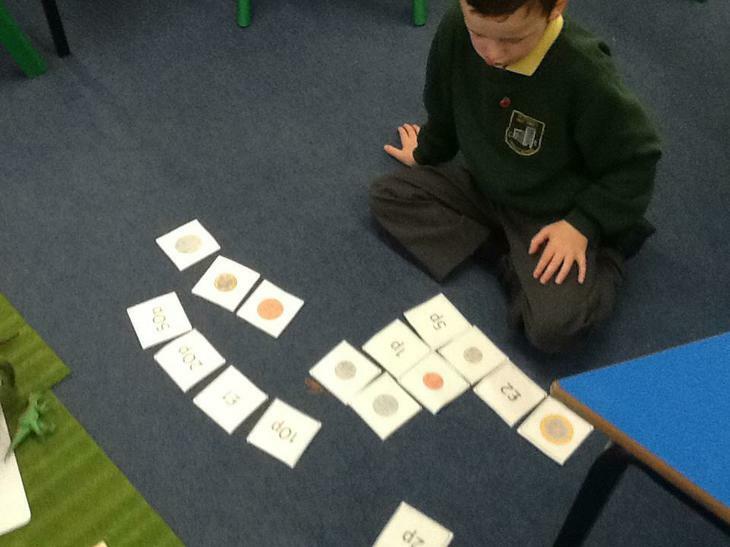 We discussed the shape and colour of the coins and if the coins had any clues to help us know which coin they were. 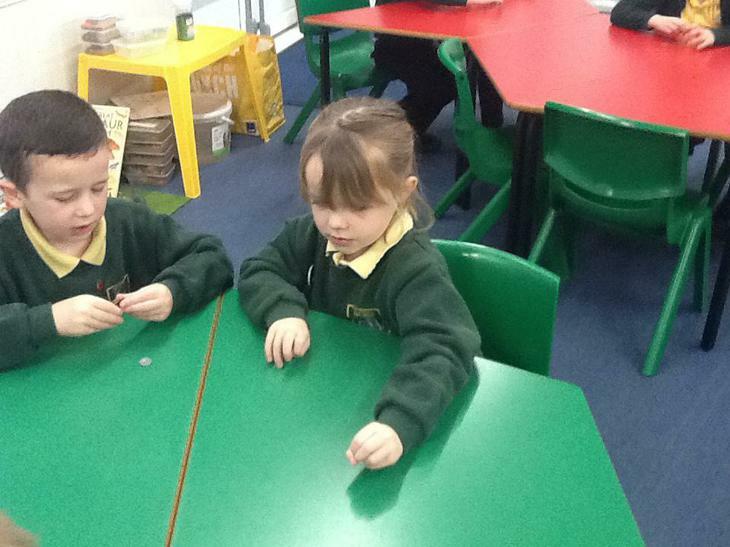 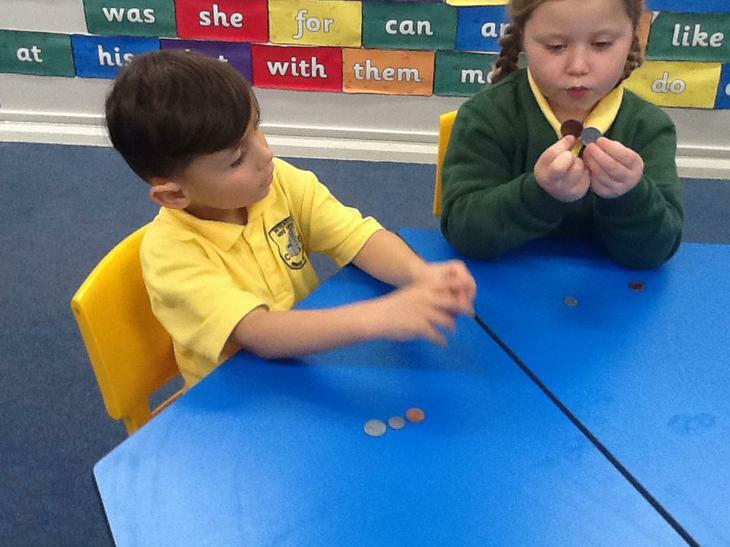 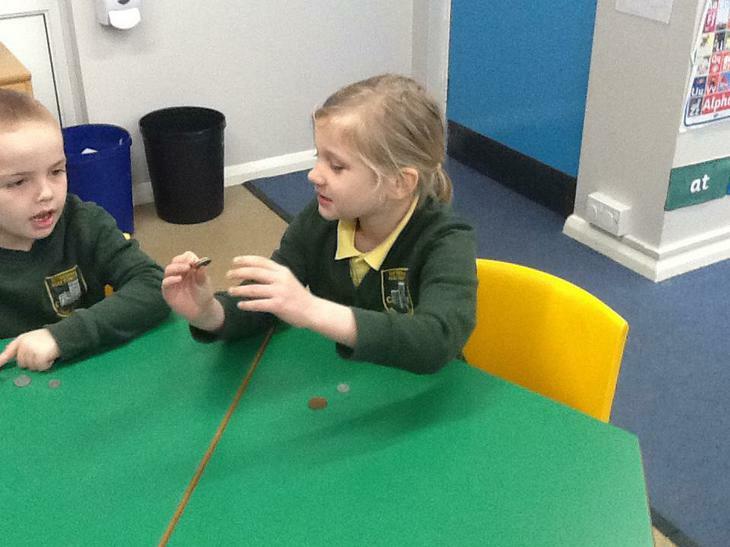 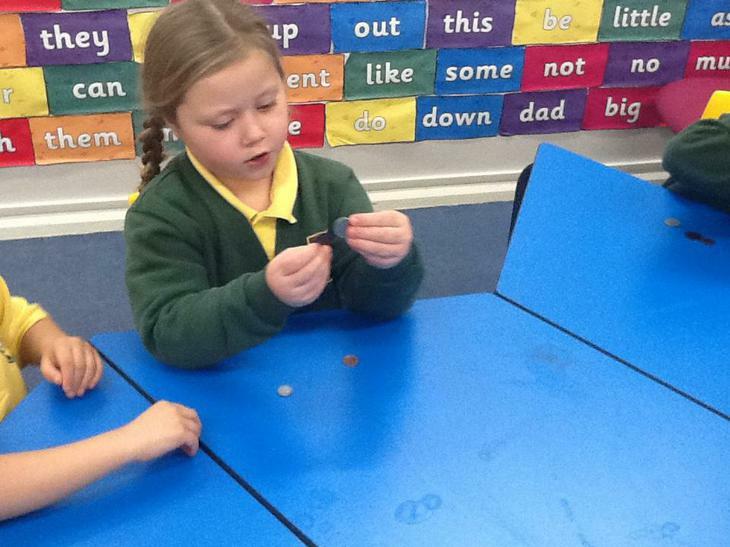 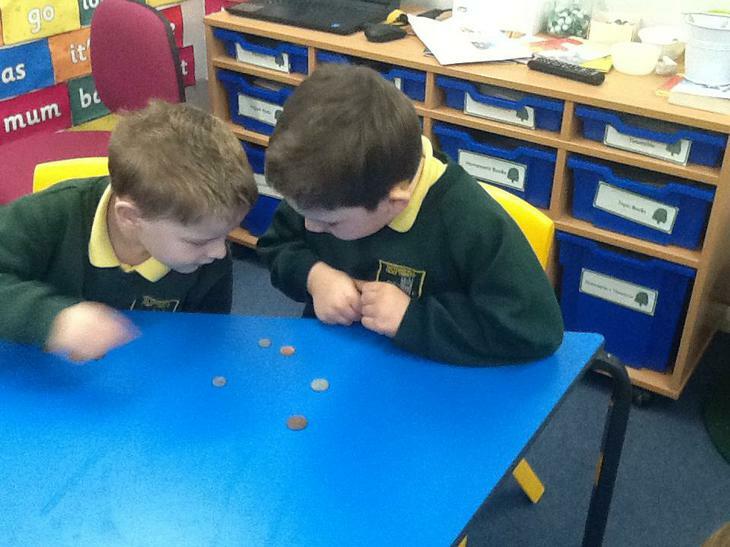 We then moved on to matching coins to their values it was really interesting to discover how many pennies there were in a pound. 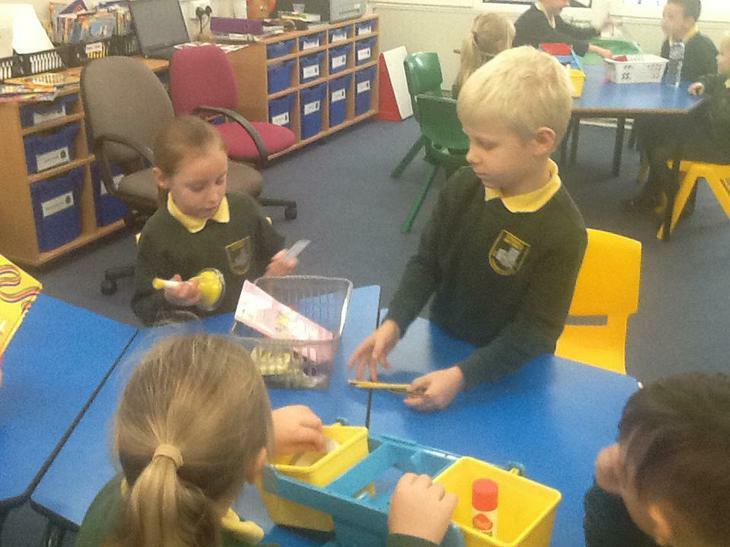 We ended the week with our very own class shop. 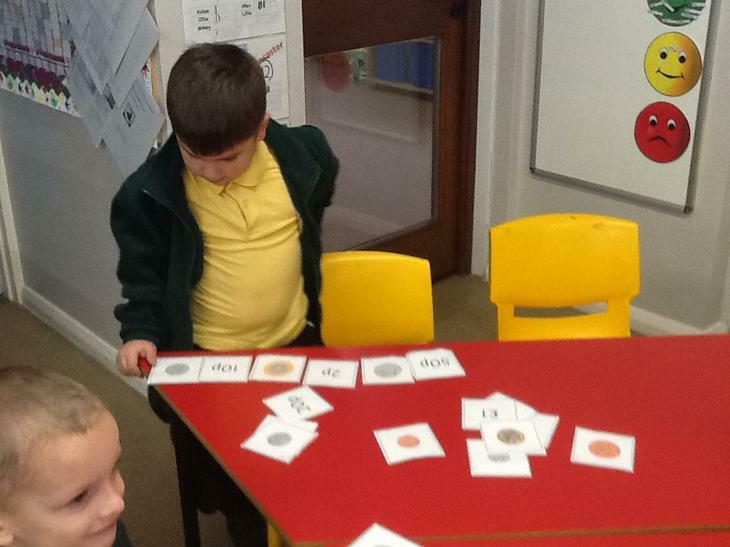 It was great fun selecting the right coins to buy different items. 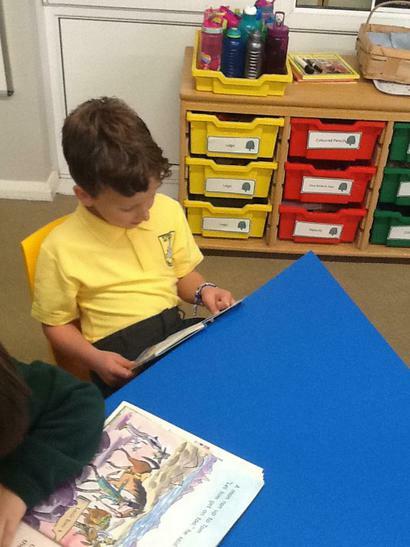 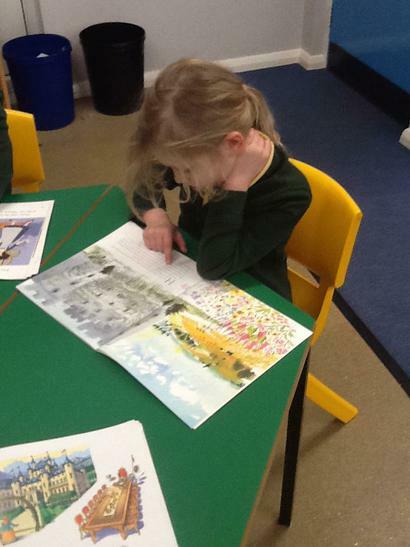 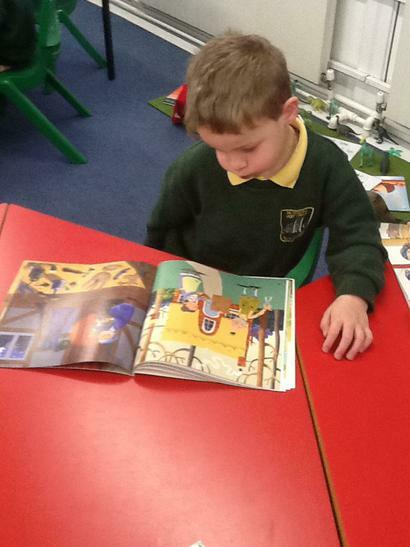 In English this week we have been thinking about different stories. 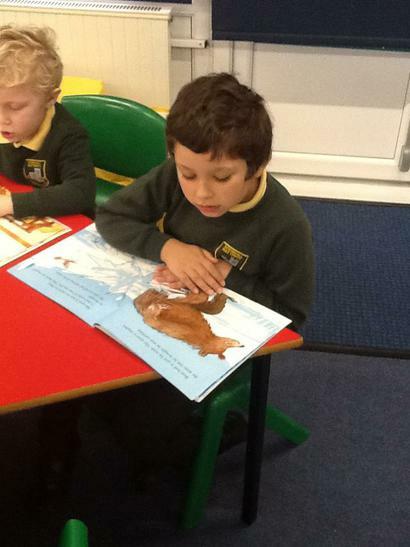 We read through some traditional tale stories to see if we could spot any features that were the same. 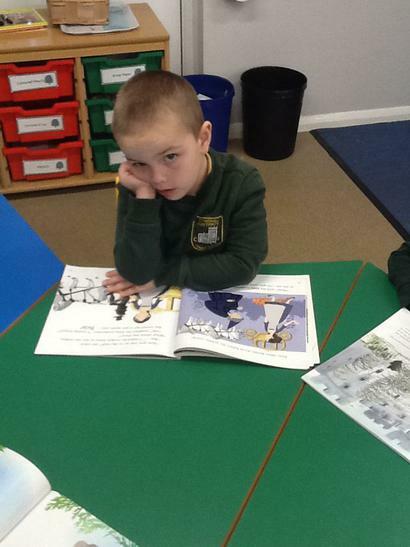 We then thought about our favourite story and who the main character was. 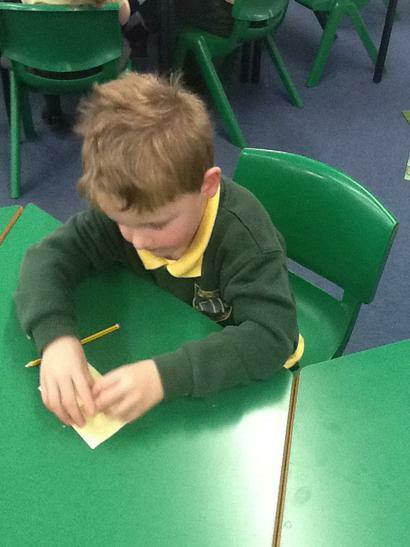 We then created a word bank to describe our favourite character and then wrote a character description about them. 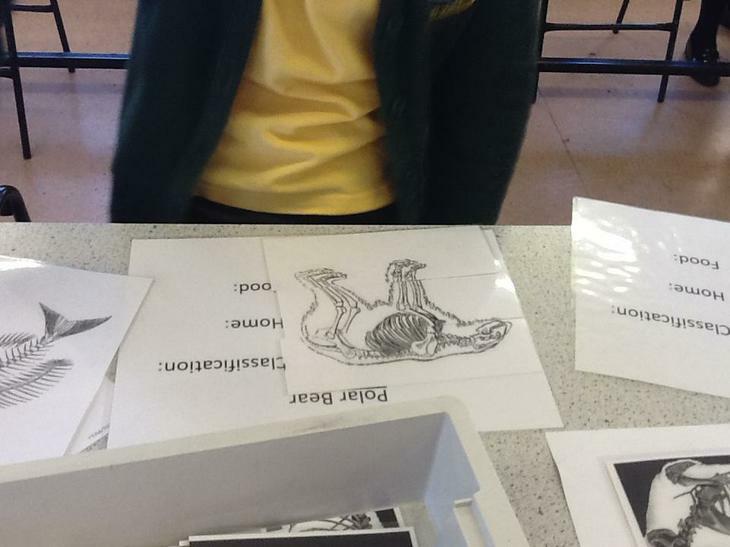 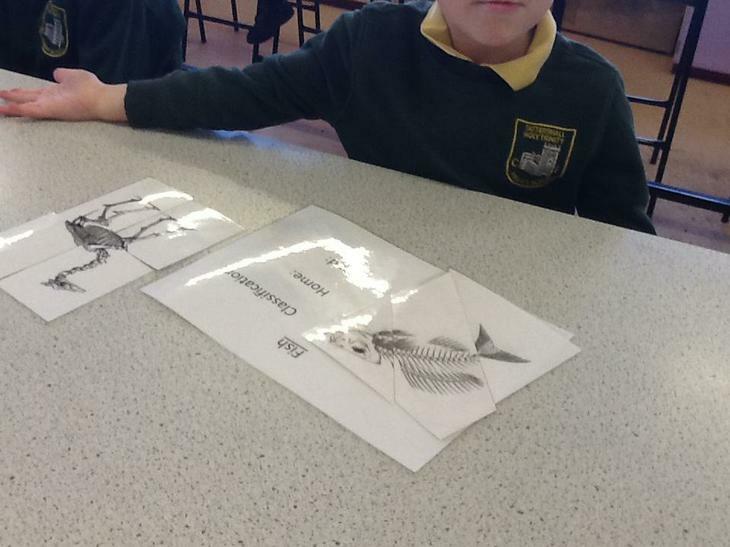 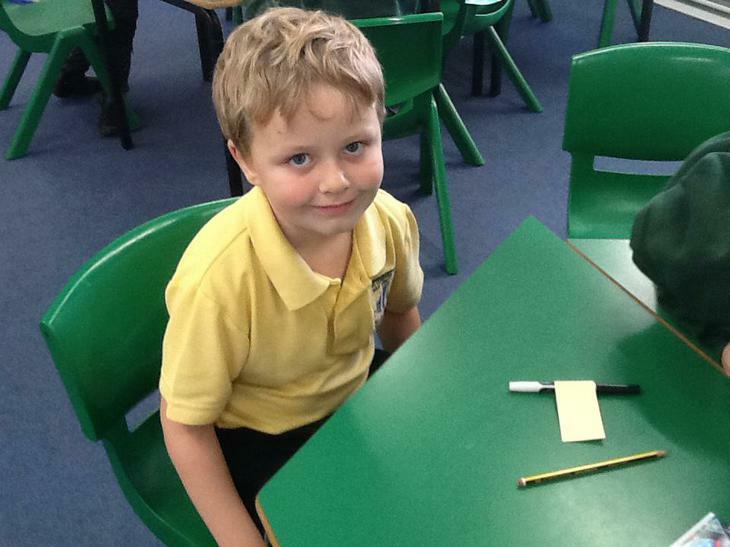 This week in science we have been learning more about the different types of animals. 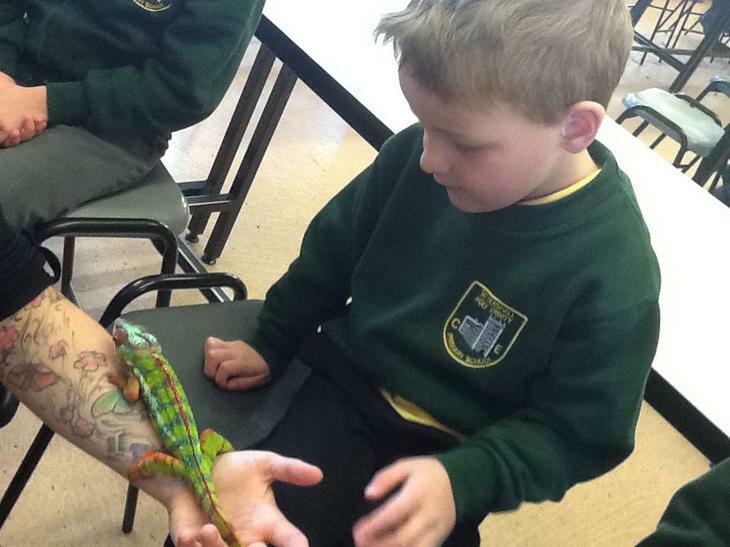 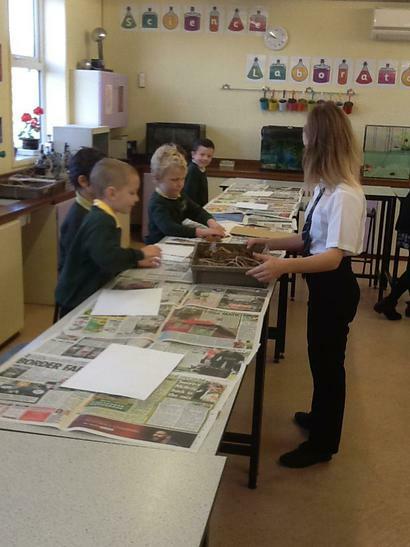 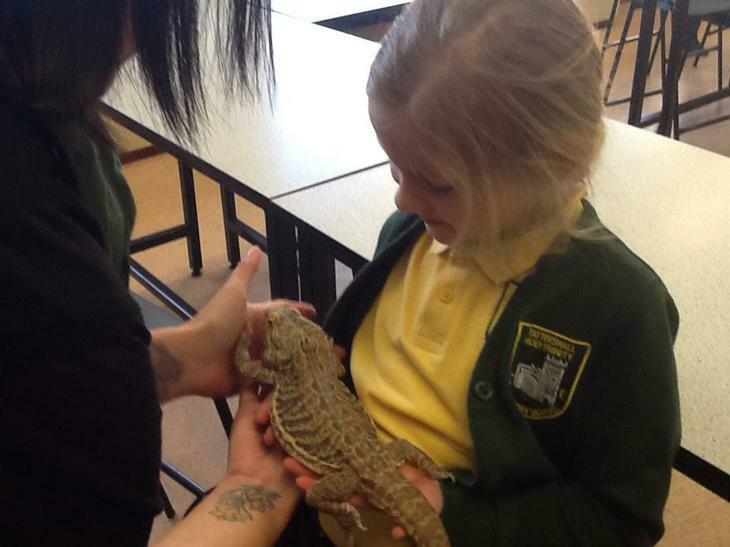 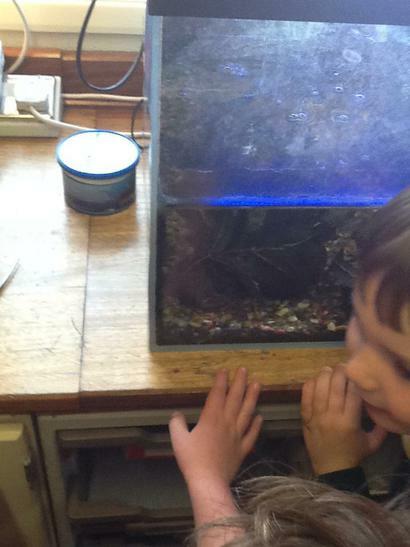 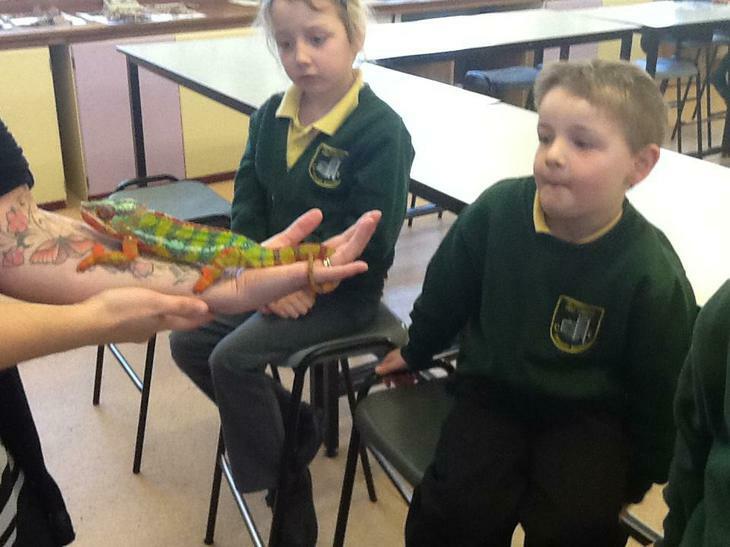 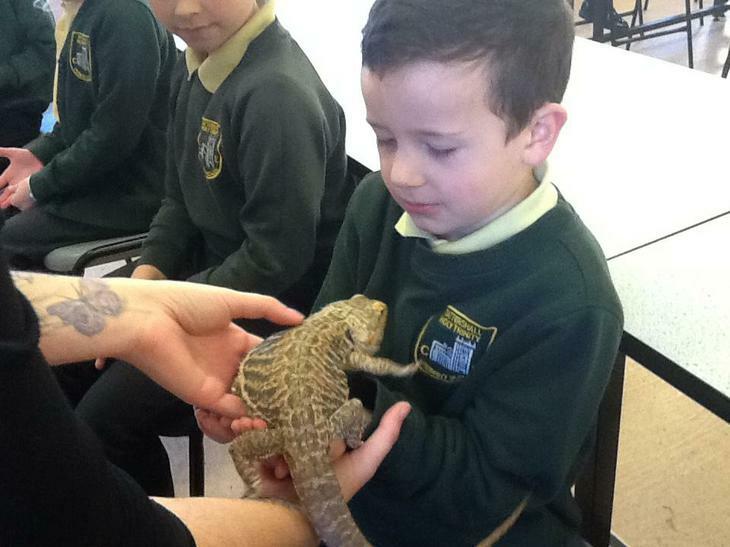 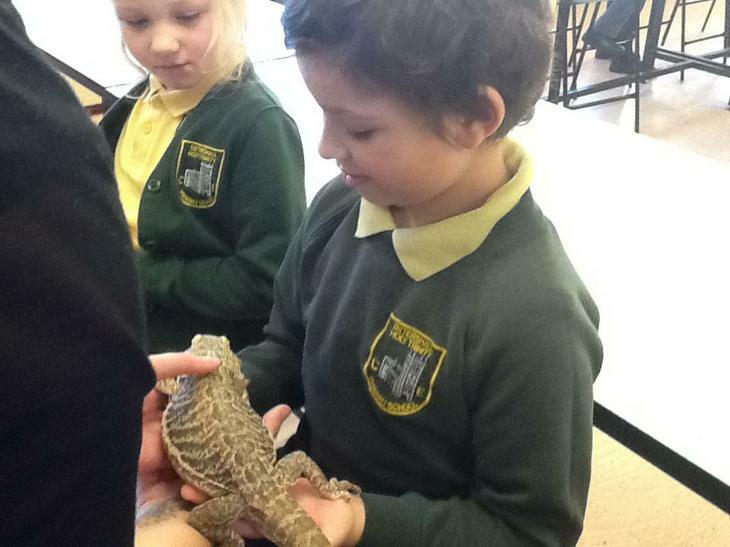 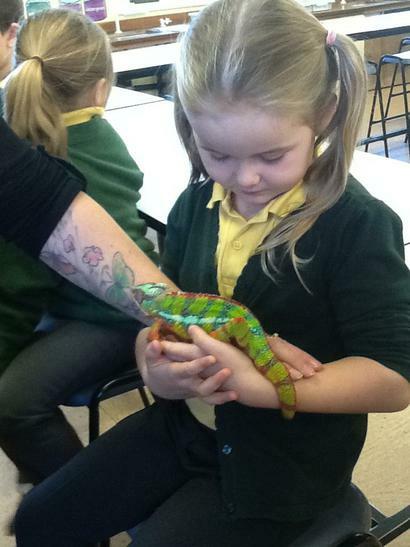 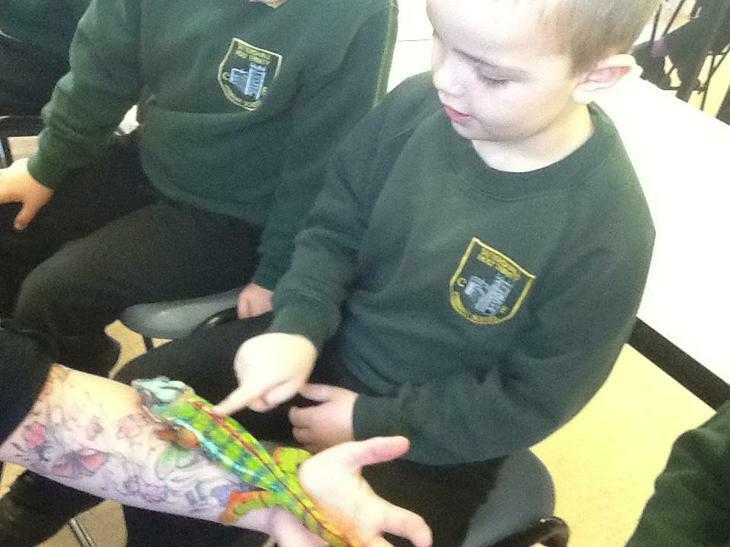 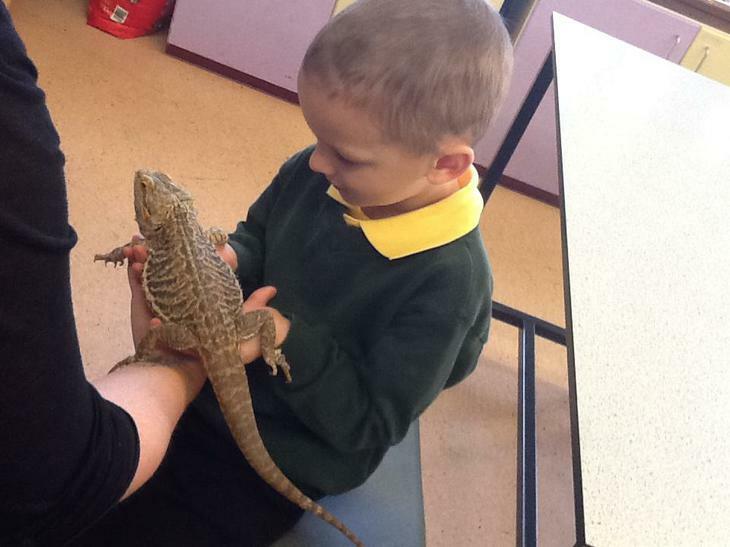 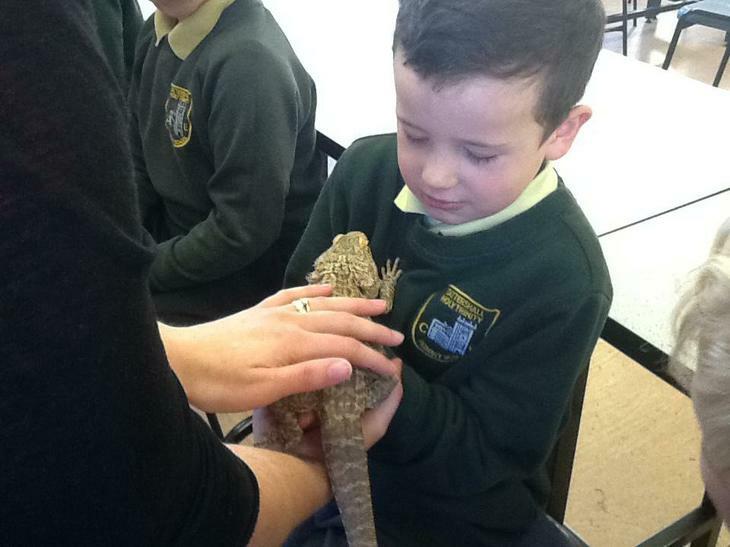 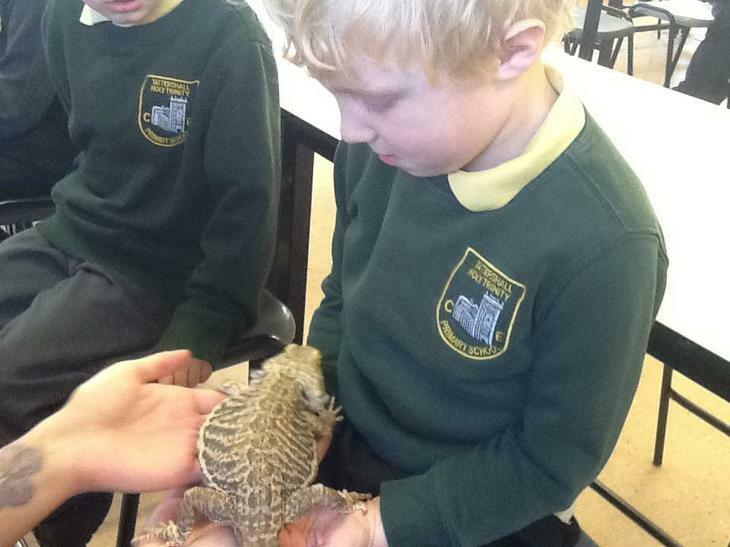 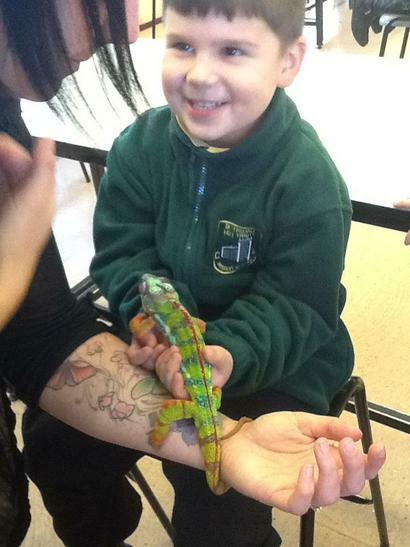 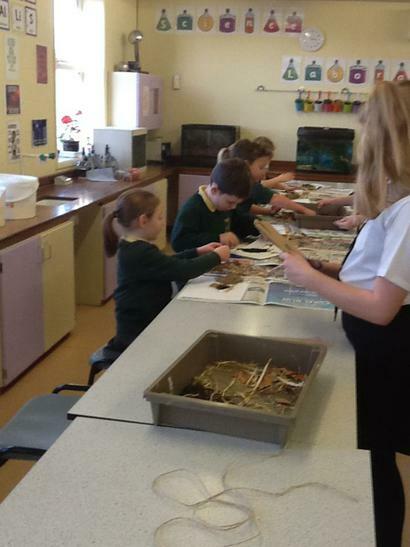 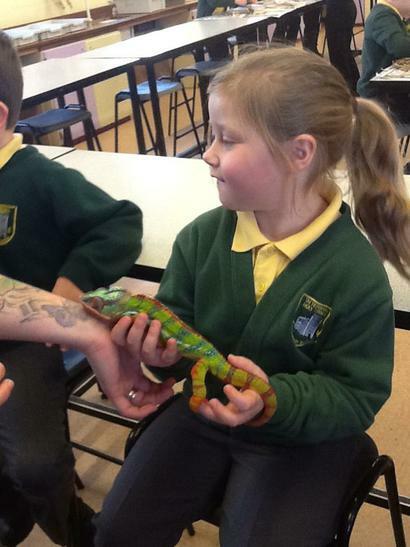 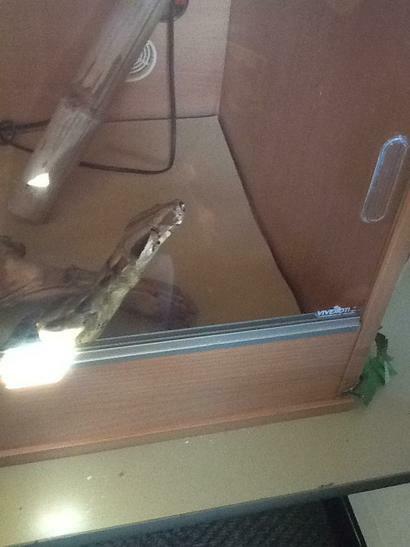 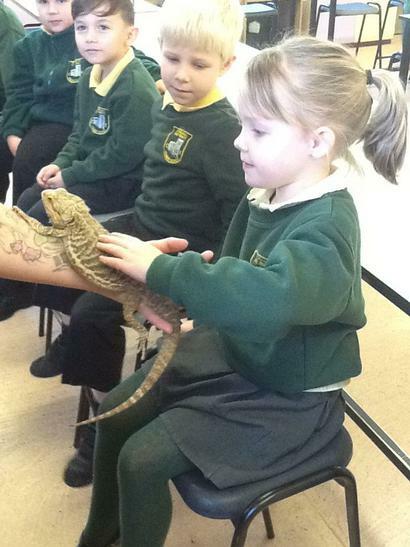 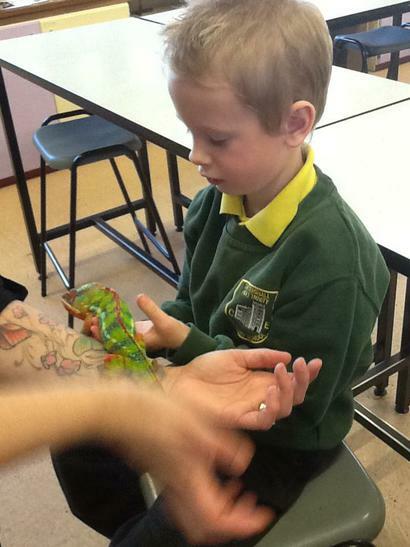 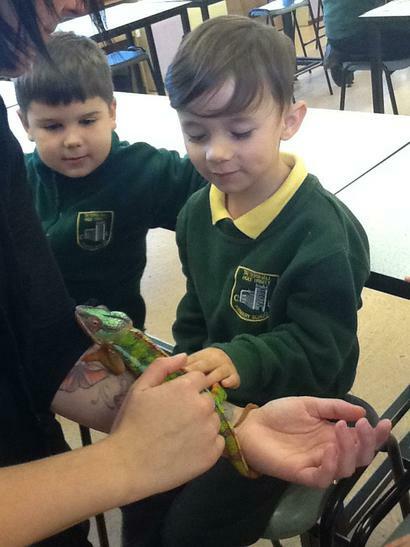 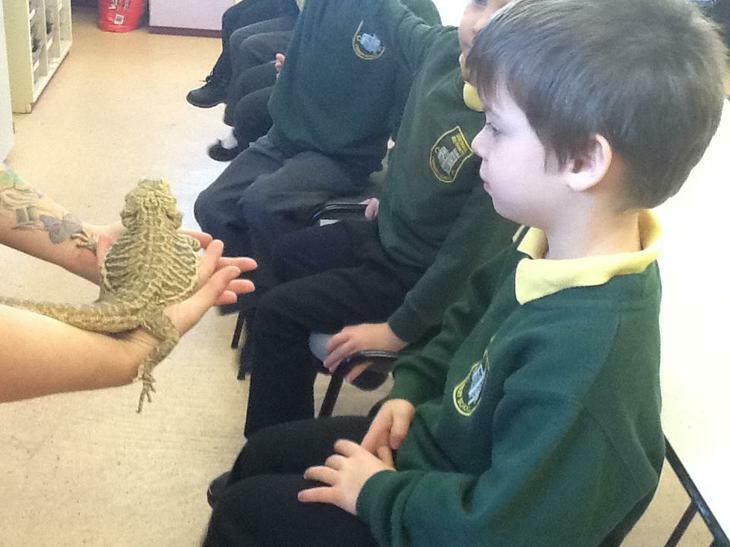 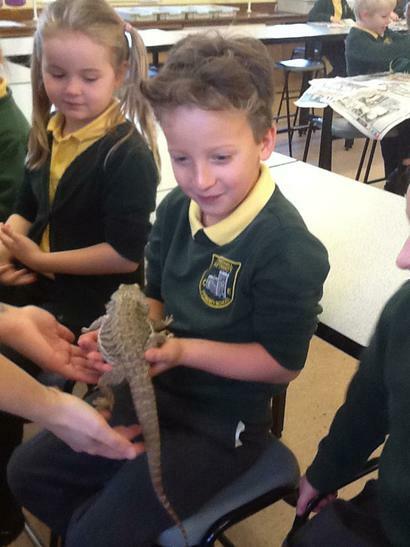 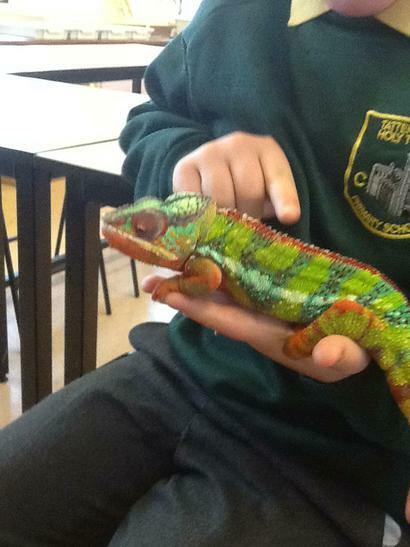 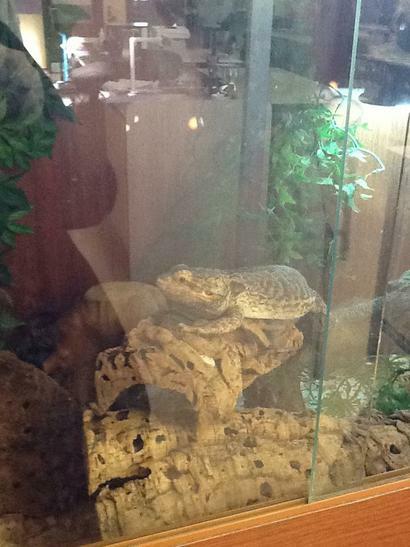 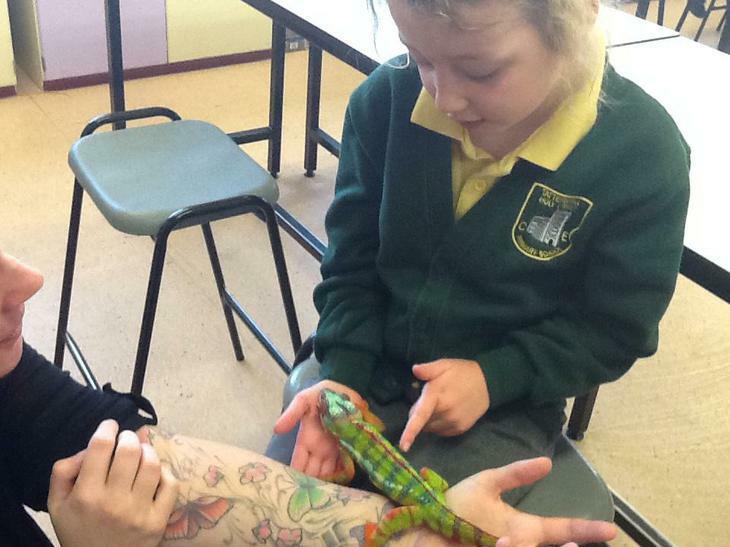 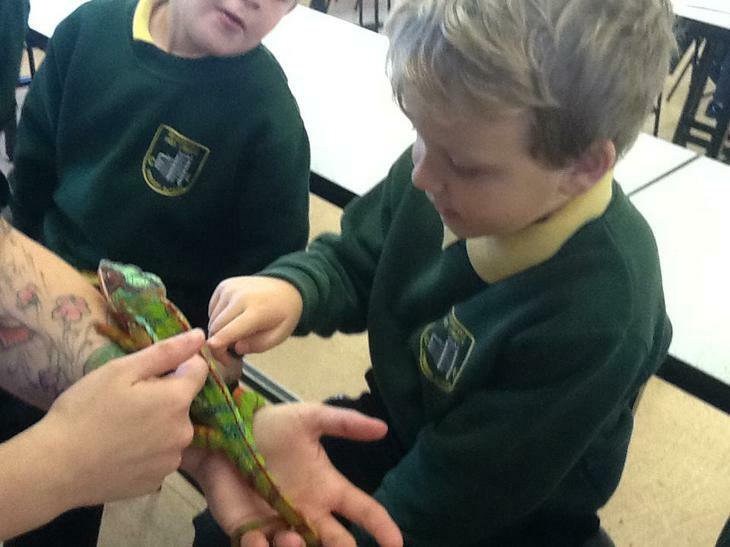 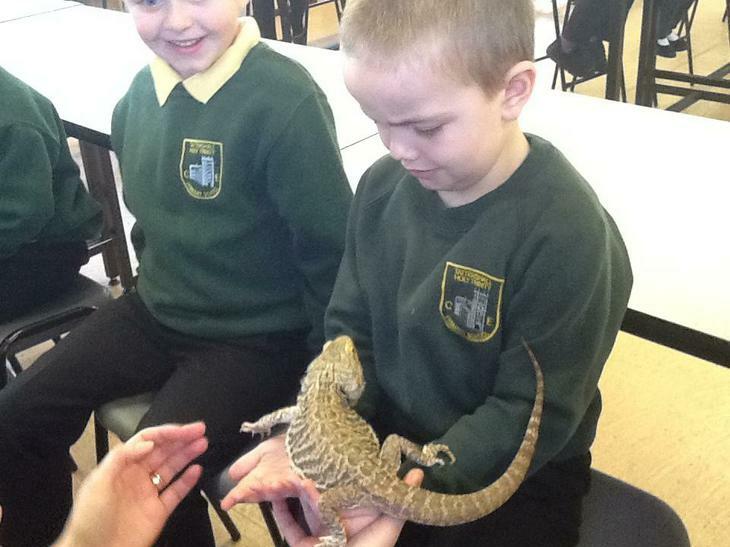 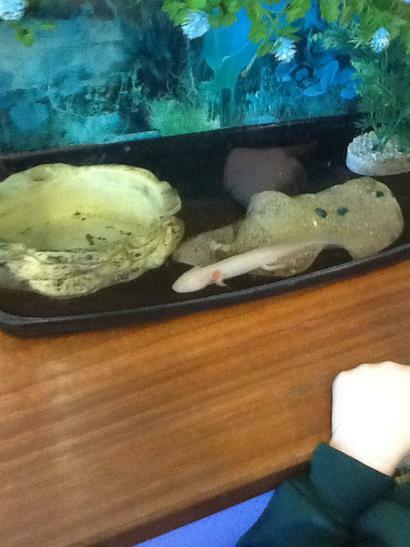 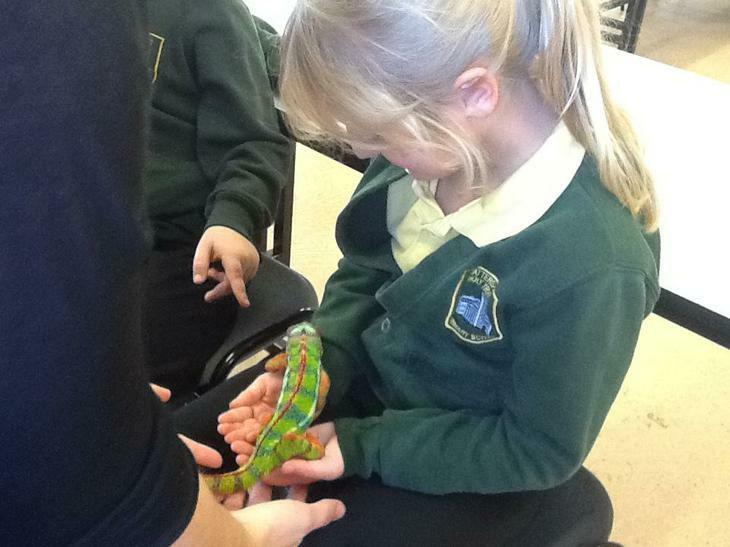 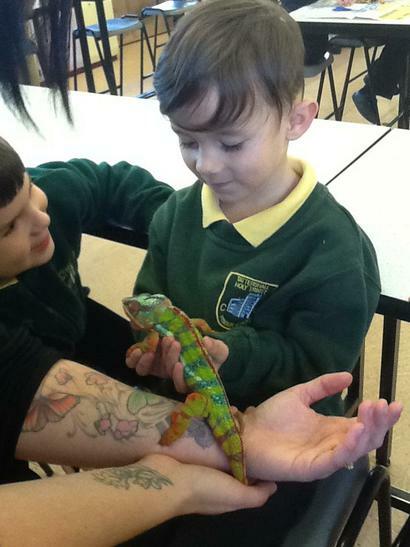 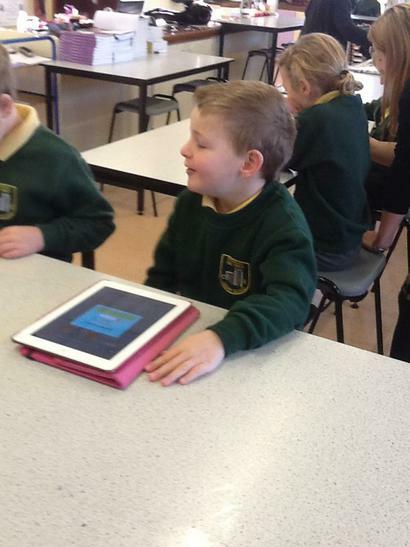 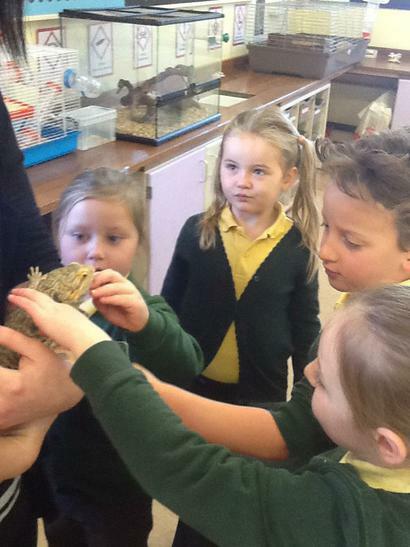 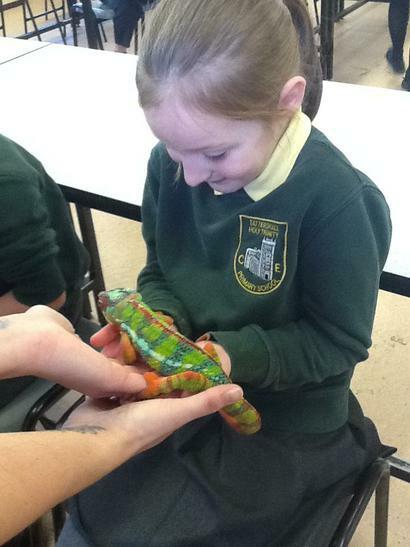 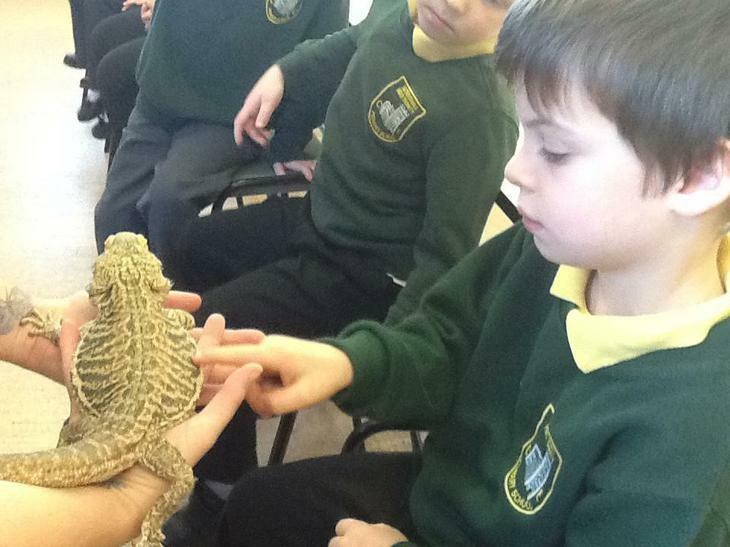 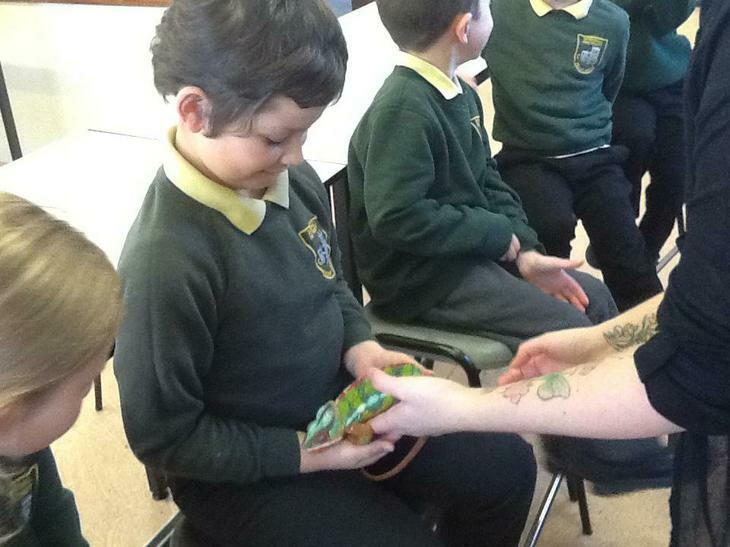 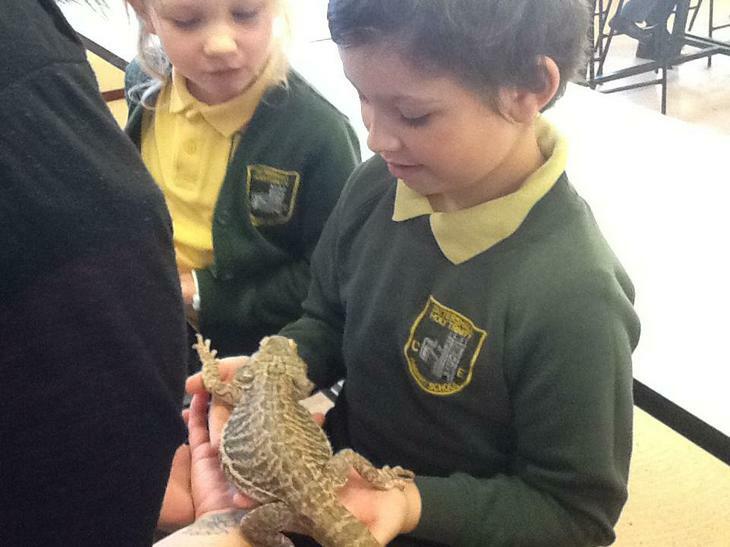 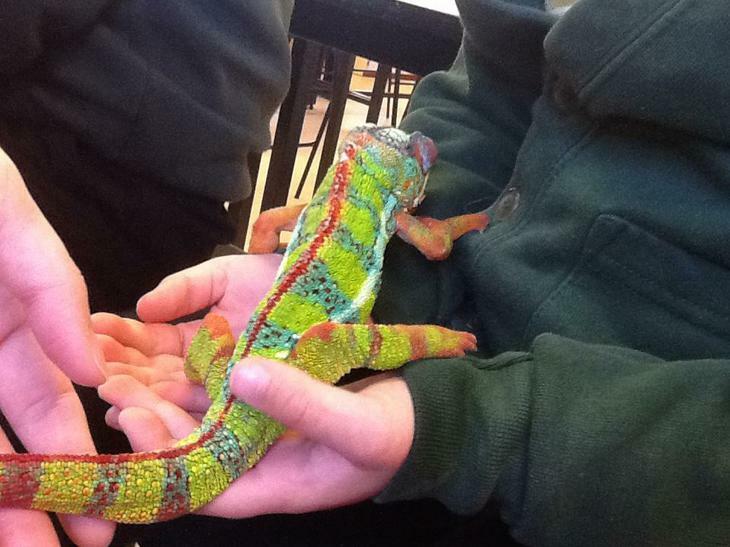 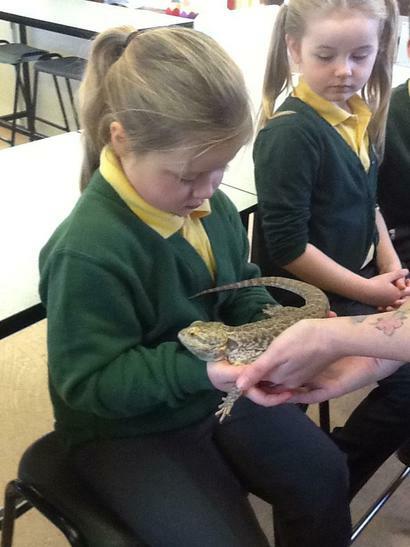 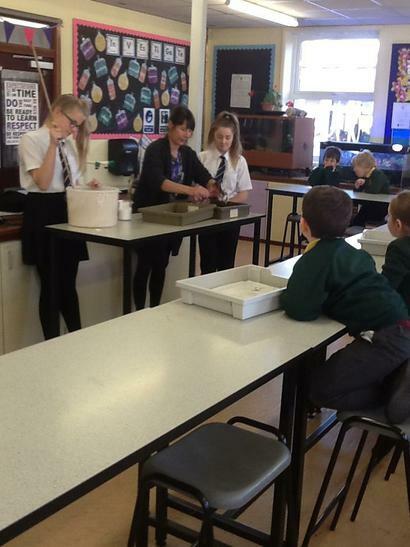 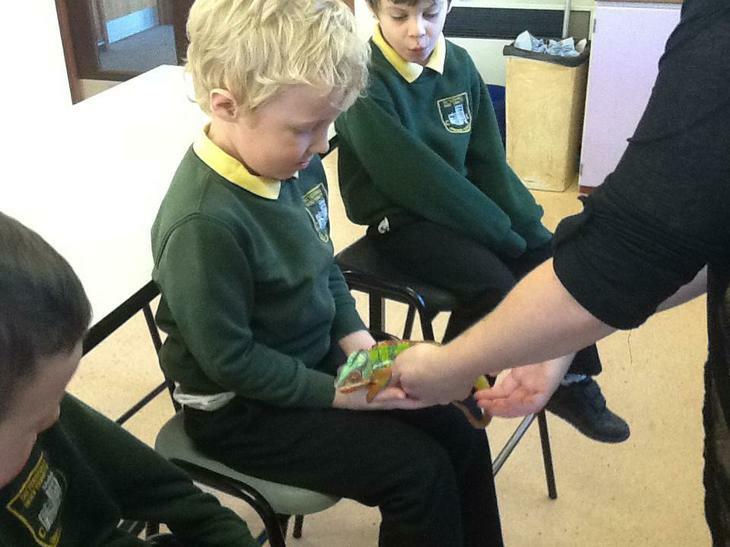 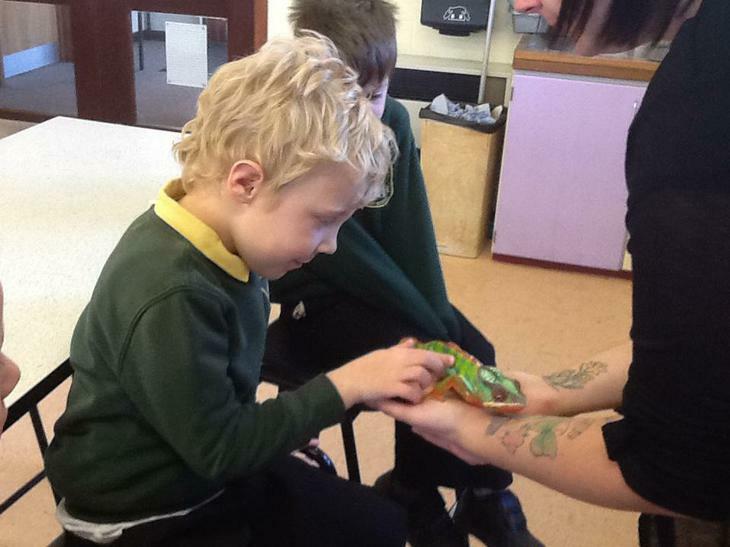 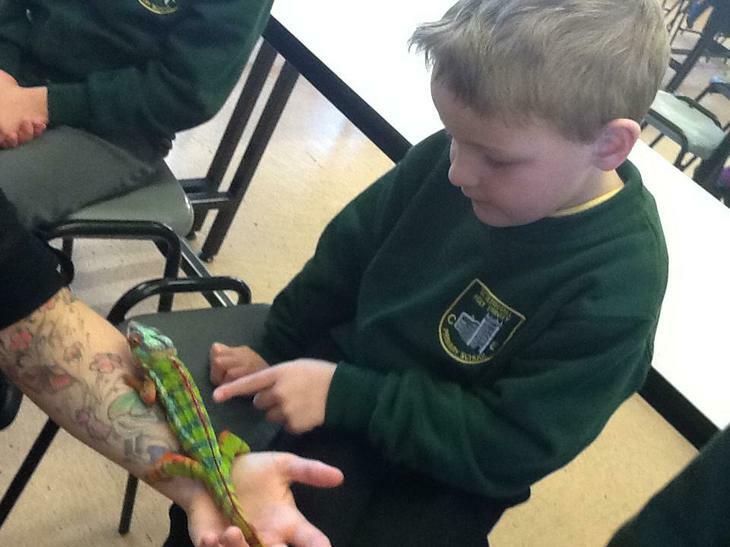 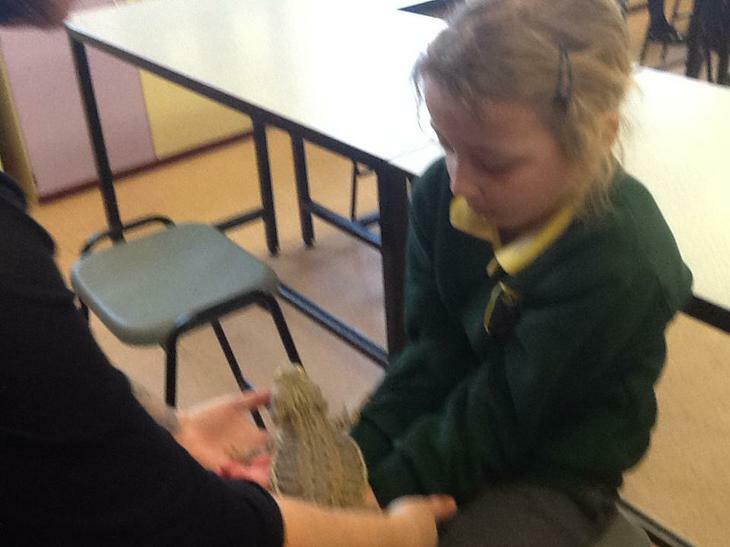 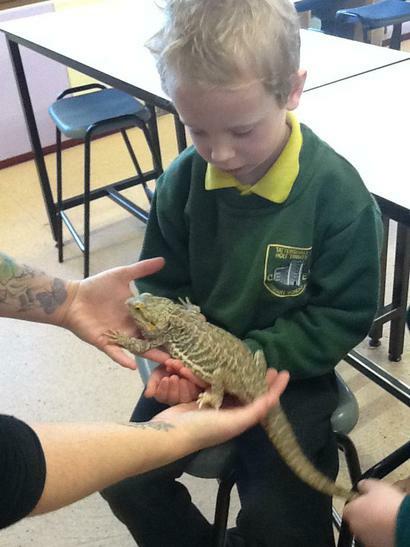 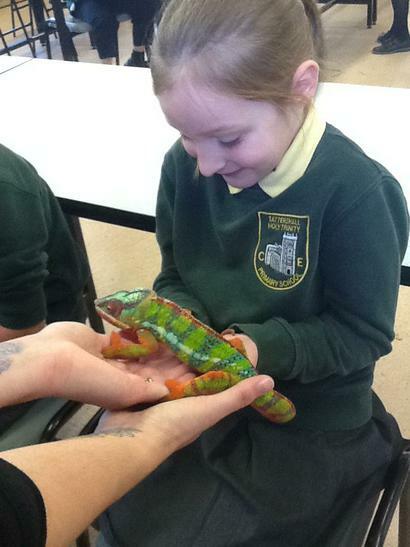 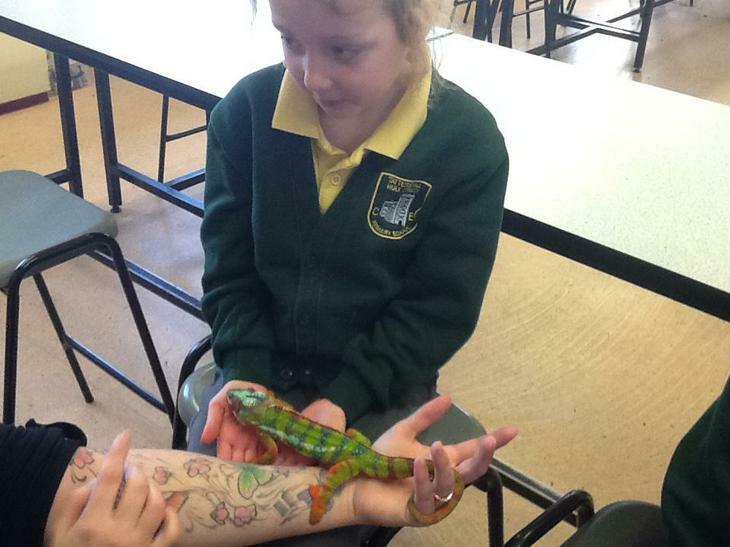 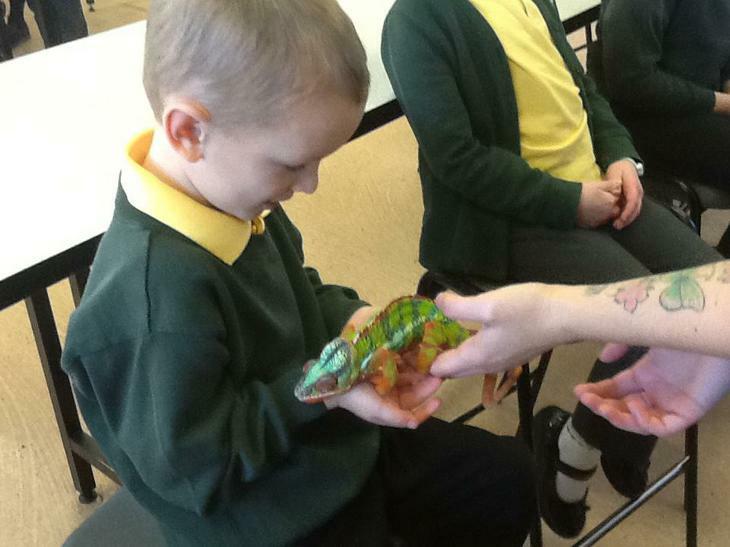 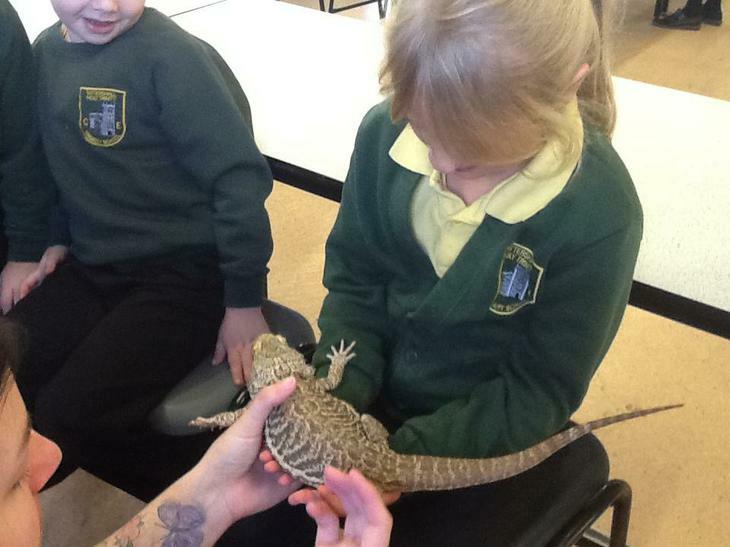 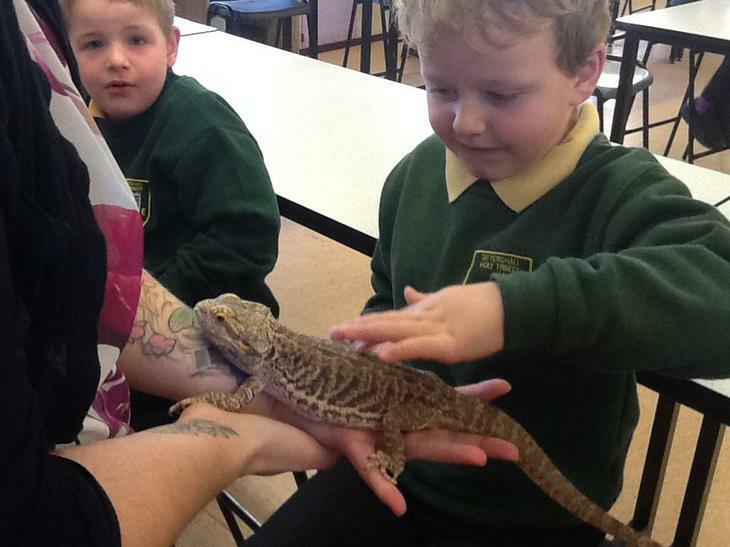 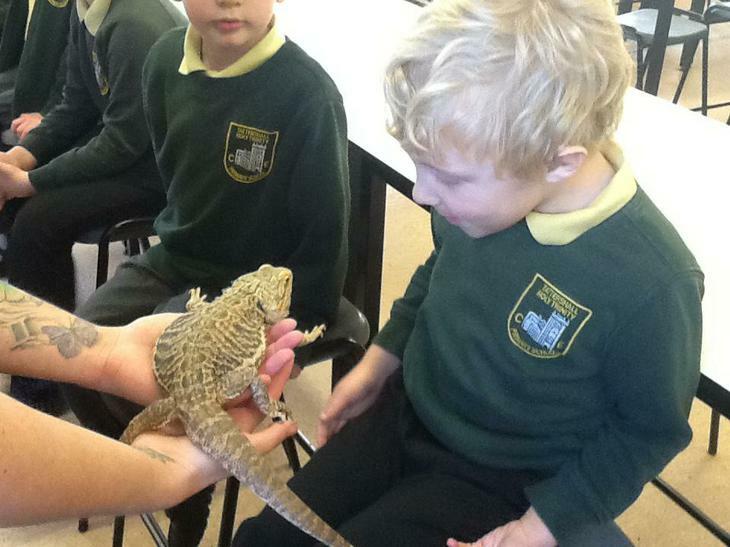 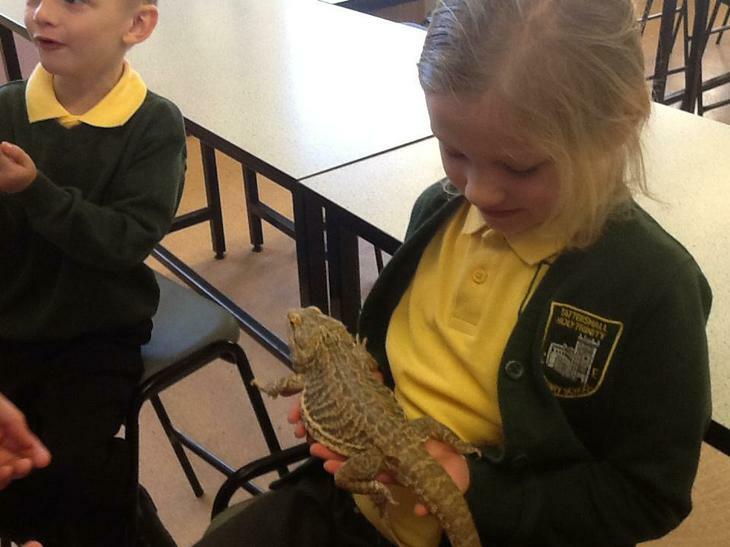 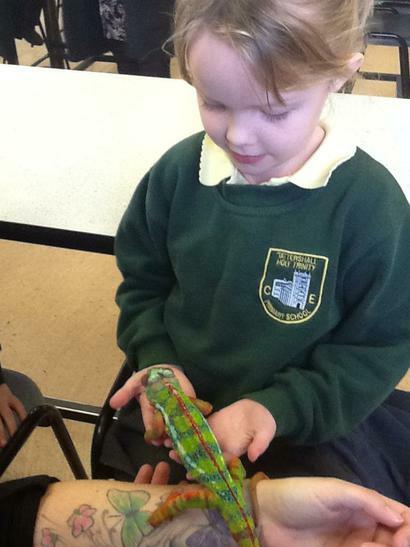 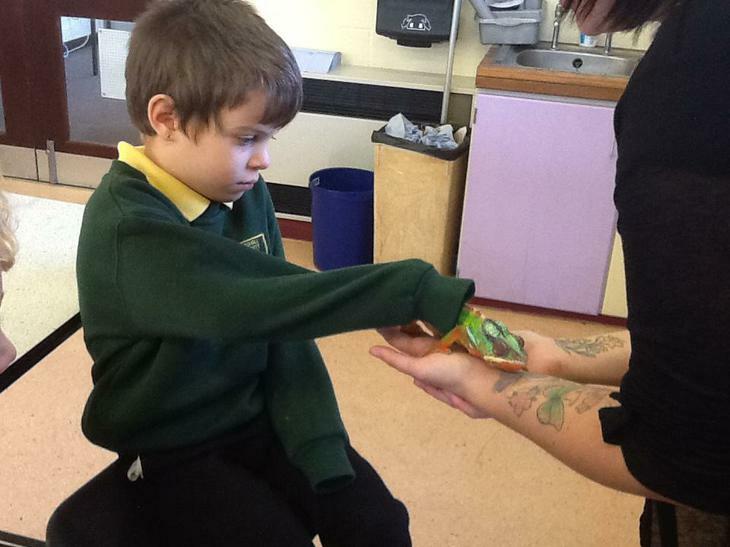 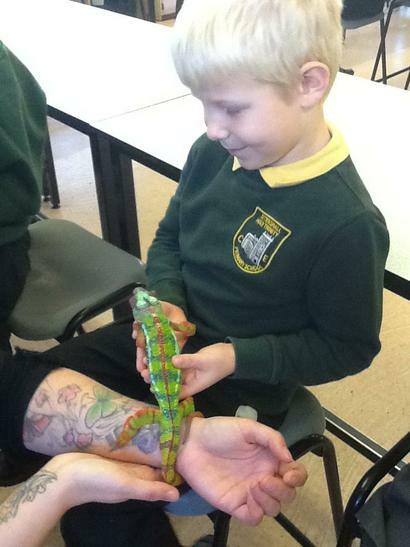 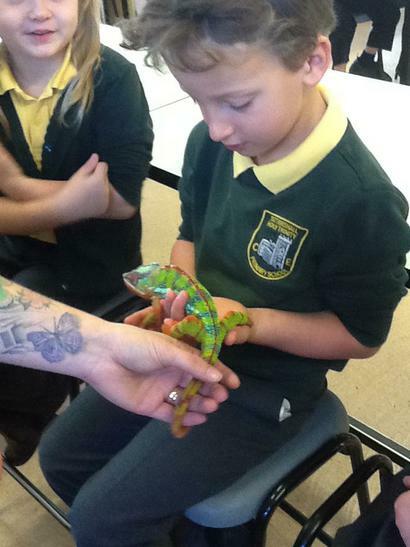 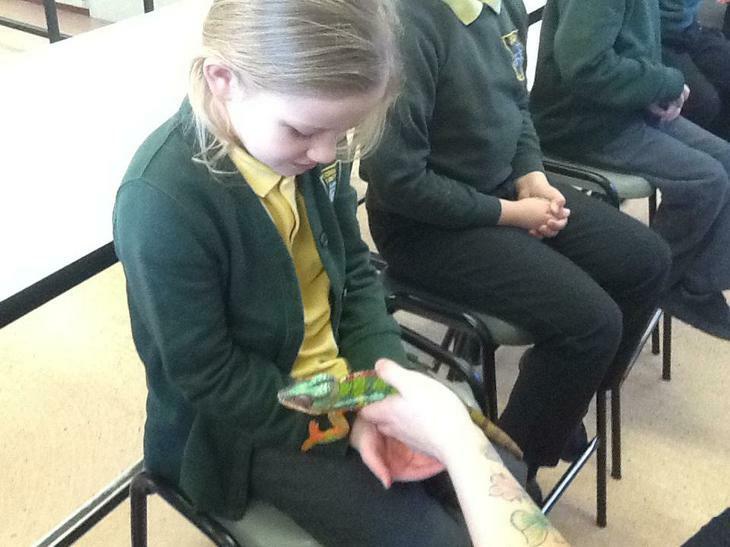 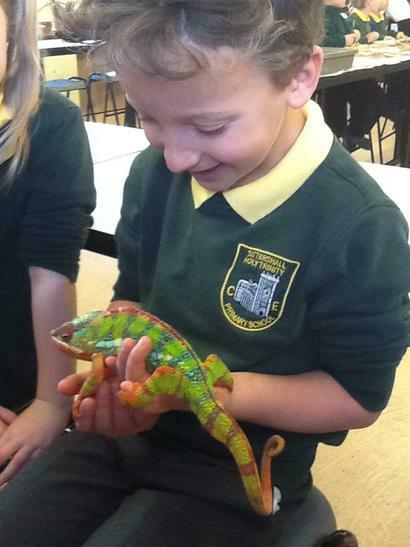 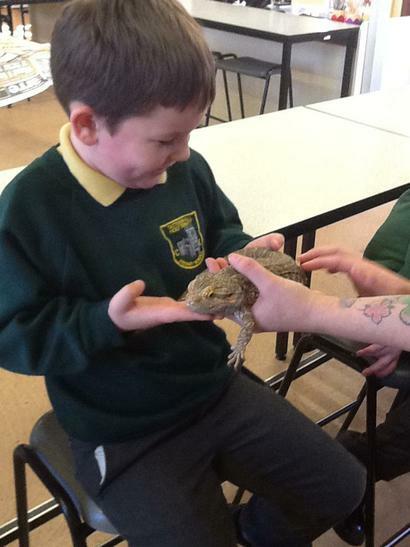 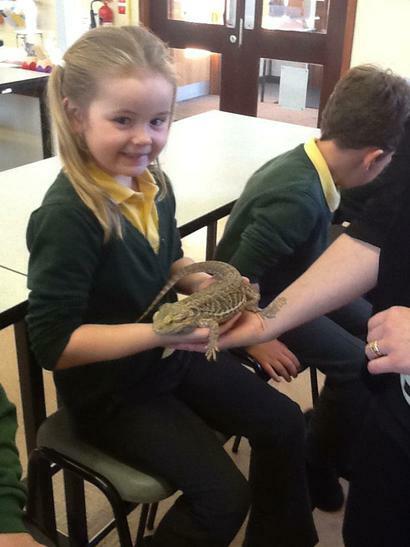 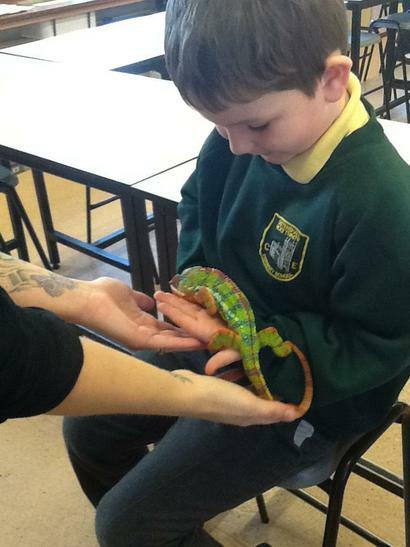 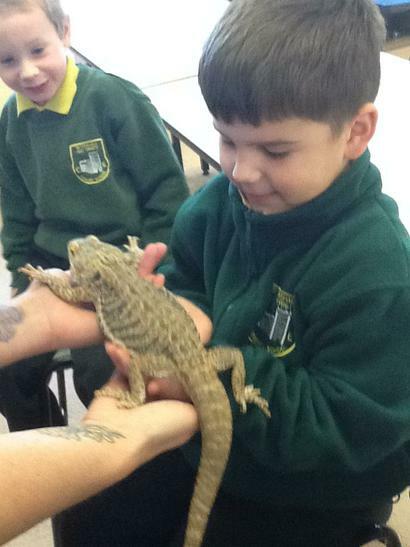 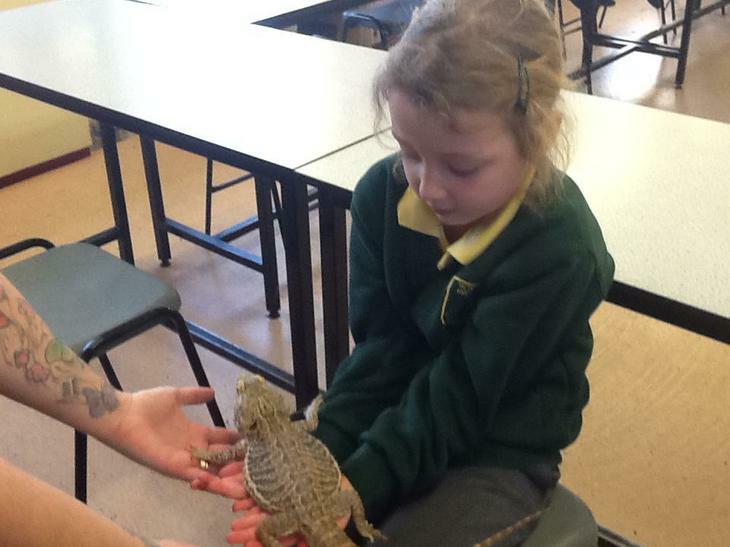 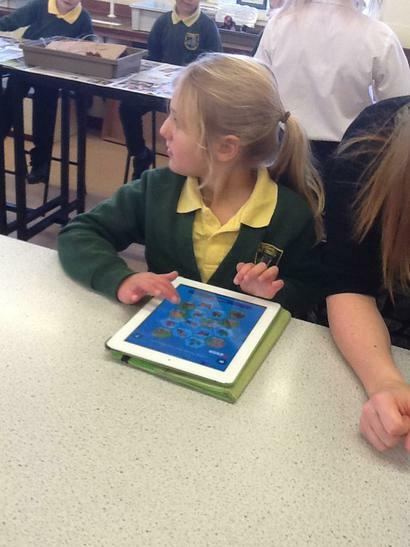 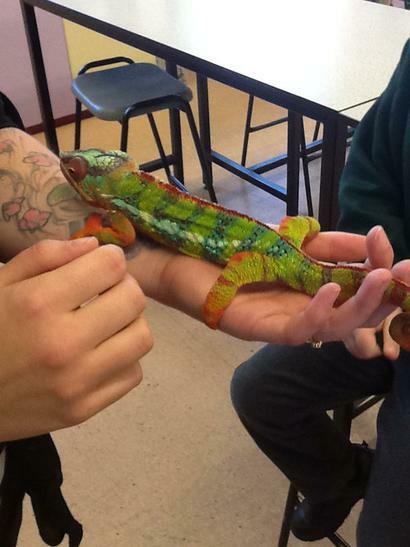 We have learnt about amphibians, birds, fish, insects, reptiles and mammals. 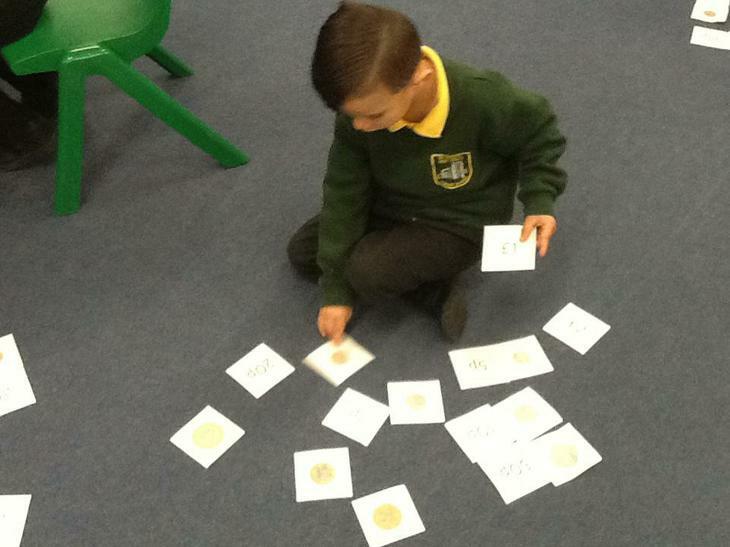 We then sorted different animals into these categories. 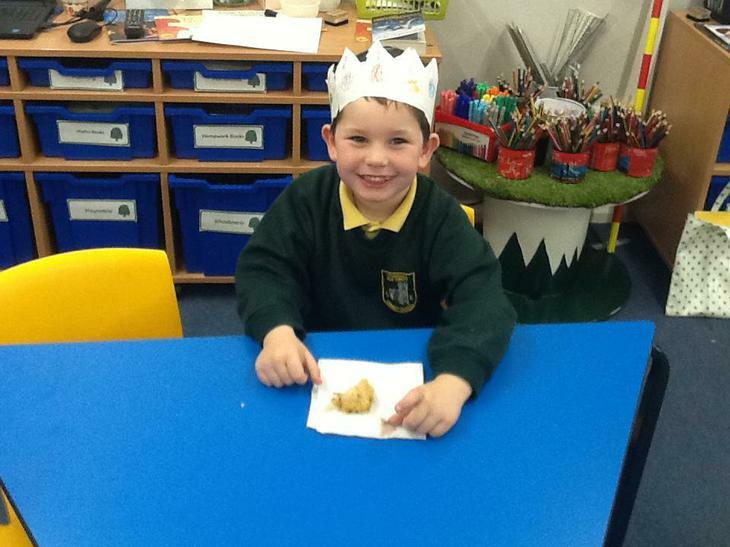 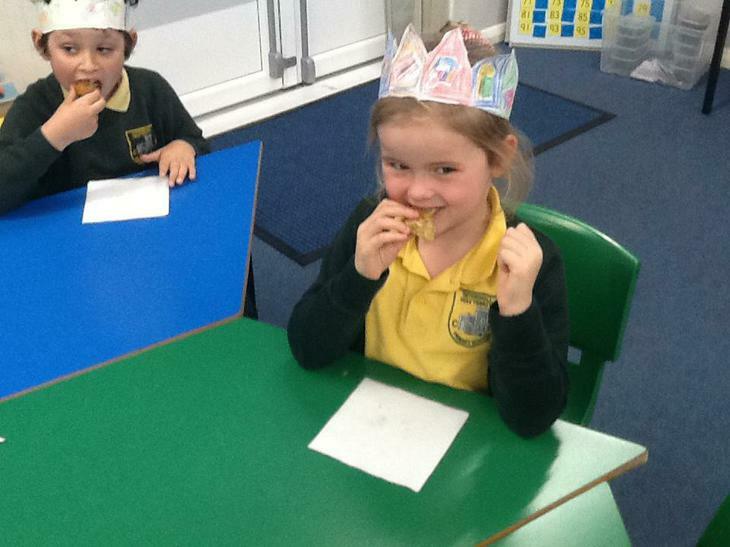 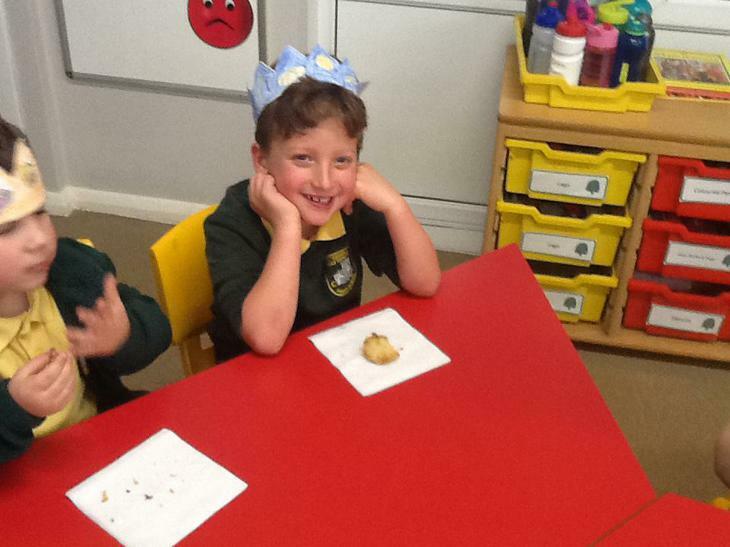 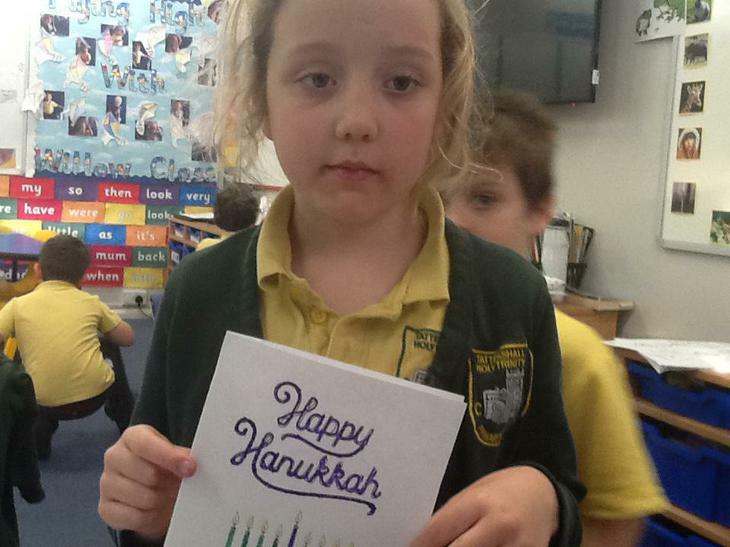 To finish off our work on Hanukkah this week we had a Hanukkah party. 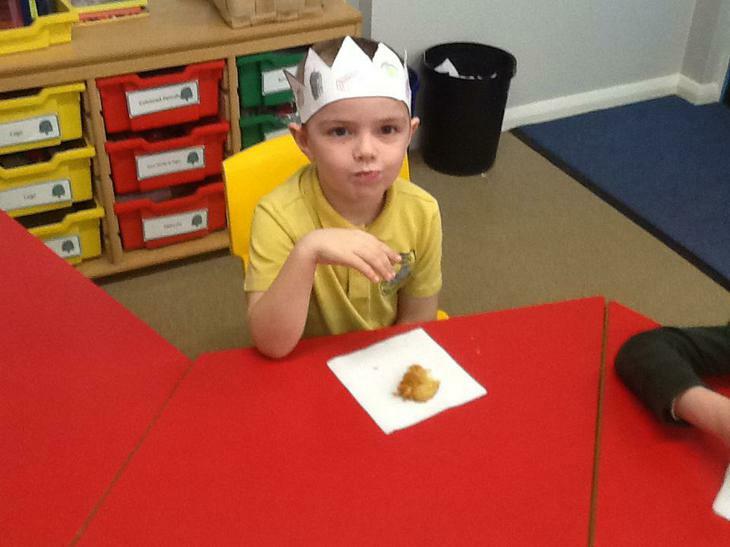 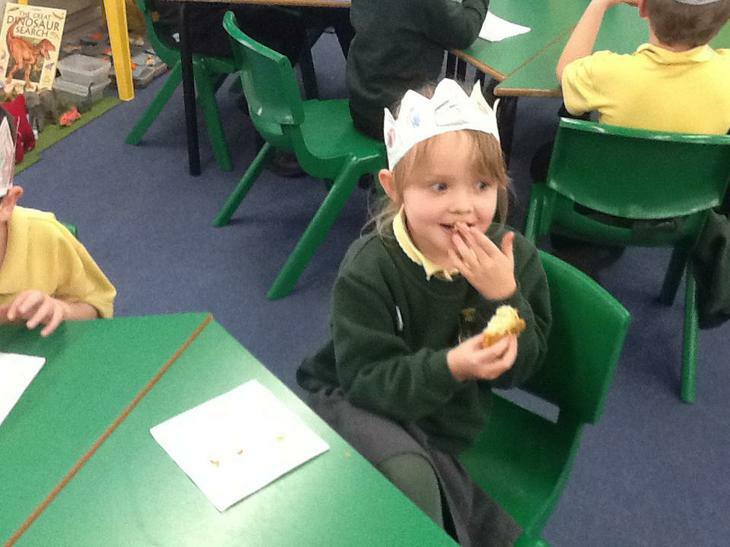 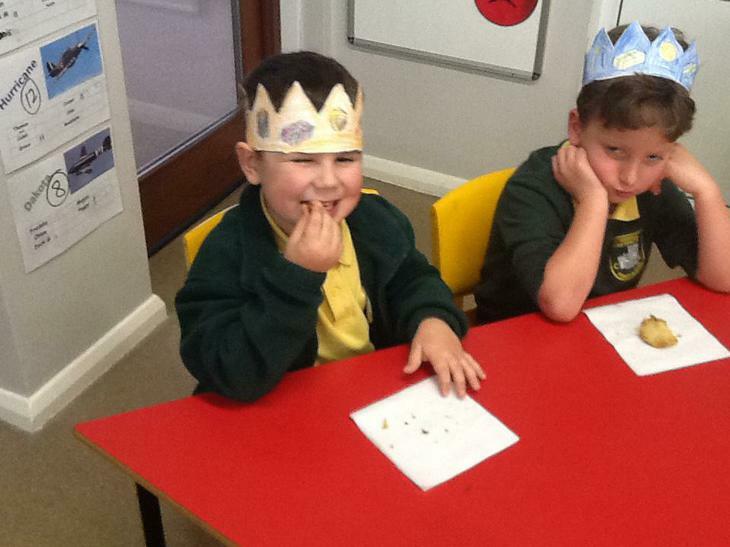 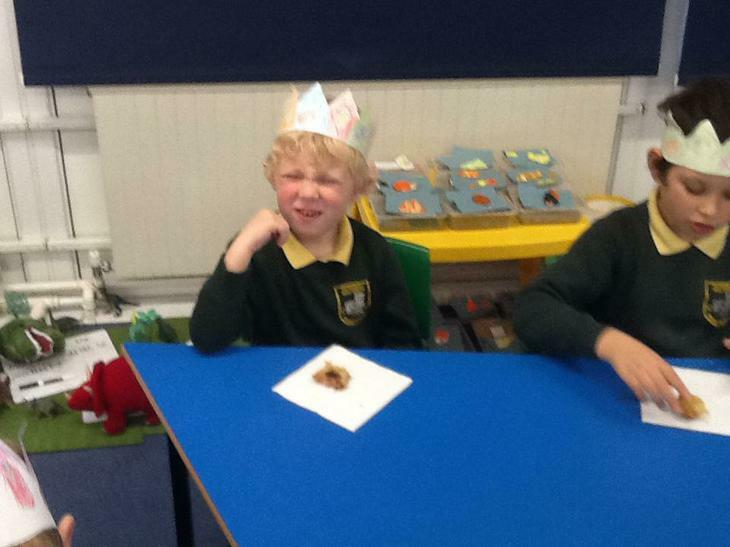 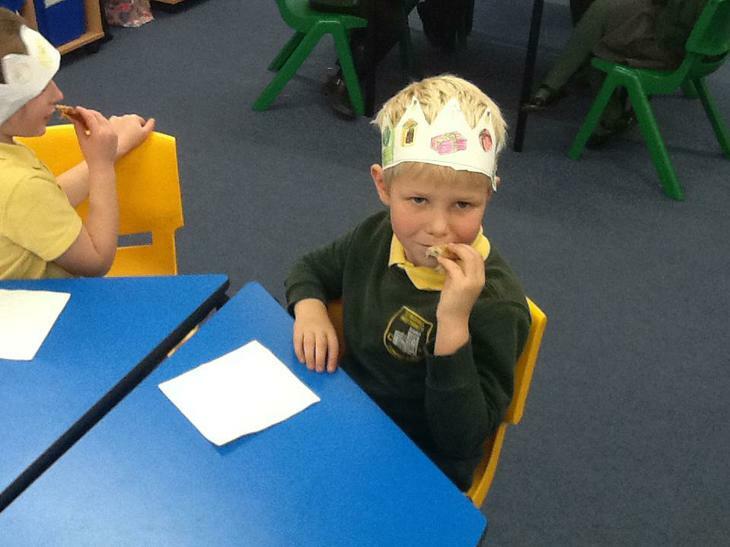 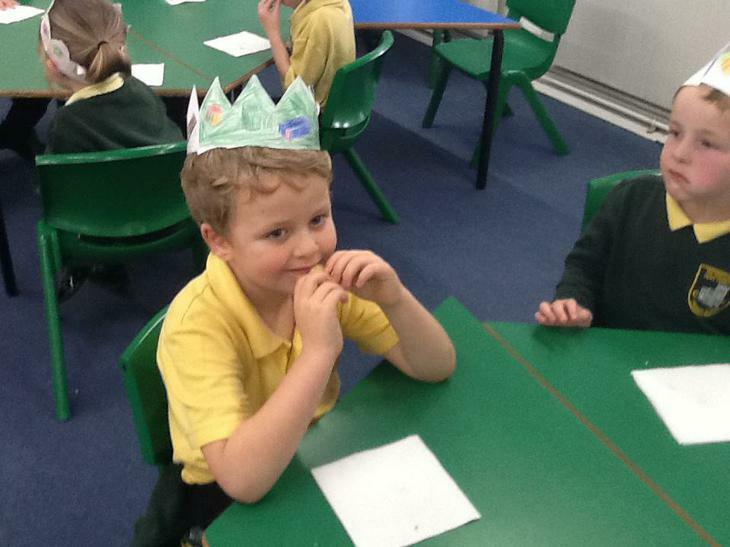 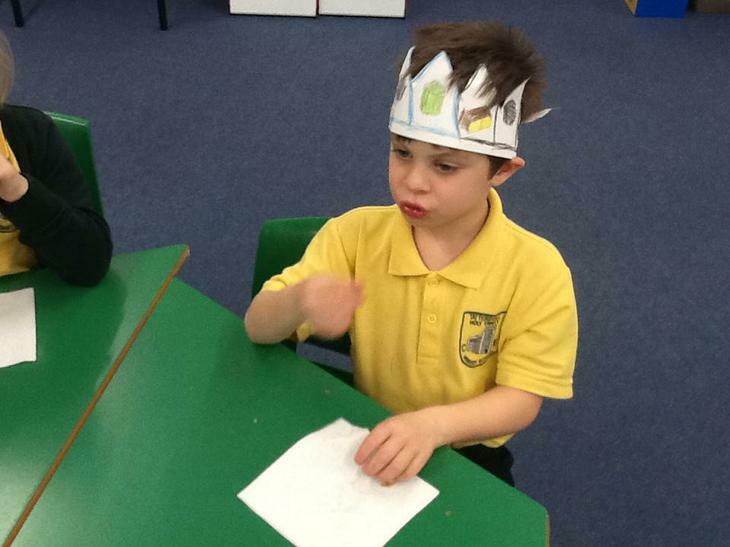 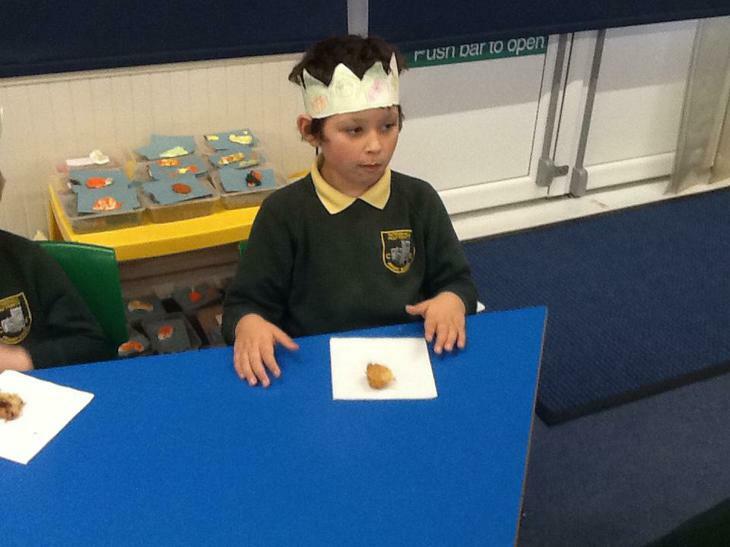 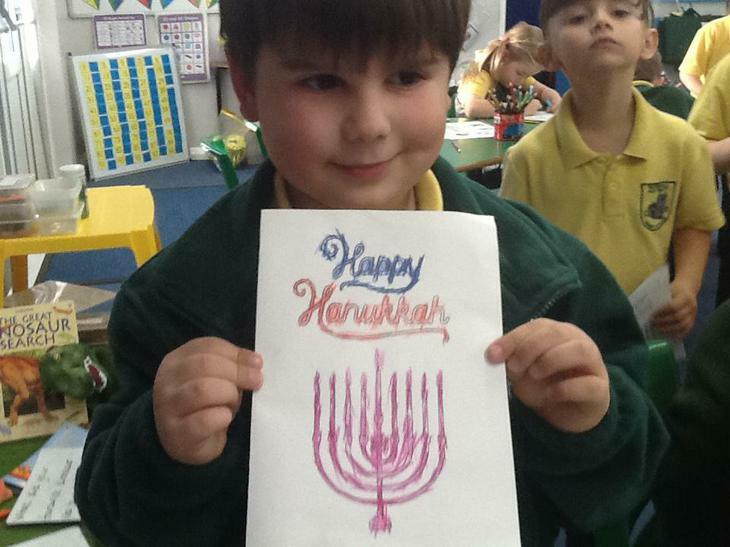 We made party hats with symbols of Hanukkah on and then tried latkes. 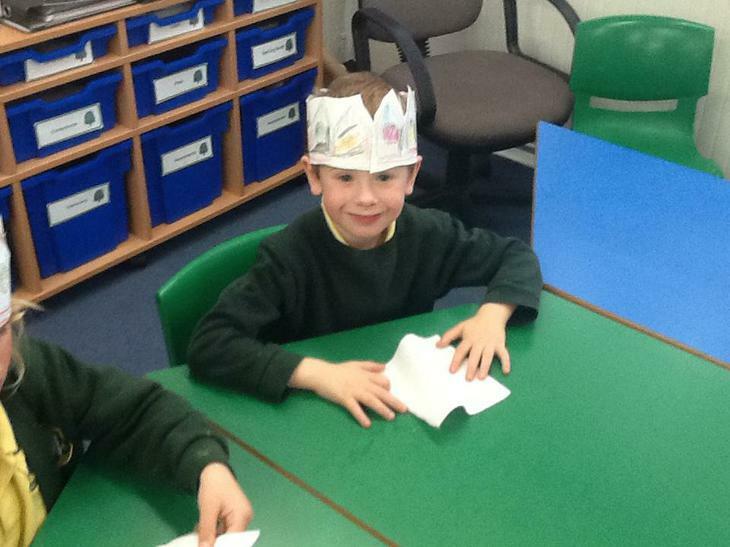 It was great fun learning about different festivals. 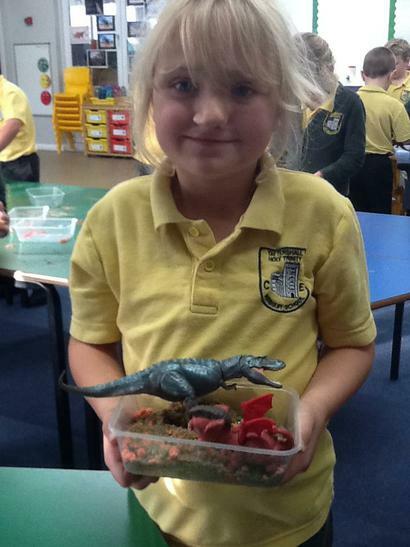 We are all loving our dinosaur topic and have had great fun this week learning facts about these fantastic creatures. 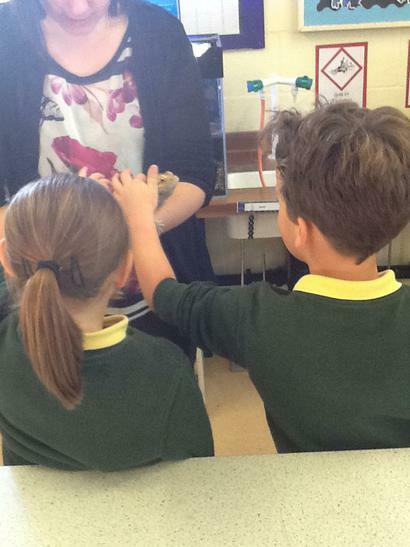 We even used the school guinea pigs to help us compare body parts between humans, dinosaurs and guinea pigs! 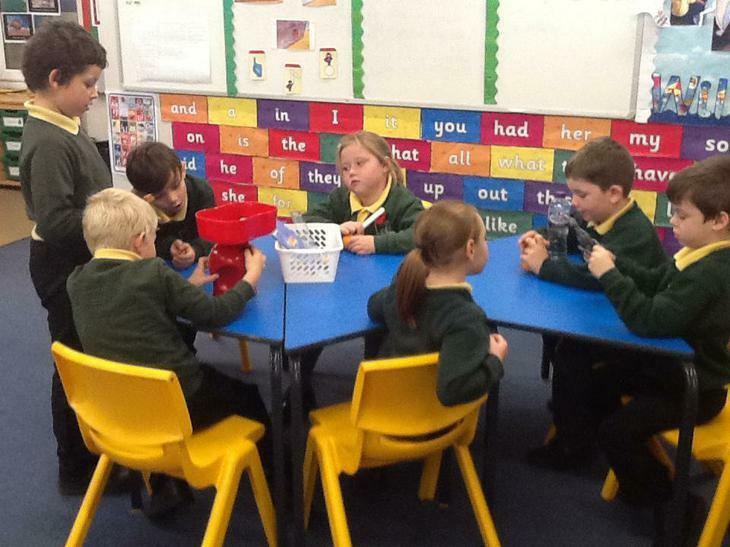 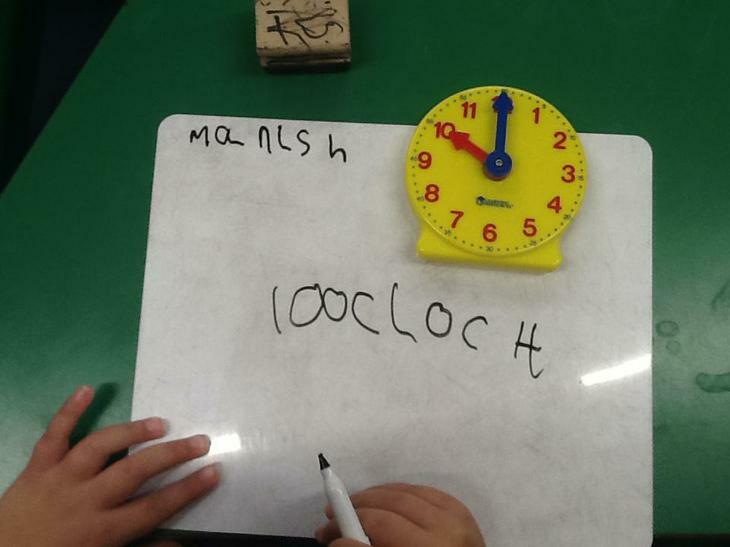 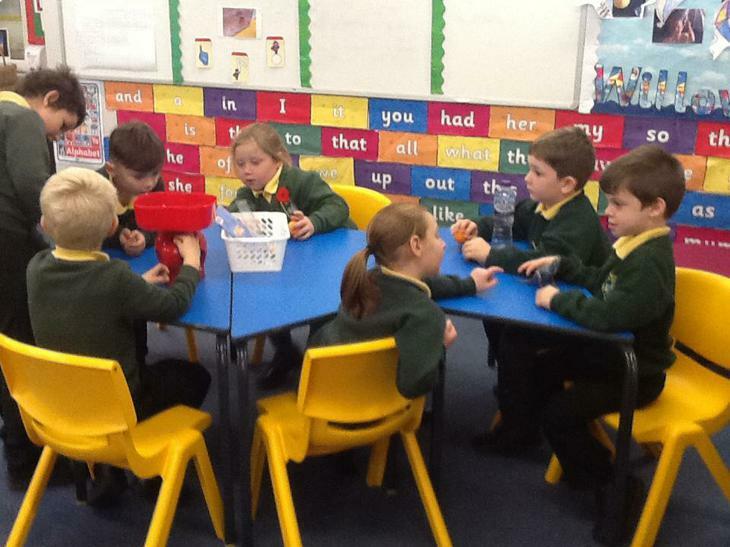 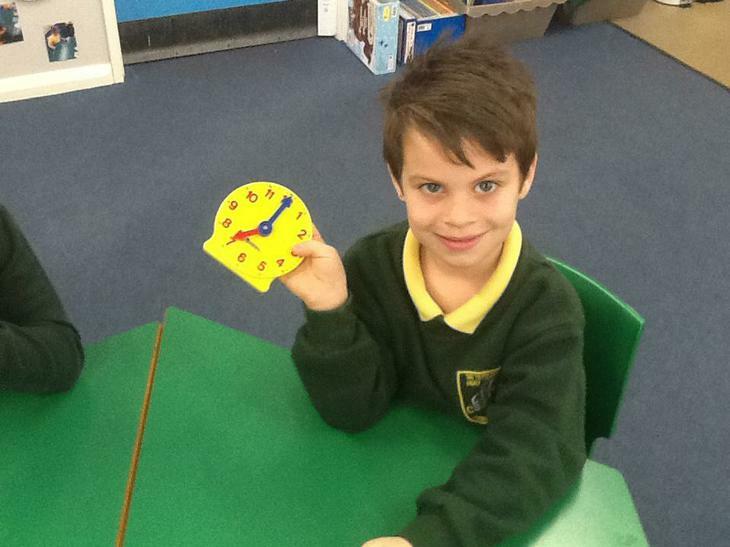 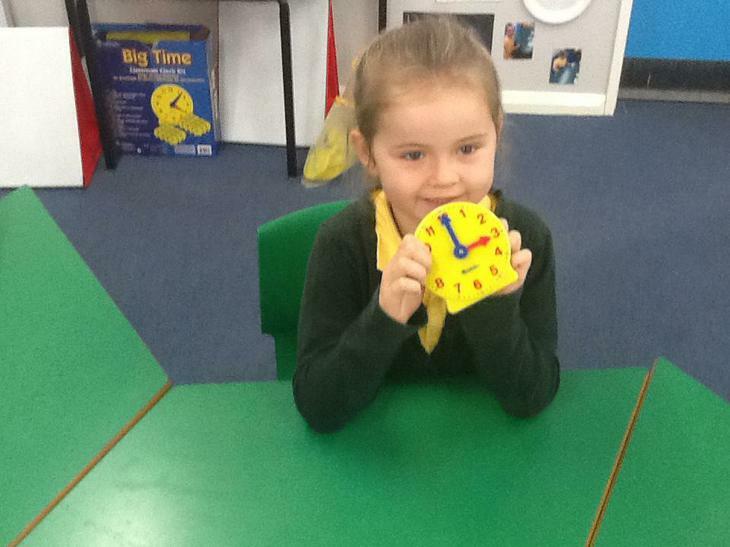 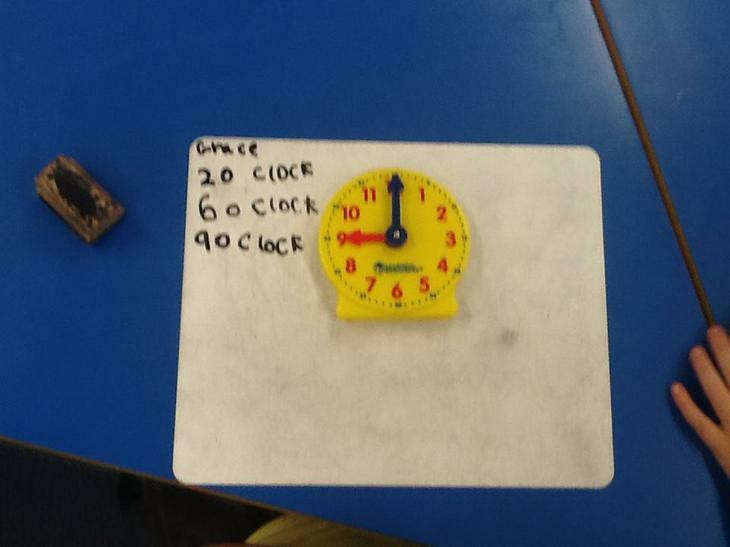 In maths this week we have been learning more about time. 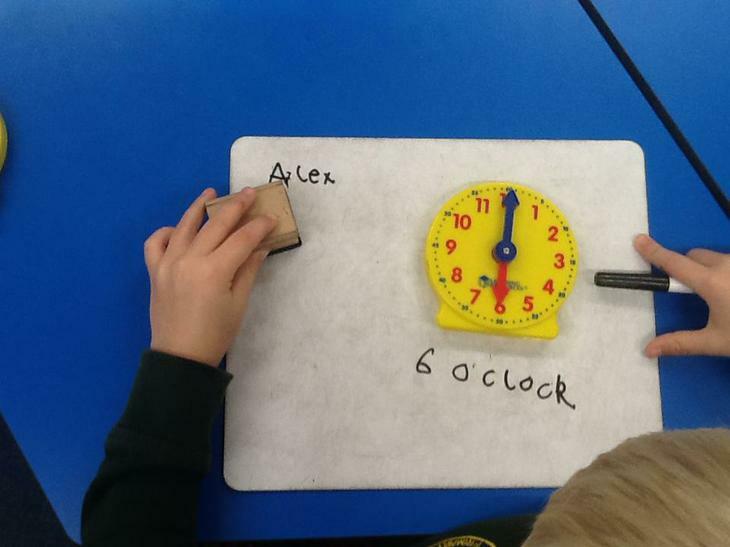 We have focussed on o'clock times and where the hands need to be for it to be an o'clock time. 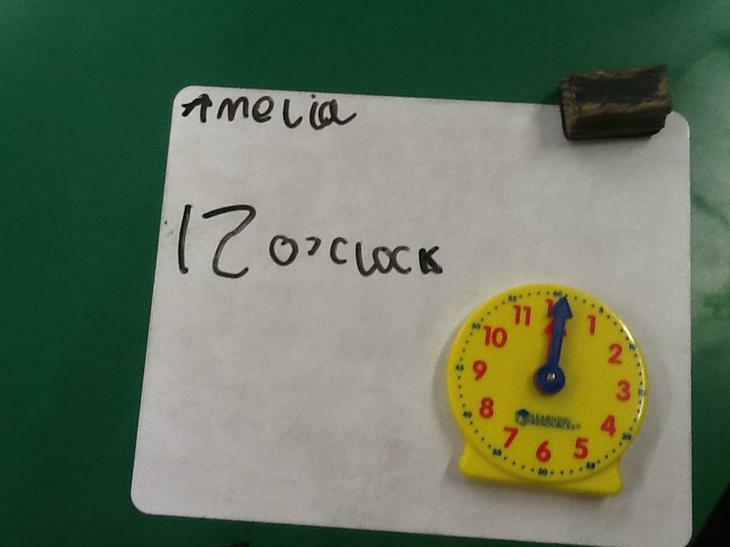 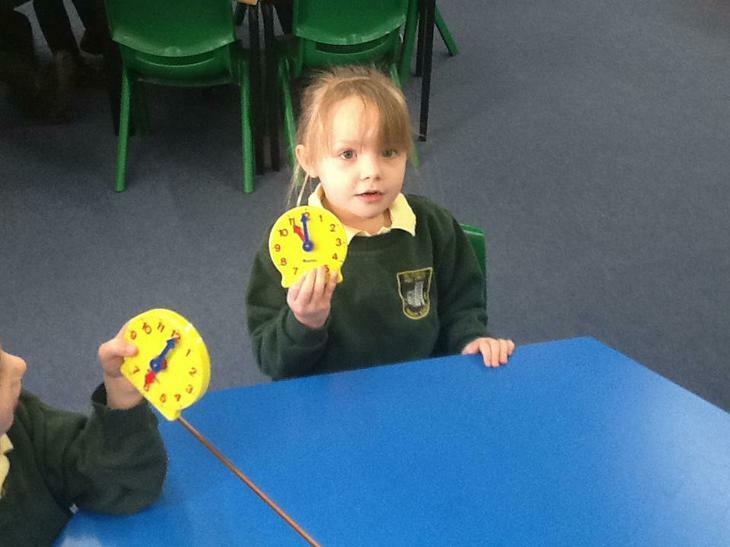 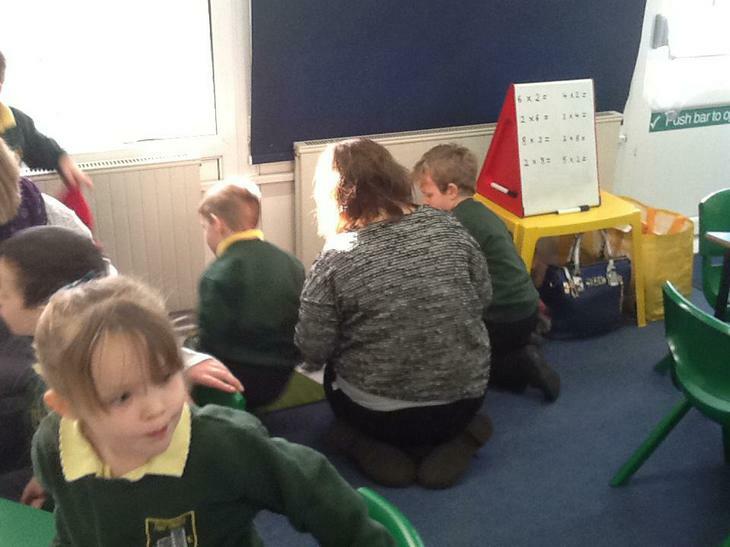 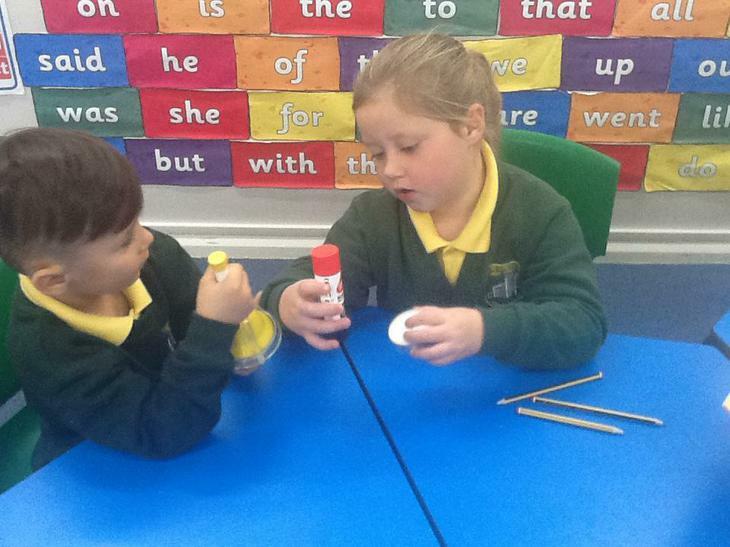 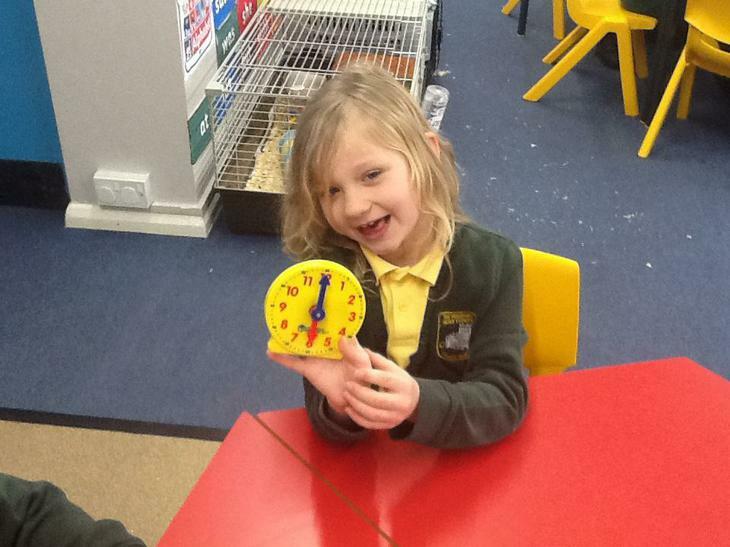 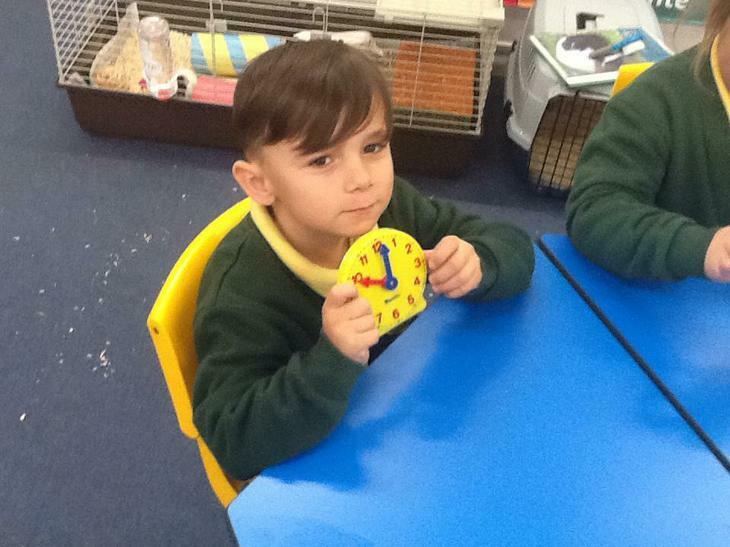 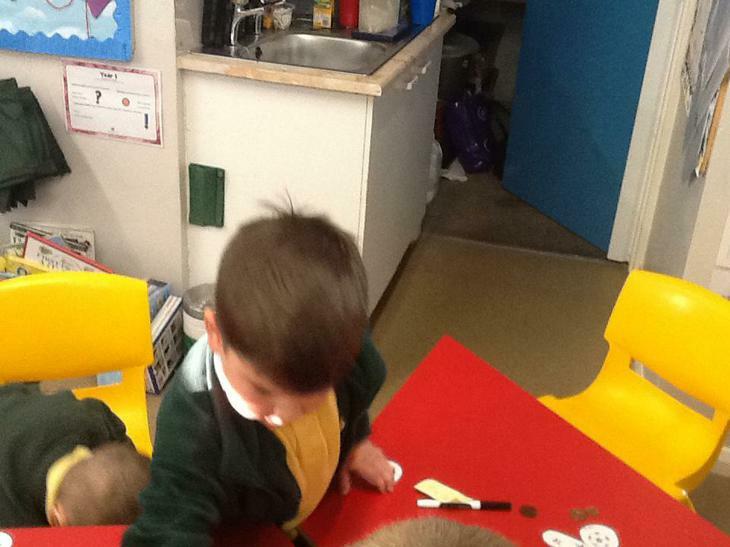 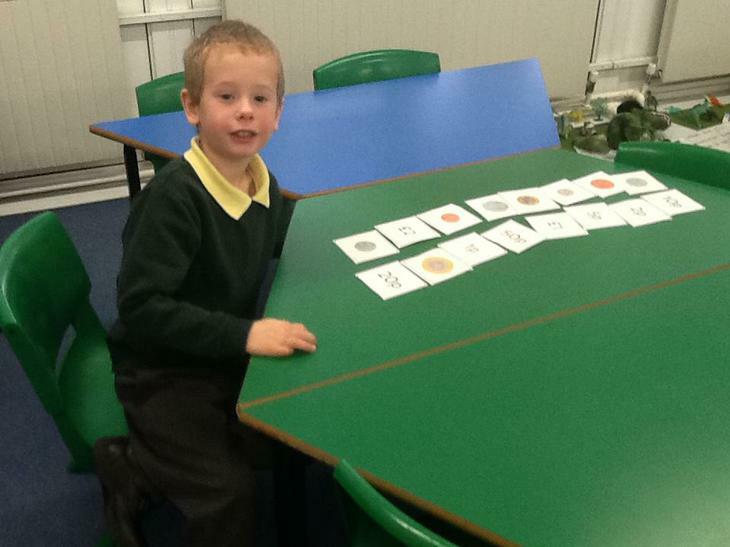 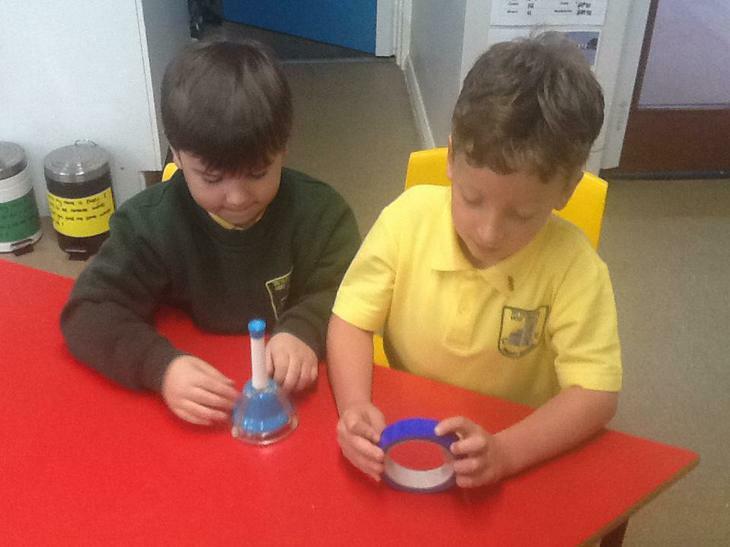 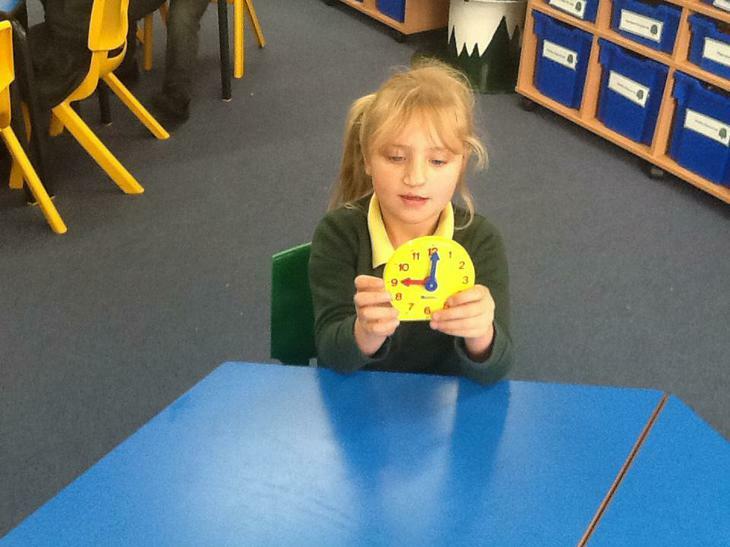 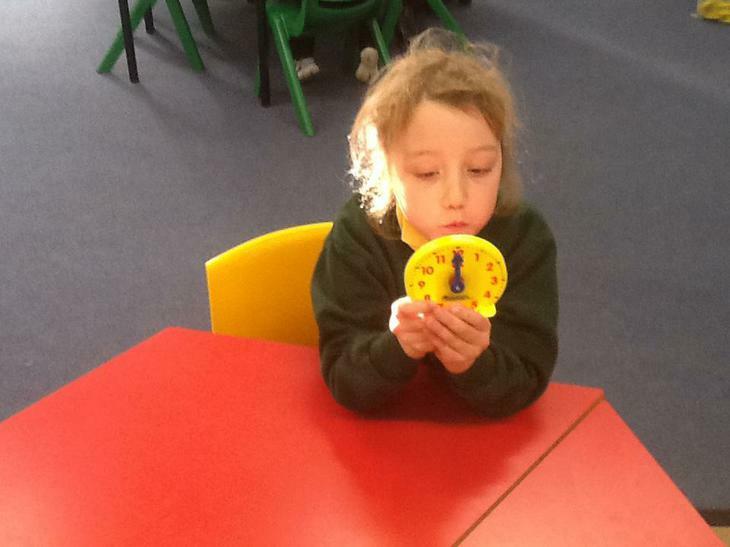 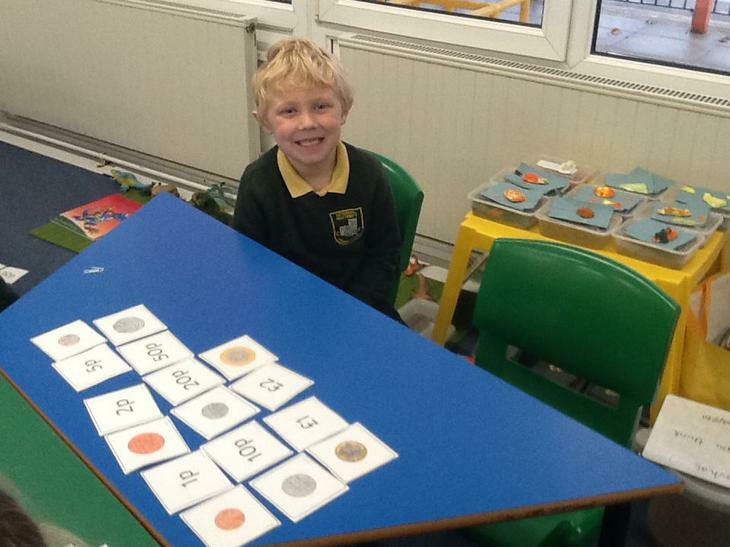 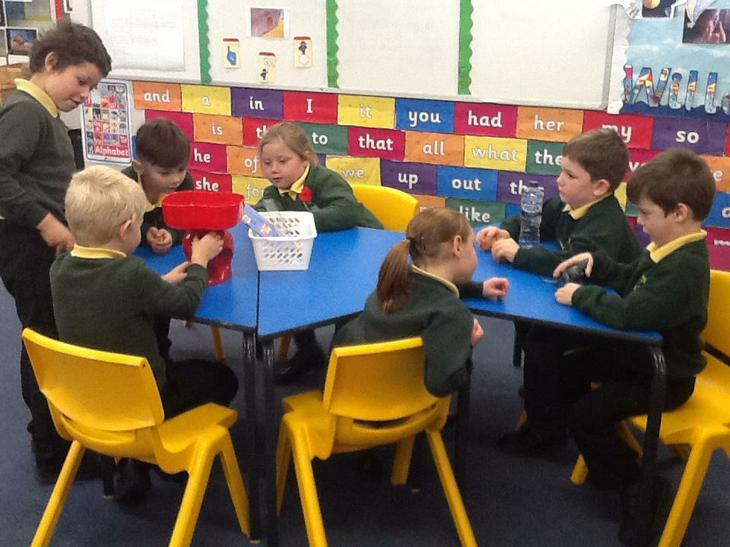 We have done lots of practical activities using clocks to help us with this tricky area of maths. 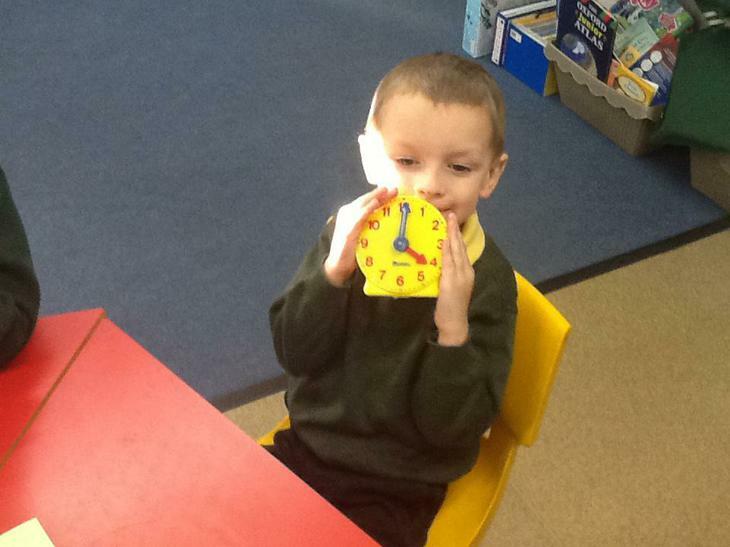 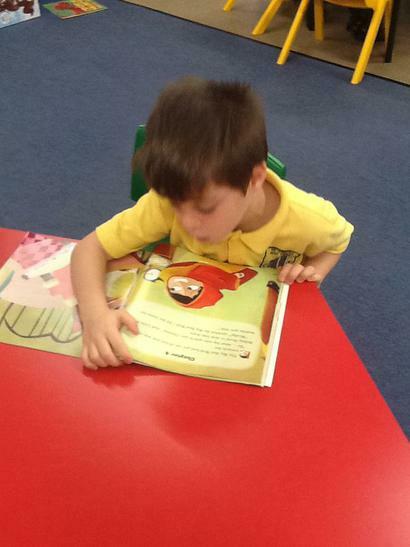 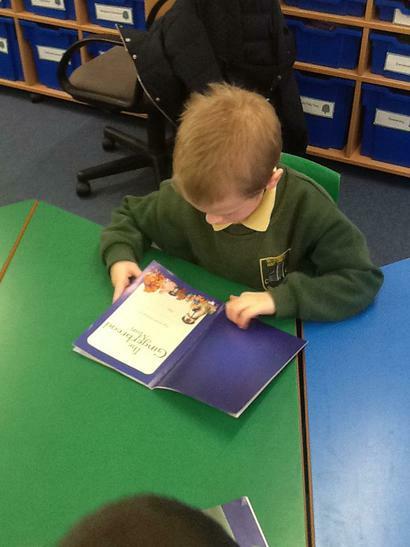 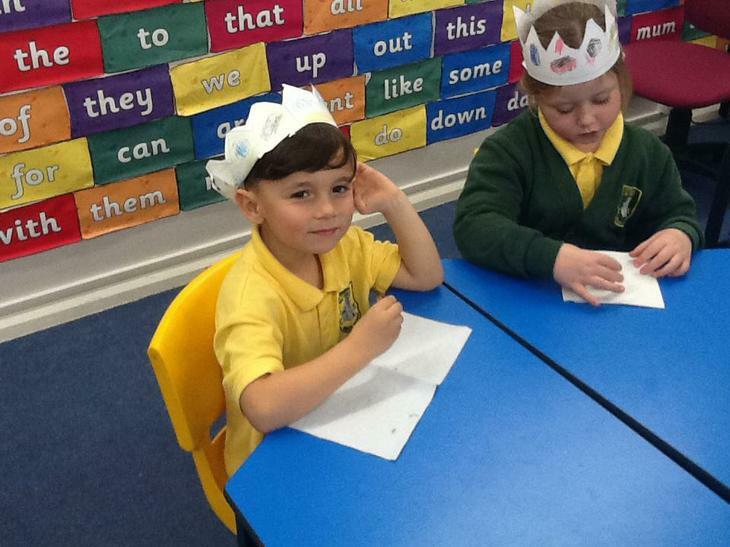 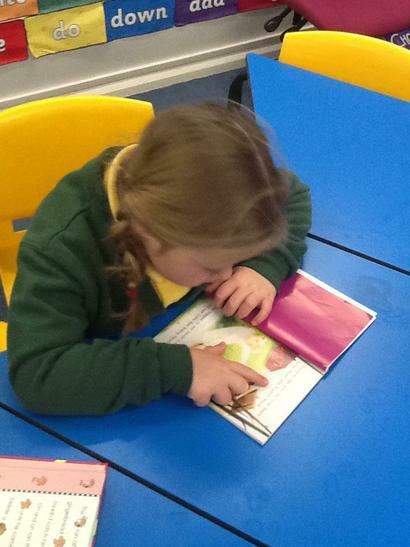 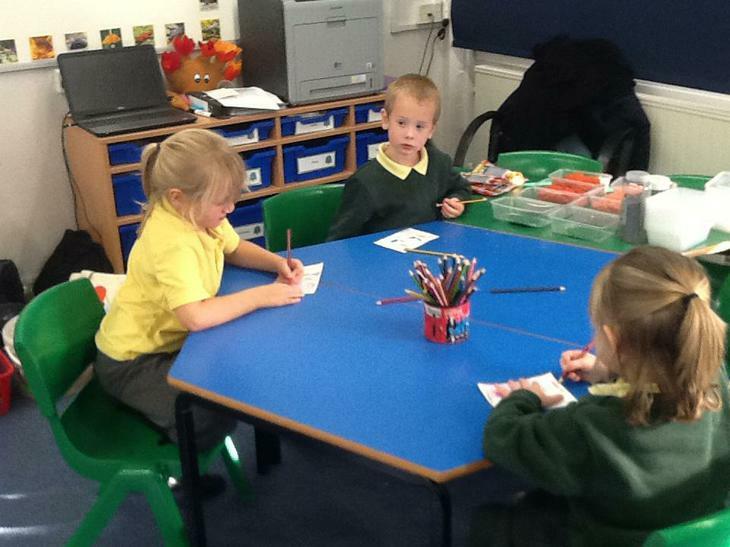 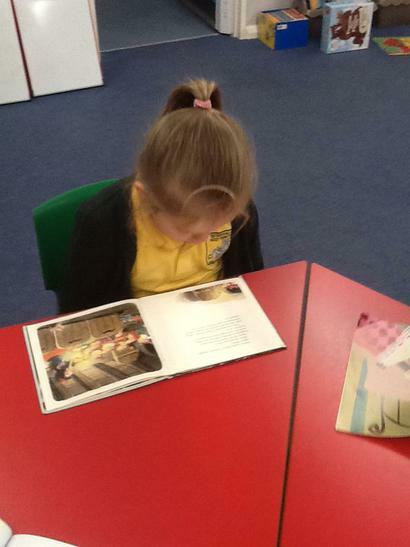 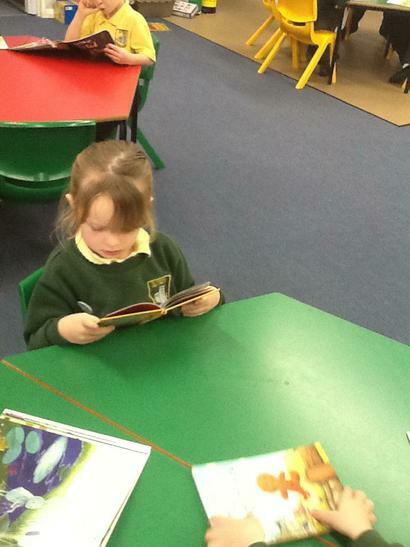 We then moved on to reading the time and then writing it down. 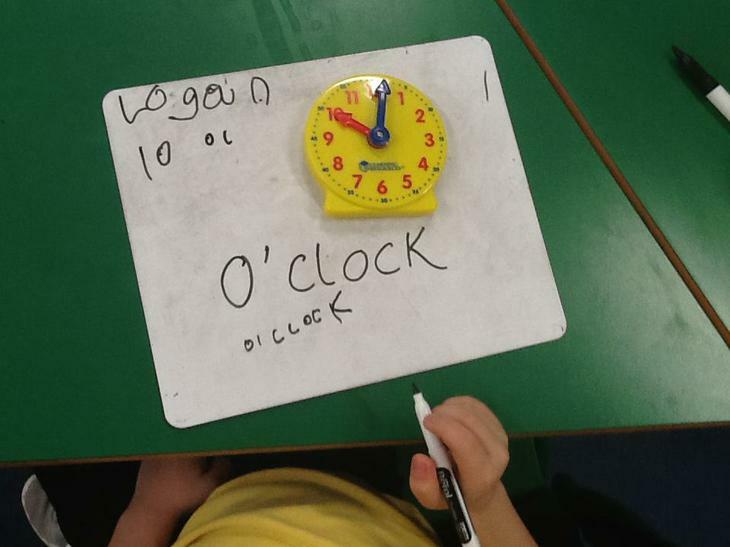 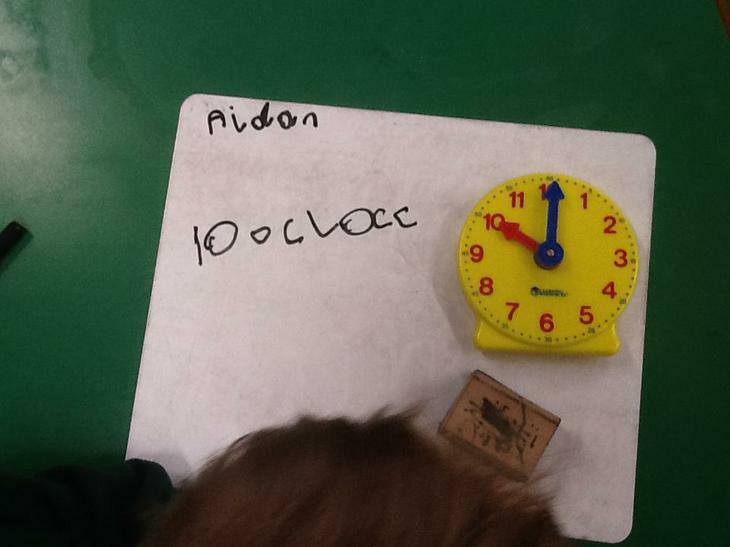 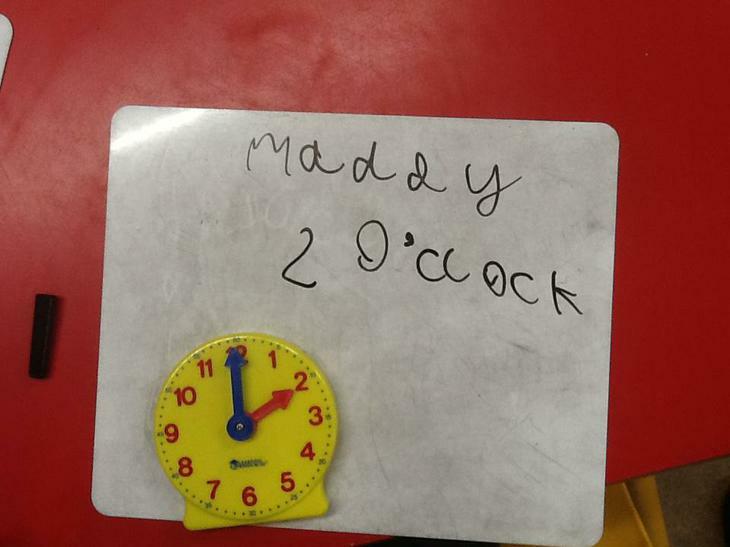 At first this was tricky to remember the o'clock but with a bit of practise we got there. 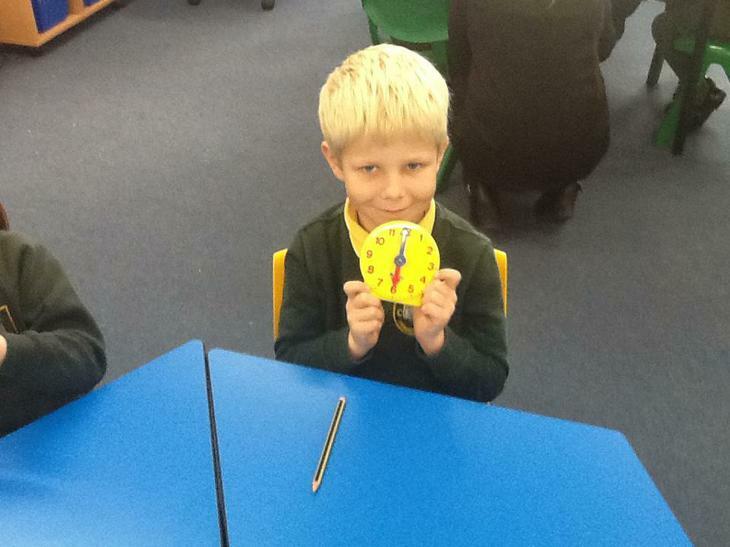 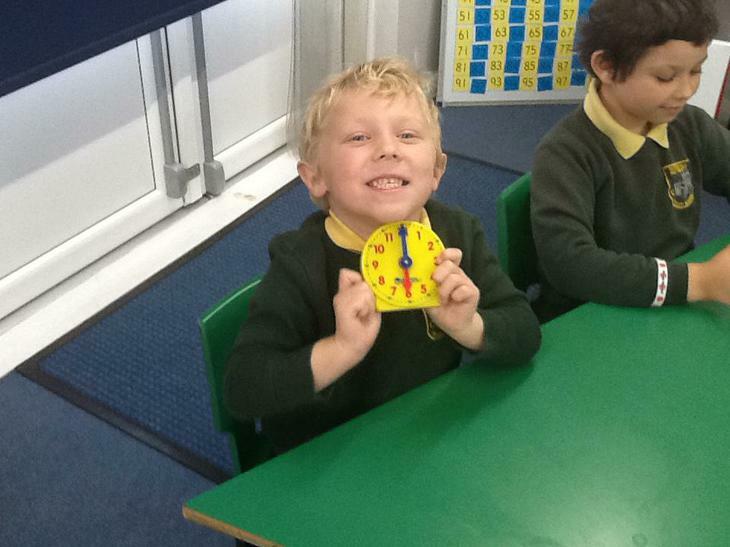 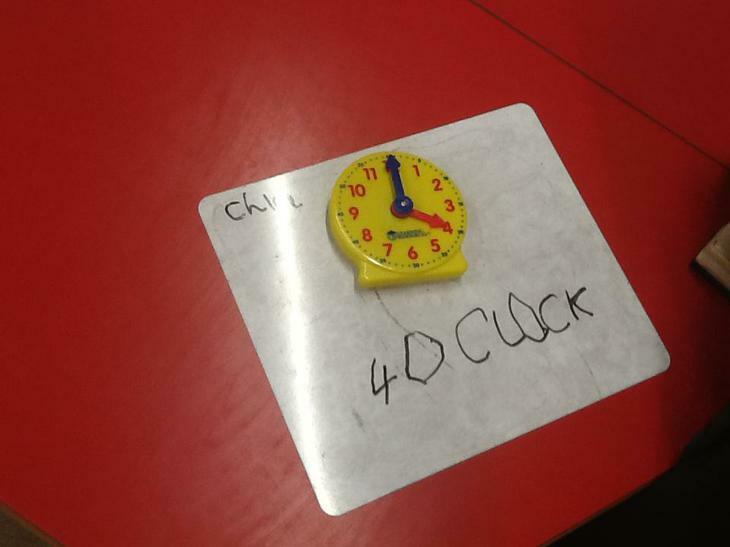 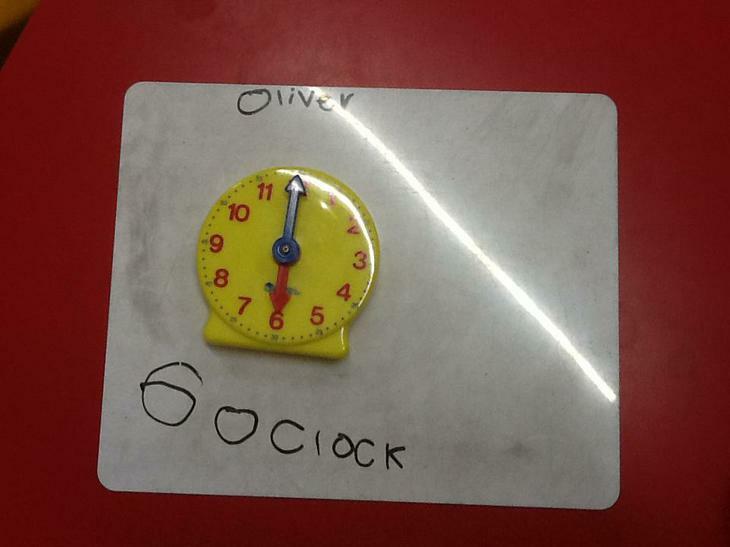 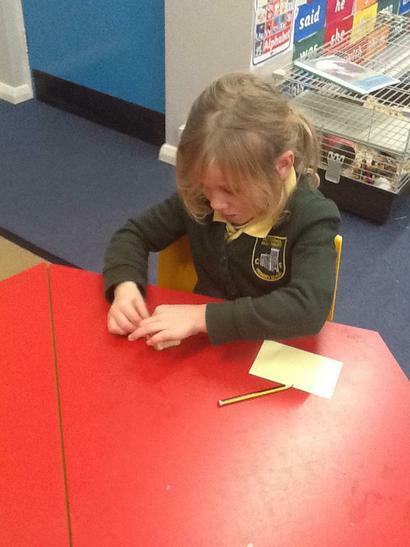 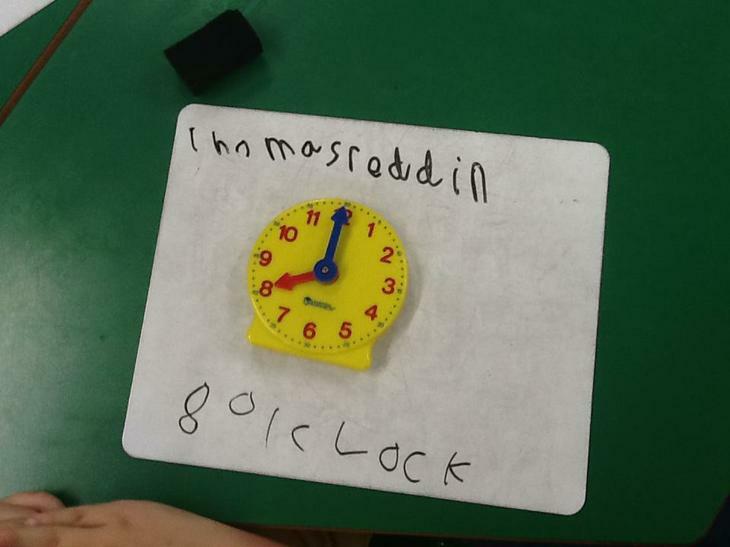 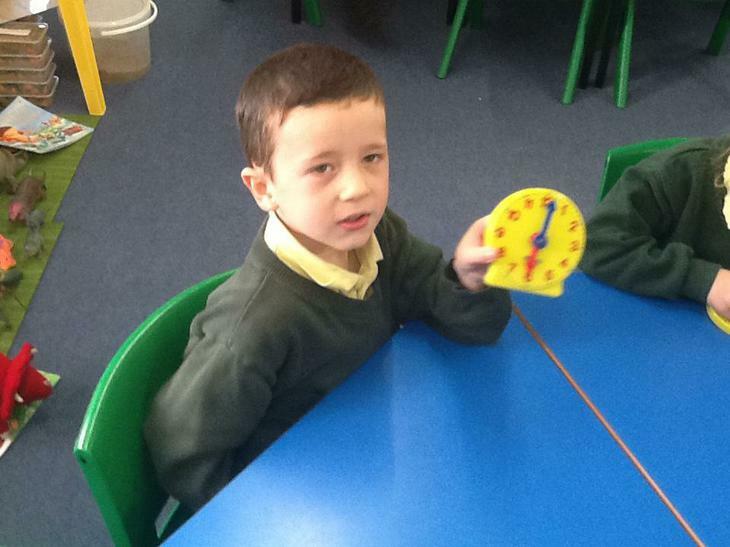 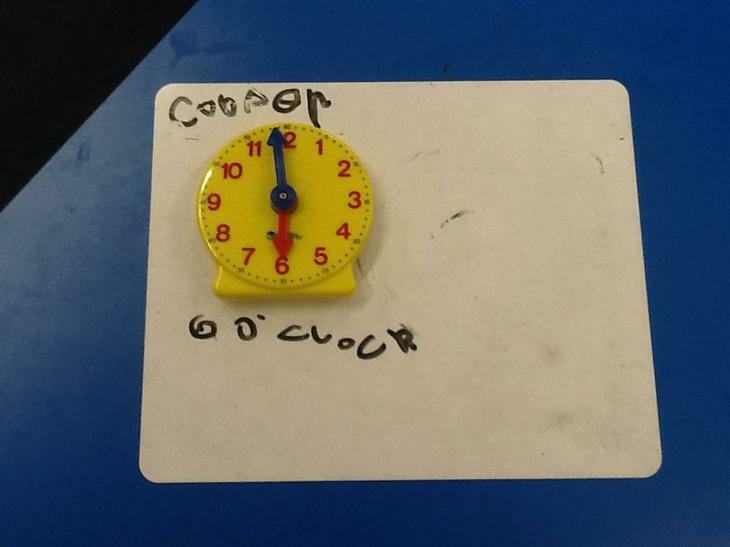 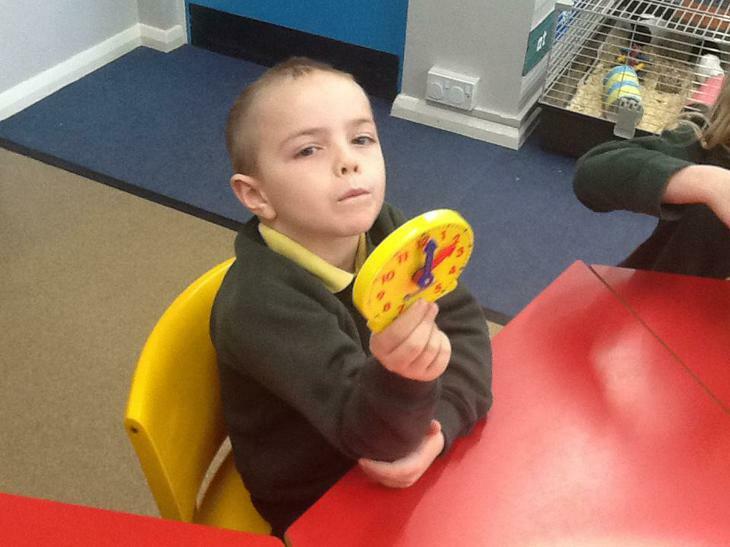 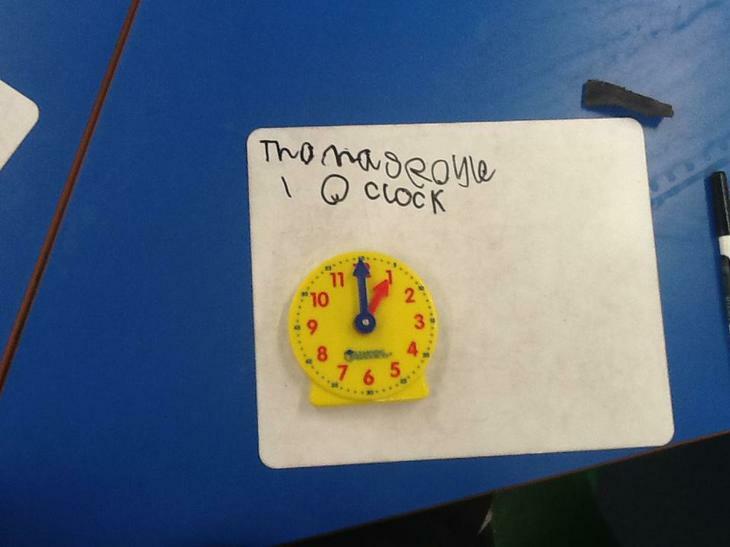 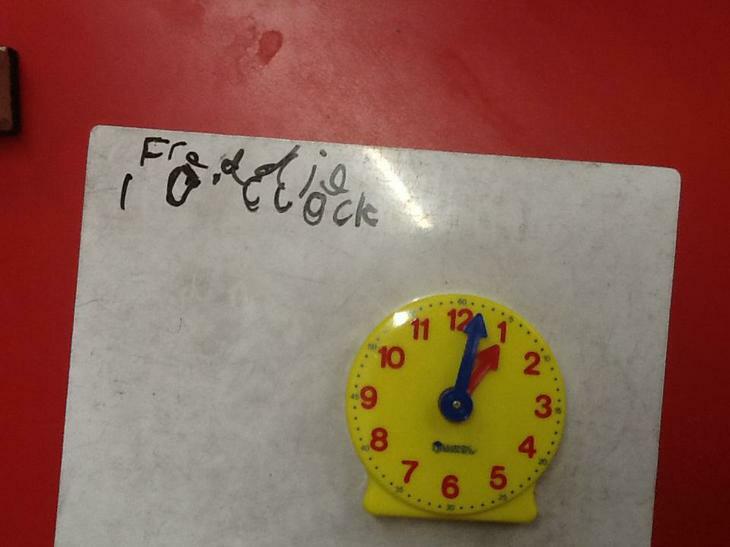 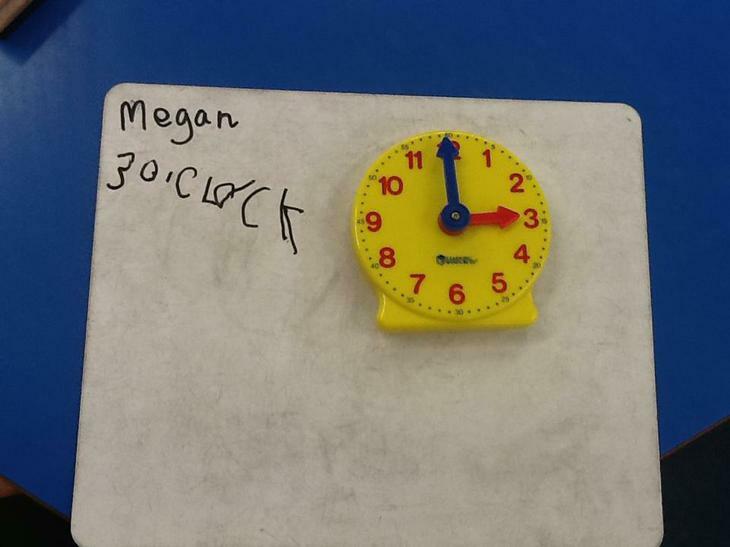 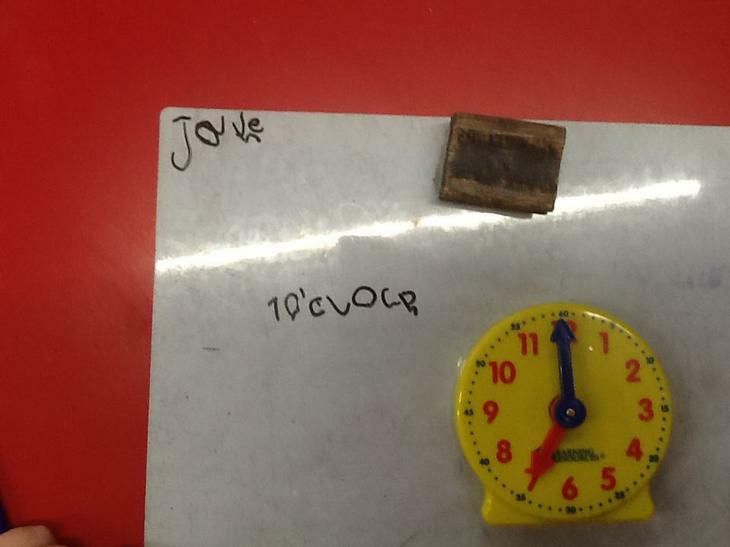 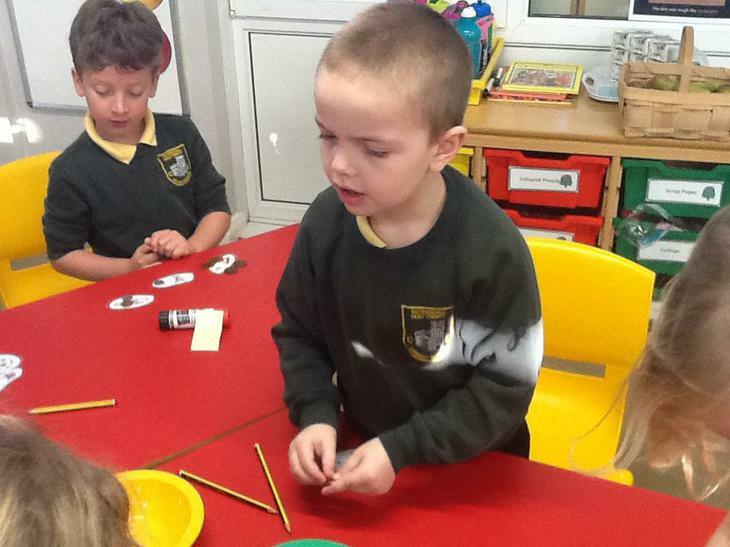 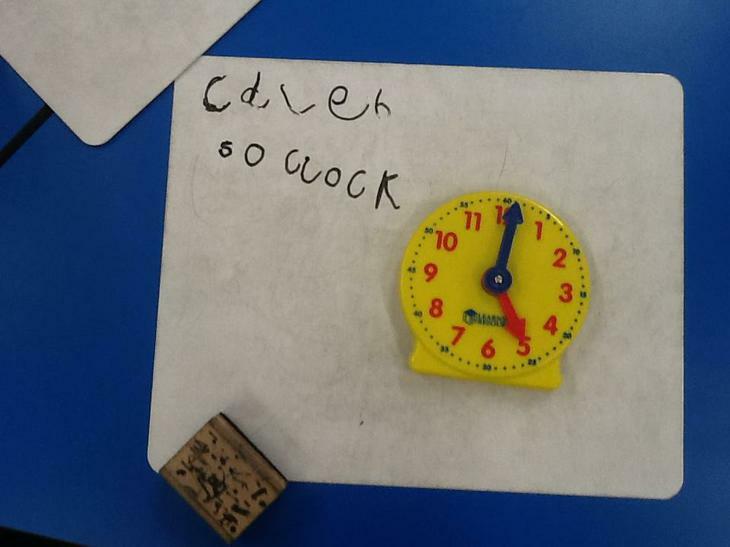 We then created our own clocks by carefully using a ruler to draw the hands to show different o'clock times. 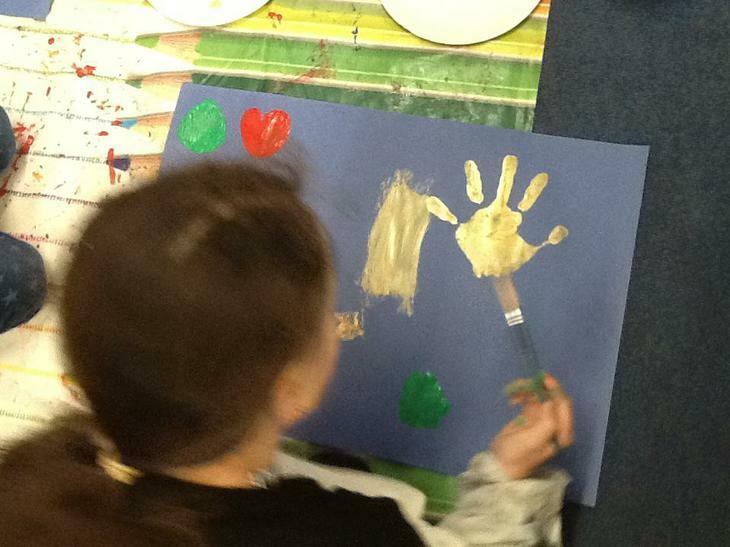 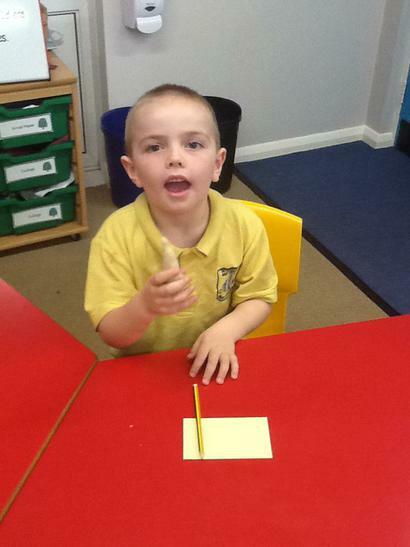 We had to think about the length of the hands and making sure they were pointing in the right place. 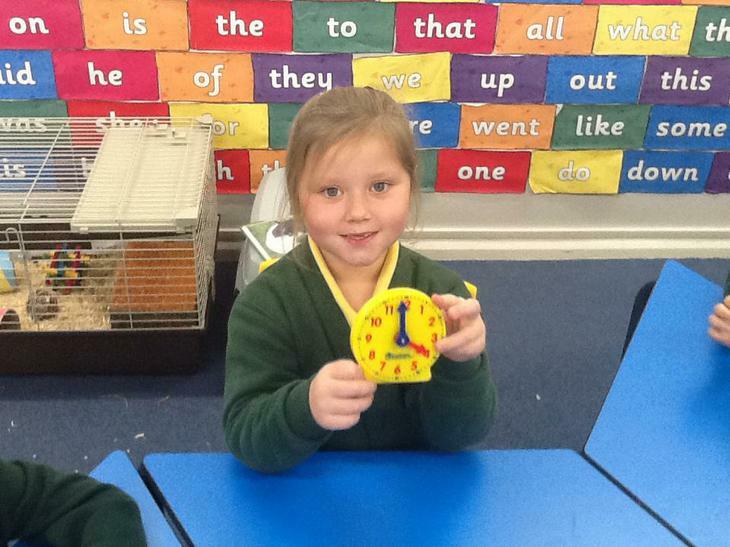 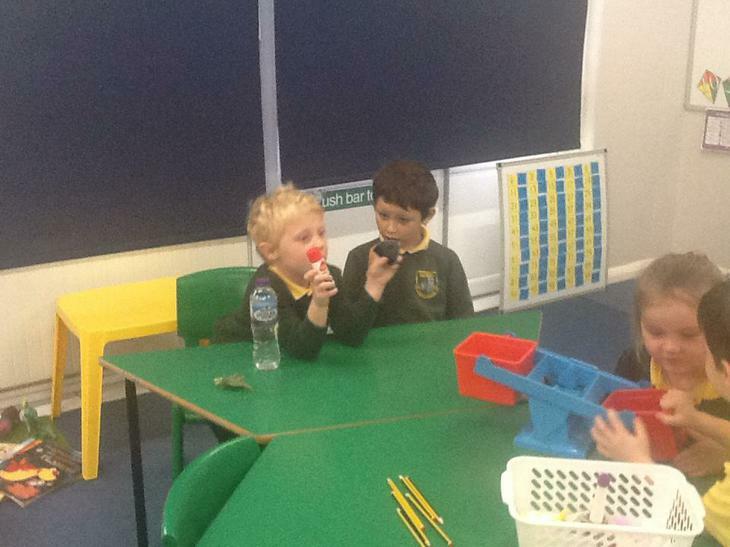 To end the week we played a game of o'clock bingo. 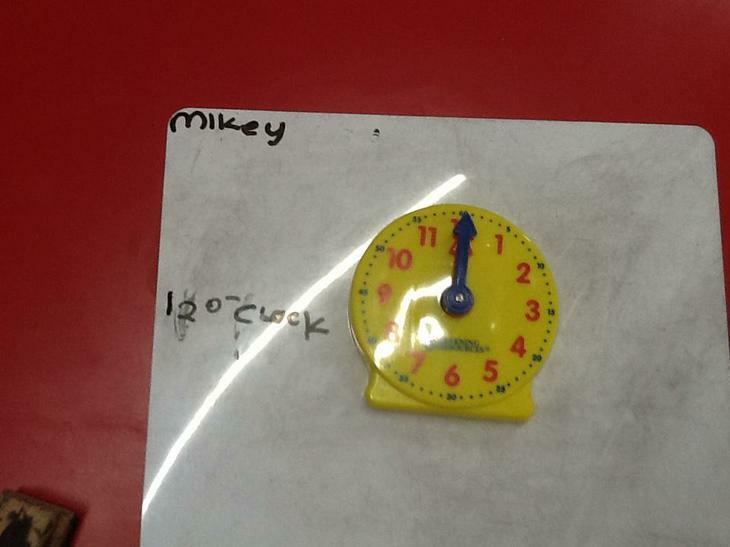 We had to read the time on the clock and match it to the printed time on the paper. 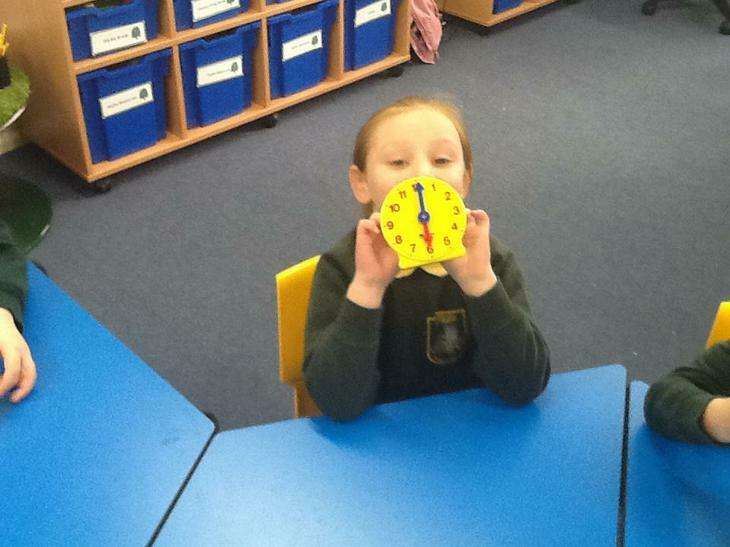 We have had a great time learning about time! 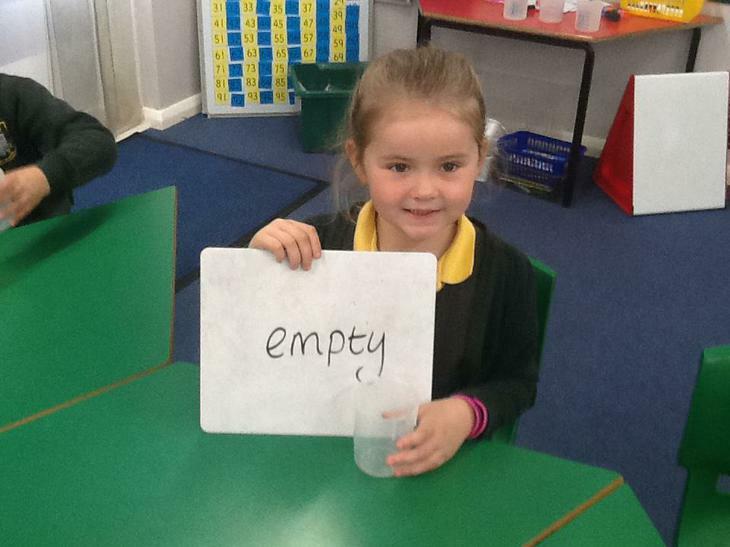 This week in English we have been focusing on facts. 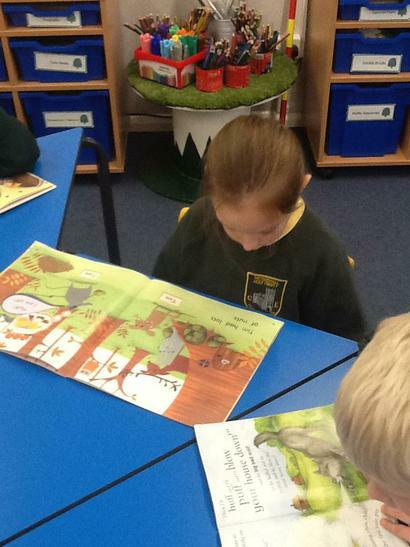 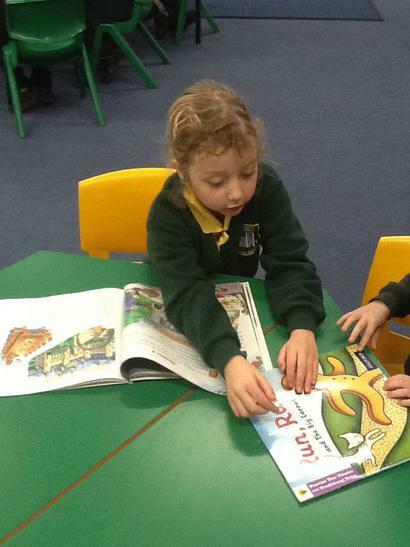 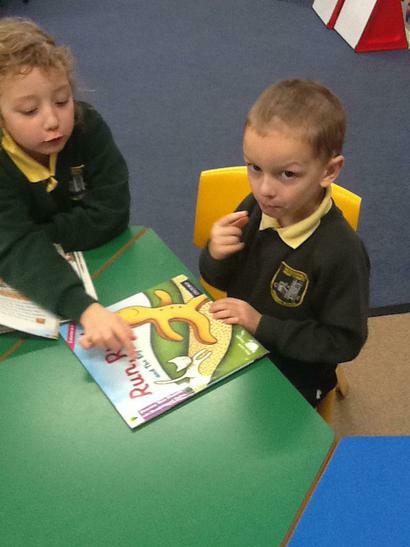 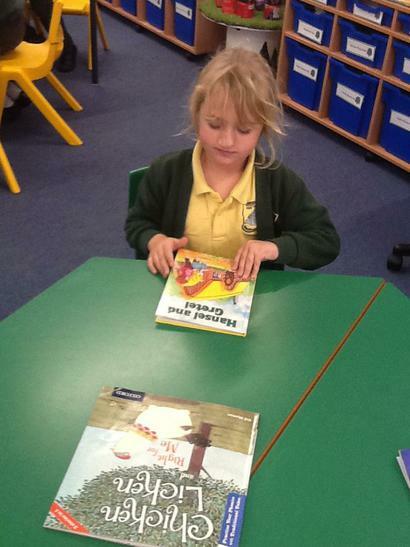 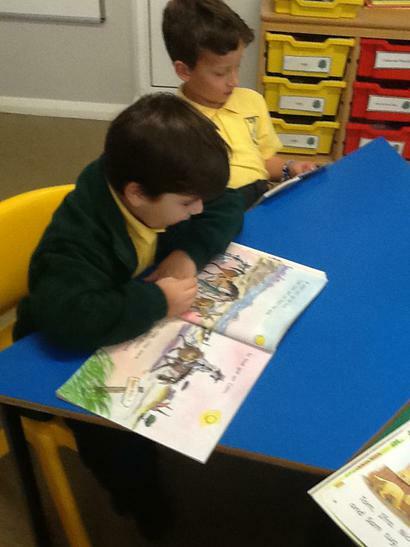 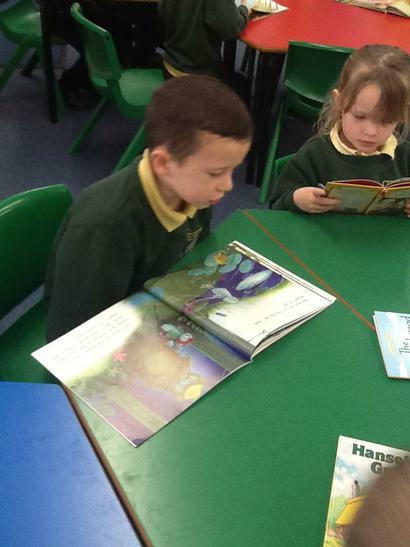 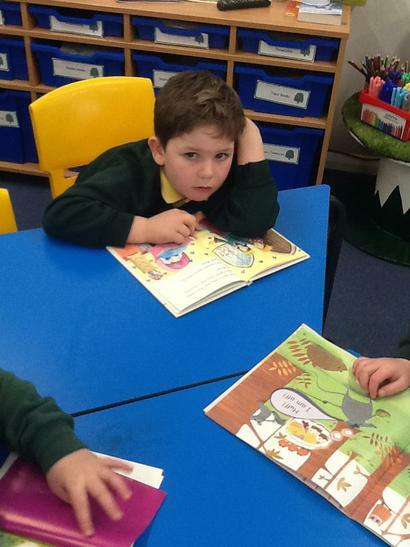 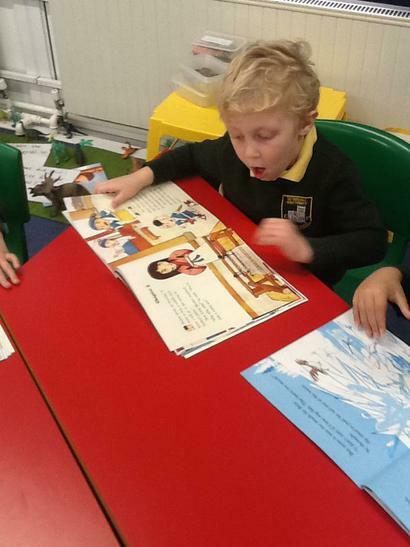 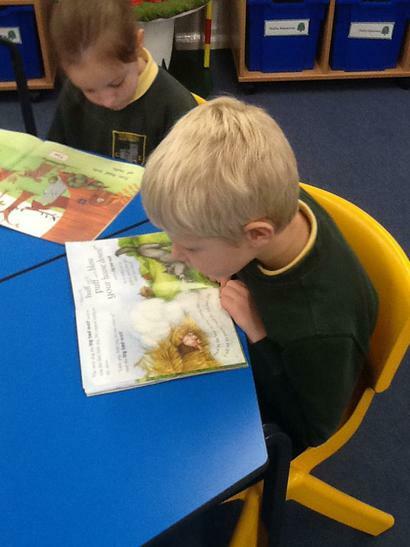 We learnt more about the difference between a fact and fiction book and then set about finding dinosaur facts in books. 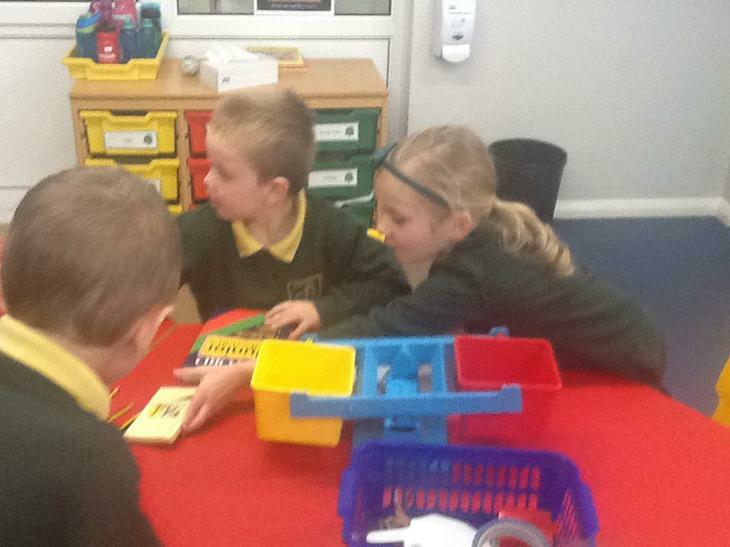 We highlighted things that we thought were facts and shared them with our friends. 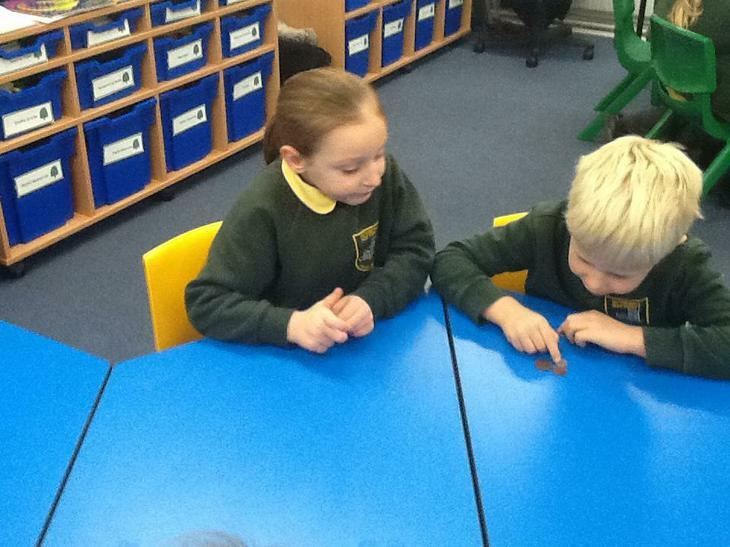 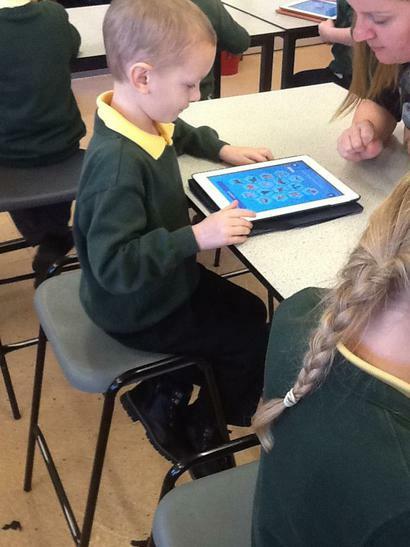 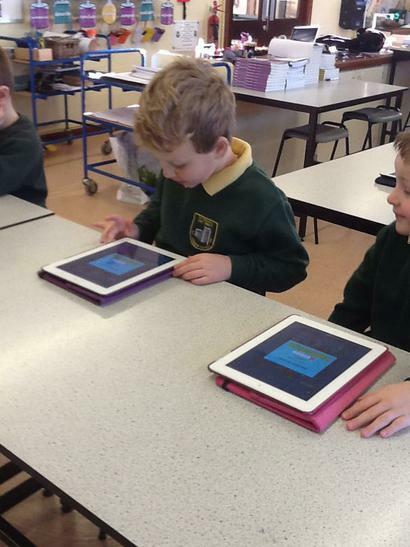 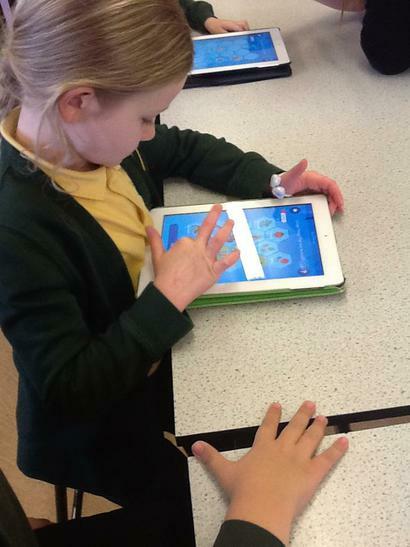 We then moved on to using ICT to help us find facts and learnt about how to use Google safely and smartly. 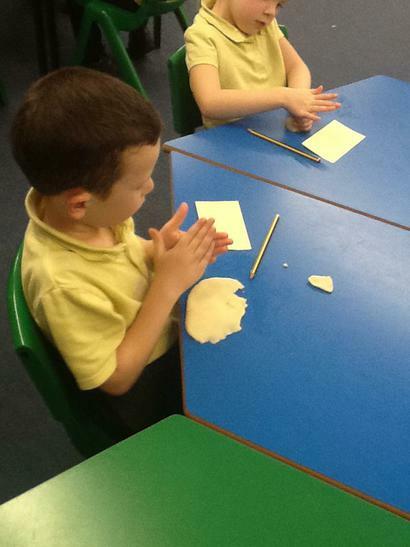 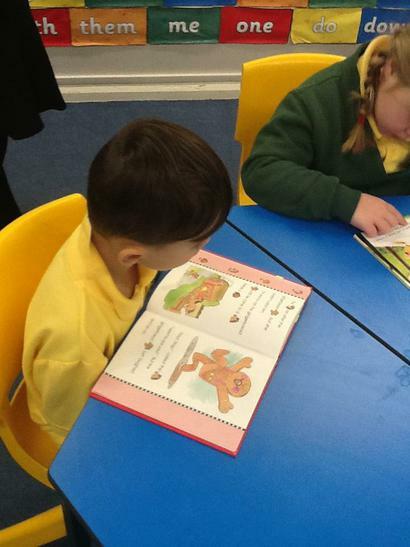 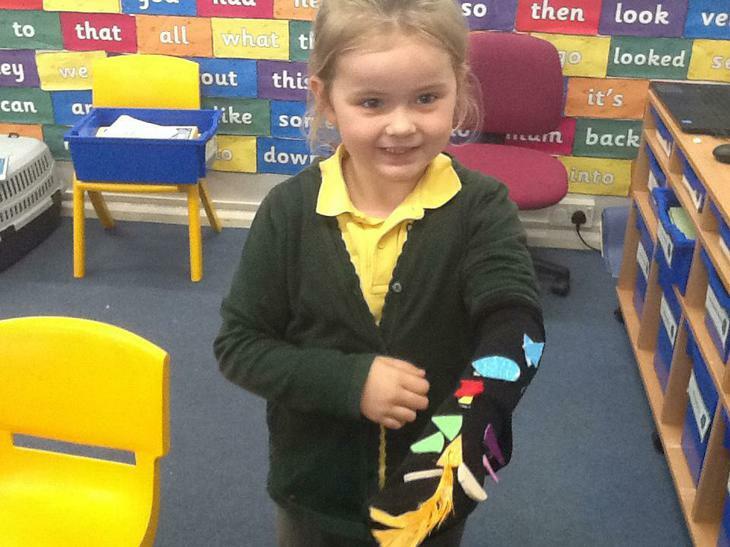 This week we were learning more about body parts. 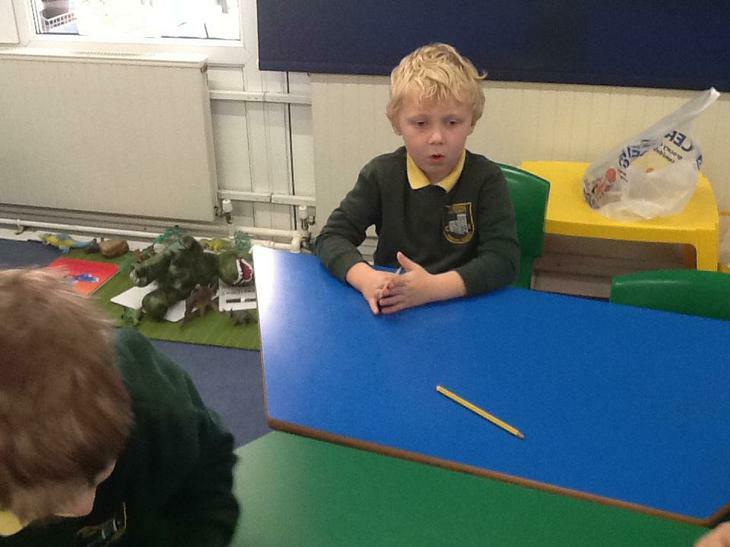 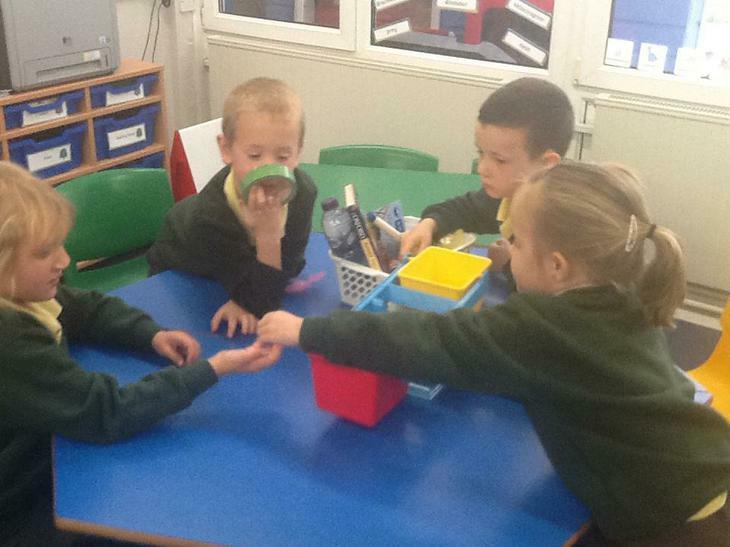 We decided we would like to know if dinosaurs had the same body parts as us or if they were different. 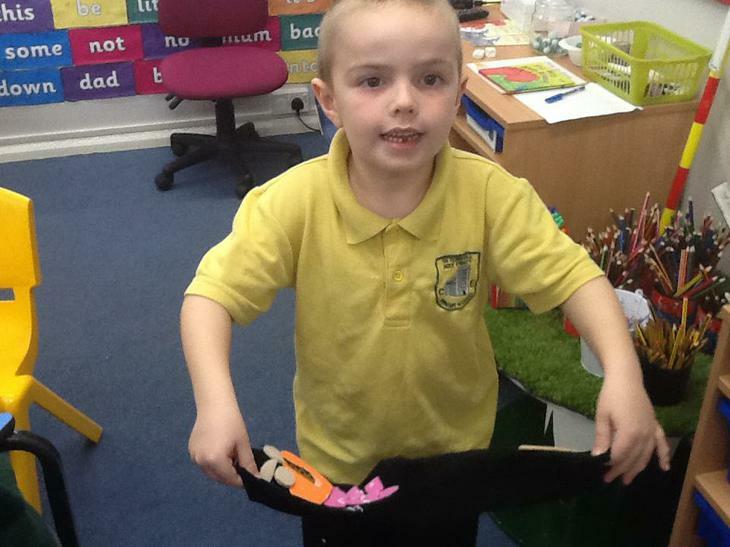 We discovered that some people called different parts of their bodies different names so we labelled our paper person first and then compared those body parts to our pretend dinosaur. 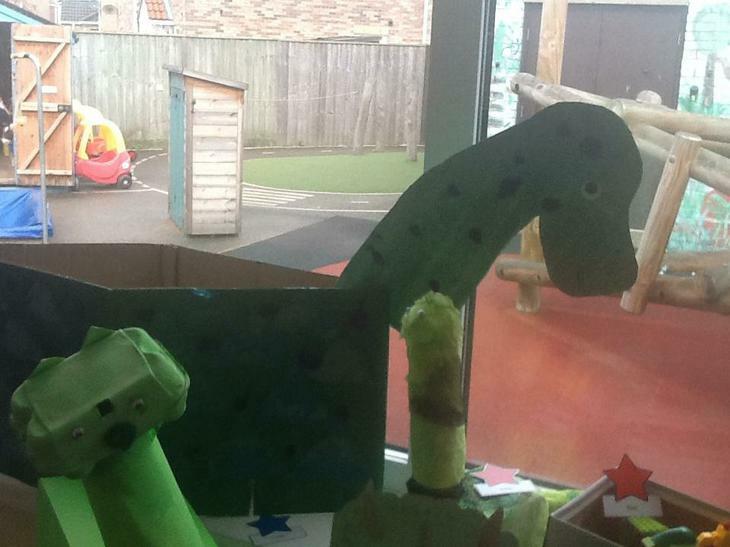 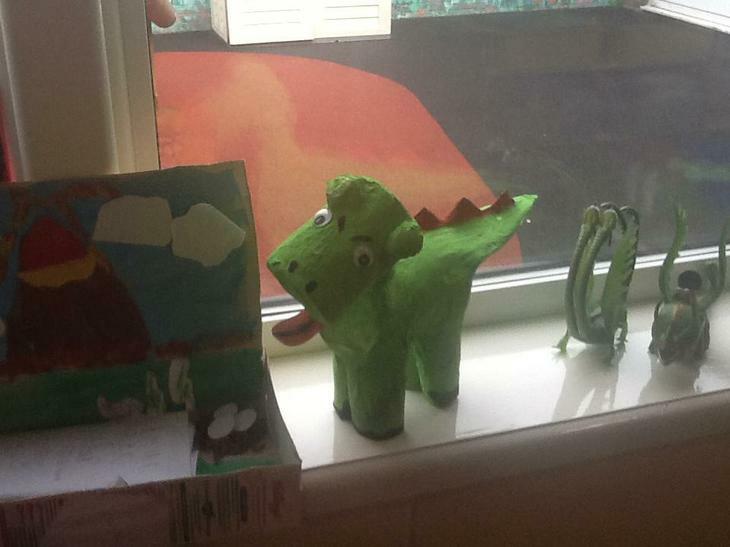 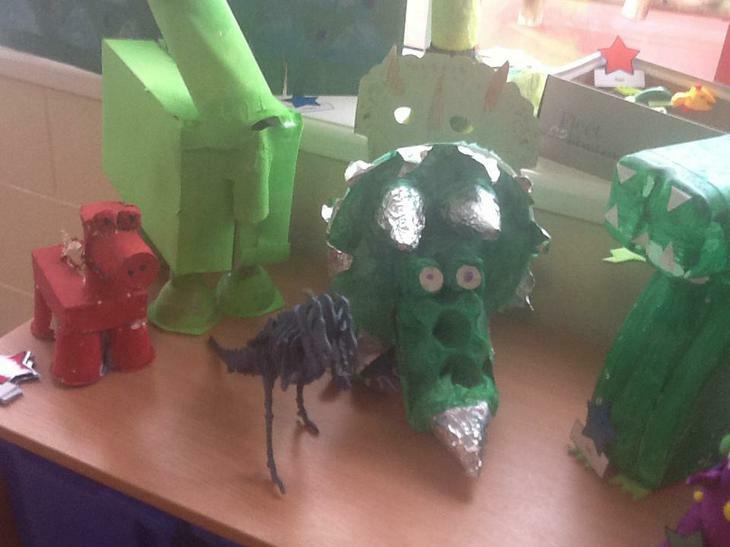 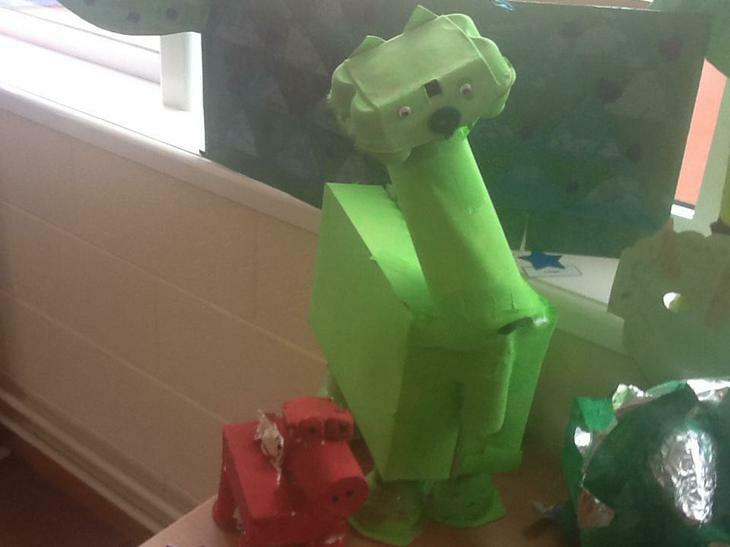 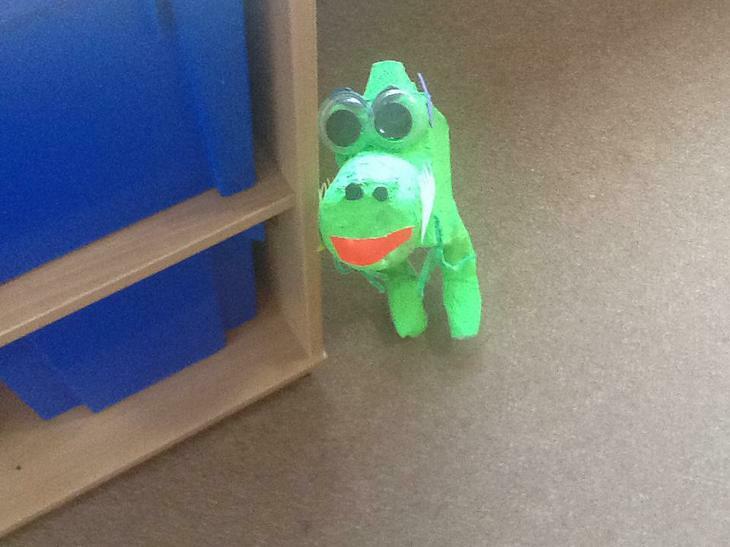 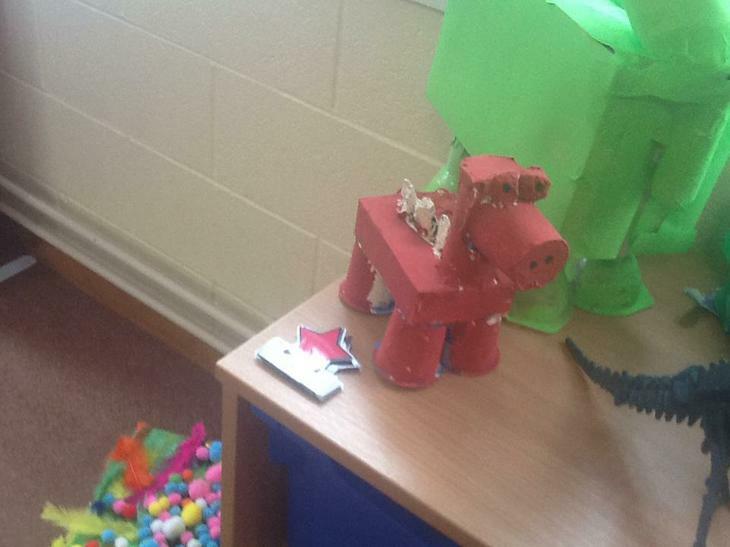 This week we made our very own type of dinosaur. 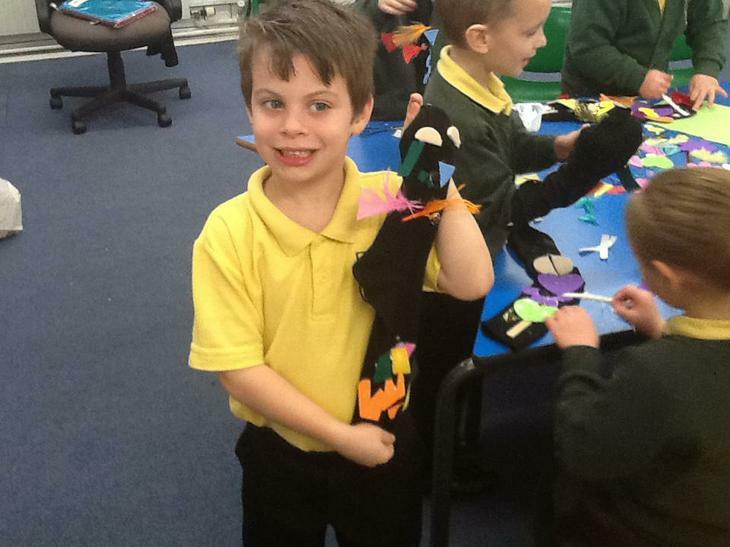 We would like to share with your our Sockosaurus Rex! 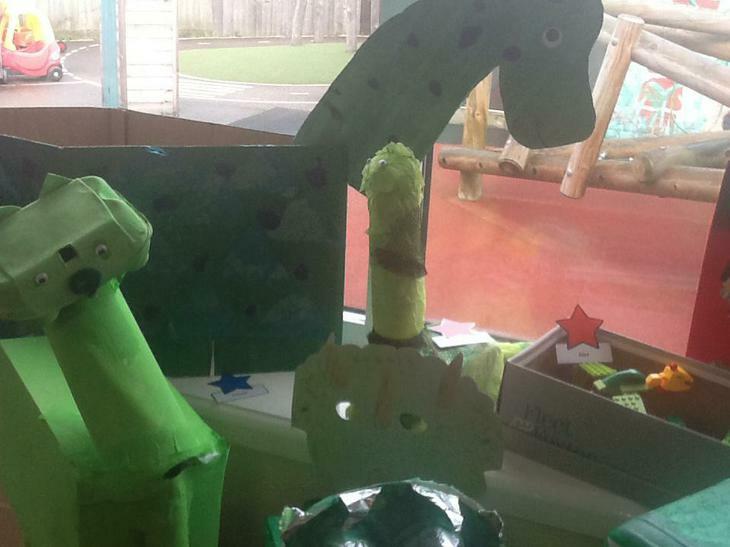 We don't think you will have ever seen anything quite like them. 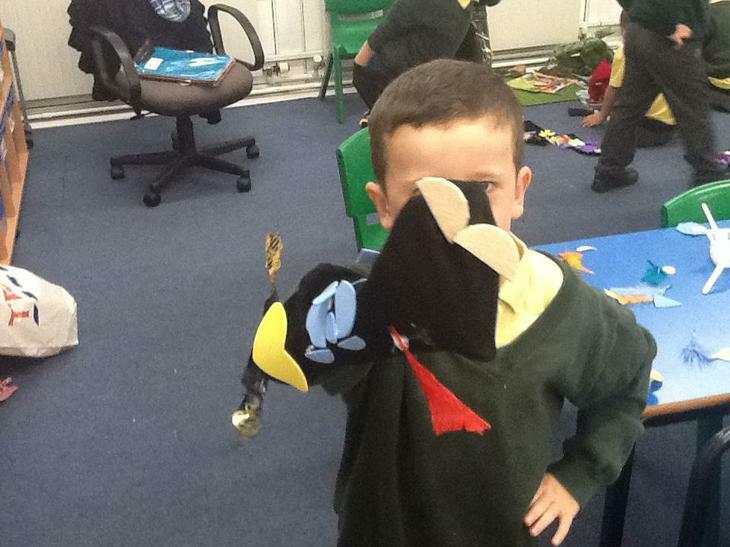 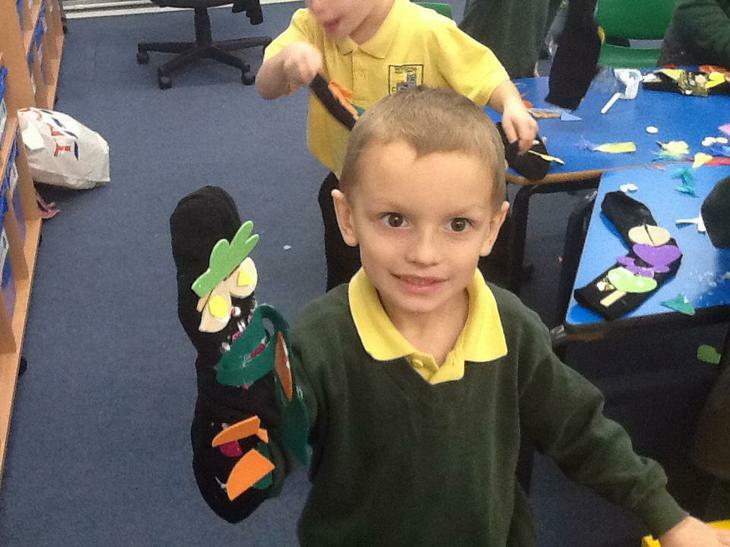 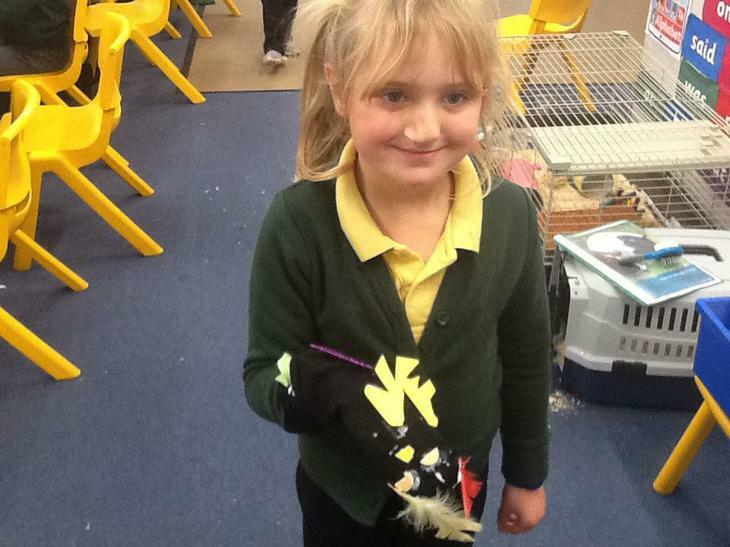 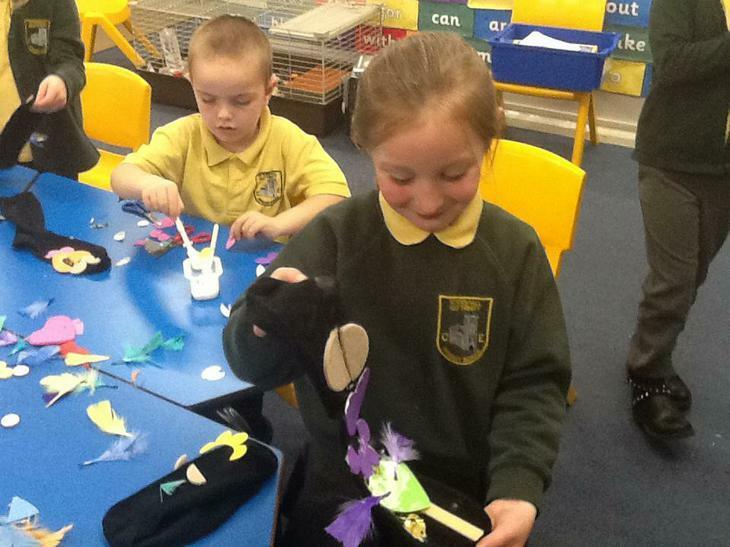 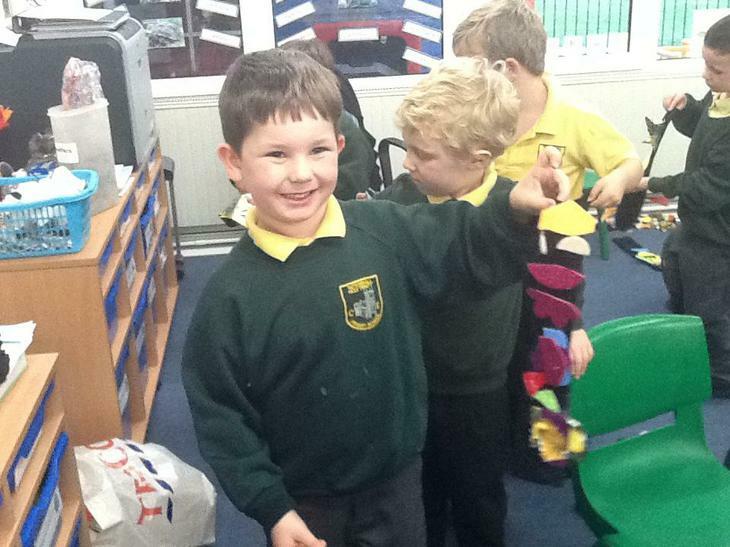 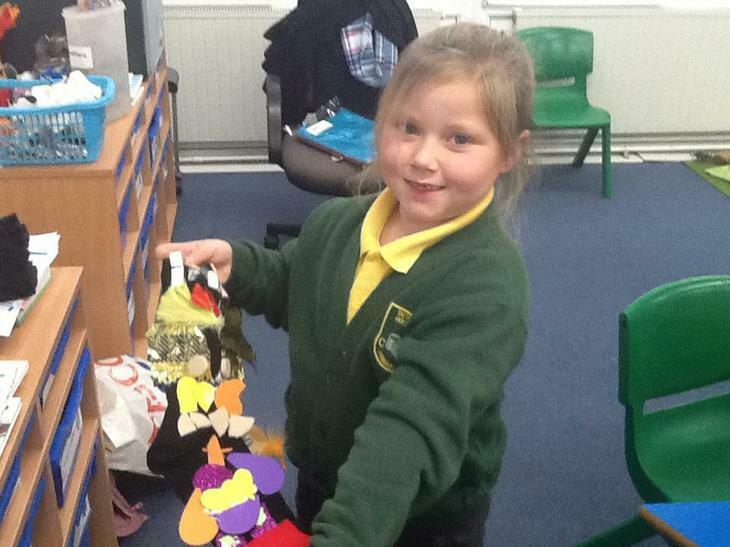 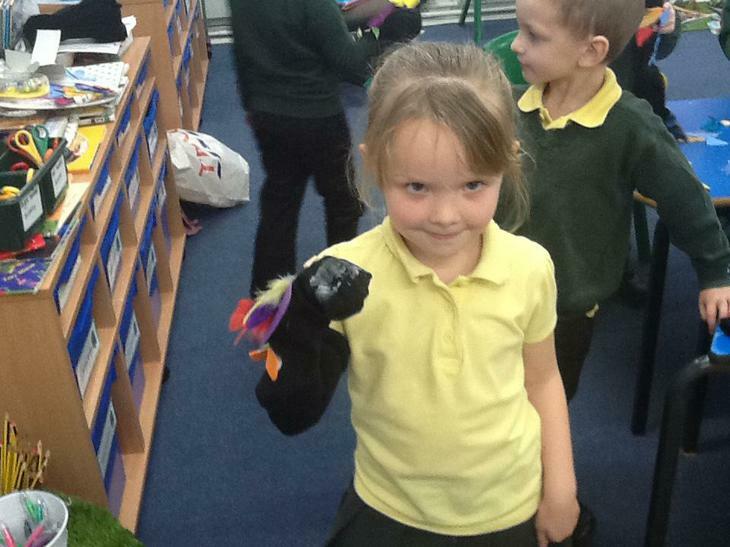 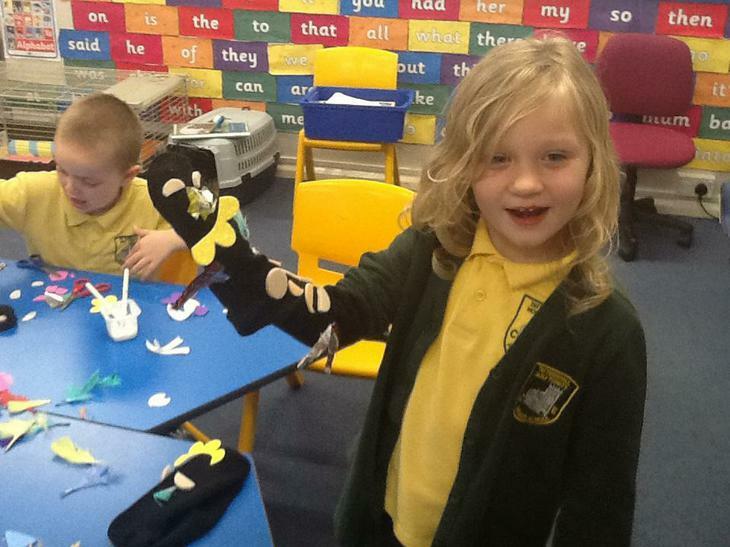 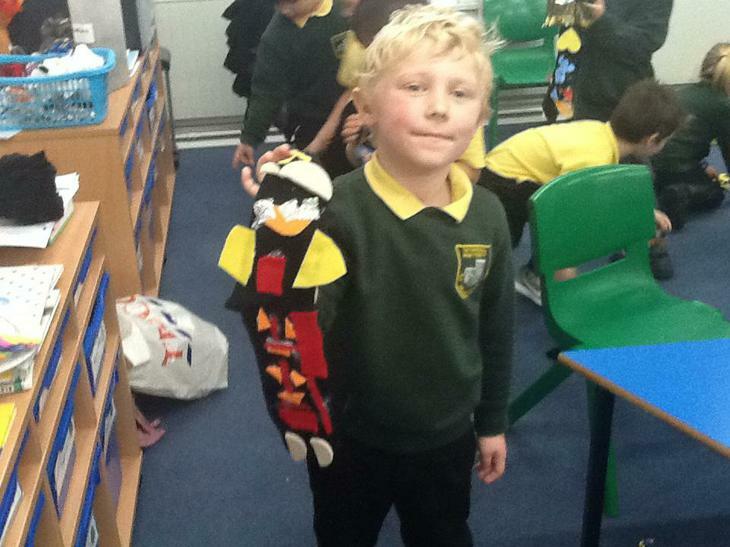 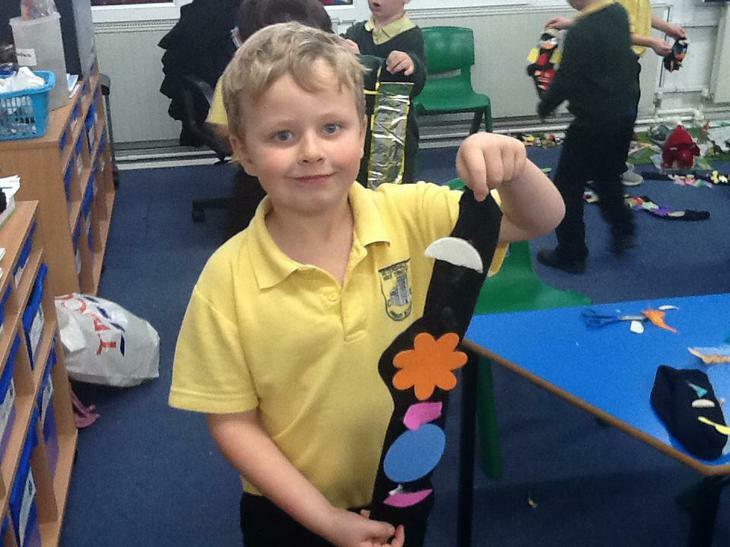 We had great fun transforming boring black socks into dinosaurs using lots of different craft materials! 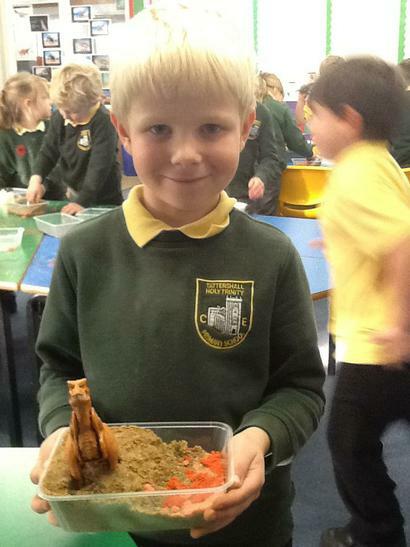 Continuing with our dinosaur planet topic in history this week we were comparing landscapes from when the dinosaurs were alive to today. 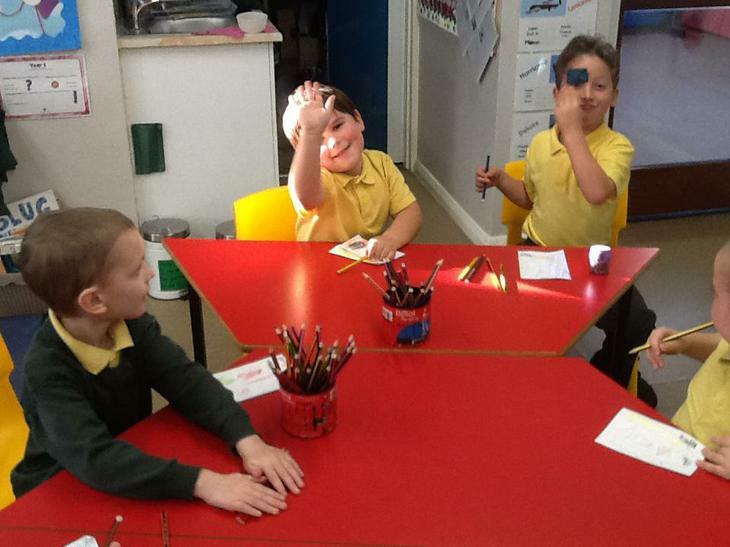 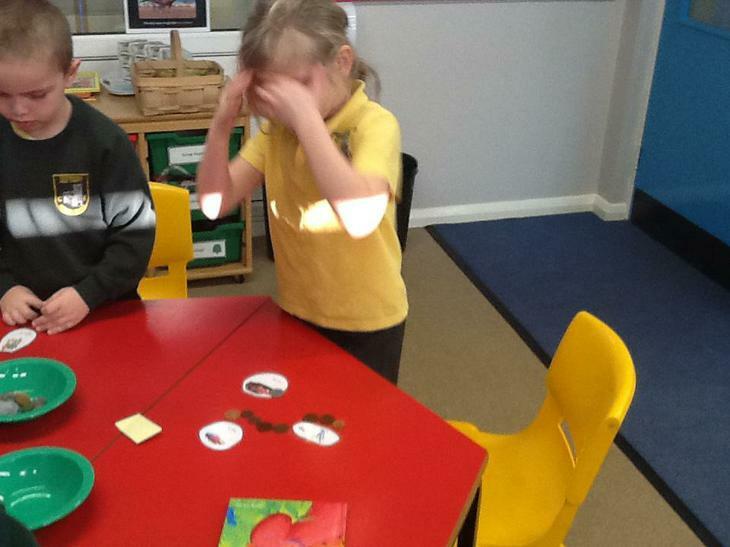 We had a look at different images and labelled the things we could see. 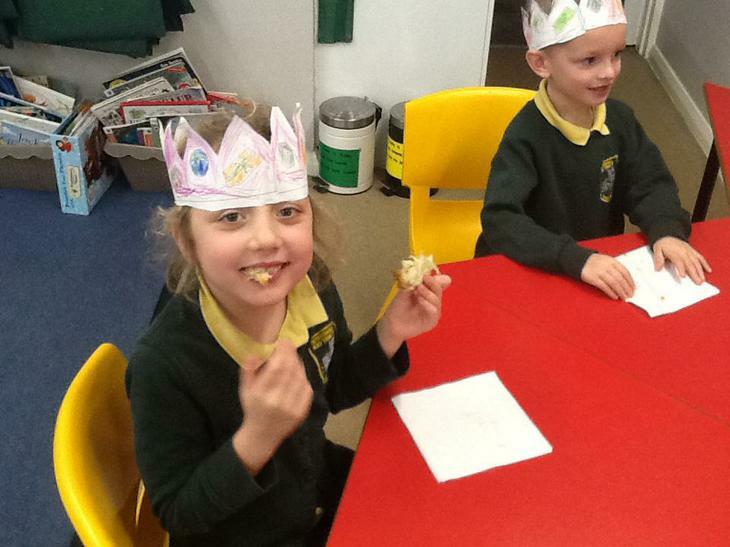 We decided we much prefer to live today rather than all those years ago! 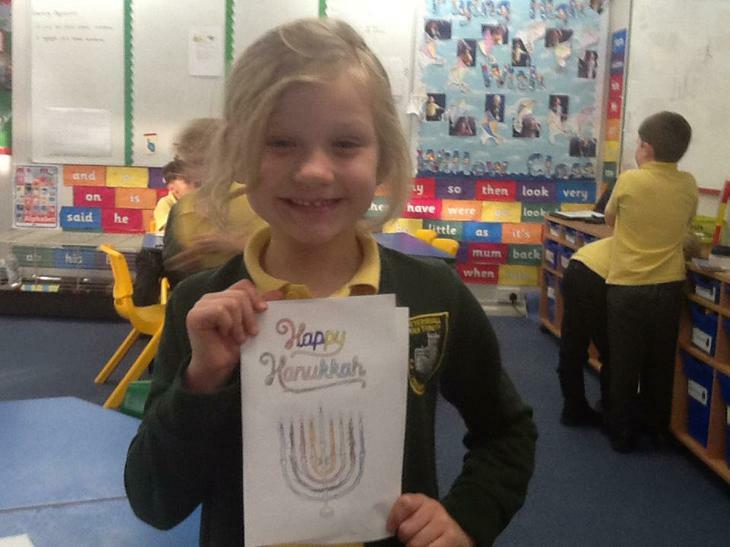 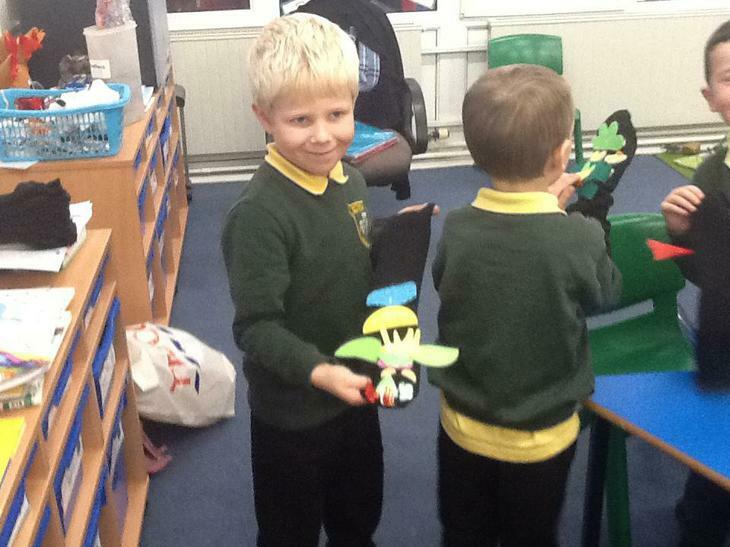 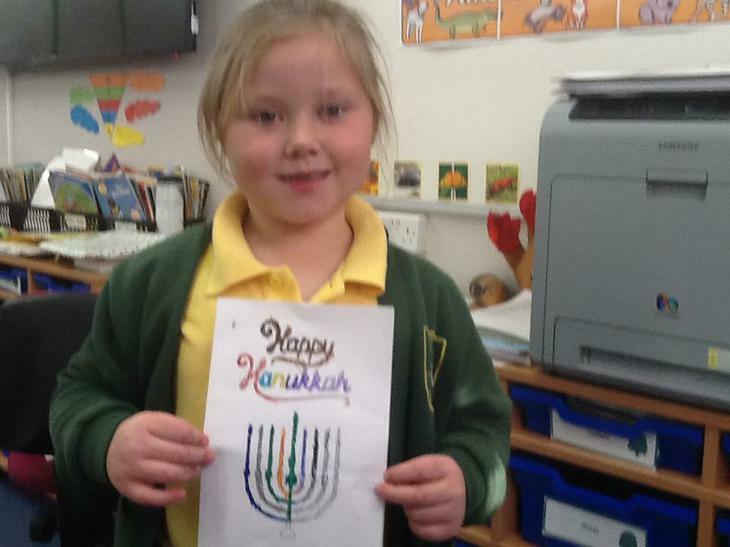 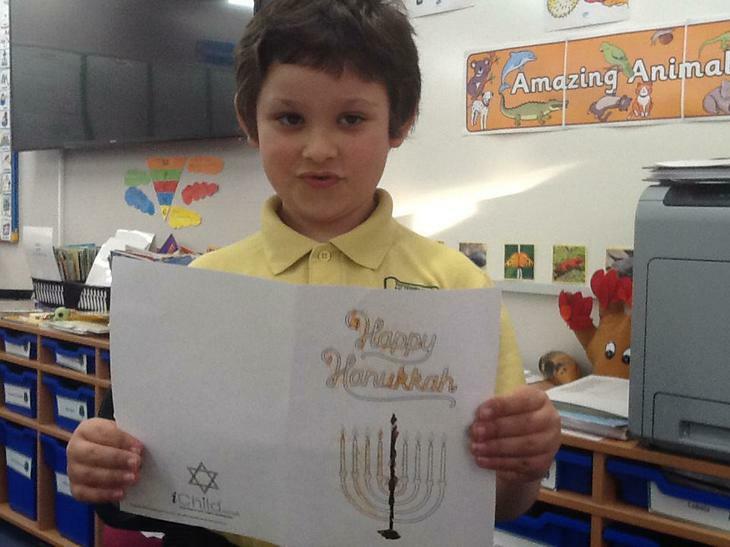 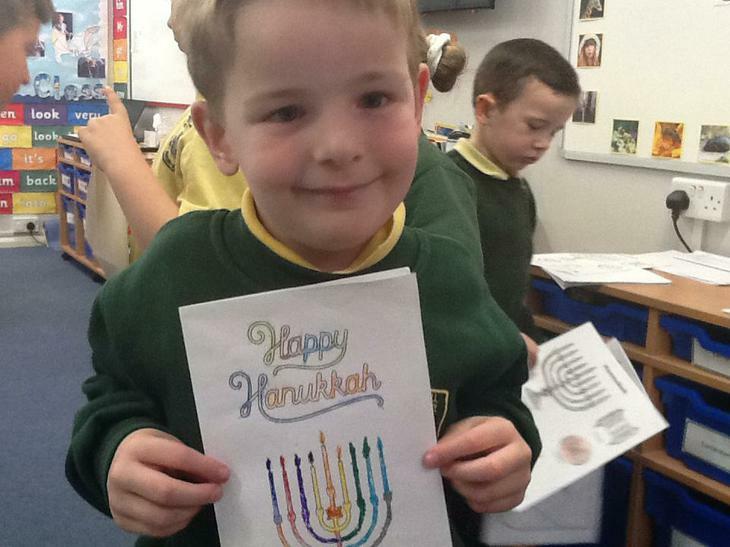 As part of our work on different festivals and celebrations around the world we have been learning more about Hanukkah. 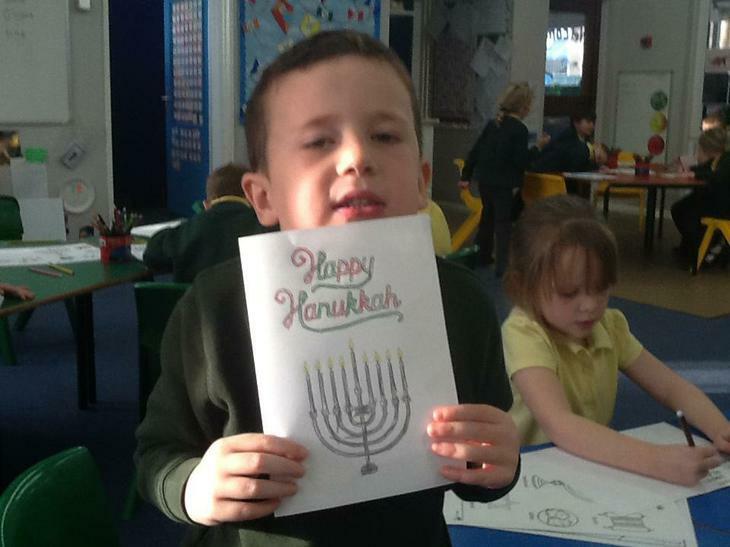 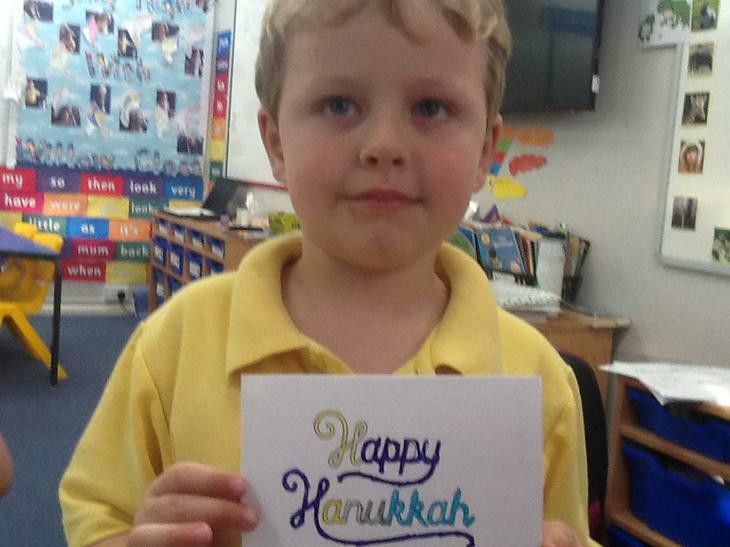 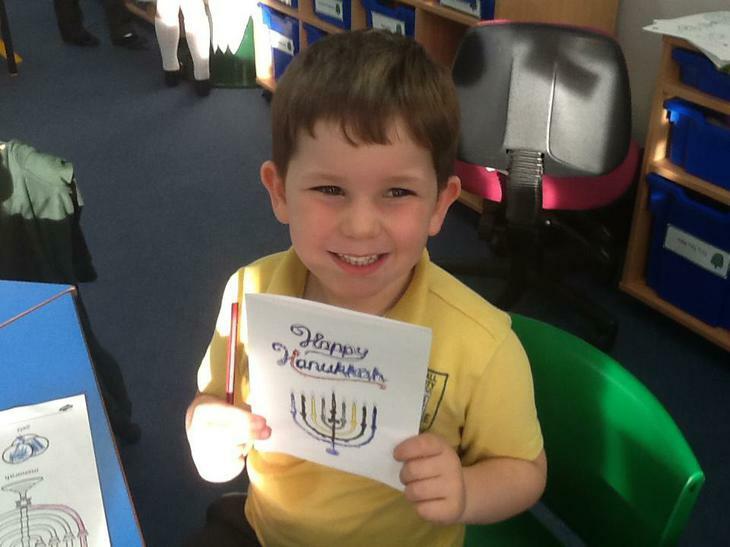 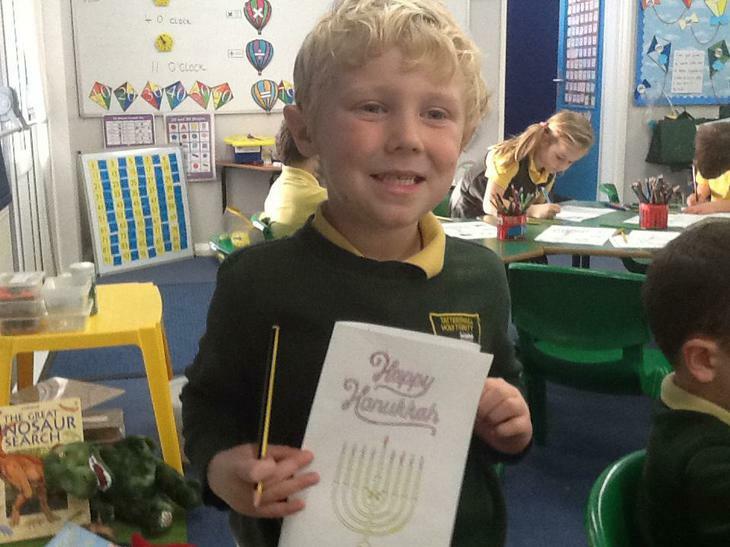 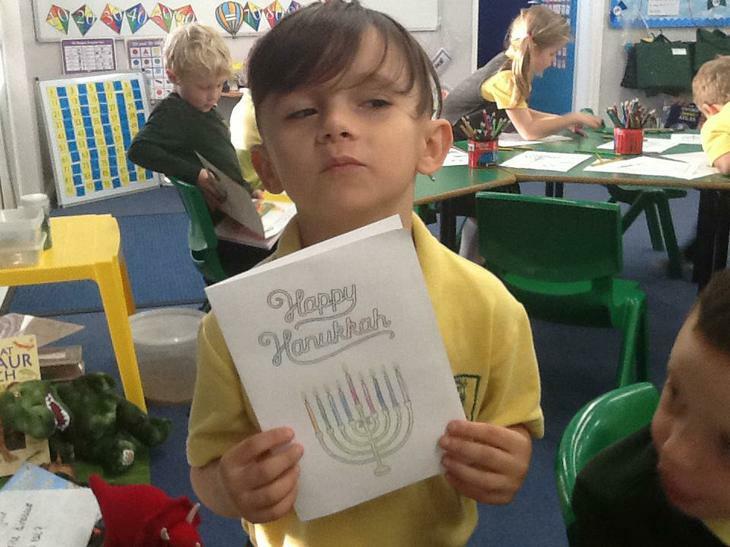 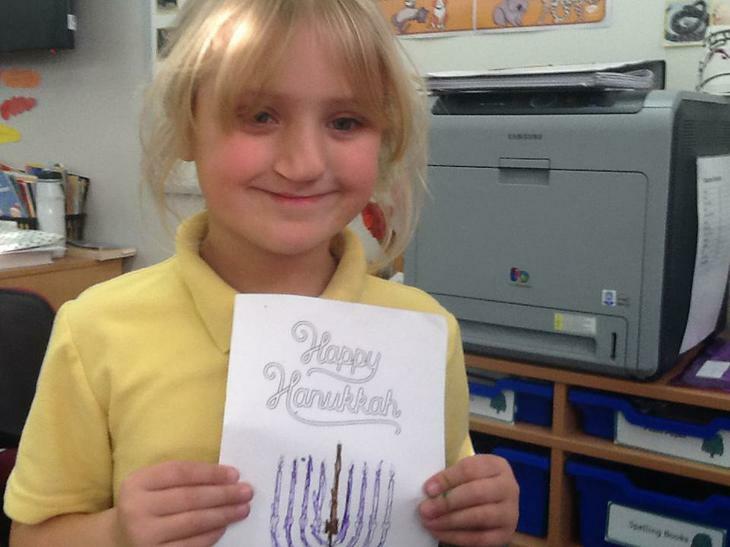 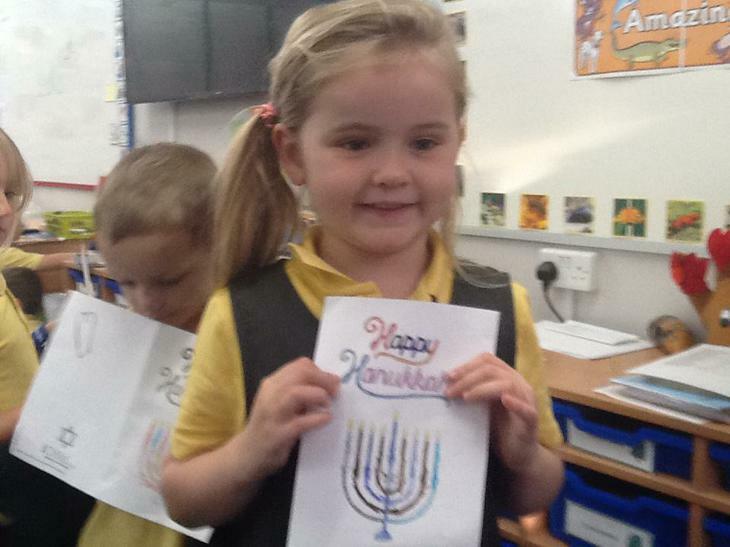 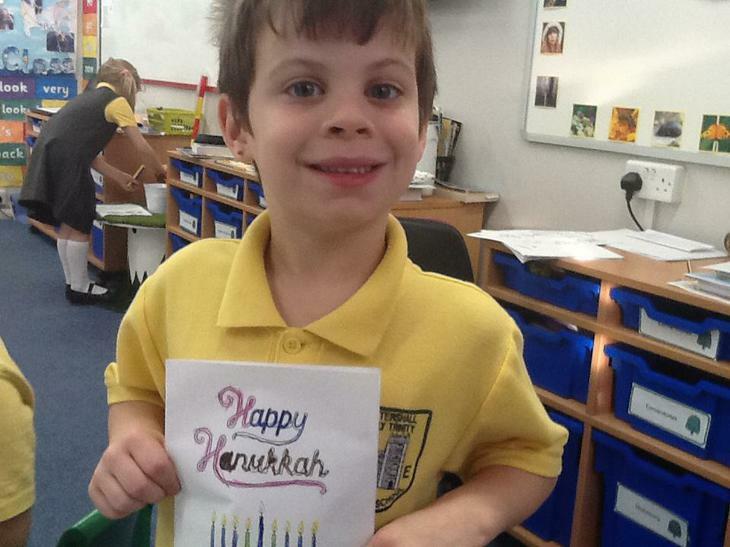 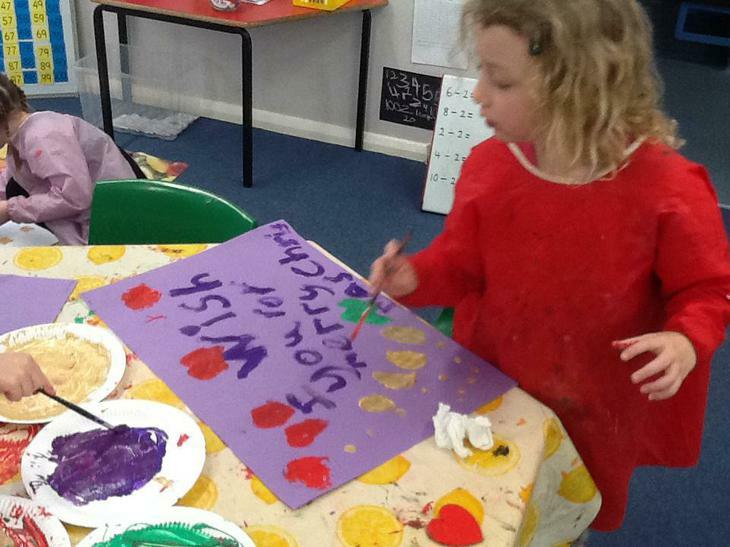 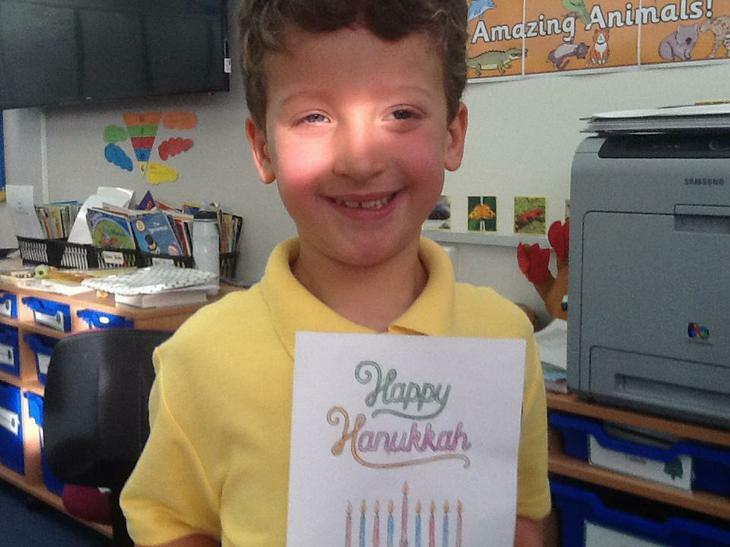 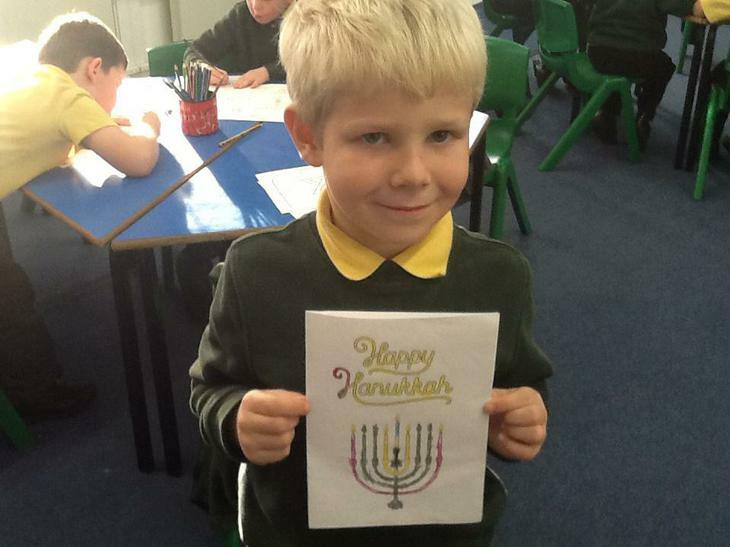 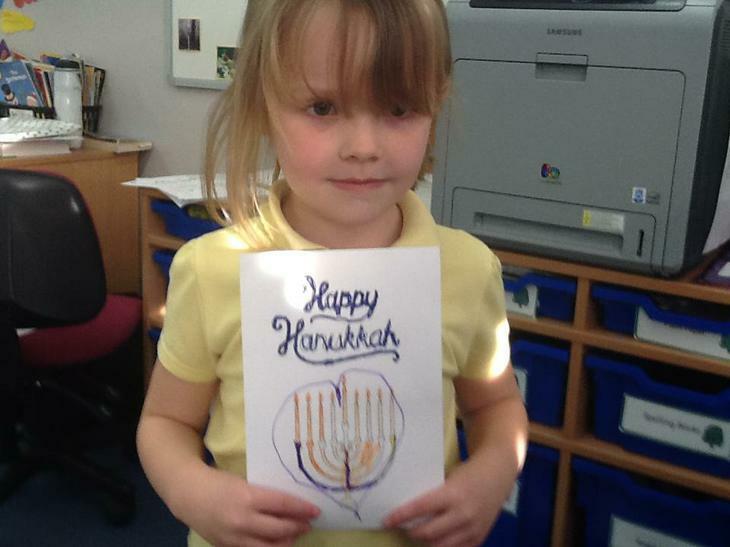 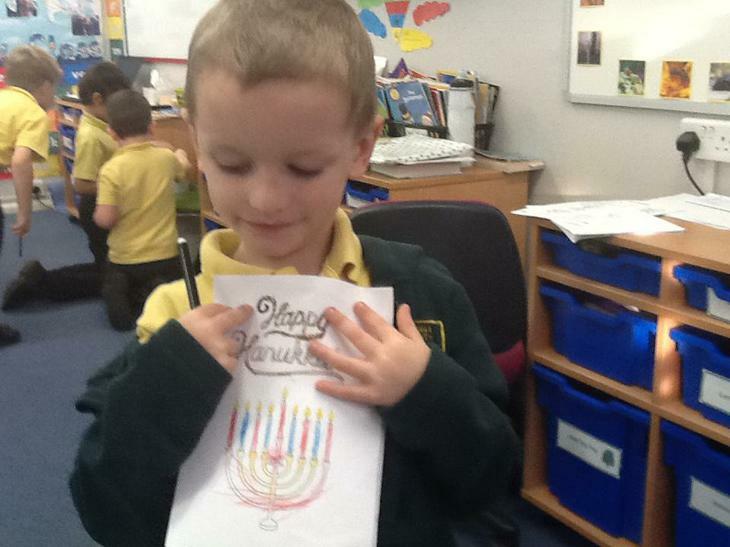 The class decided that they would like to make Happy Hanukkah cards. 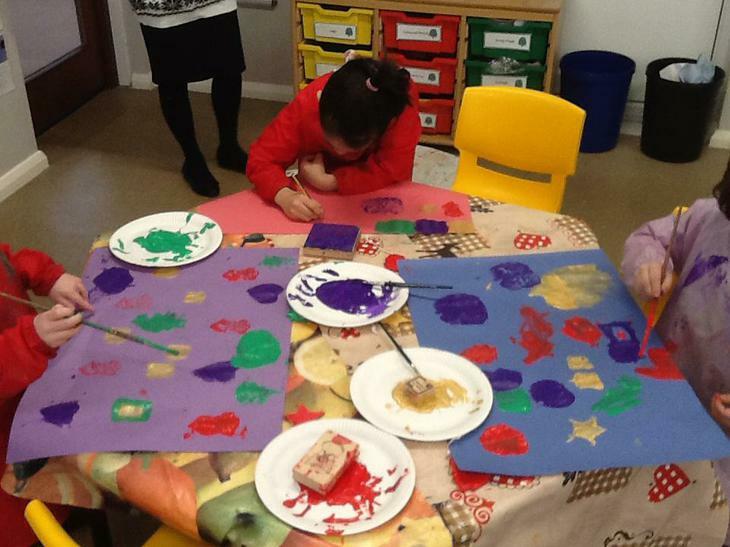 I am sure you will agree they look brilliant. 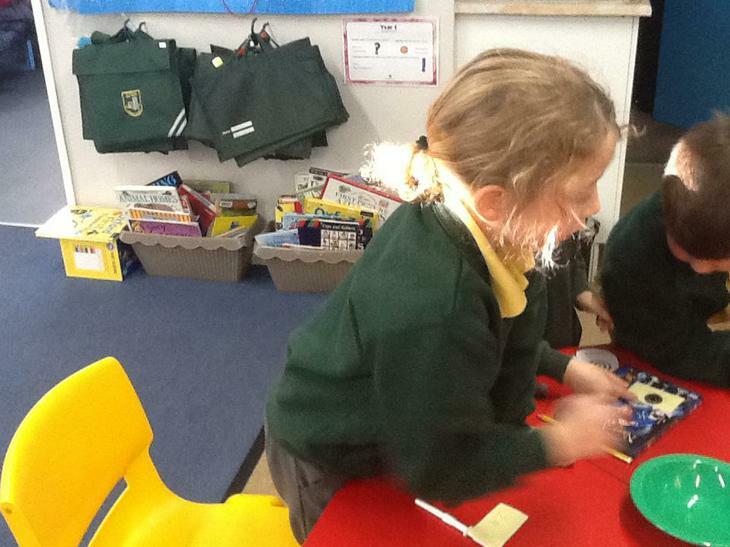 We have had a super week in Willow. 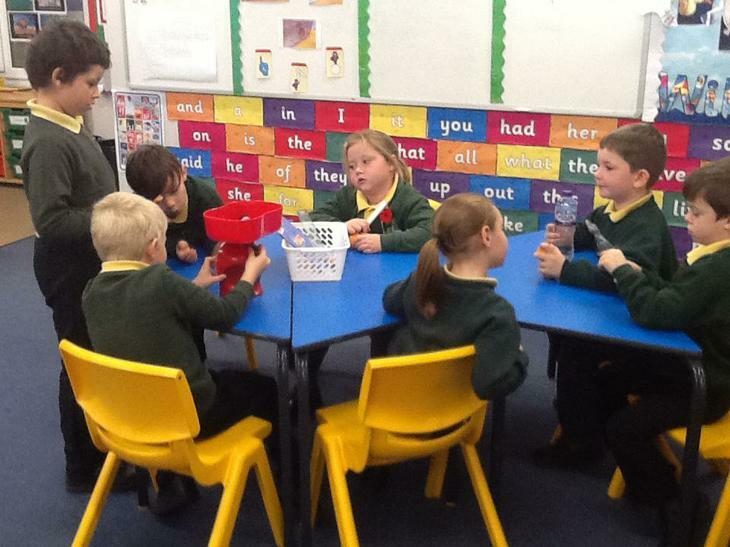 Everyone has been working really hard and we are loving our new topic! 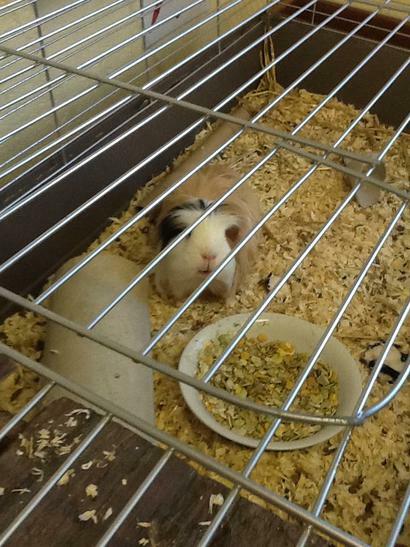 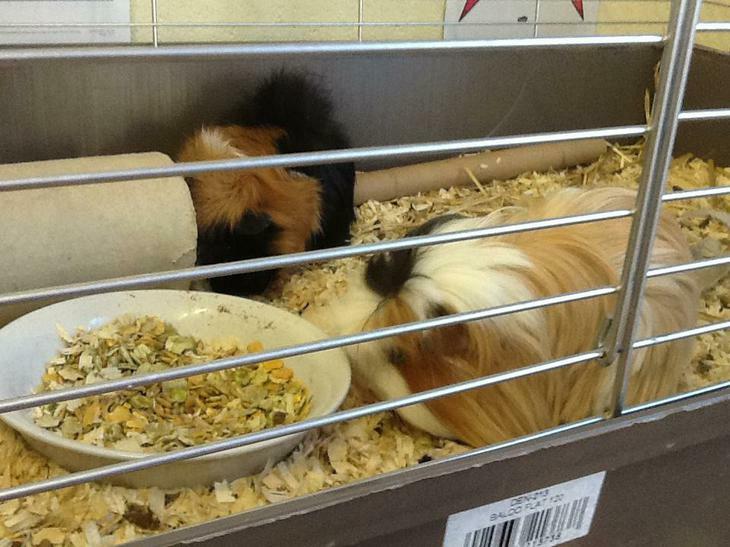 We have been great guinea pig parents and are really enjoying learning how to take care of Rosie and Nibbles. 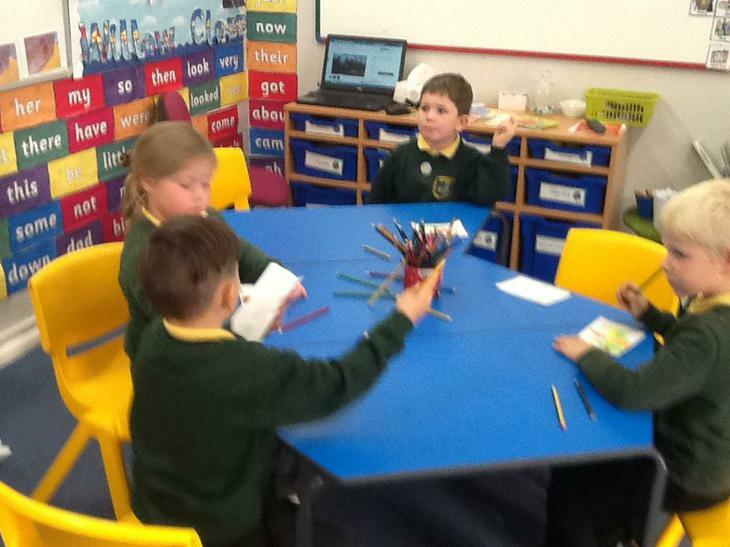 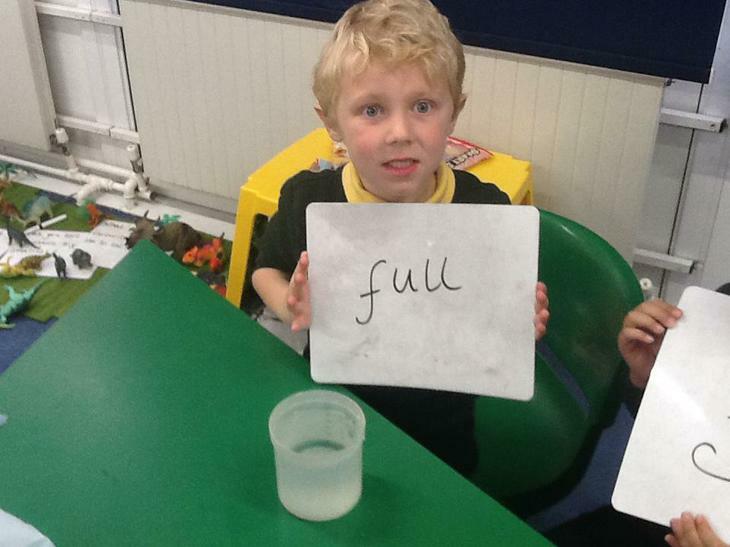 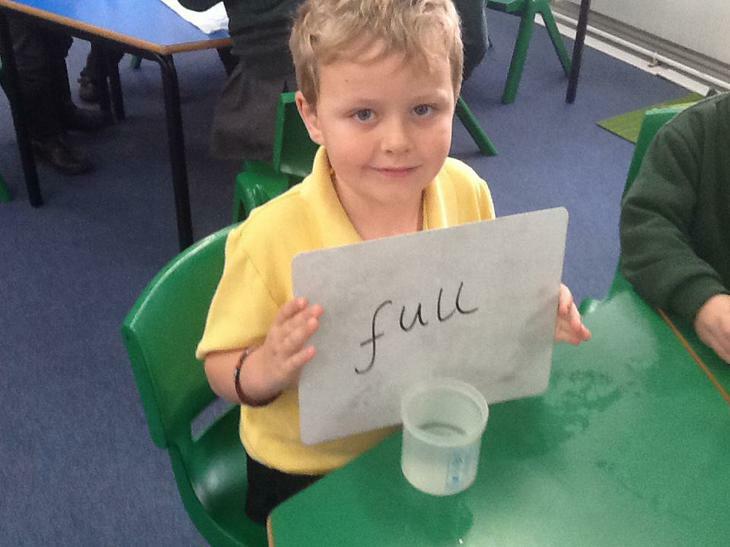 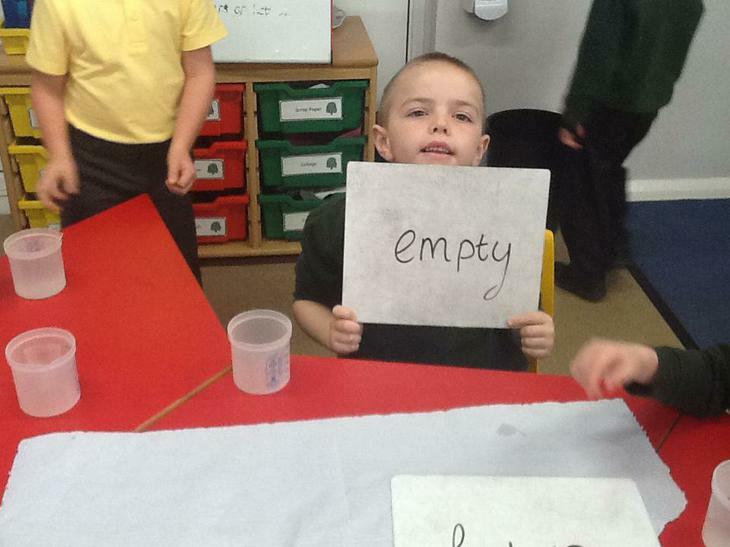 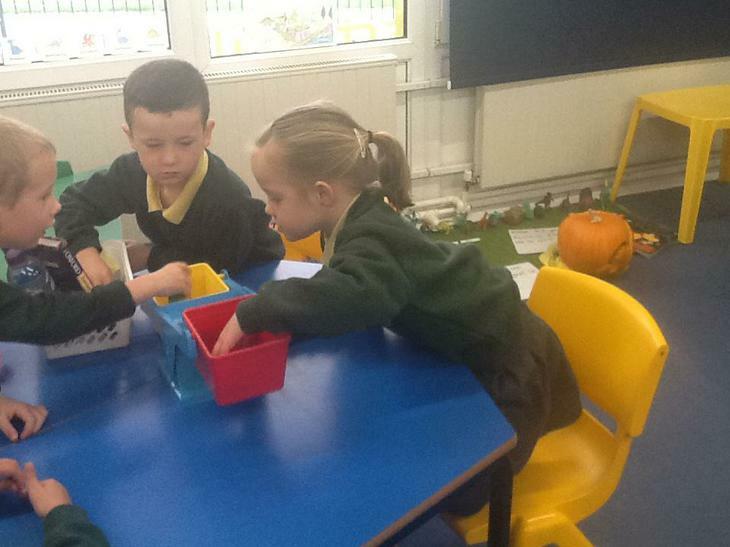 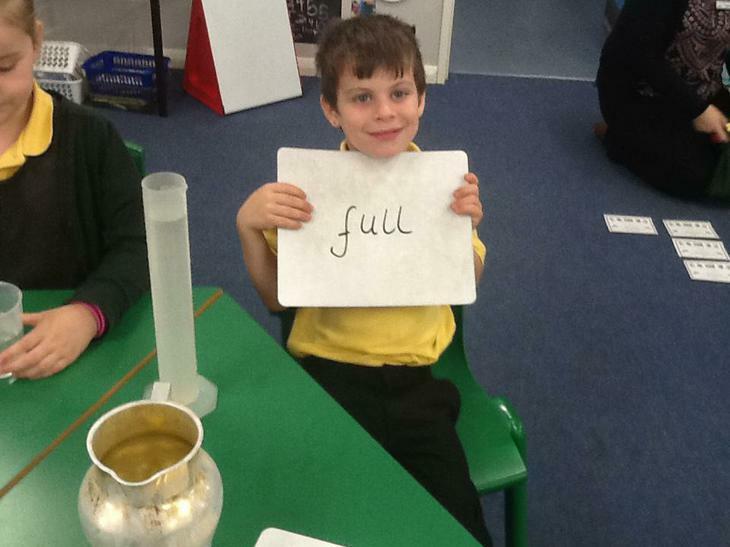 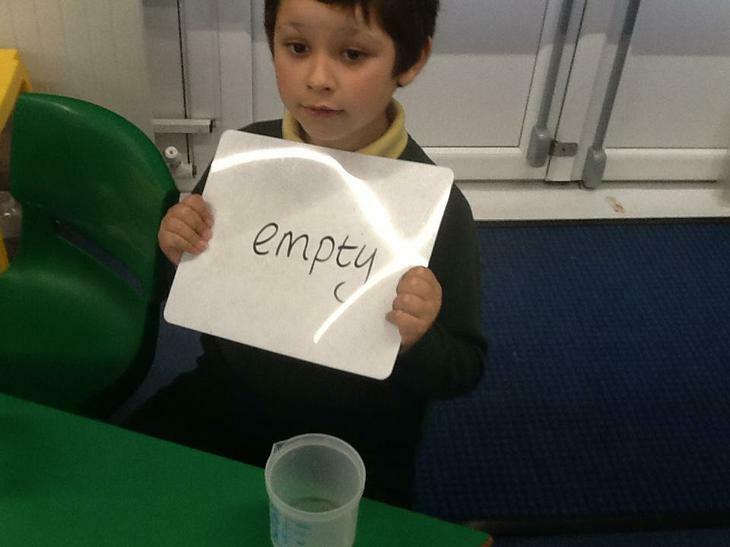 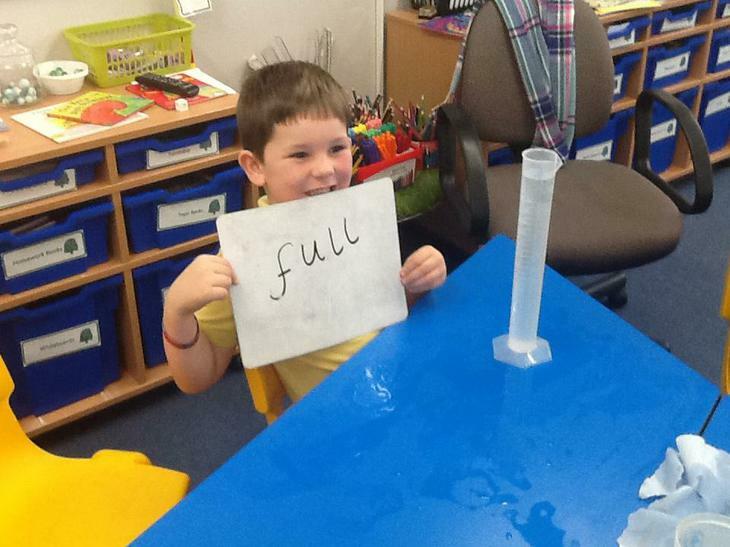 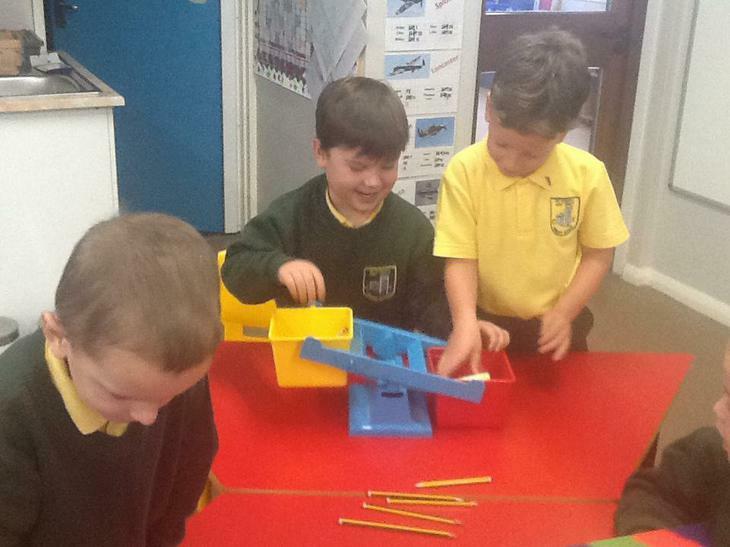 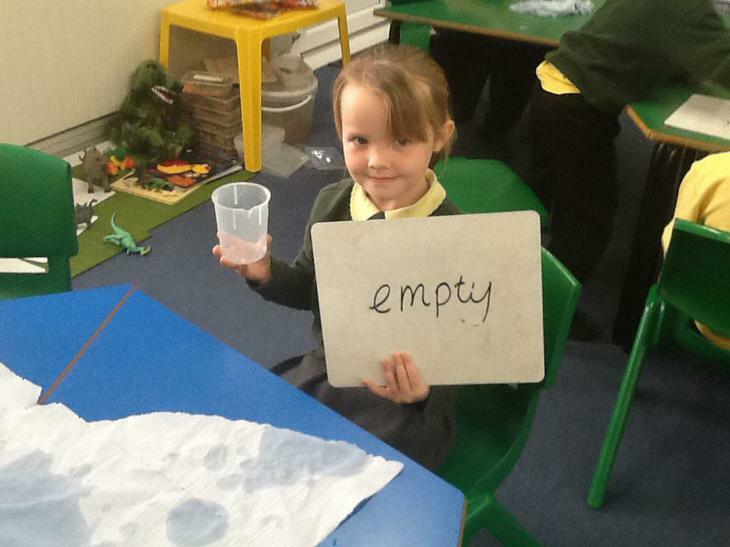 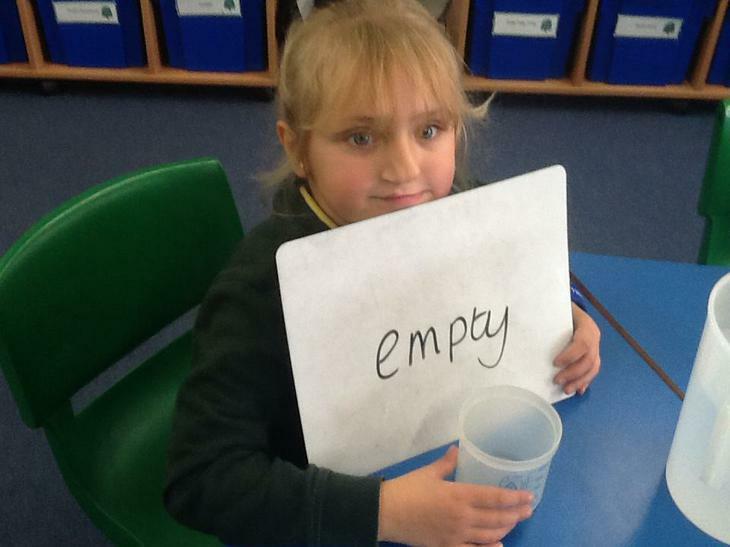 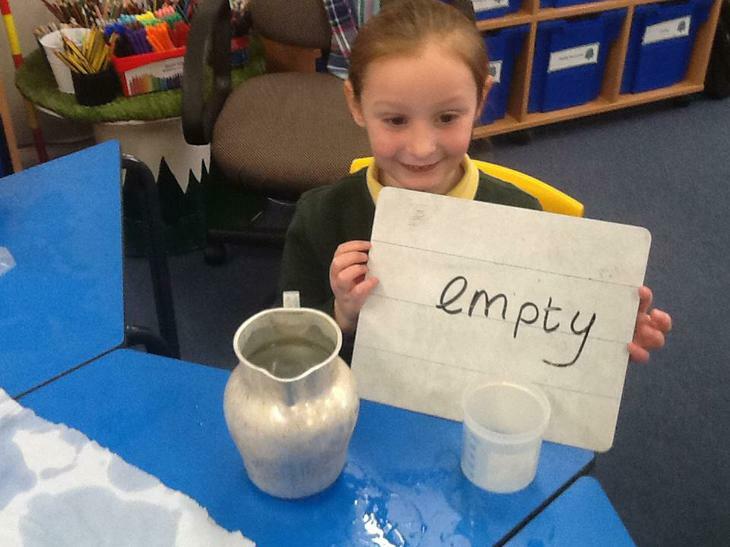 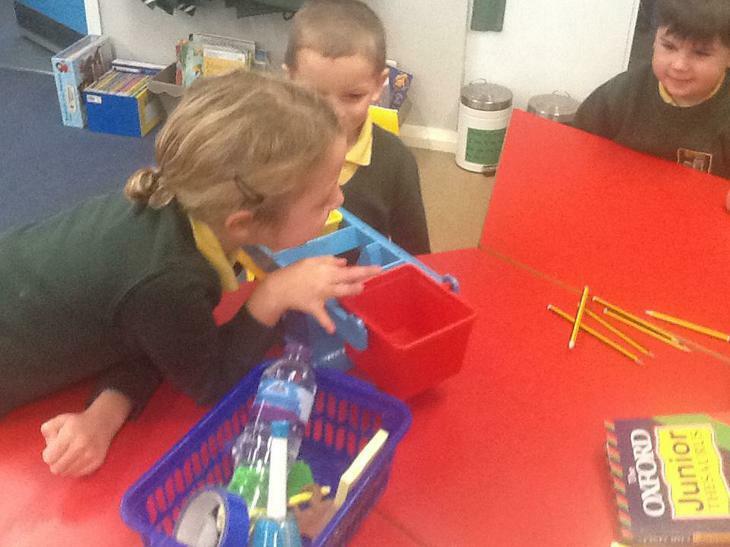 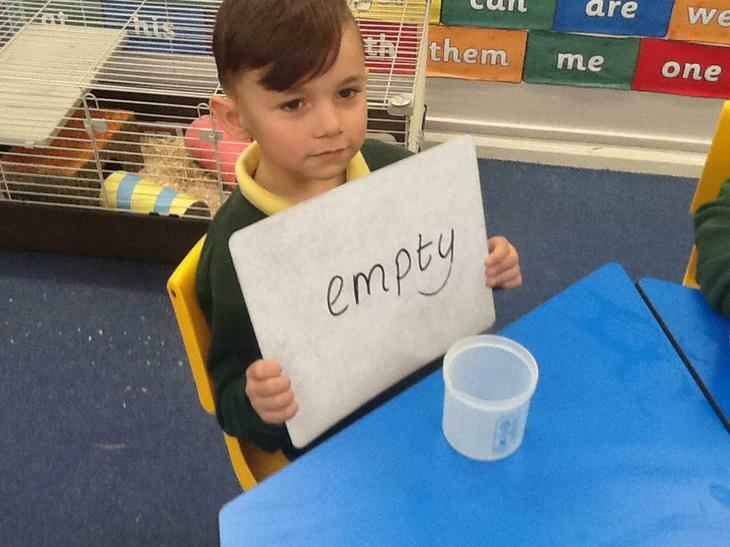 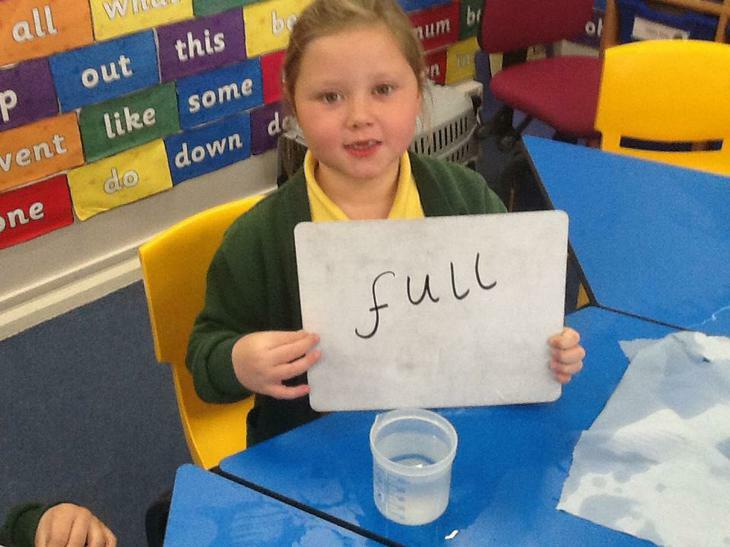 In maths this week we have been learning about length and capacity. 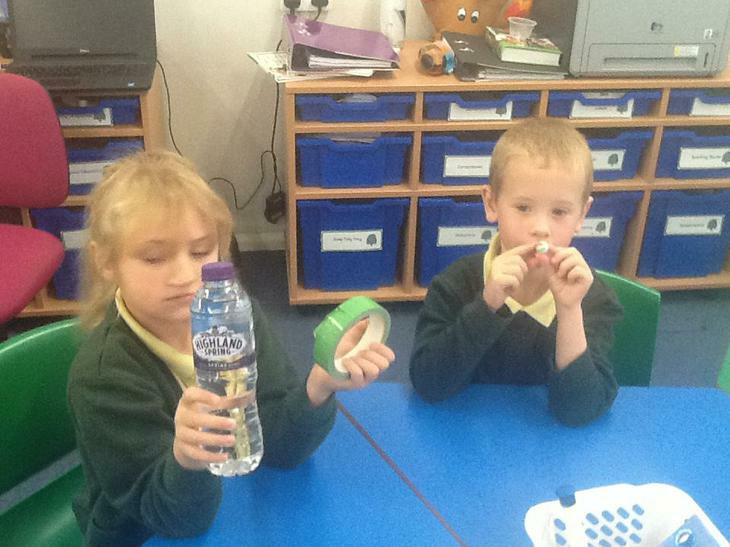 We have been comparing items to find the longest and shortest length and putting them in size order. 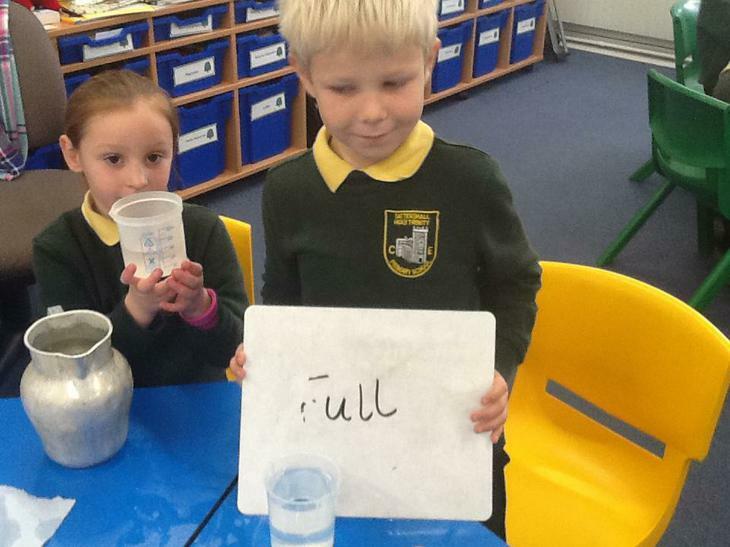 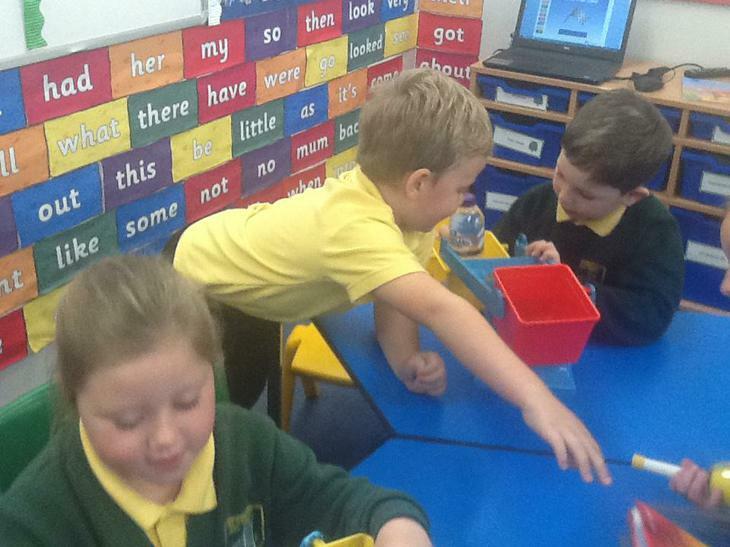 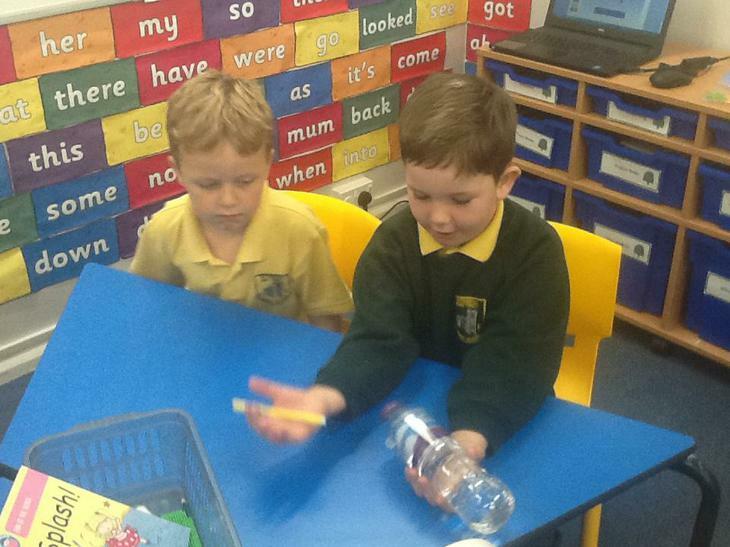 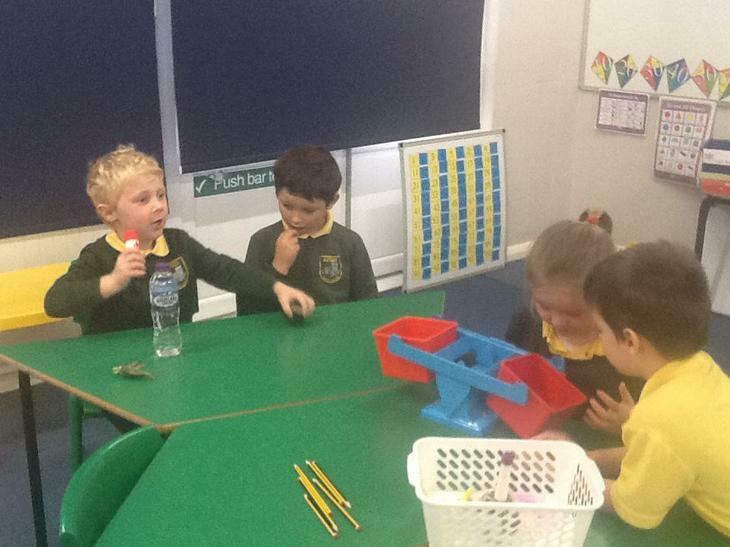 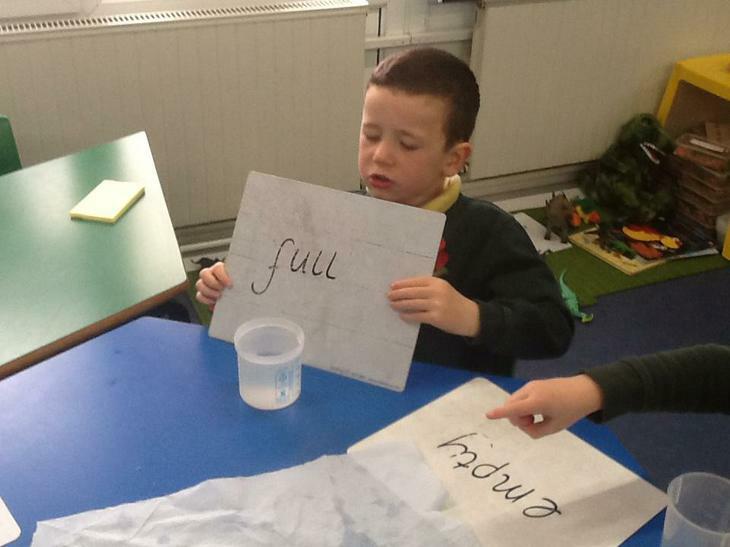 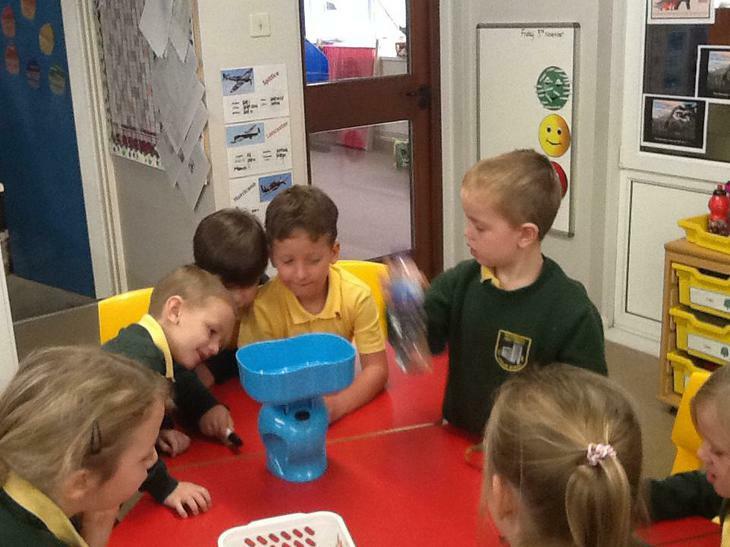 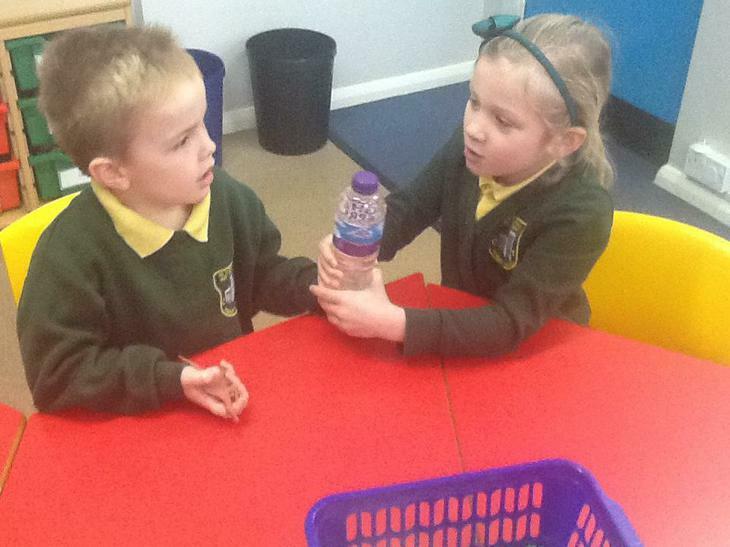 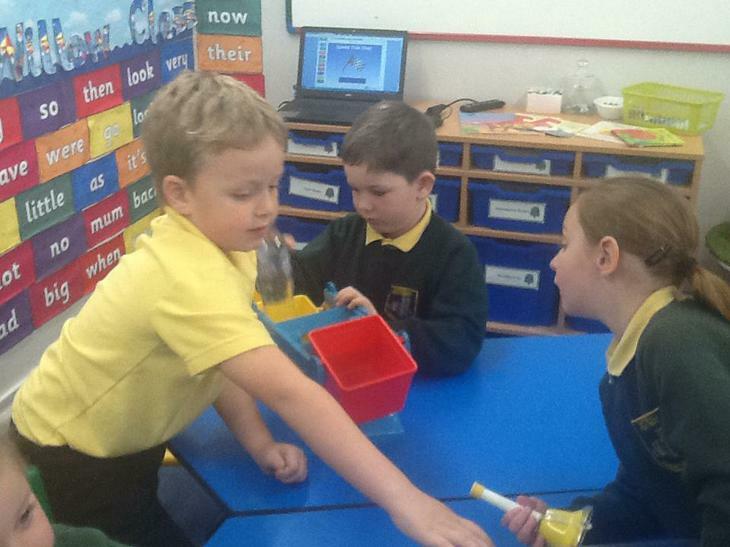 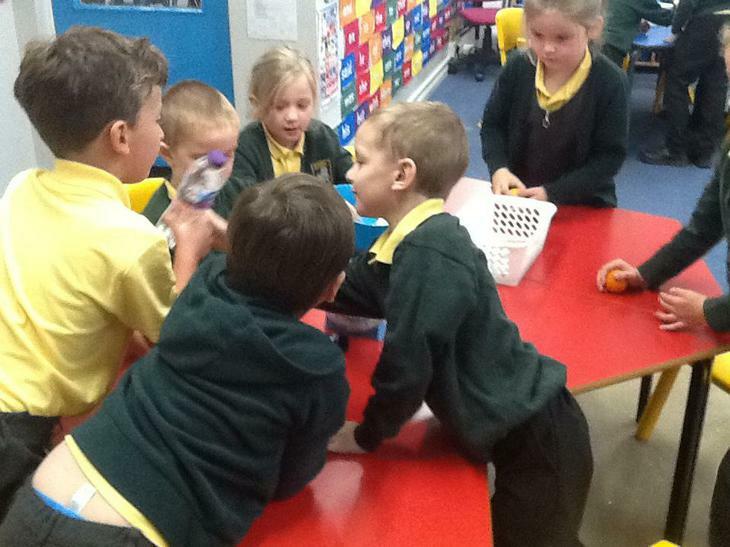 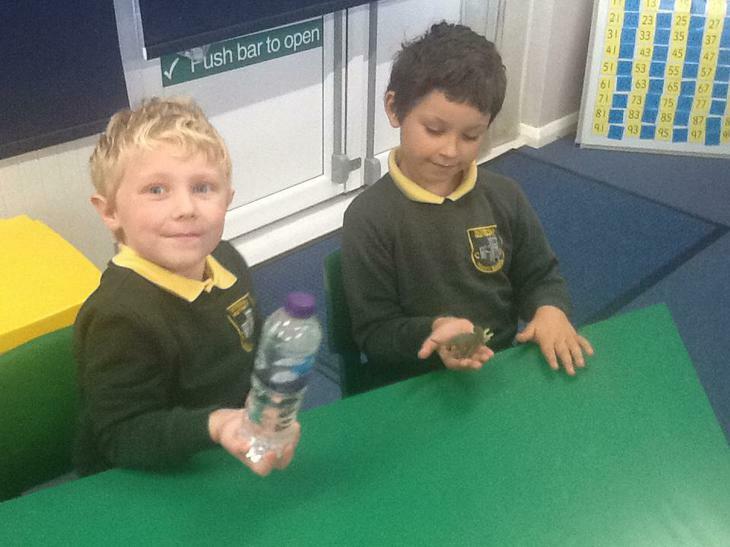 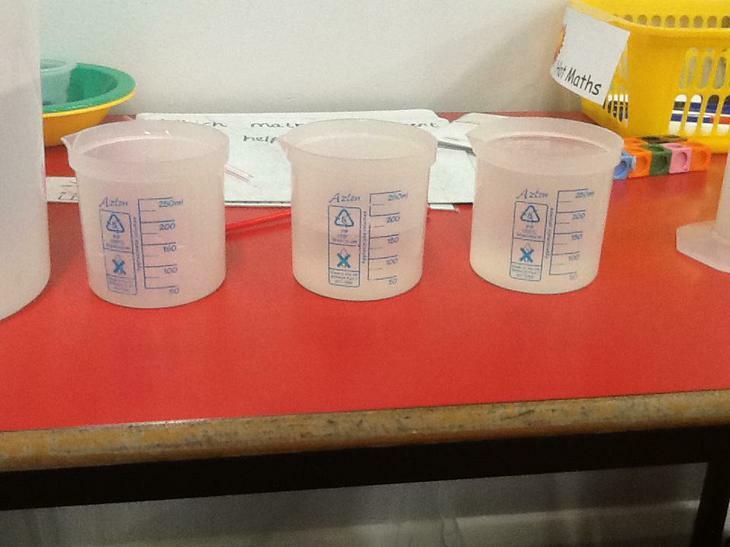 We also looked at different containers and predicted which one we thought would hold the most water. 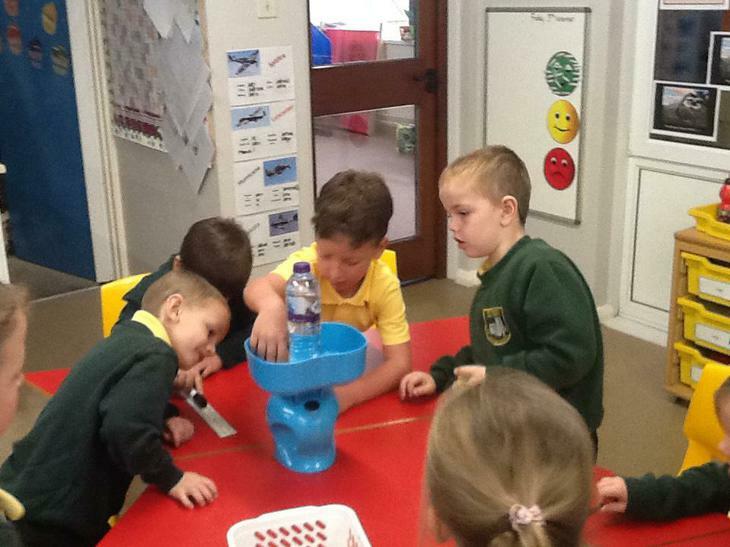 We discovered that the tallest tub does not always hold the most water. 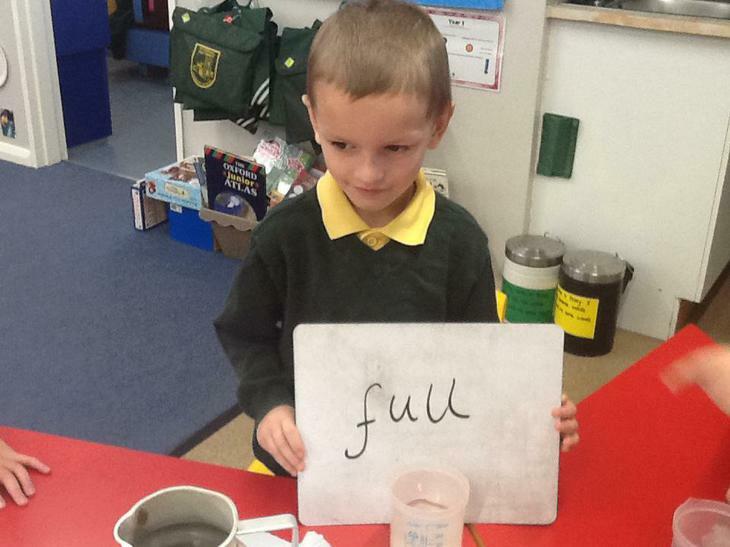 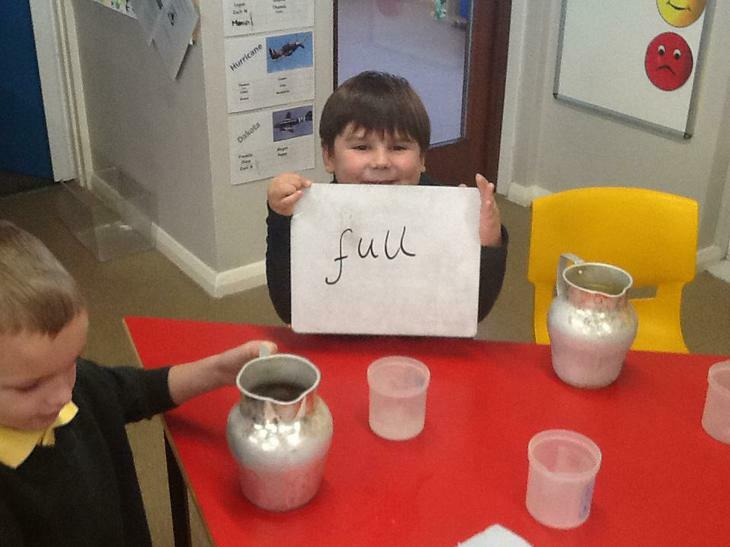 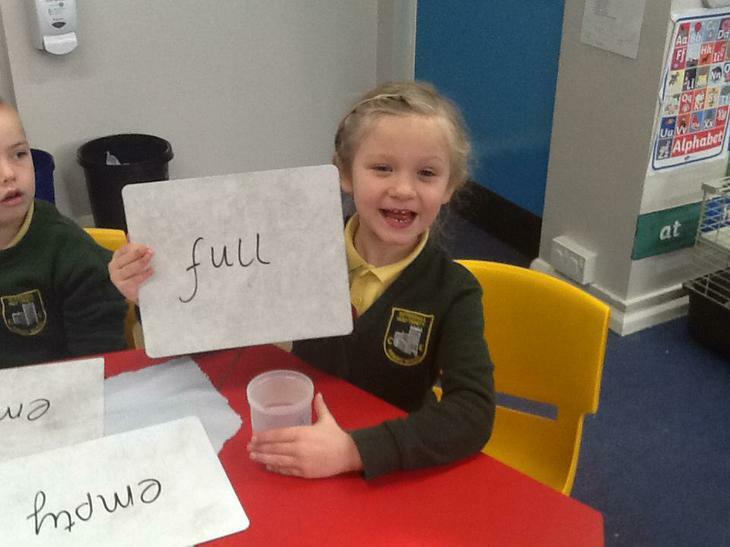 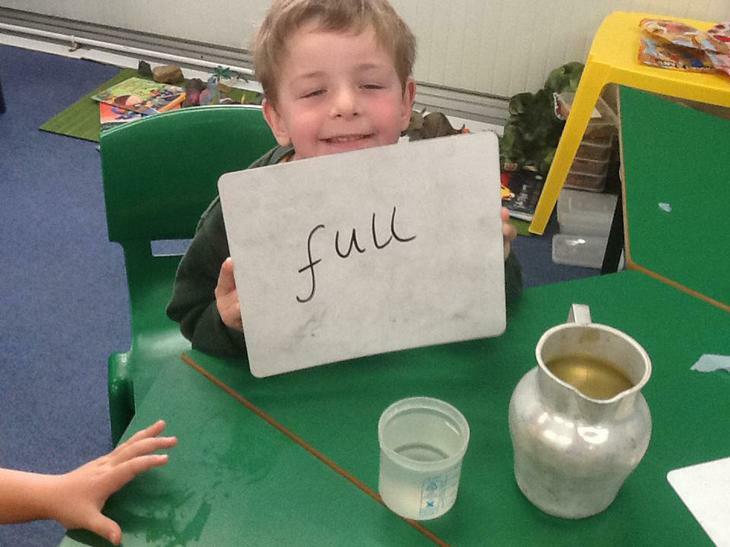 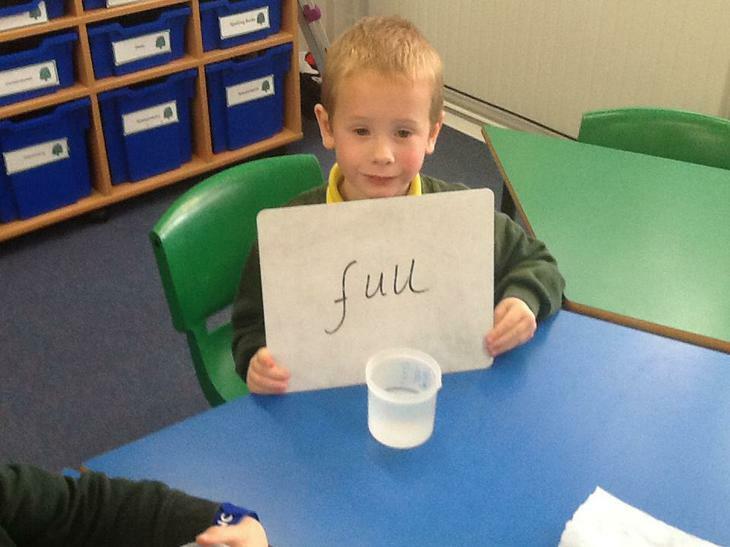 We practised filling containers half and full. 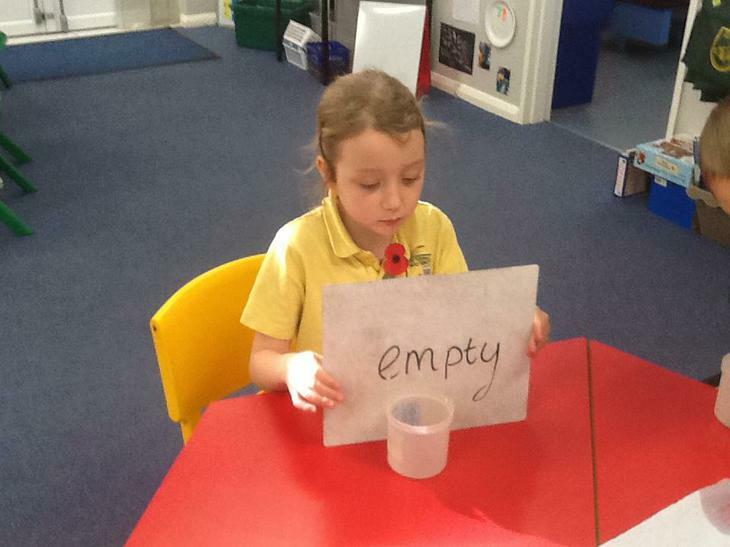 This week we have been learning more about remembrance day and poppies. 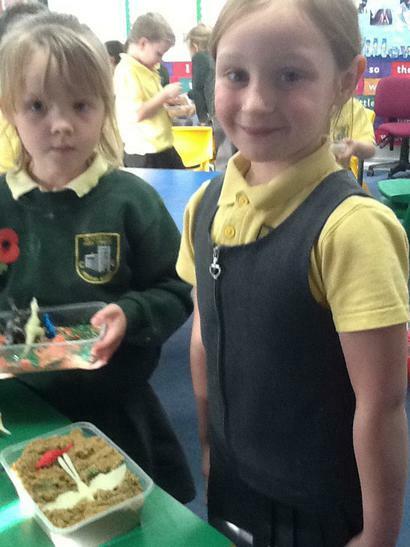 We found out more about why we wear poppies and the important work that can be done because we buy them. 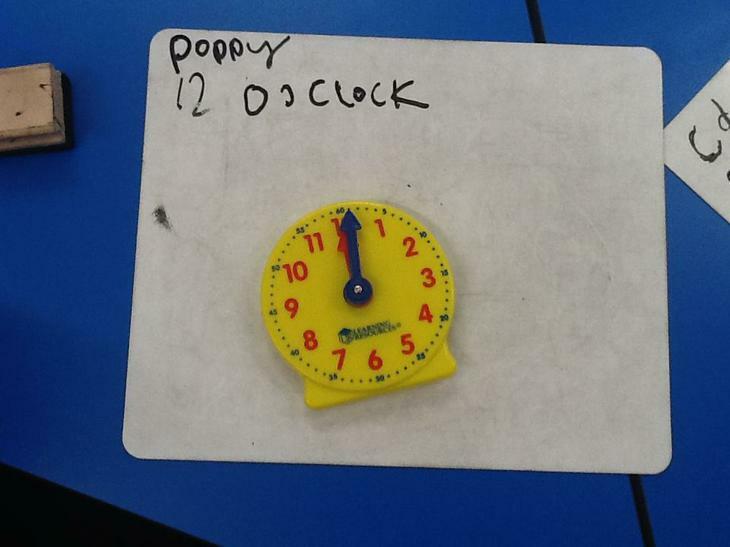 We decided we would like to create poppy poems and so we used OSIE grids to help us gather information. 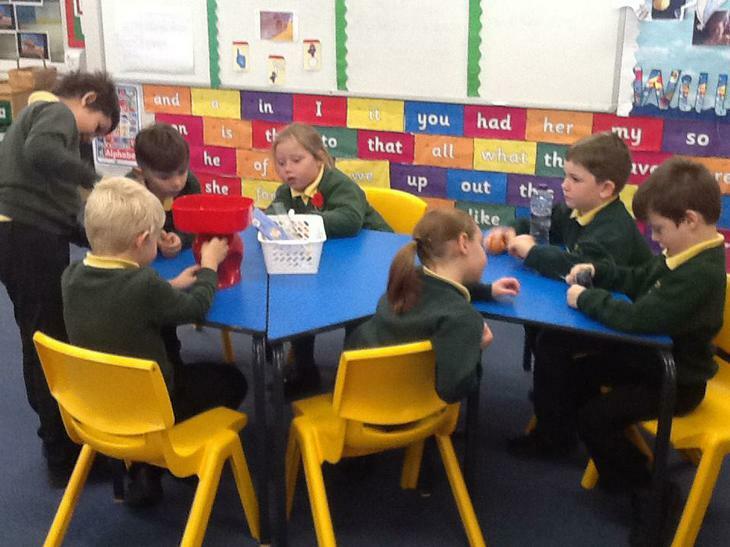 We had expert groups which gathered words for each OSIE box and we then shared these for everyone to use. 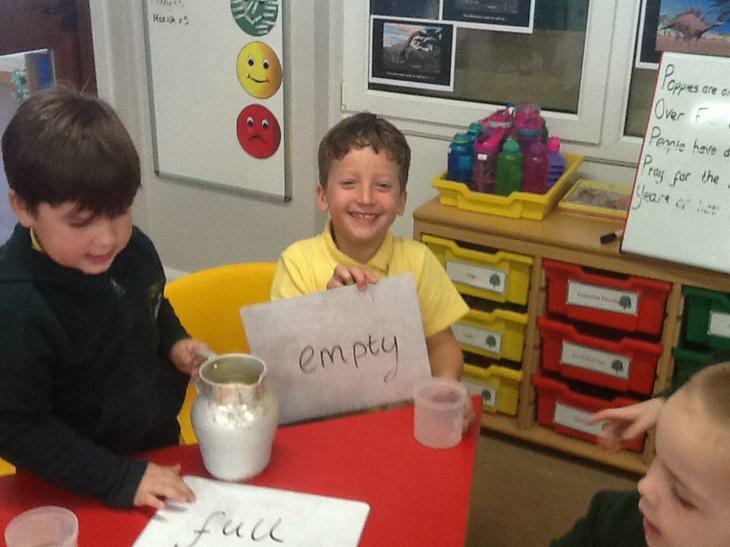 we then used these words to help us create our acrostic poems. 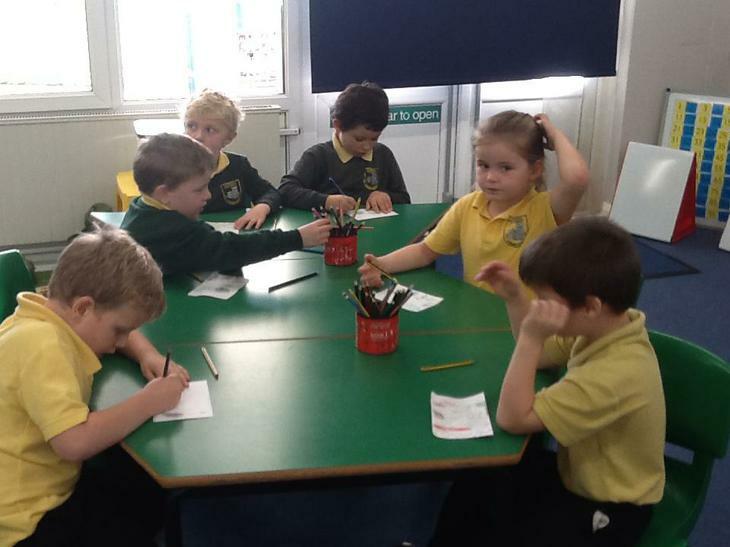 We really enjoyed created our own poems about poppies. 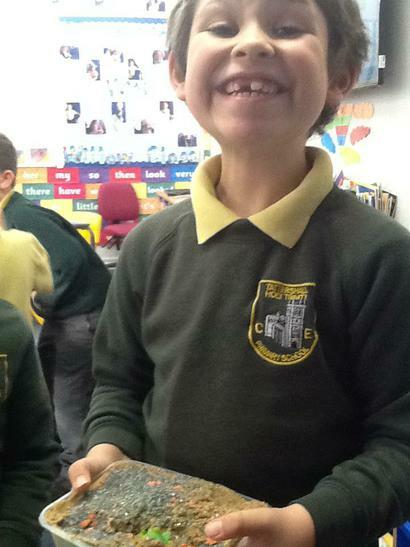 Ollie would like to share his with you! 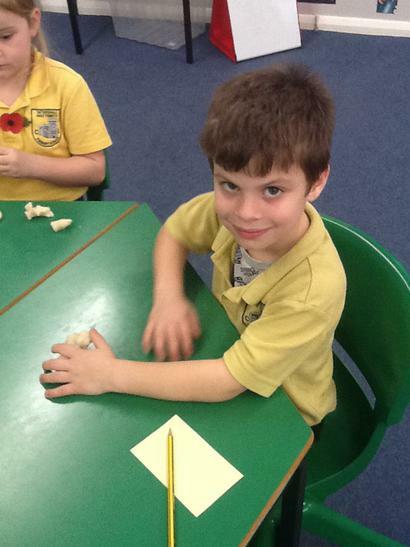 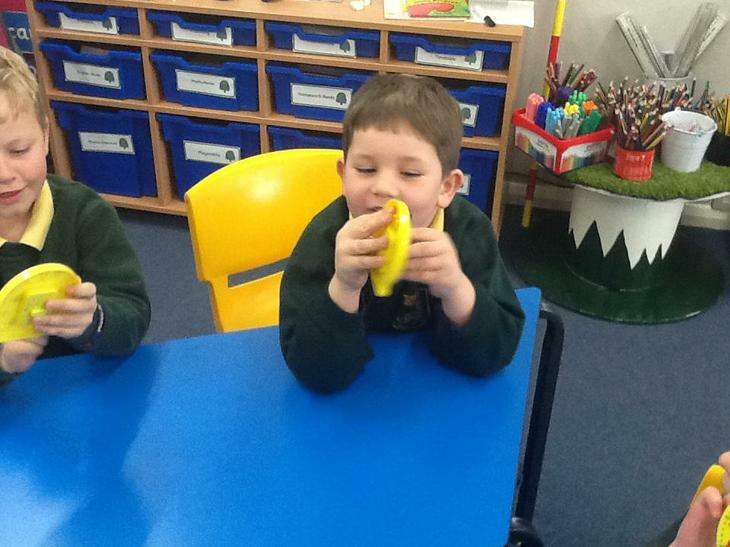 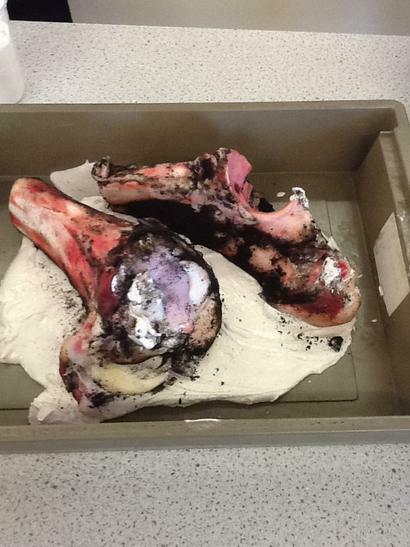 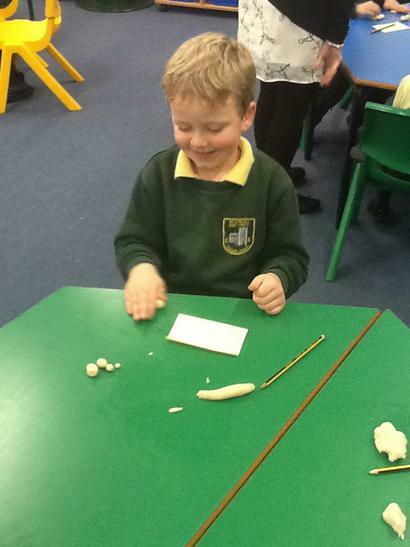 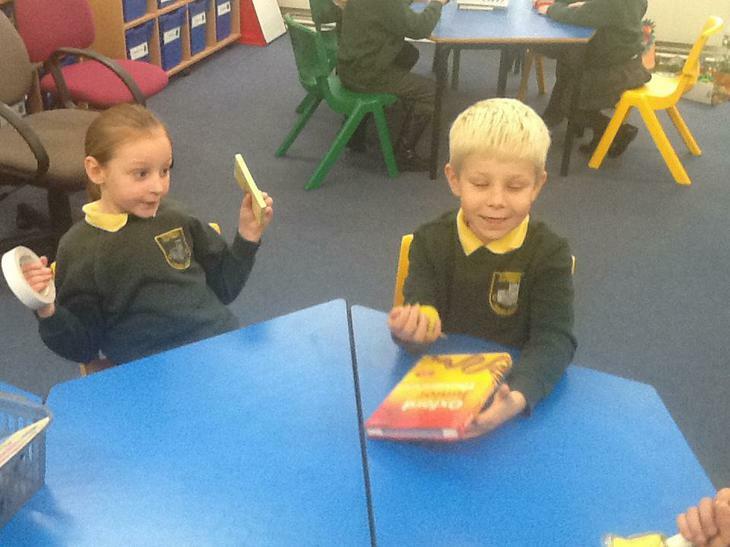 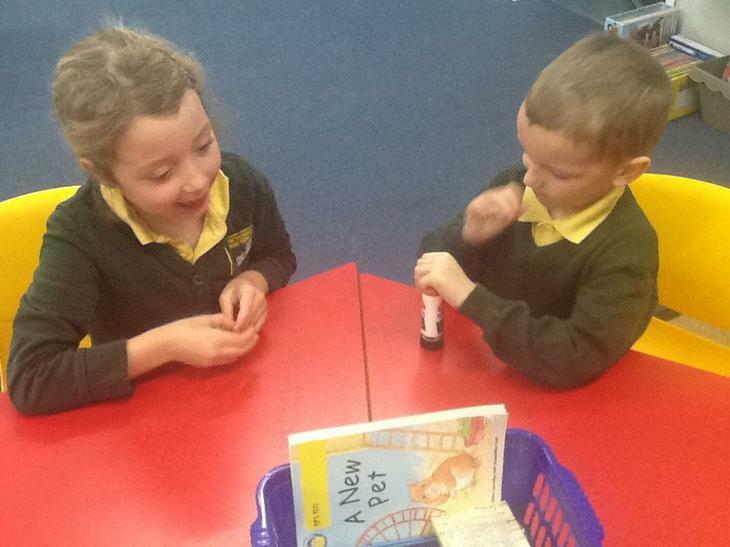 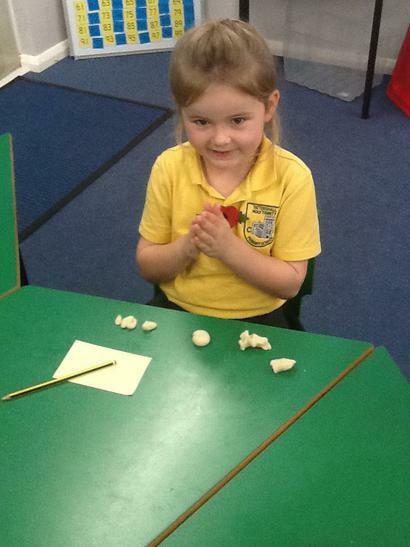 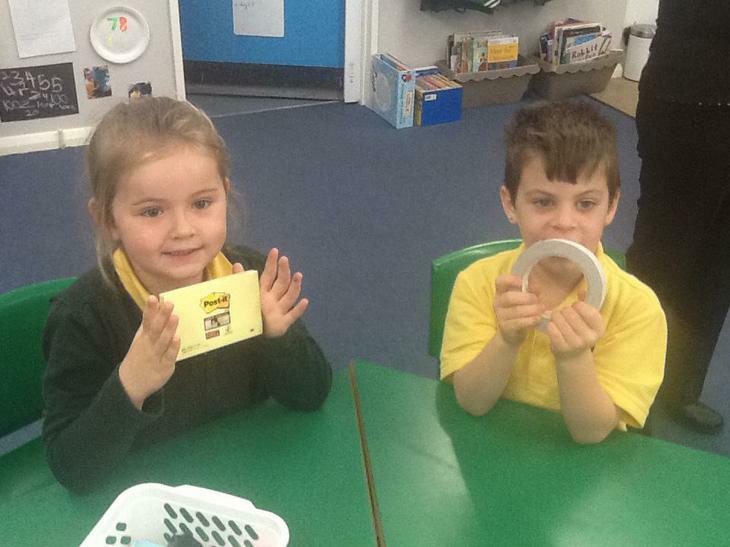 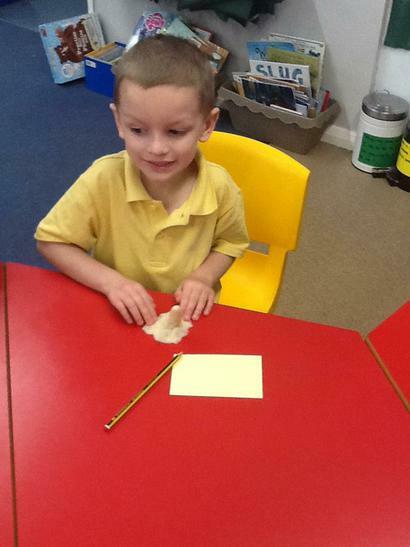 As part of our science work this week we learnt more about teeth. 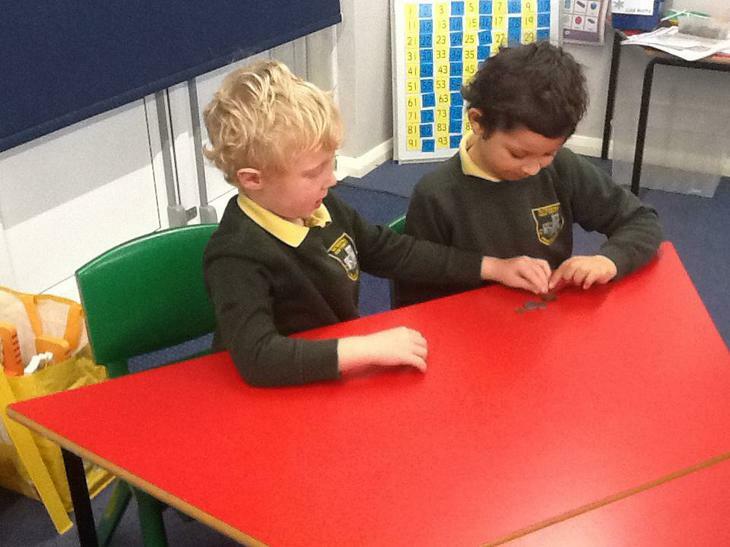 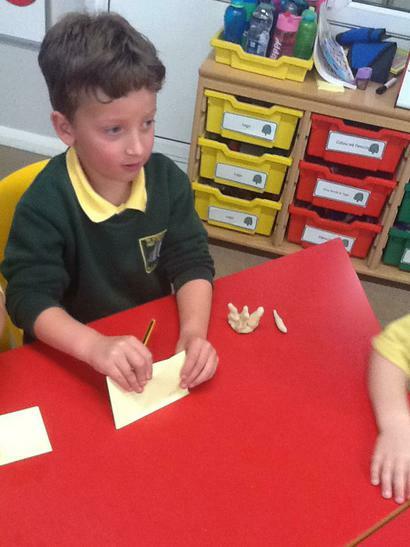 We wanted to work out what kind of teeth different dinosaurs might have had. 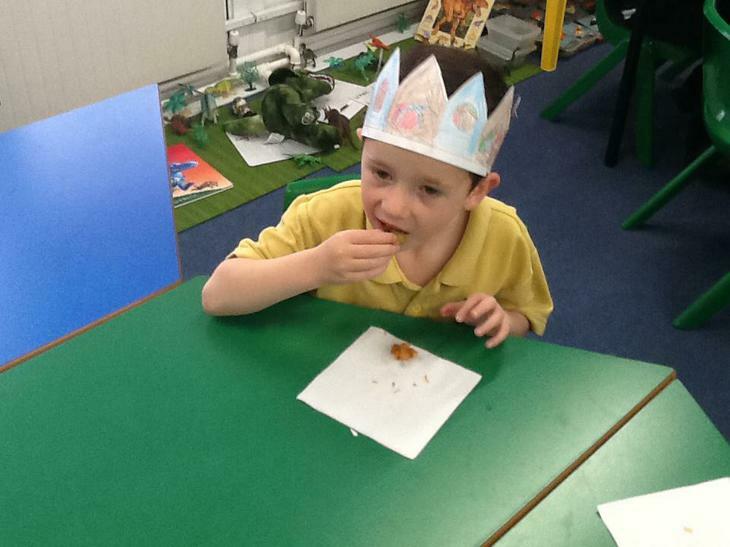 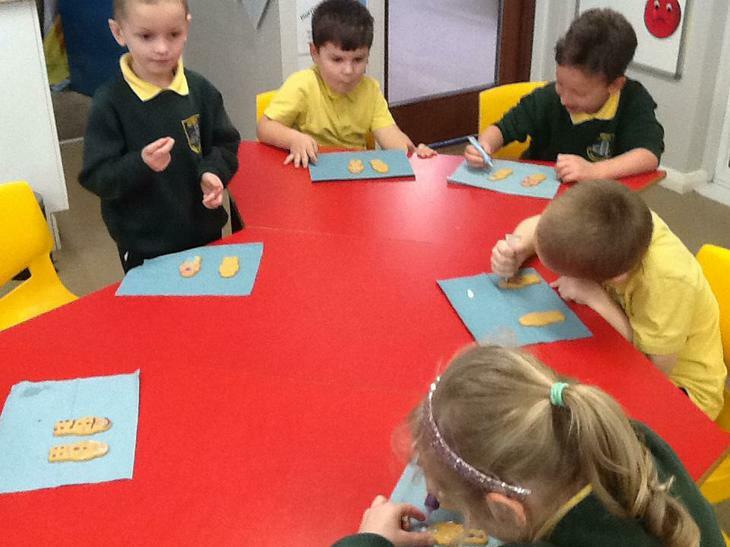 We learnt that not all dinosaurs ate the same foods and depending on what they ate they had different teeth! 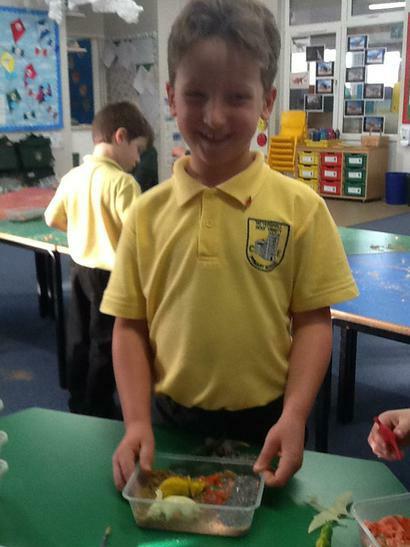 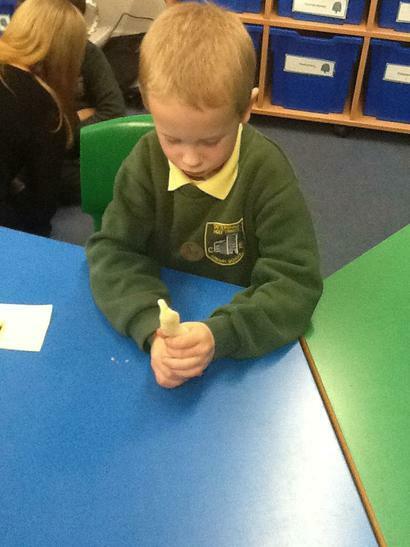 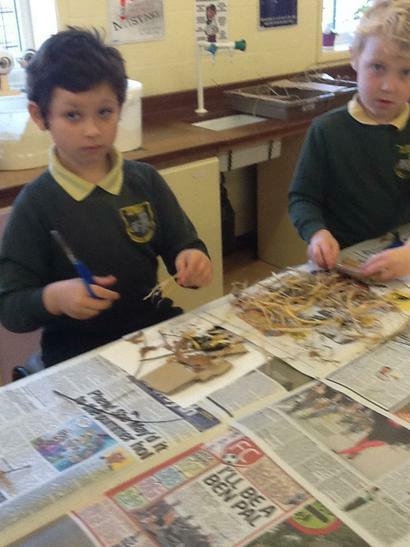 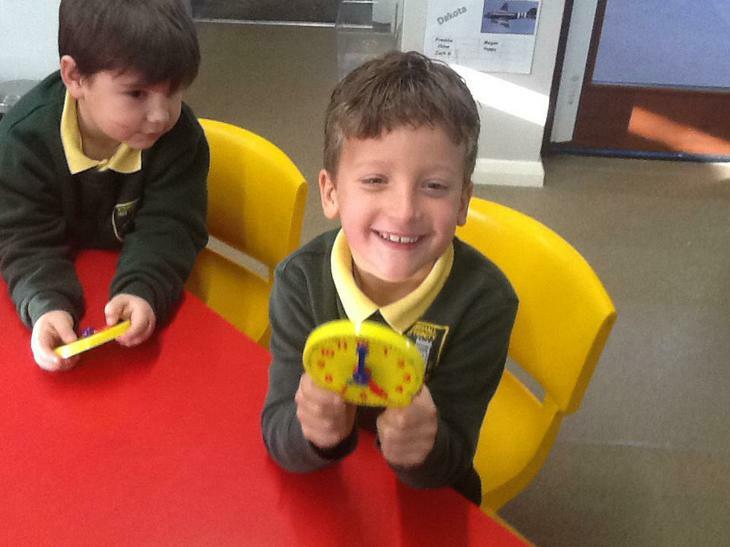 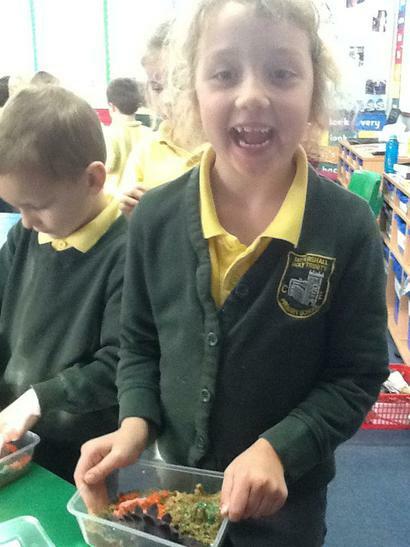 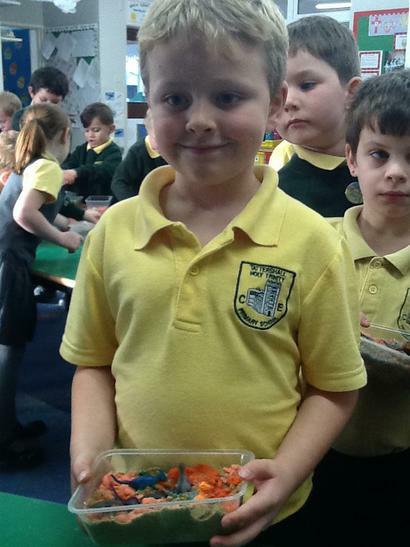 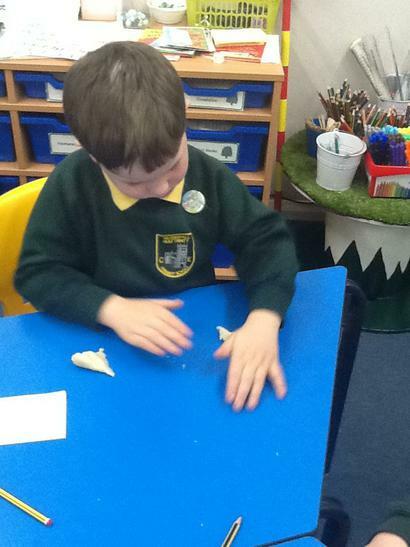 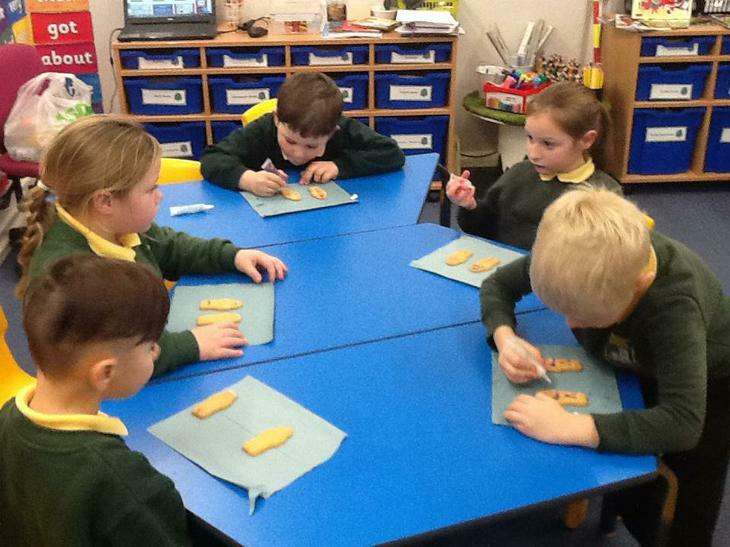 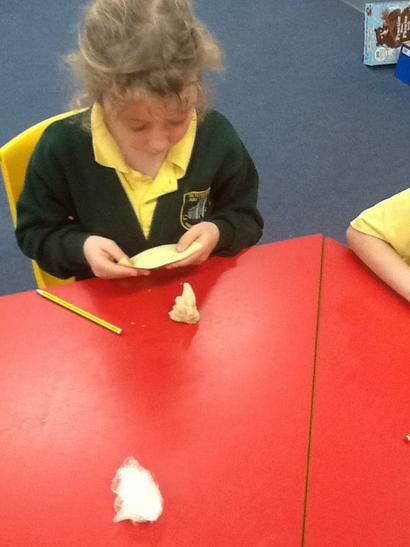 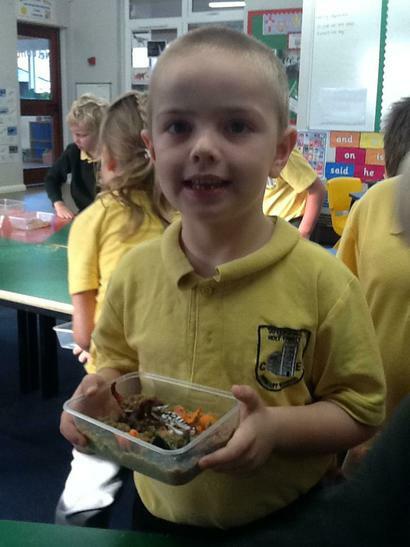 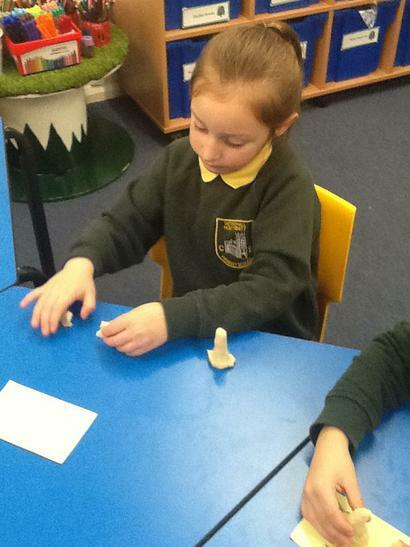 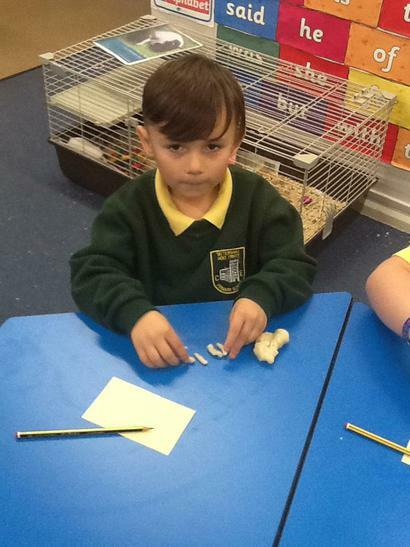 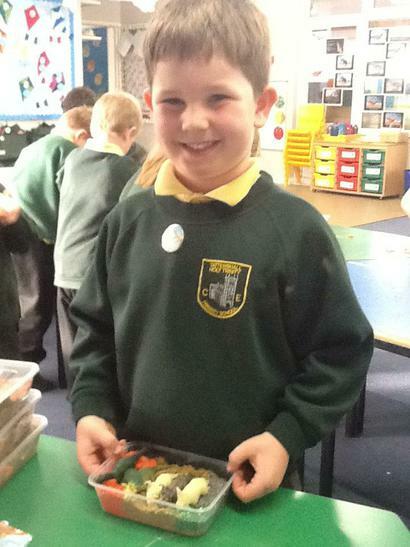 We had great fun making our own dinosaur teeth for different dinosaurs. 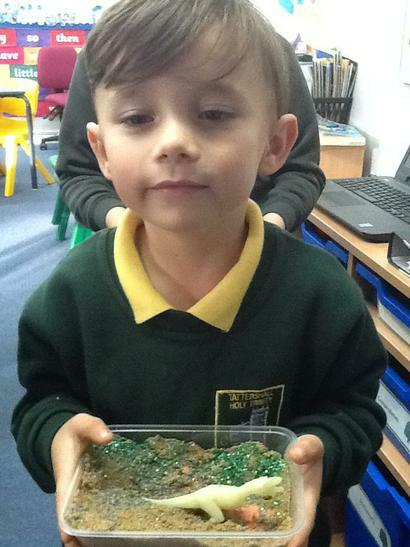 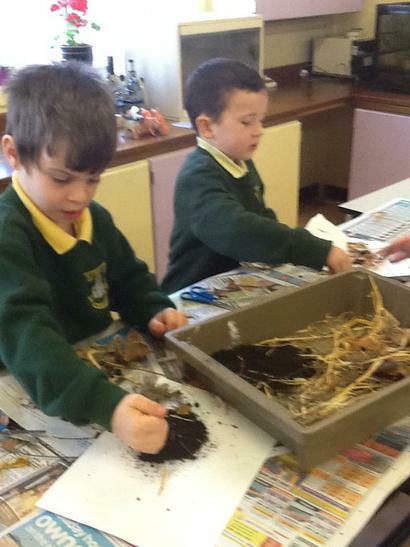 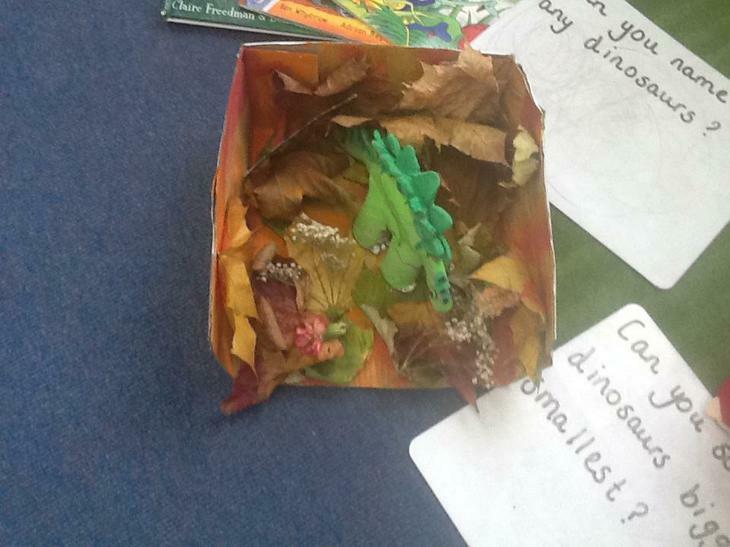 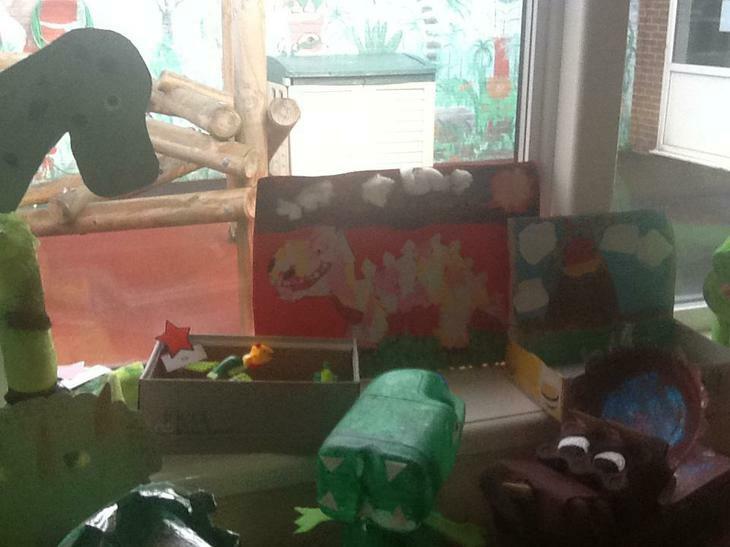 We have created our own dinosaur terrains for our miniature dinosaurs to live in. 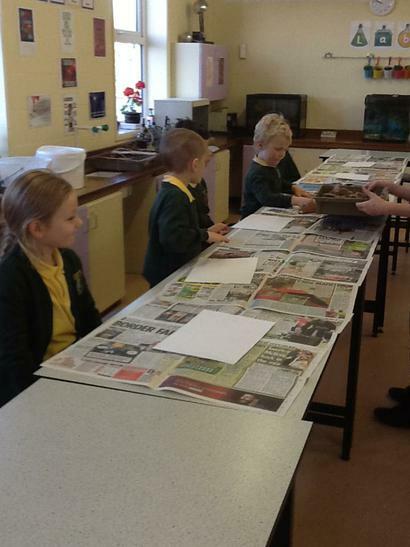 Firstly we compared pictures of where we live today and where people thought dinosaurs lived long ago. 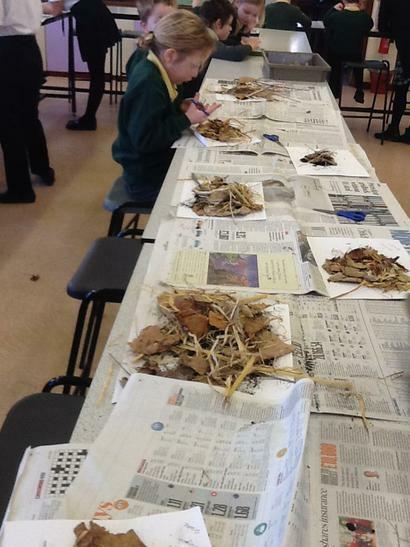 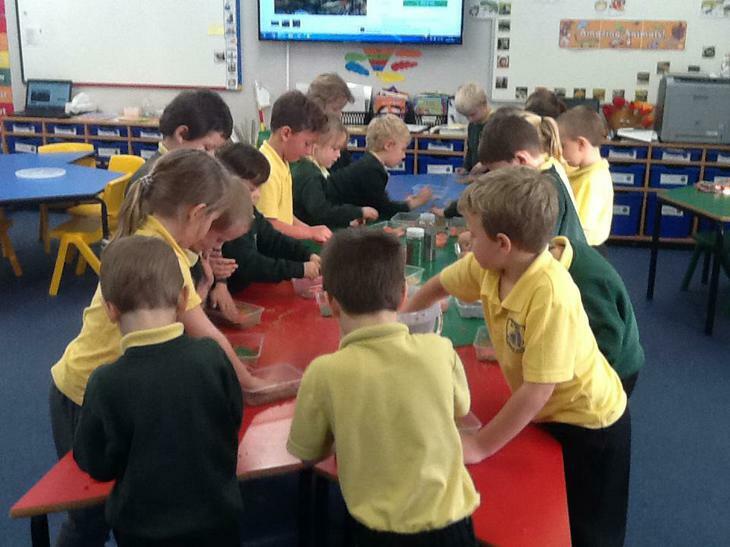 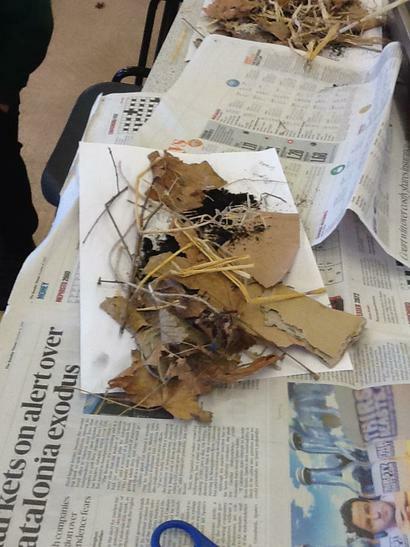 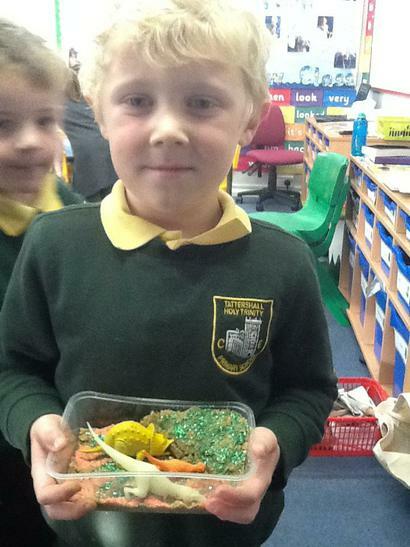 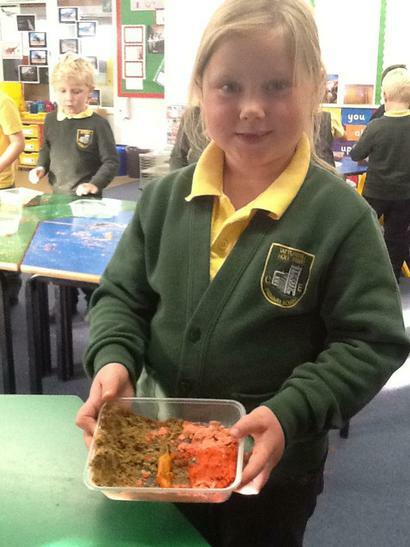 We thought about what the environment might have been like and recreated it using a range of different sands. 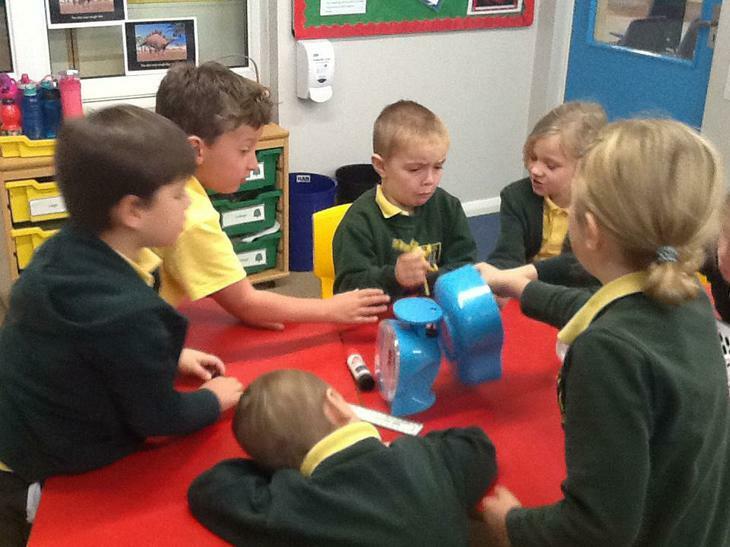 We had great fun this afternoon making our own dinosaur song. 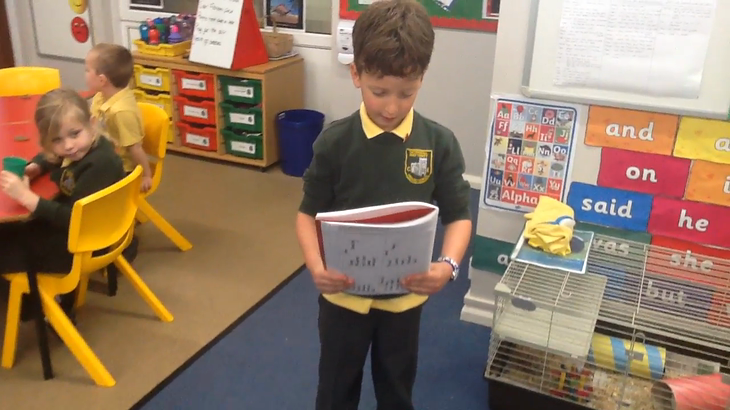 We used the tune from 'the wheels on the bus' but put our own words in. 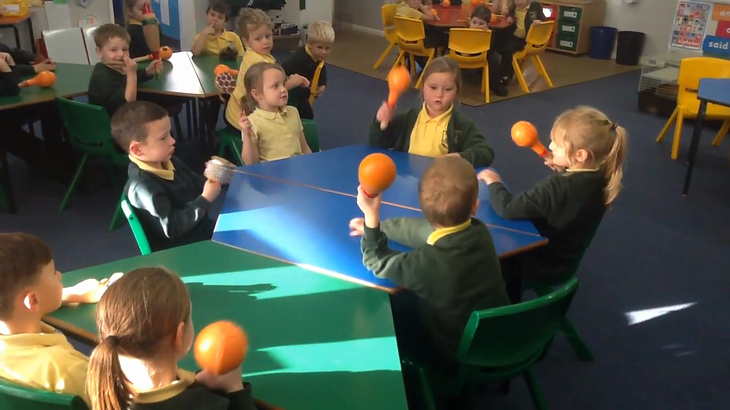 We used different musical instruments to add effects to our song. 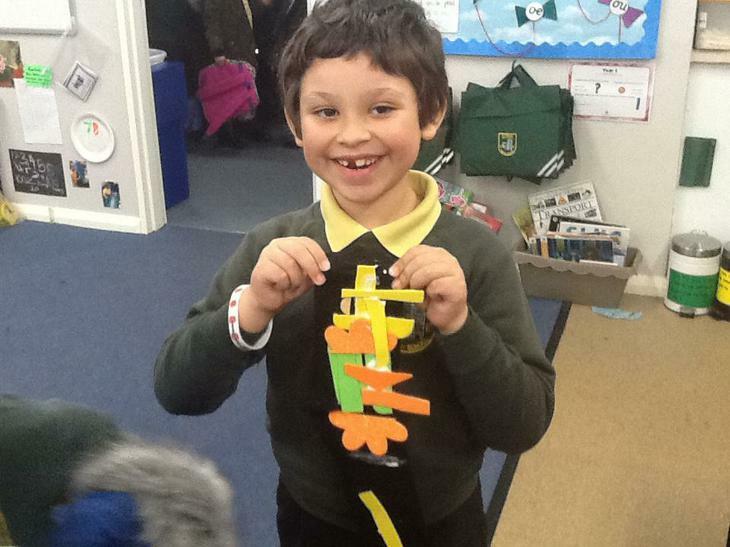 We think it is brilliant and hope you like it! 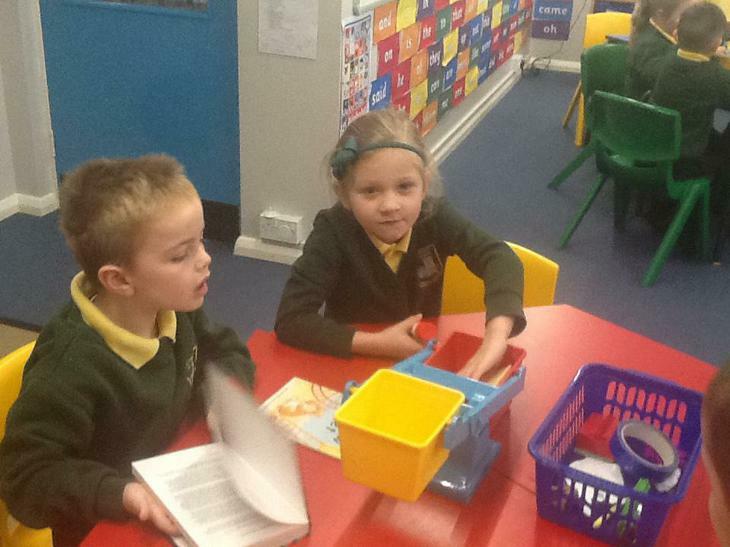 We have had a great first week back at school. 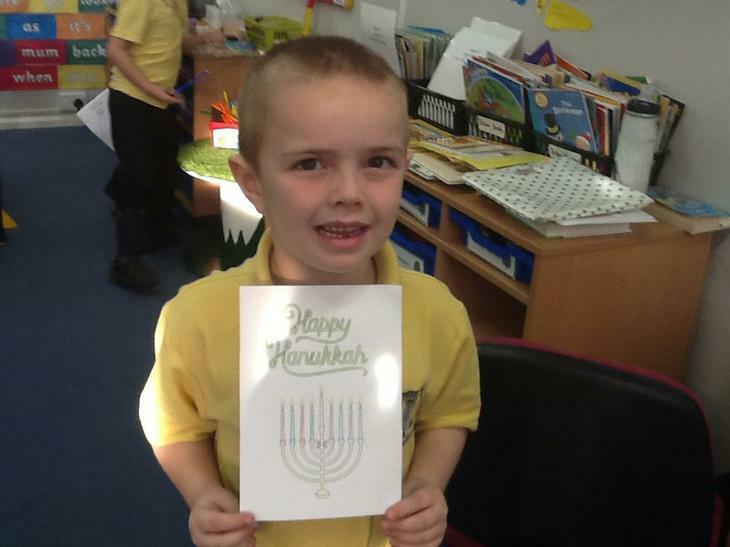 Thank you to everyone for the amazing holiday homework. 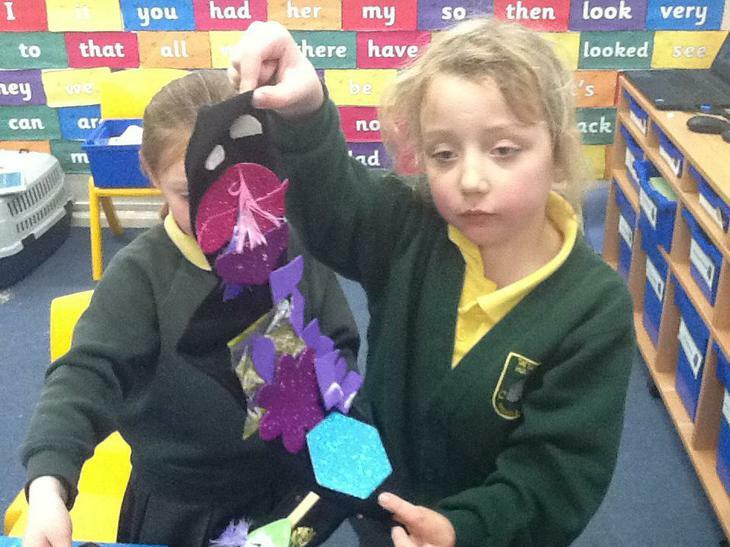 The children have told me all about their models and how they made them. 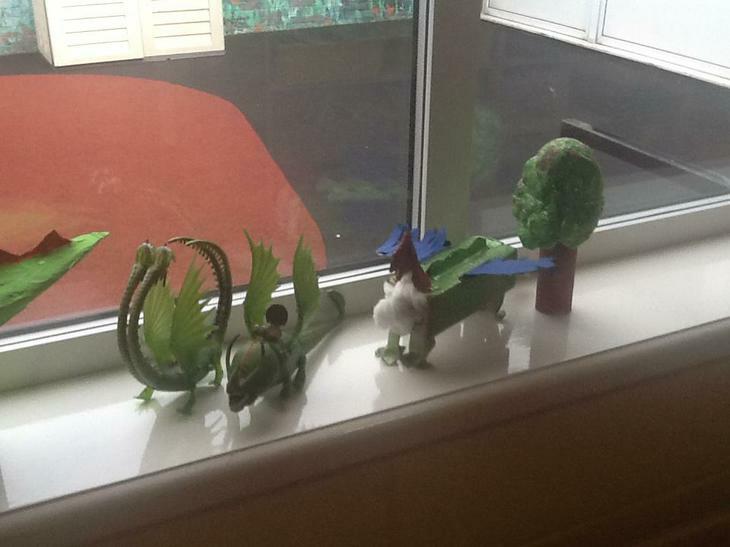 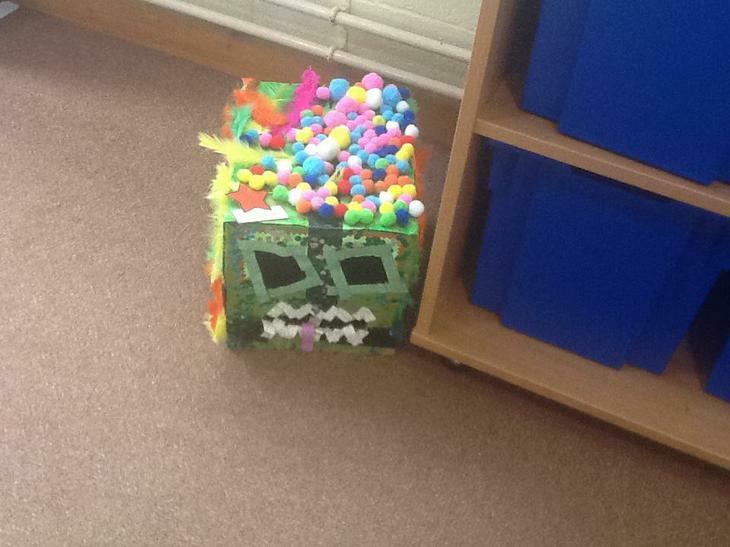 They look fantastic and are in the shared area outside the classroom if you would like to see them. 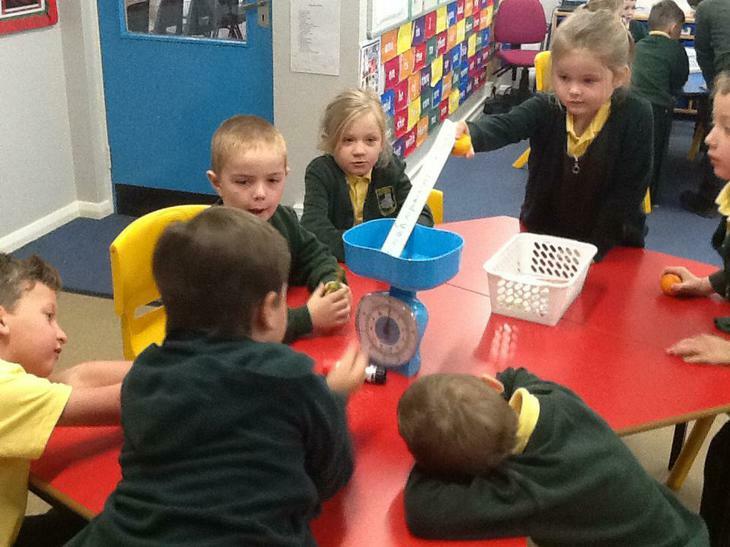 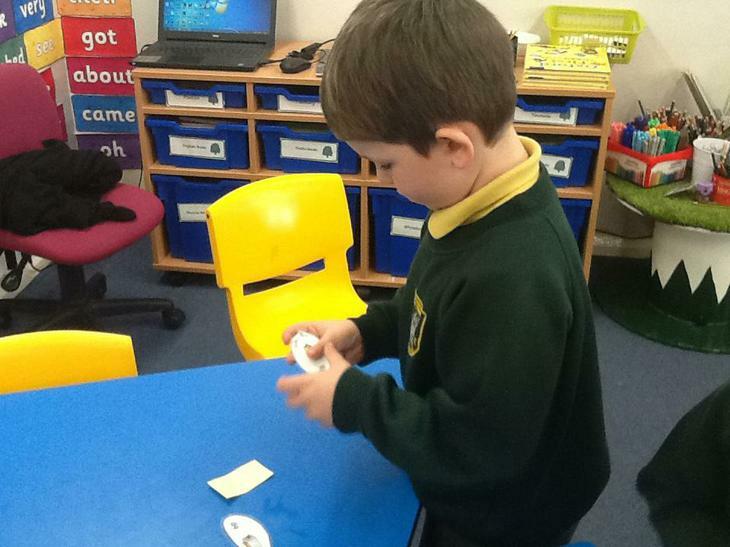 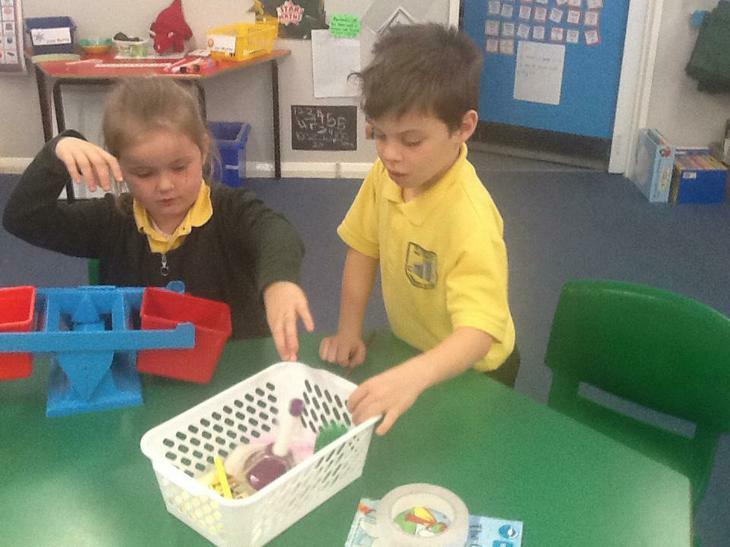 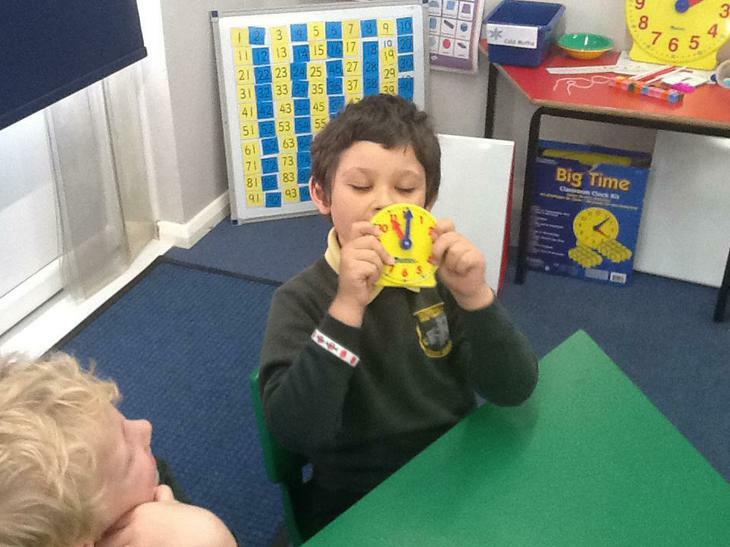 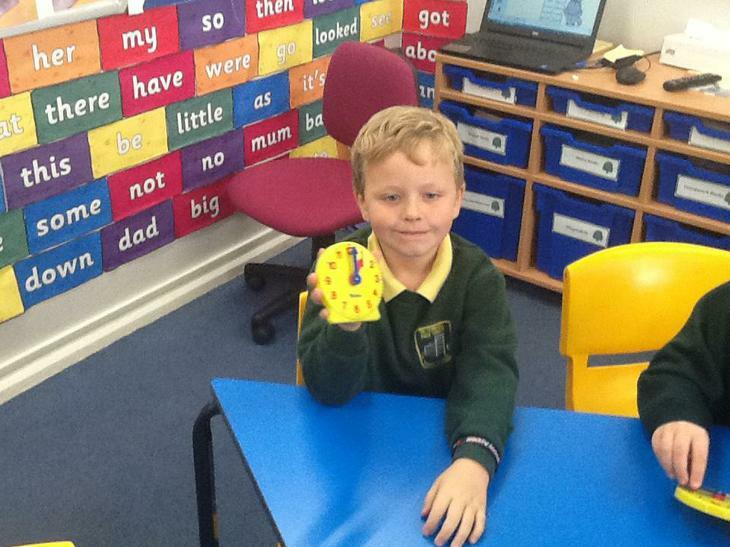 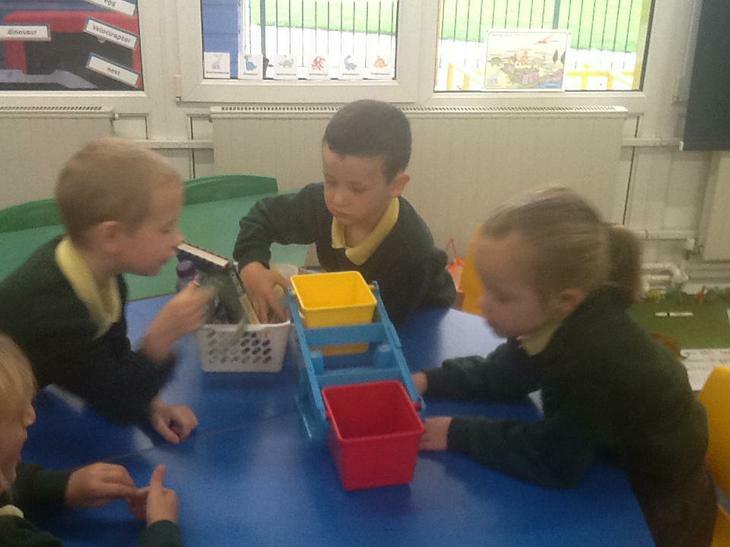 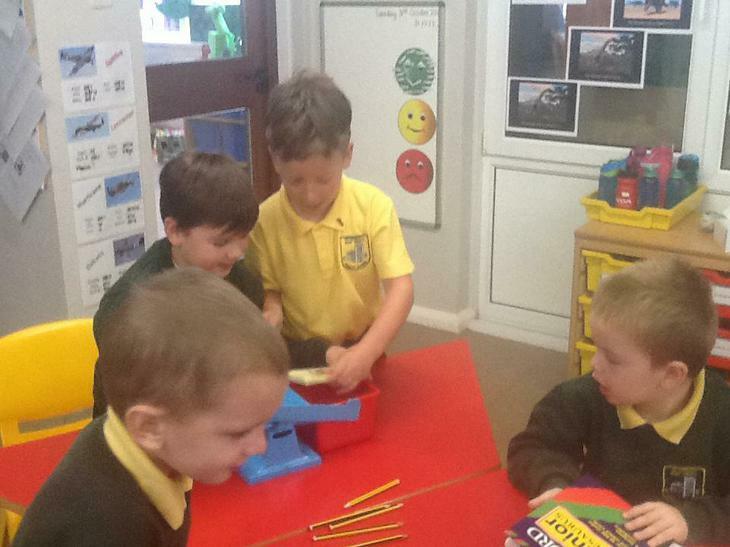 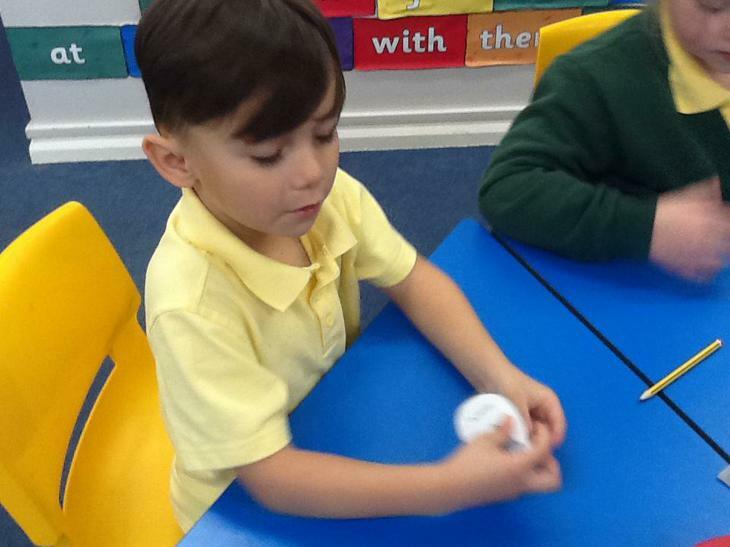 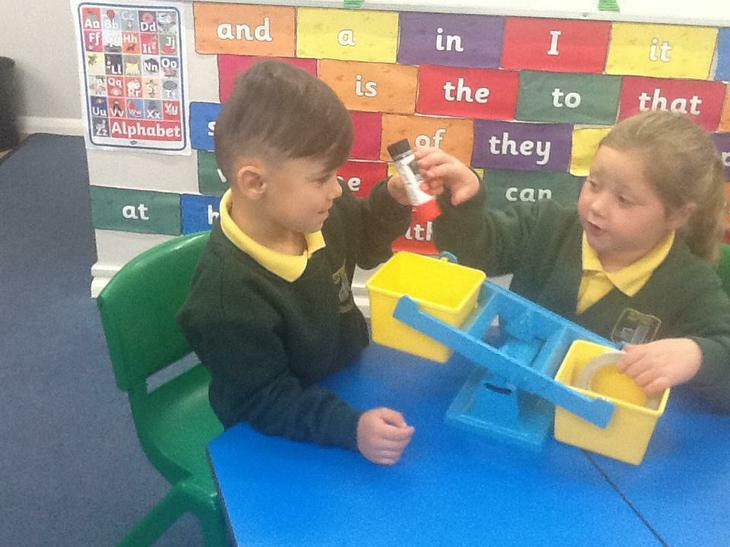 This week we have been learning more about weight. 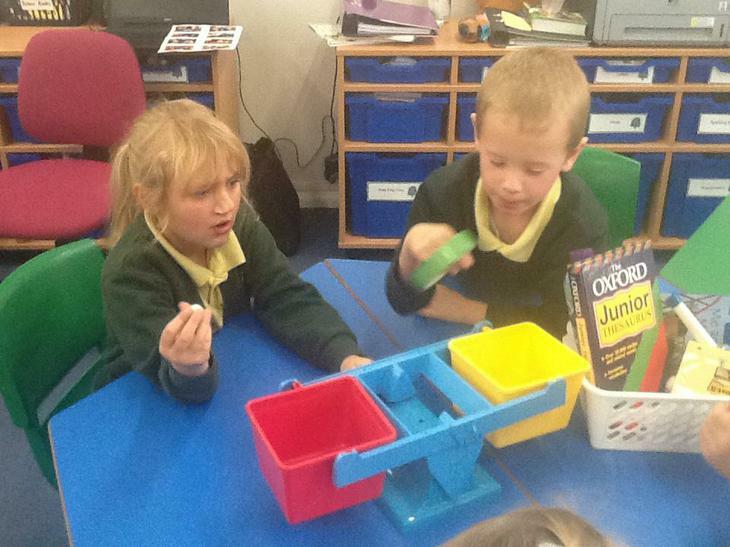 We began by comparing different objects predicting which one we thought was the heaviest. 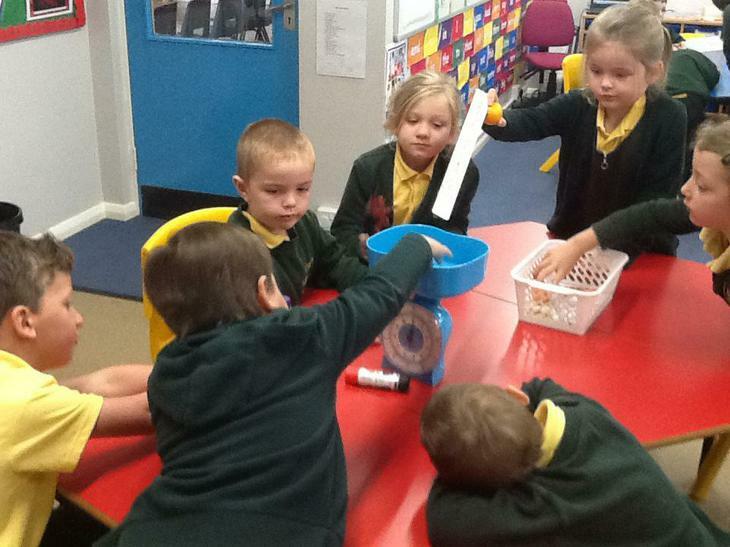 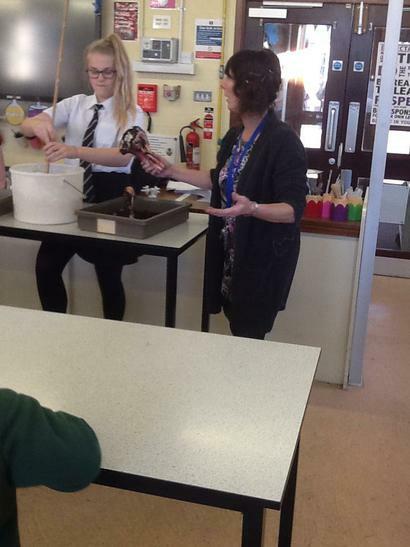 We then used bucket scales to see if we were right. 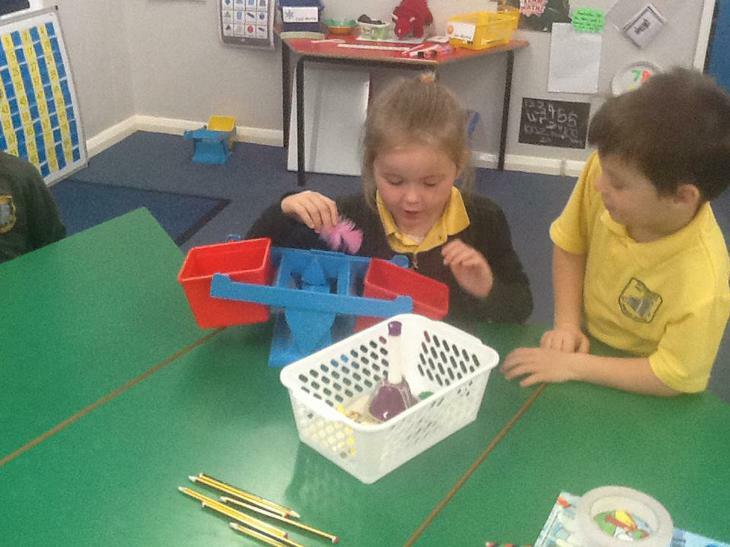 We moved on to think about grams and kilograms and tried to make one kilogram using different objects. 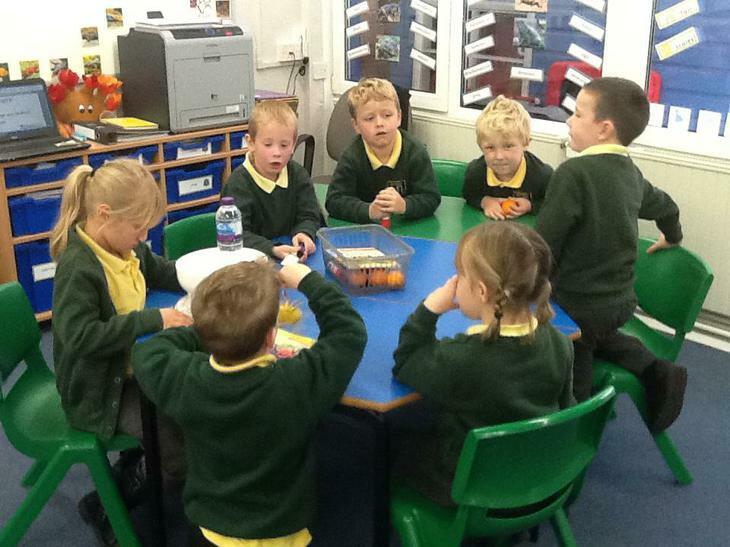 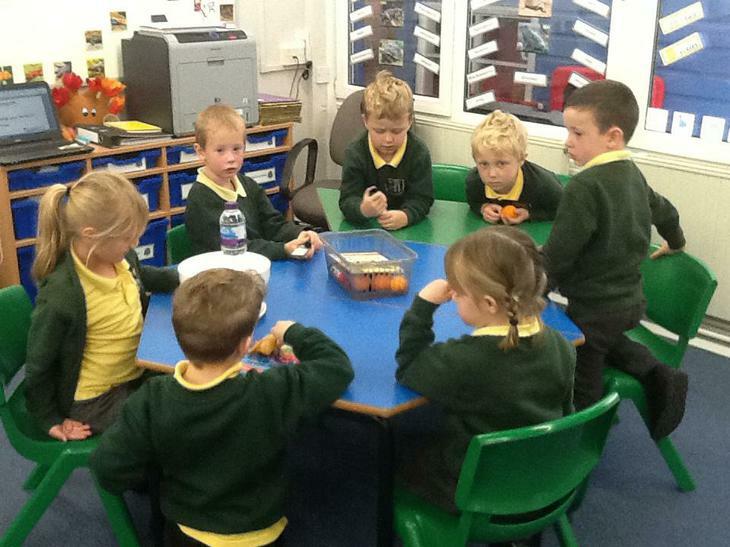 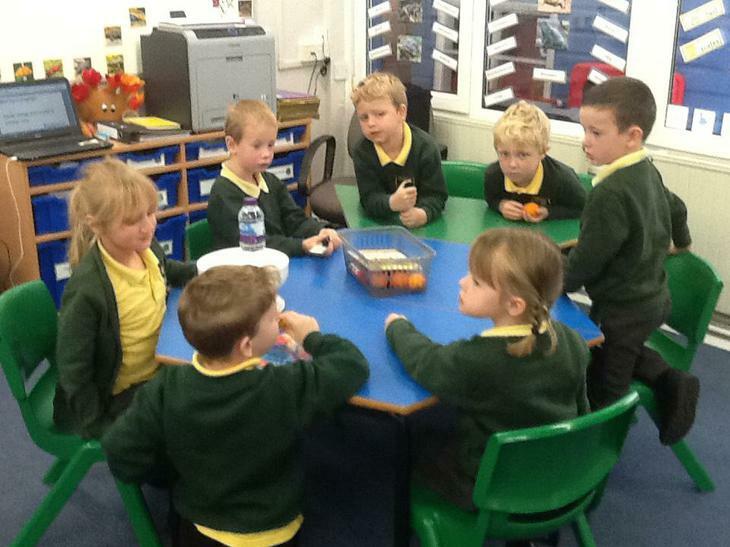 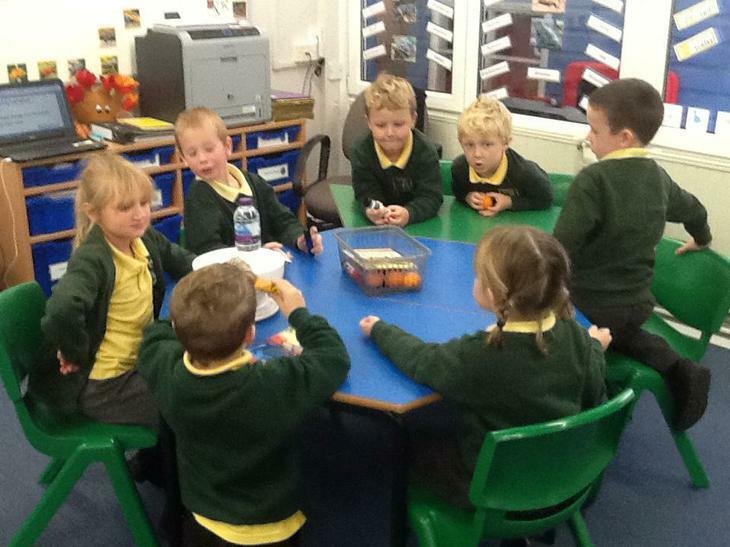 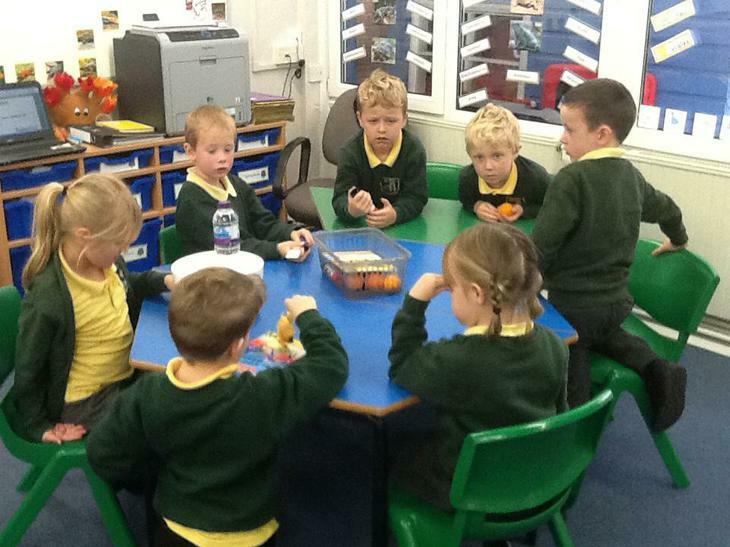 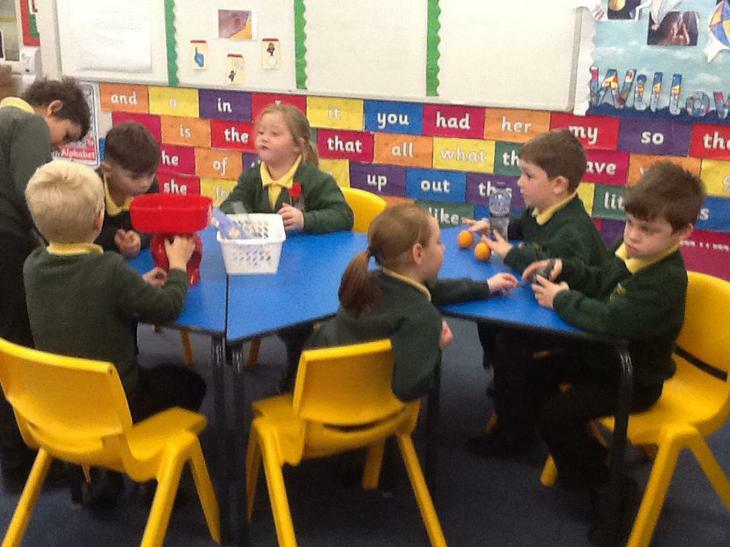 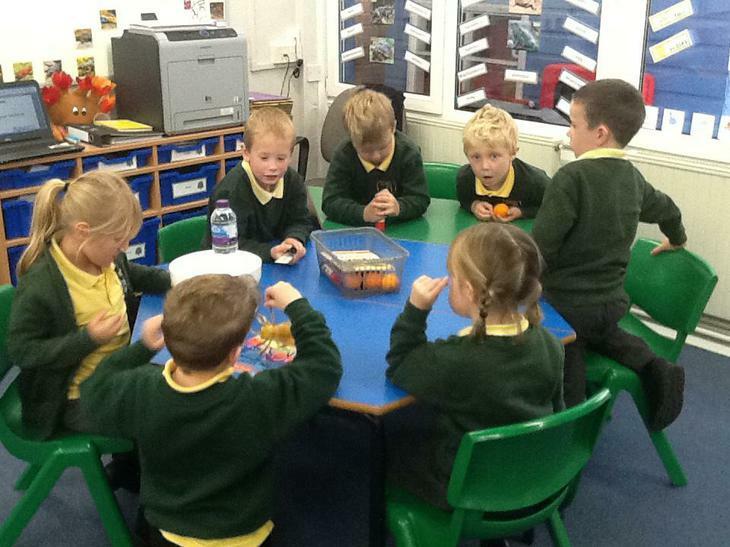 We discovered 16 oranges were the same as 1kg. 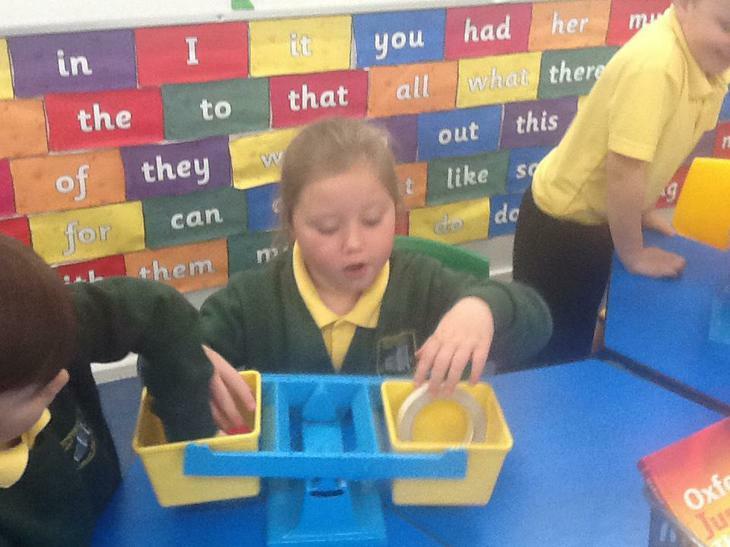 We have really enjoyed learning about weight please encourage your child at home to continue working with scales. 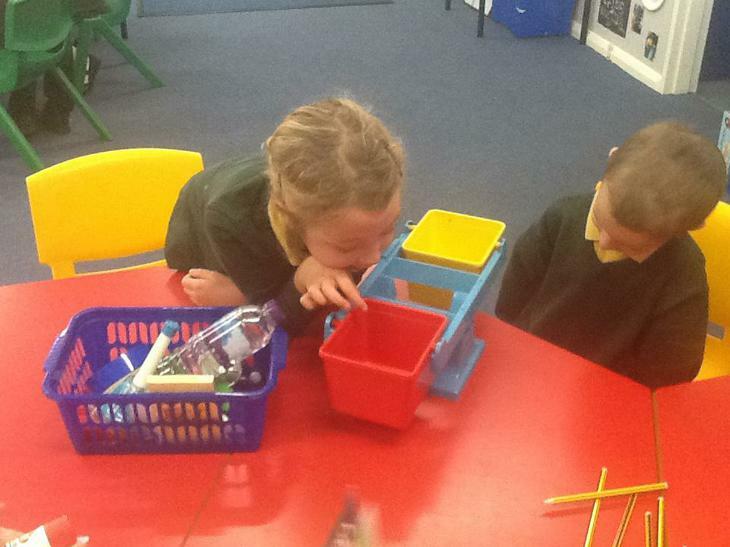 We made an exciting discovery in our classroom this week. 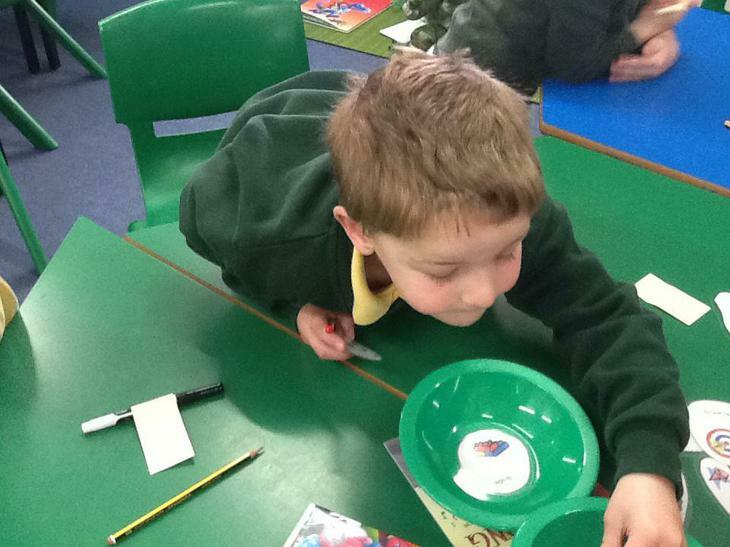 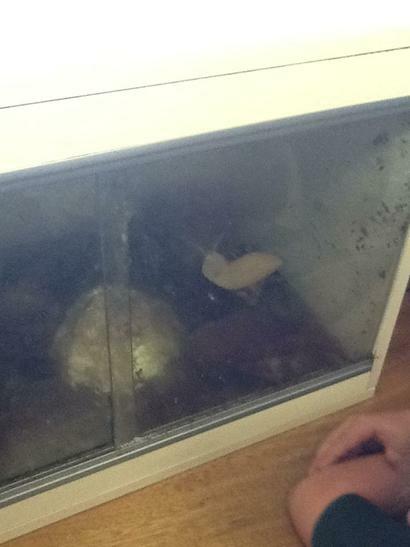 We found an egg! 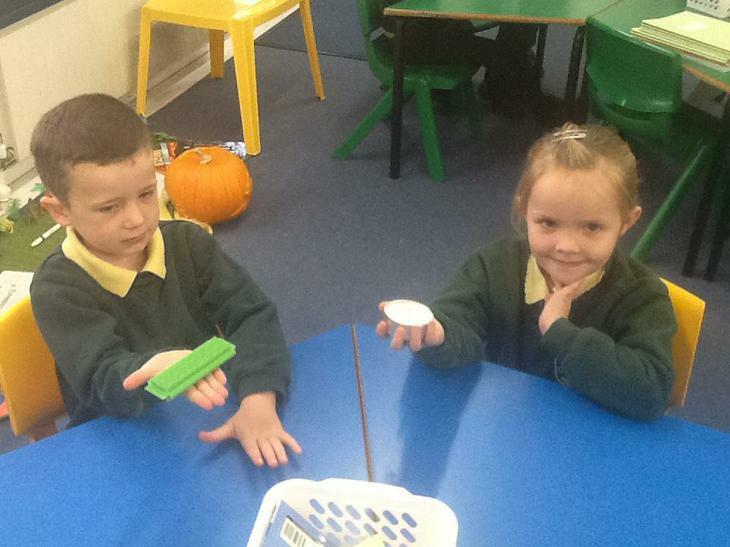 We didn't know where it came from or what it was but we decided that we wanted to find out. 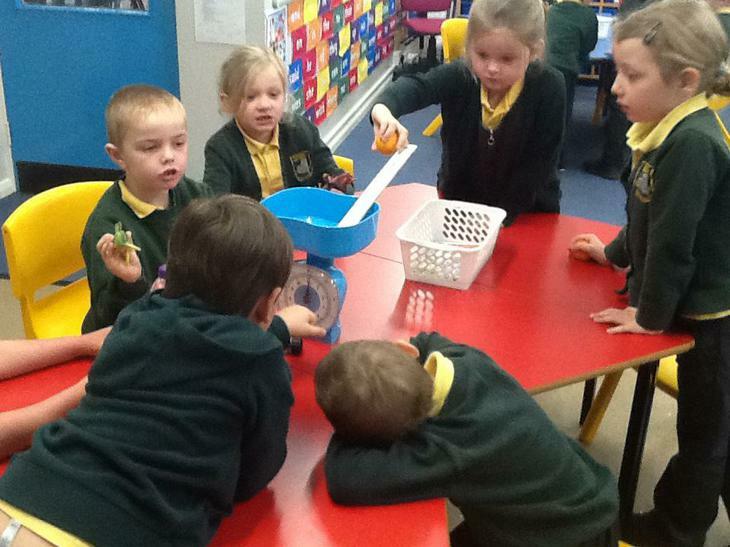 We put the egg in some water and watched it very carefully. 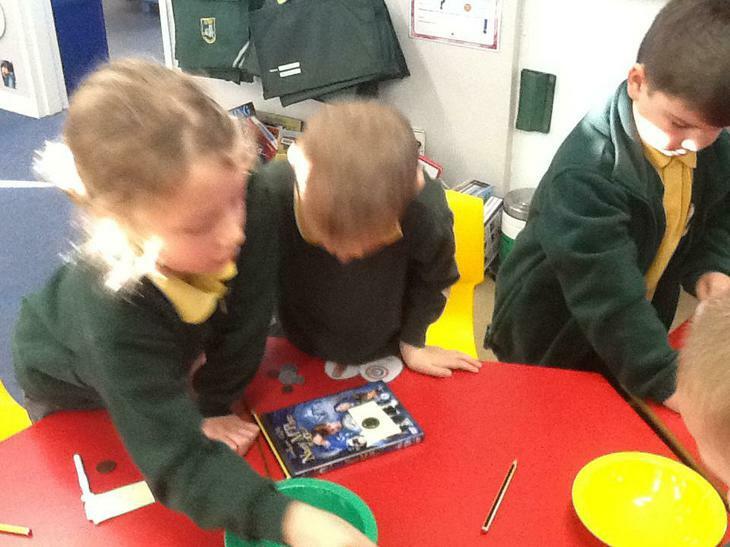 On Wednesday we noticed some cracks had appeared, on Thursday there was a hole in the egg and then on Friday a baby dinosaur had appeared. 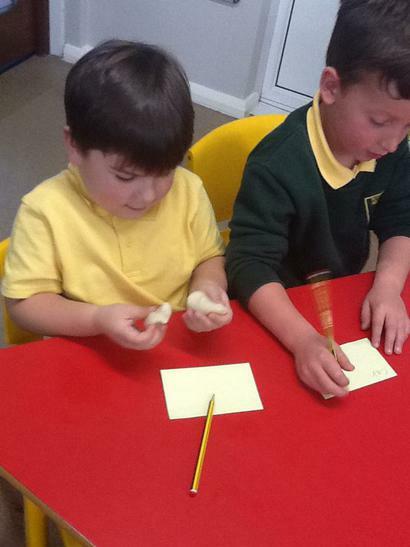 We wrote some fantastic sentences predicting what was going to happen to our egg and then writing what had actually happened. 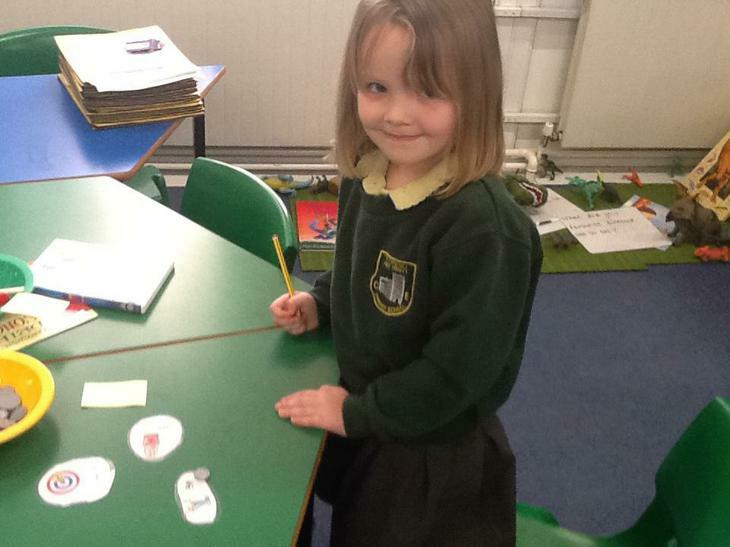 As part of our topic on animals this week we looked at lots of different animals and sorted them into different categories. 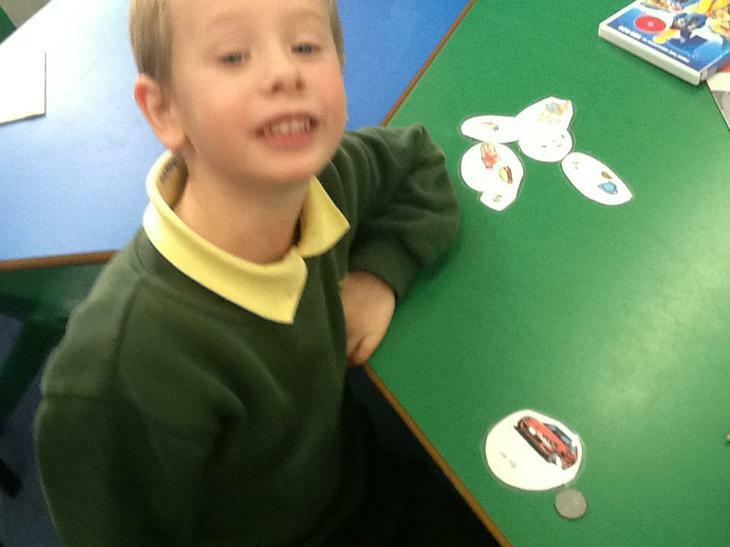 We sorted different animal pictures into wild animals, sea creatures, farm animals and min beasts. 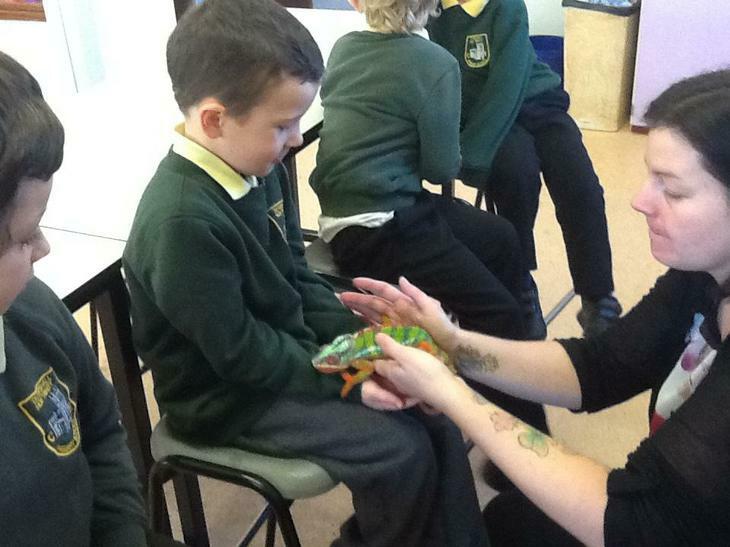 It was great fun looking at the different animals and talking about where they live and what they like to eat. 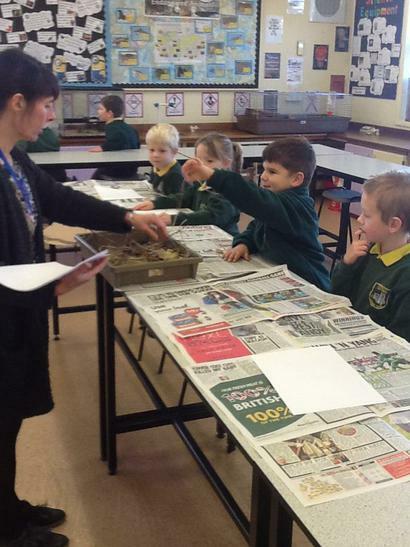 This week we found some fossils. 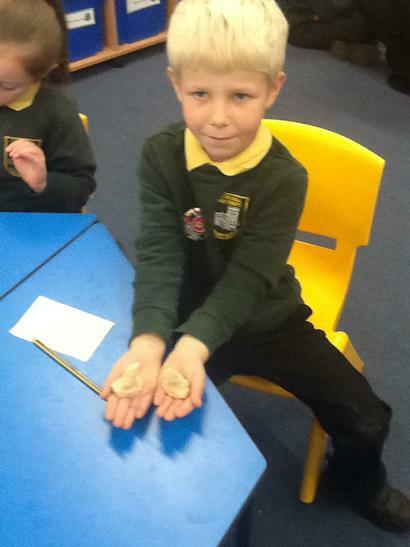 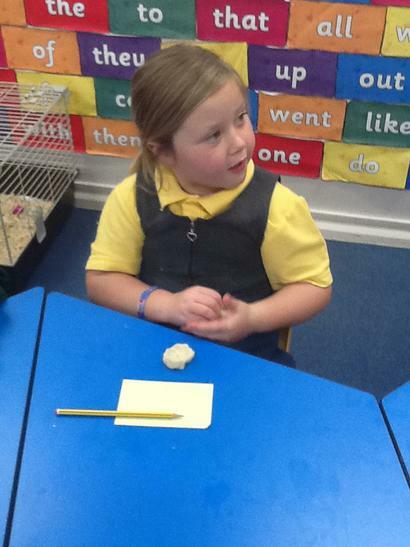 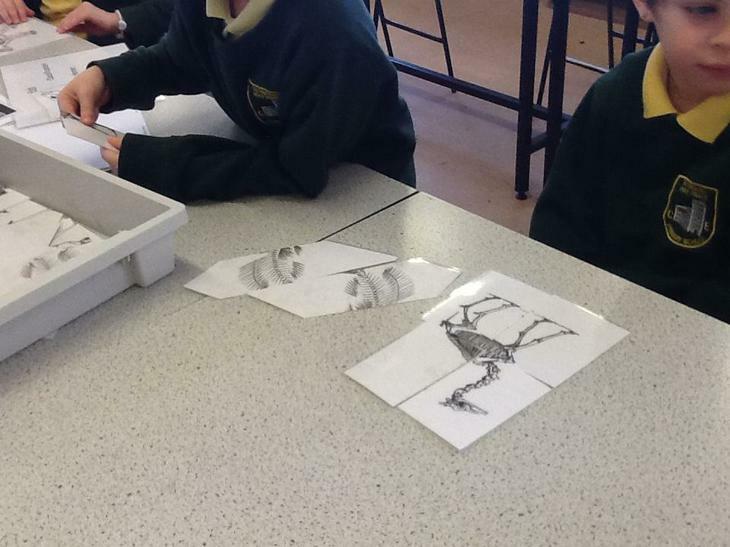 We learnt more about what fossils are and where we might find them. 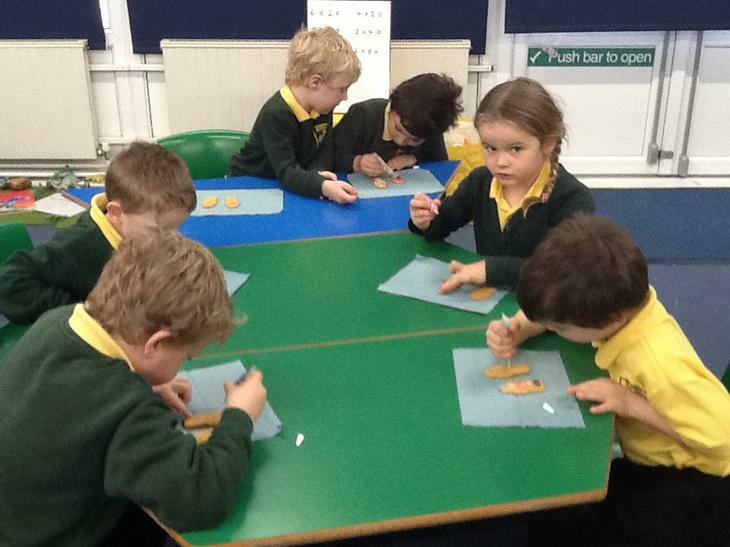 We looked carefully at all the fine detail and then created a fossil rubbing. 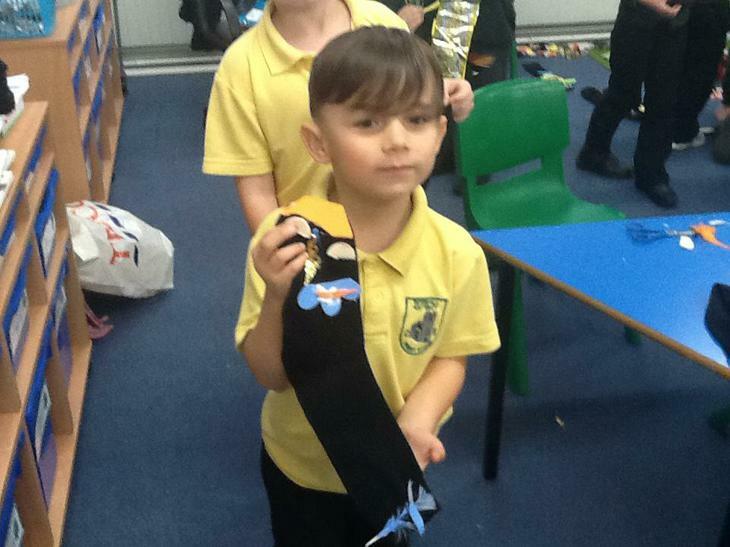 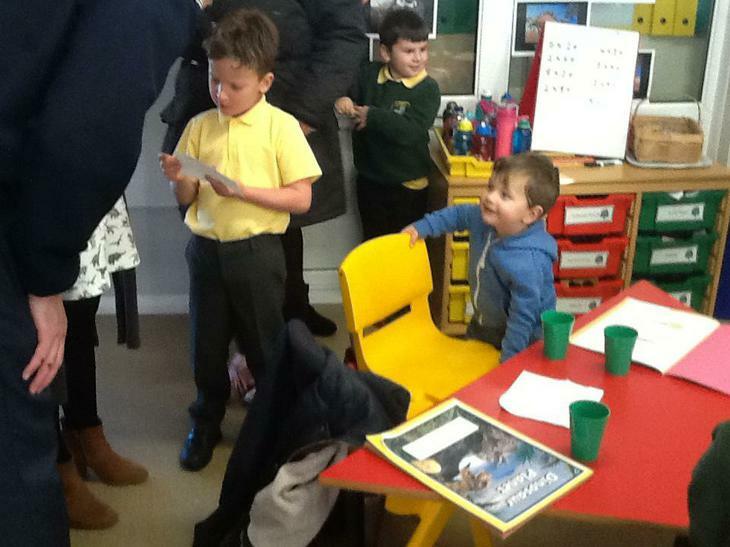 Willow Class had the best attendance in school this week and we were awarded with a very special prize! 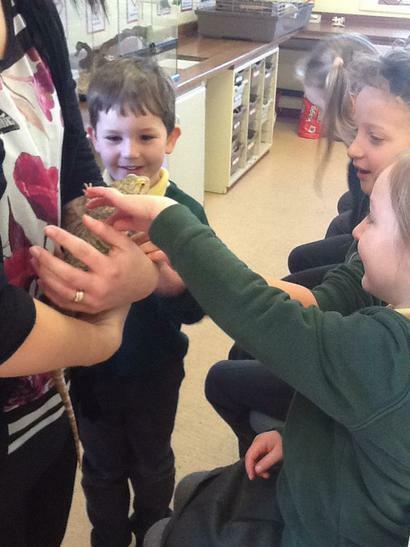 We have had great fun looking after Rosie and Nibbles today and are looking forward to playing with them next week. 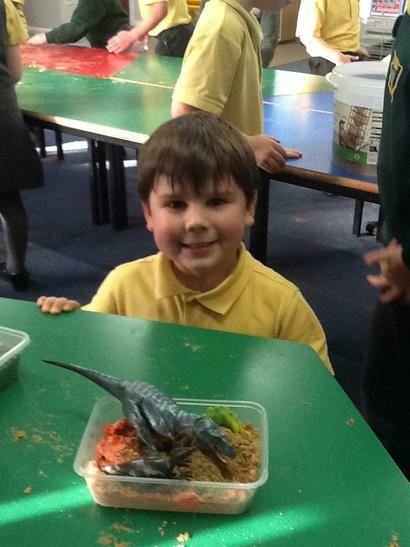 I hope you have all had a fantastic half term and are ready for our exciting new topic 'Dinosaur Planet'. 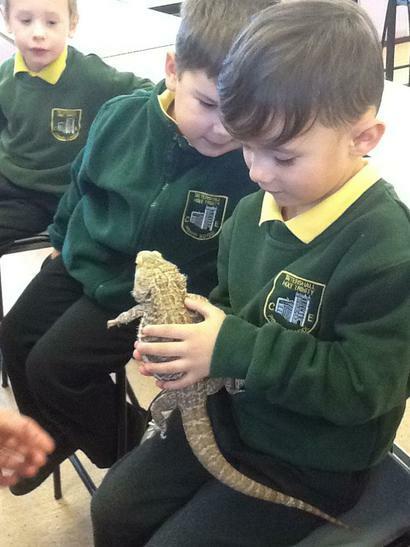 This term we are going back in time to learn more about these fantastic creatures and their habitats. 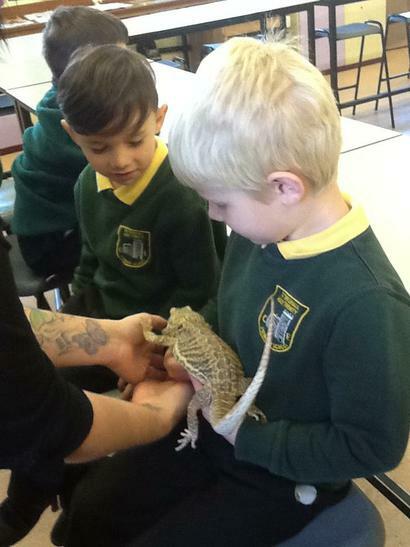 Please remember to check our webpage as it is updated weekly with all the great things we have been doing!